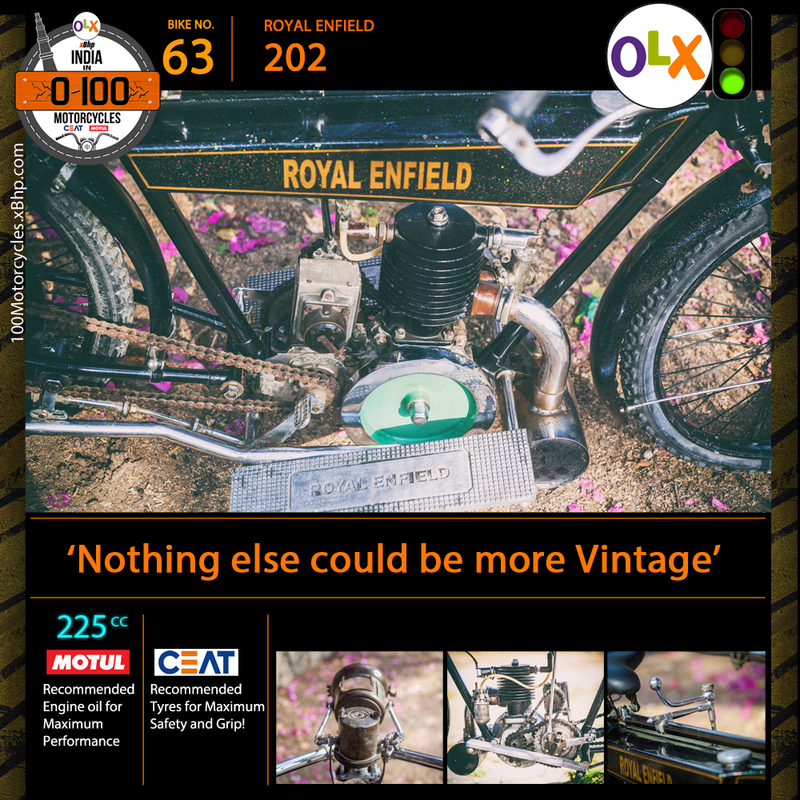 Buy a used Royal Enfield motorcycle from OLX. 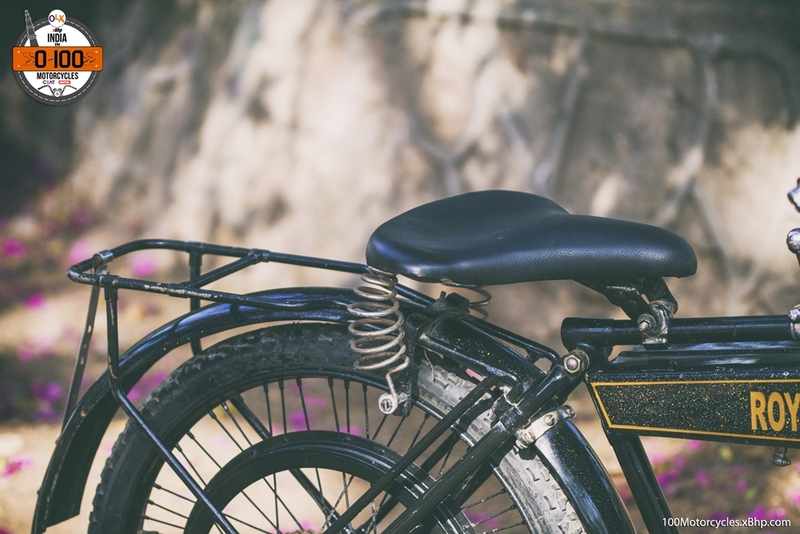 Can things get any more vintage than this? Well, of course, they can, but not for us, not today at least. 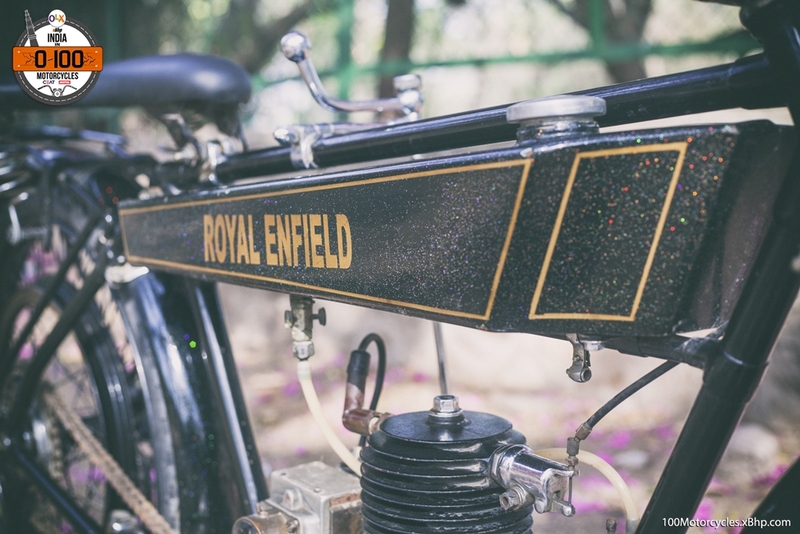 See all used Royal Enfield motorcycles listed on OLX for sale and you might find an interesting deal that fits your budget. 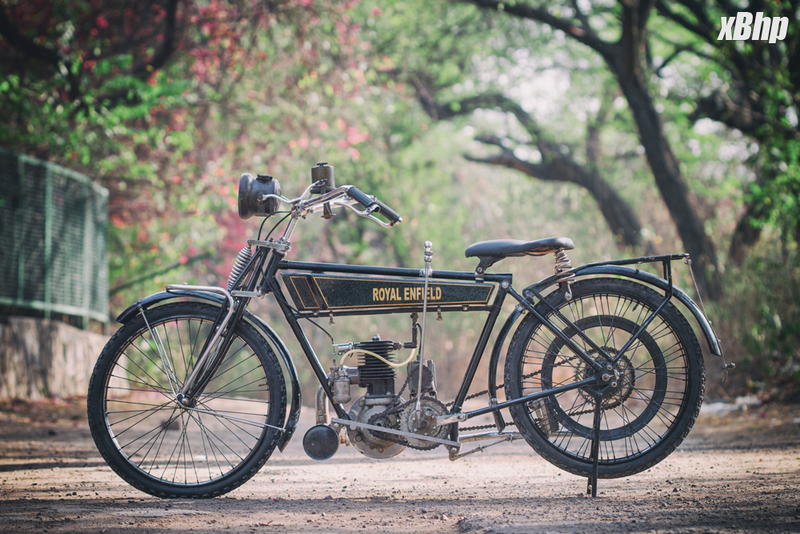 While we did cover an old Indian motorcycle as well from around the same time, but given the way this particular Royal Enfield from 1922 looks, we are just compelled to declare it the most vintage motorcycle that we have covered in ‘India in 0 to 100 Motorcycles’. 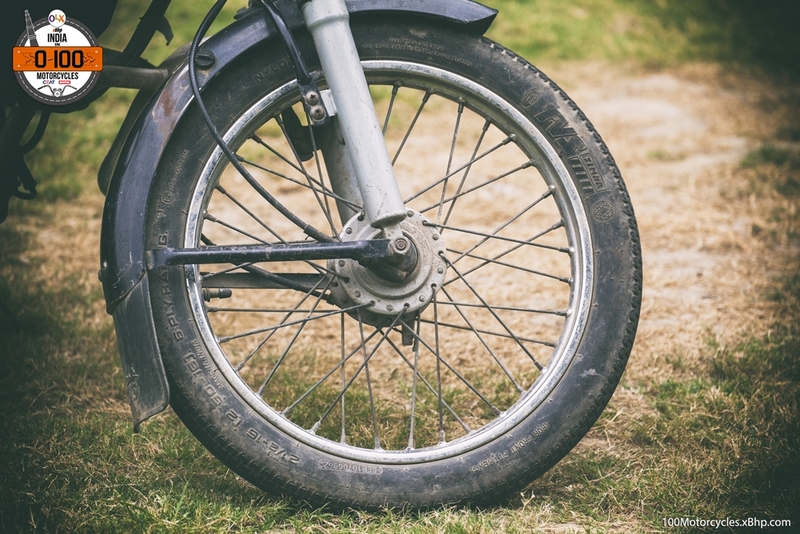 This one is practically a bicycle with an engine between its tyres. 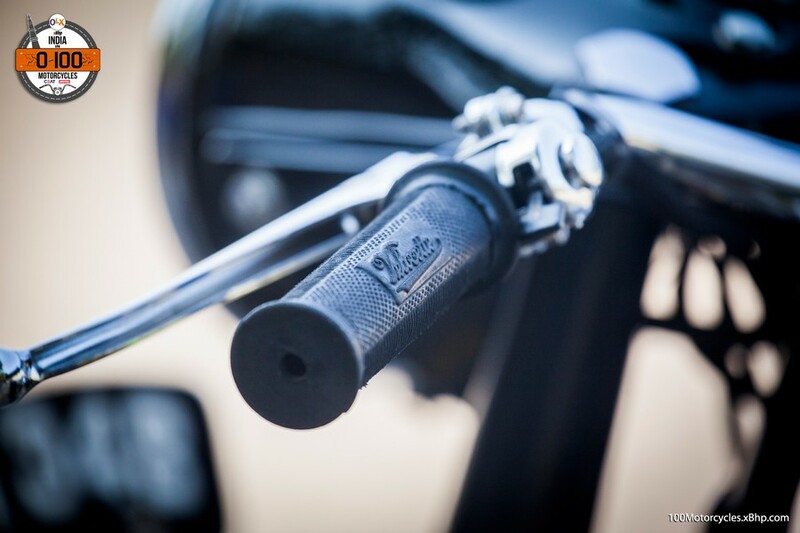 The fuel tank is housed between two tubes at the upper section of the frame and it’s so small and discreet that it looks more like a design statement than anything that would hold fuel. 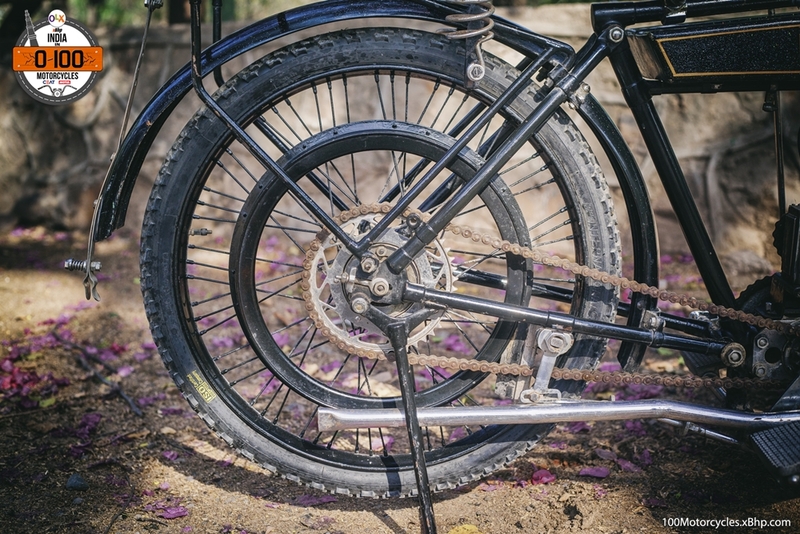 Brakes at both ends look and operate in exactly the same way as in a conventional bicycle (they rub against the rim when applied). 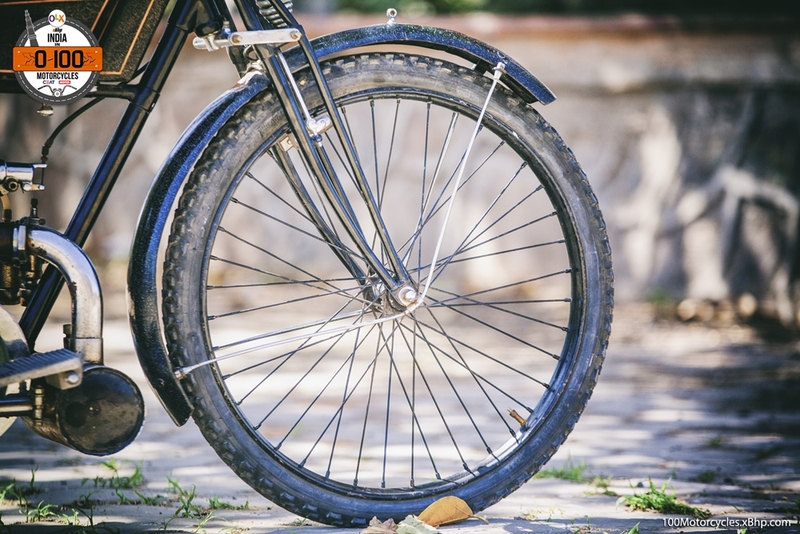 Wheels too are as thin. 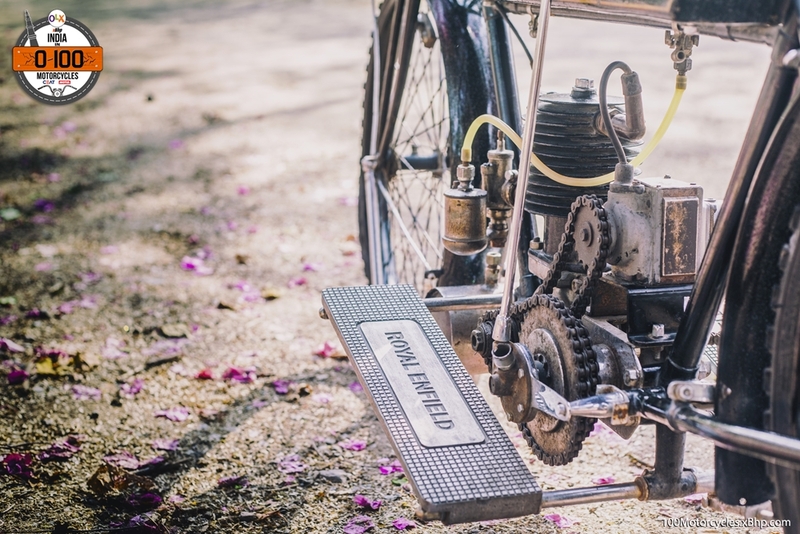 It is literally a motorized bicycle. 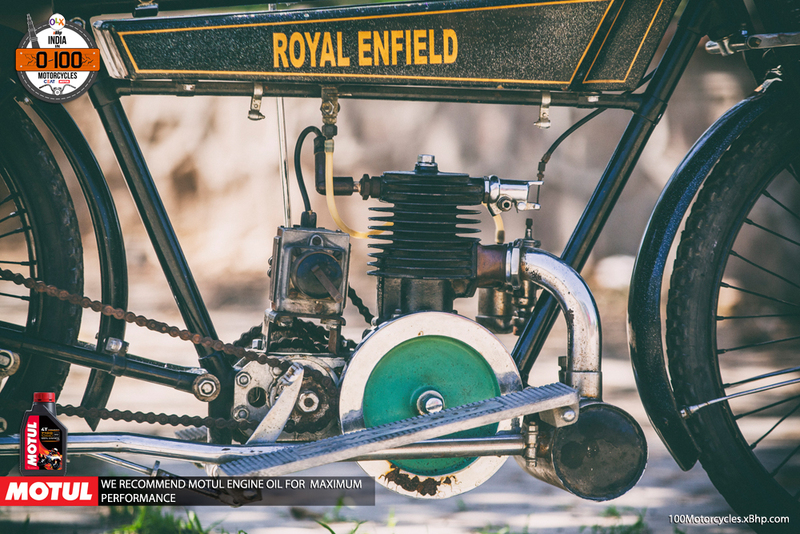 The engine has tiny dimensions as well, but wait till you hear the cubic capacity – it is a 2-stroke single cylinder motor displacing 225cc. 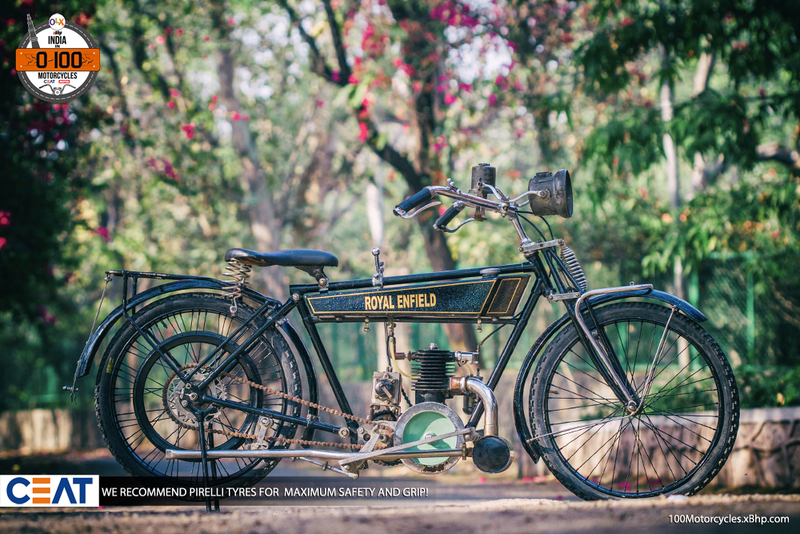 One would imagine the kind of performance and handling capabilities of such an engine, that too a 2-stroke, inside the chassis of a bicycle! 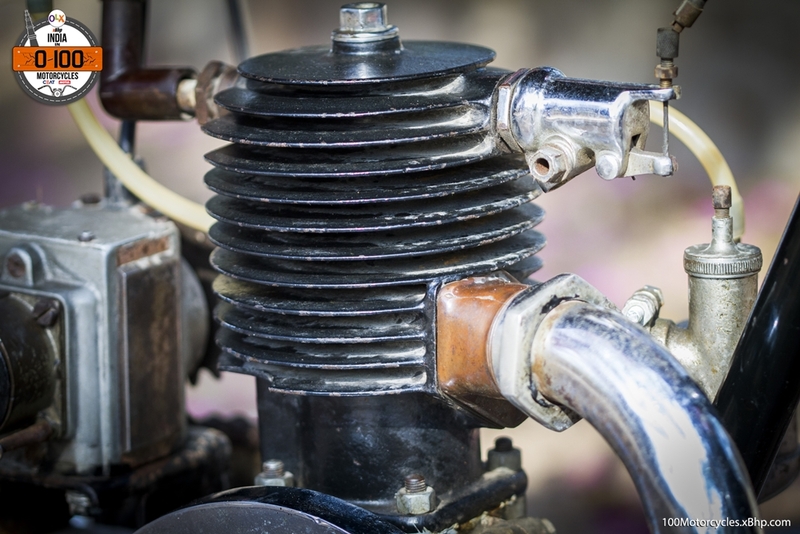 But then, it is an old 1922 engine with performance as old. 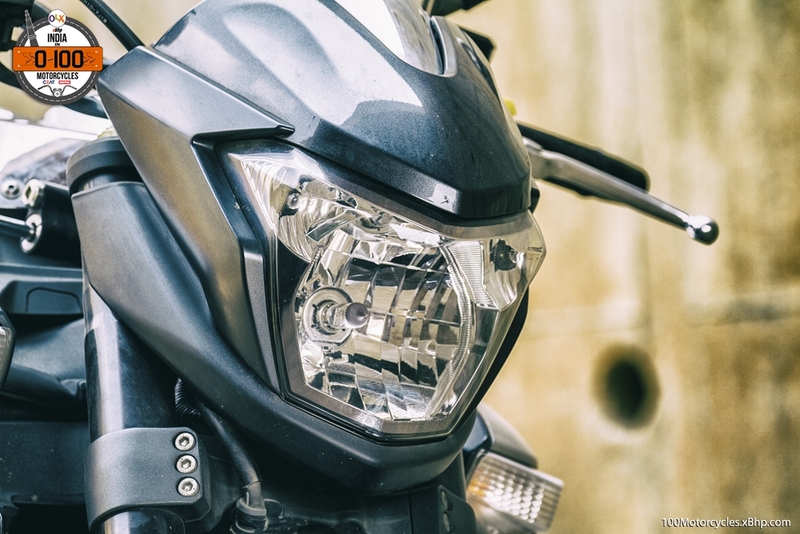 This particular model is called 202 and other interesting bits about it is the headlight which doesn’t run on a battery, instead, it is a carbide unit which runs with the help of gas generated by the reaction of a certain chemical Carbon Carbide with water. A classic indeed. 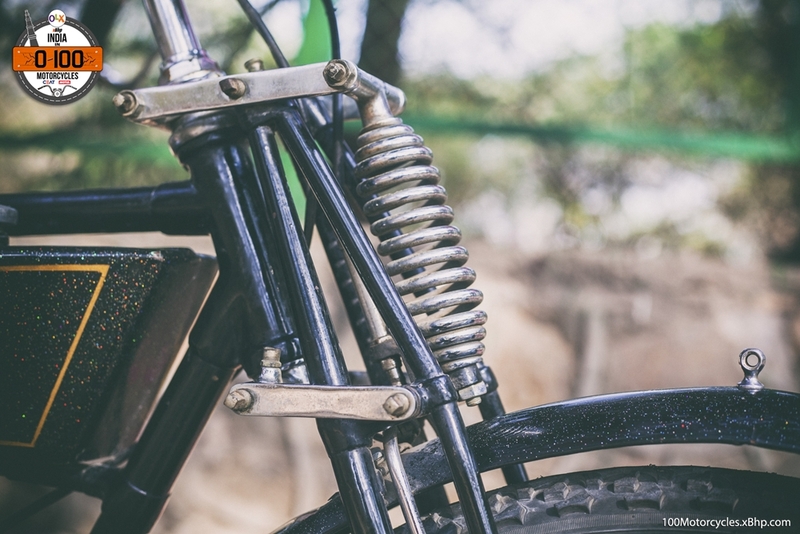 Then there’s the girder fork up front and since it’s a rigid frame with no suspension at the back, the single seat came with springs. 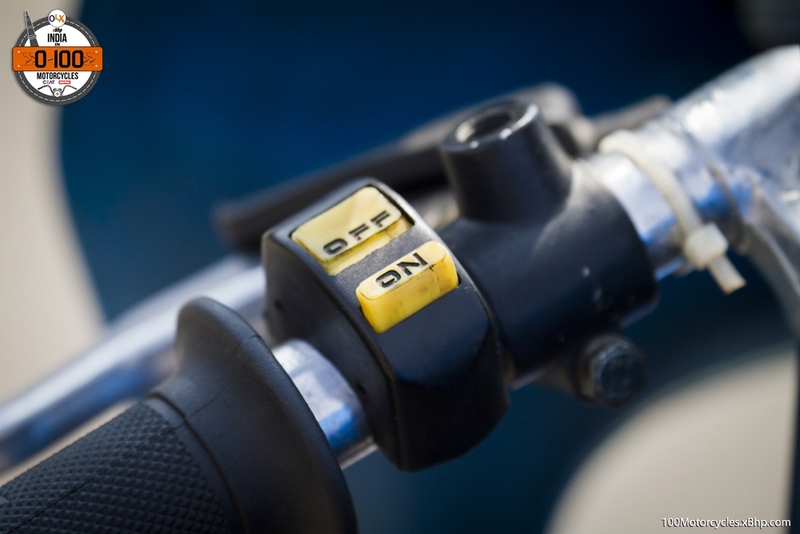 Lastly, it has a hand gear shifter. And we believe you would have to be exceptionally lucky with your stars aligned perfectly to find something like this on OLX. But give it a try. 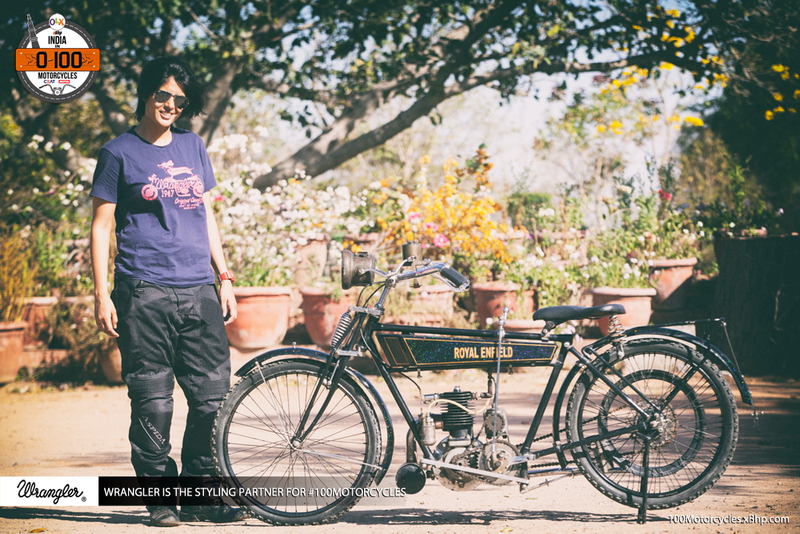 This absolutely rarest of the rare motorcycle belongs to Mr. Rippu Daman Singh who is a motorcycle-restorer himself. We would like to thank him for this truly once-in-a-lifetime opportunity. 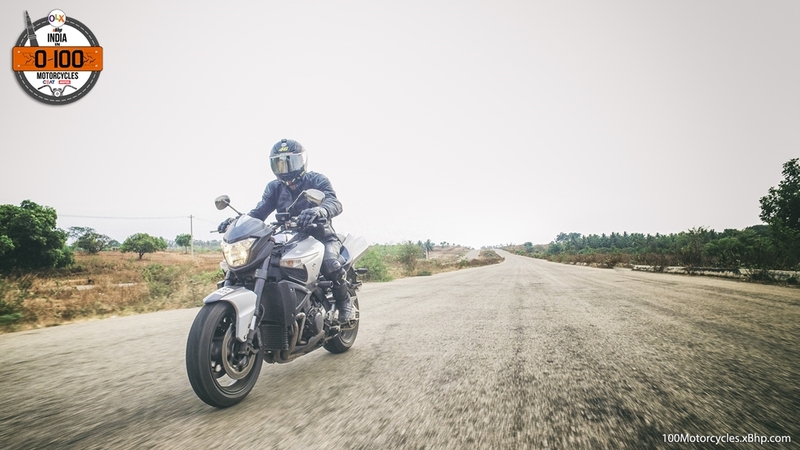 The Diavel, today, is the most popular power cruiser in the market by a long margin, and Ducati is doing everything in their power to keep it that way. 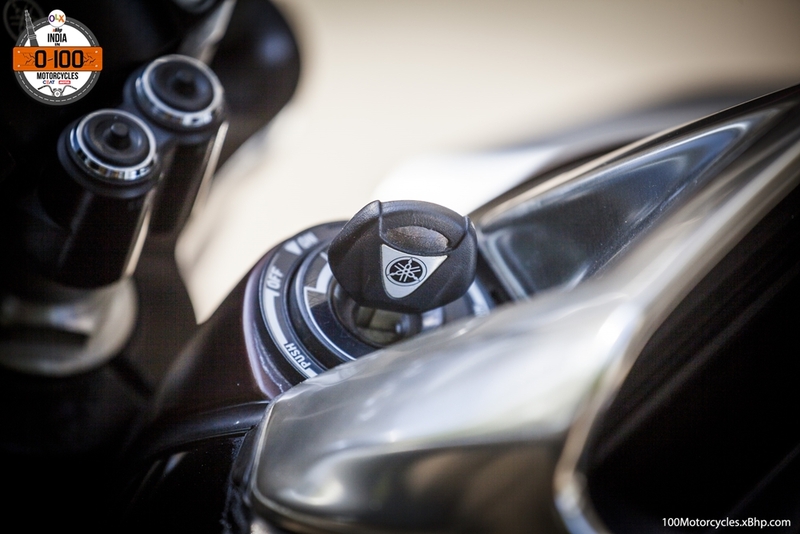 It is a reason they have recently come out with the XDiavel, a more cruiser-ish version of the standard Diavel but with the same high-performance L-twin engine. 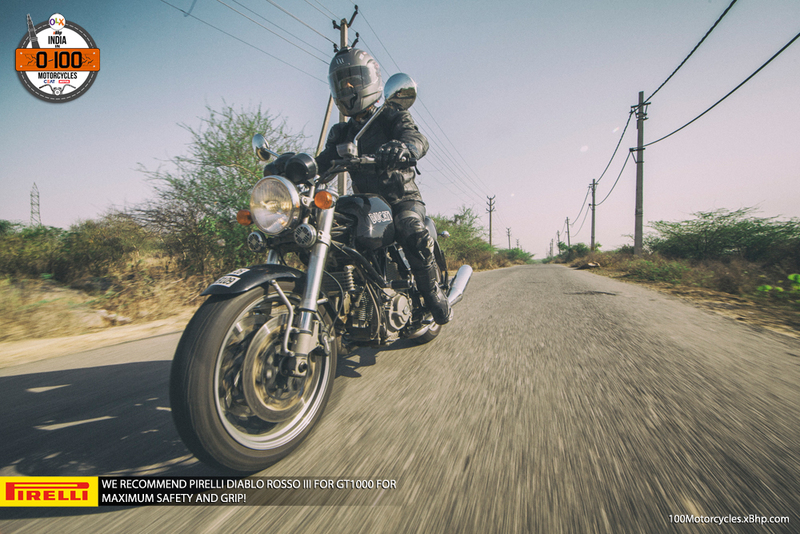 They are out there to redefine the cruiser market the Italian way. 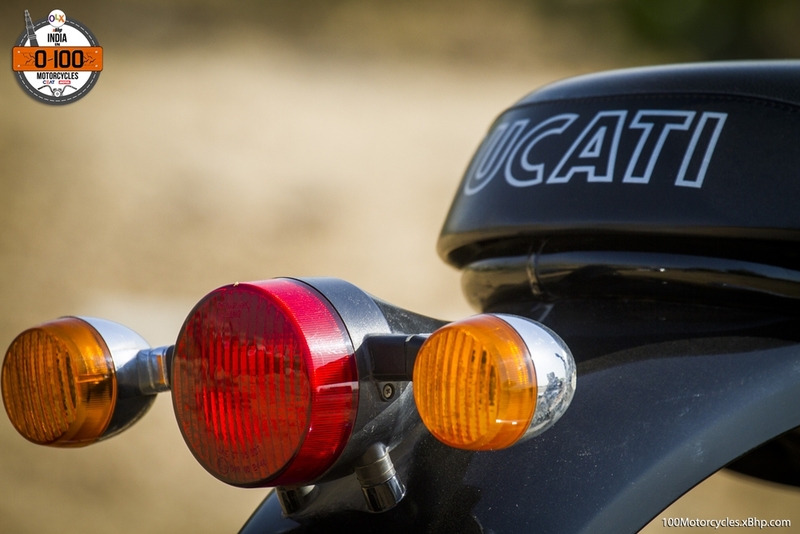 Ducati has always been about performance no matter what. 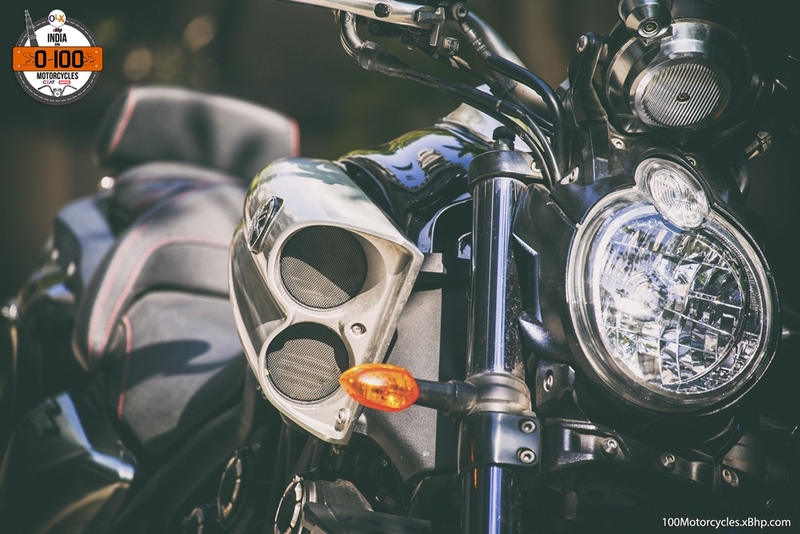 But across continents, there’s another small country which is the home of some of the most influential motorcycle manufacturers on the planet – Japan – the headquarters of Yamaha (besides Honda, Kawasaki and Suzuki)! 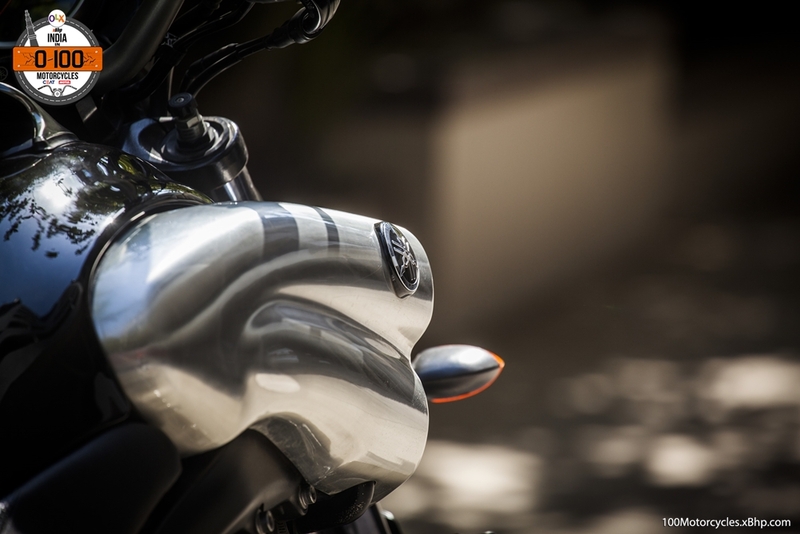 Yamaha is the kind of a Japanese company that is regarded as the maker of performance motorcycles first and foremost. Even their cruiser department has been no slouch. 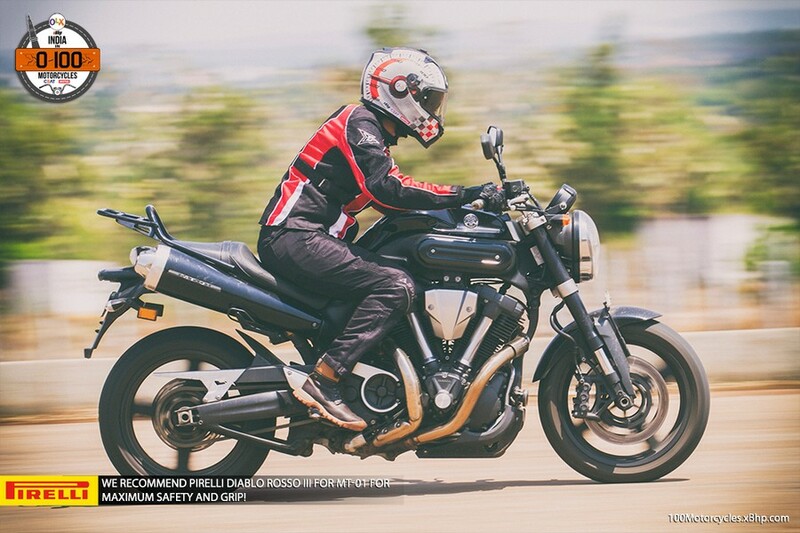 So, while the world is revelling on the radicalism of the Diavel, its success and that something like this even exists, Yamaha did exactly that a long-long time back. 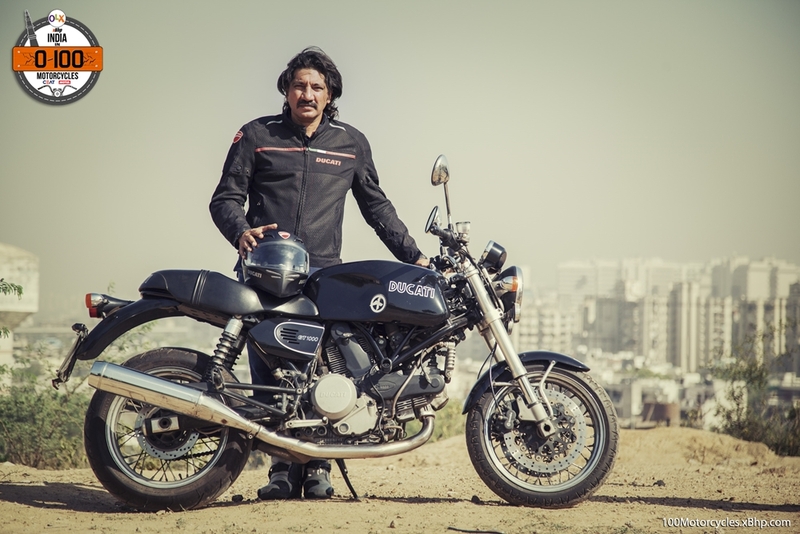 In fact, as far back as 1985 when they first launched their power cruiser V-Max. What’s special about it? 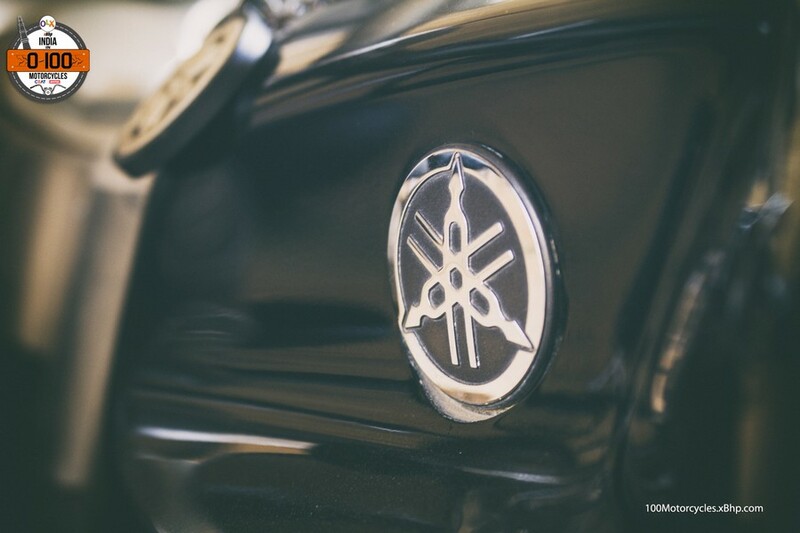 Well, at a time when the inline-4 was becoming the mainstream performance engine, Yamaha created the V-Max with a 1,197cc V4 engine. It was fast and it could turn, unlike a typical cruiser. 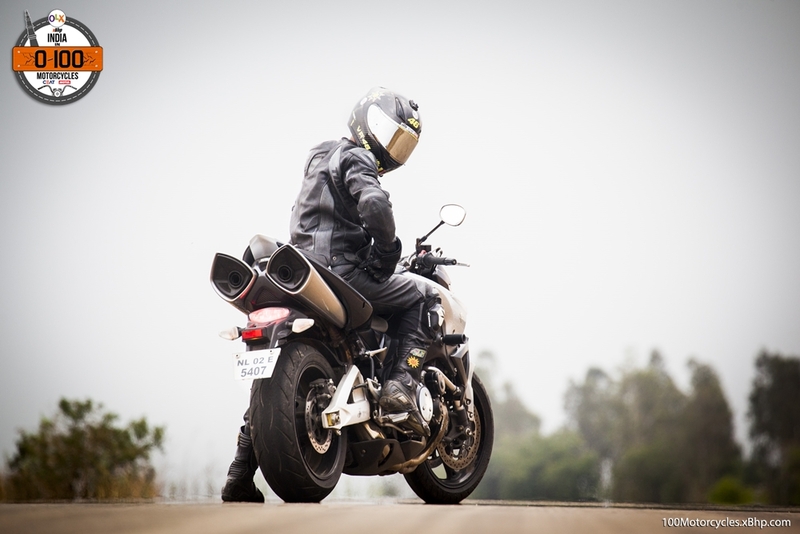 Yet, it never enjoyed the popularity or the success of conventional sportbikes and cruisers. 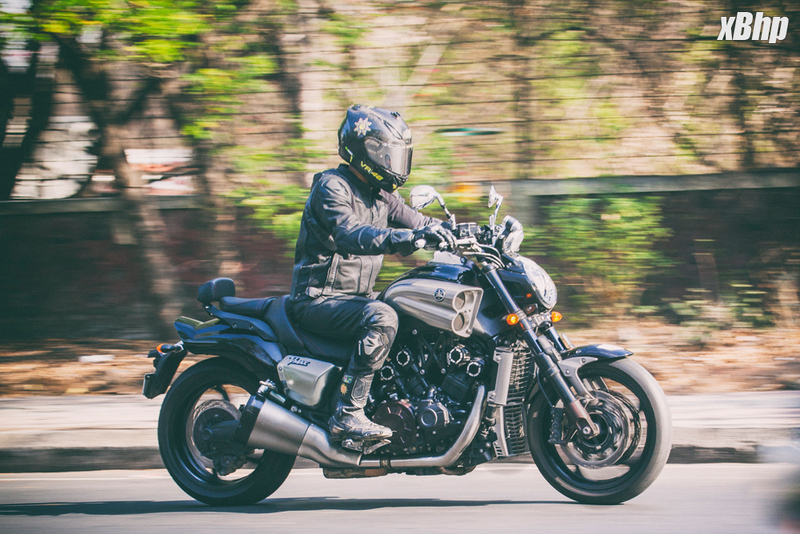 But Yamaha hung on to it and then completely rewrote the power cruiser segment from the ground up in 2008 when they introduced an all-new V-Max. 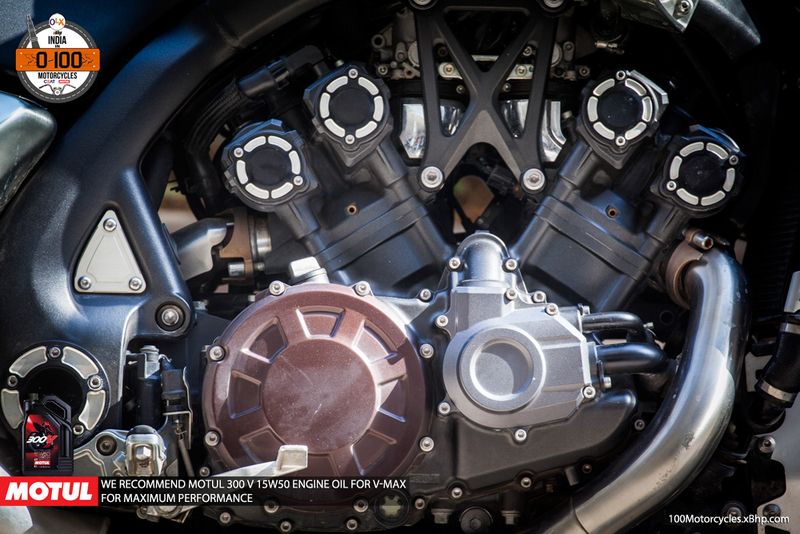 The revived V-Max is one of the first production motorcycles in the world to touch 200 horsepower mark. 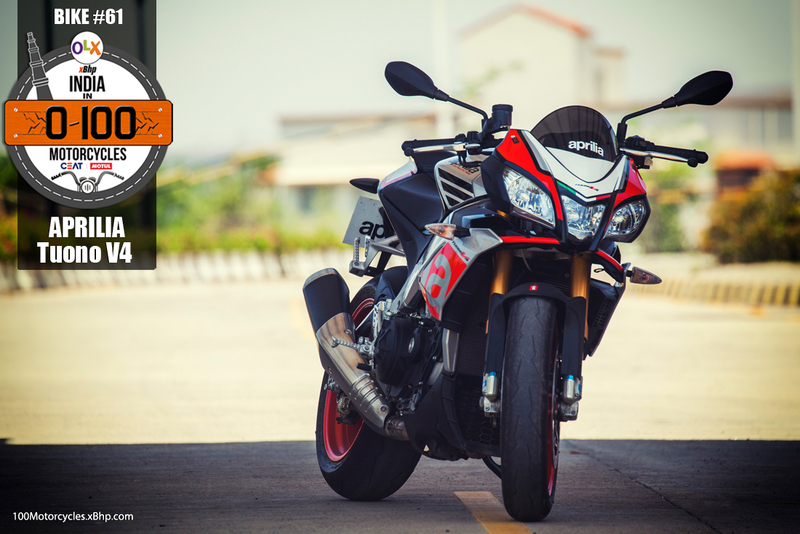 Its new 1,679cc engine produces precisely 200.1 PS of power at 9,000 RPM and a neck-breaking 166.8 NM of torque at 6,500 RPM. 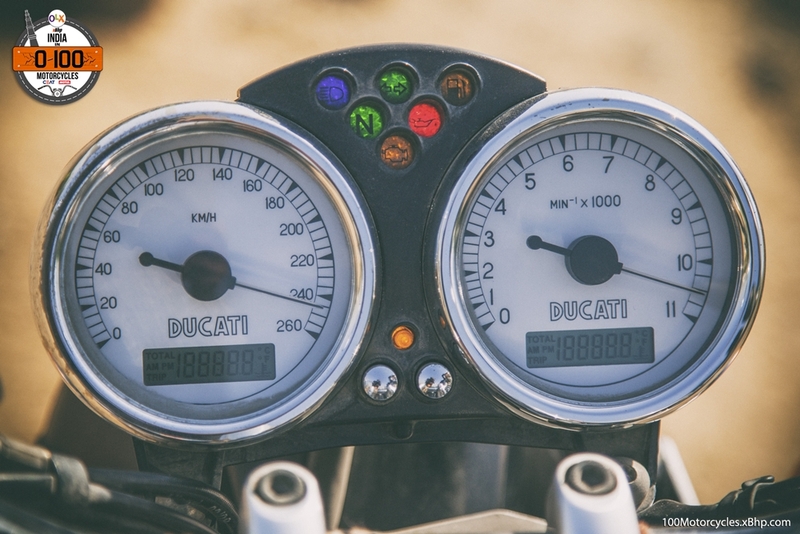 Numbers totally unrealistic for a cruiser and the ones that embarrass the Diavel at least on paper. 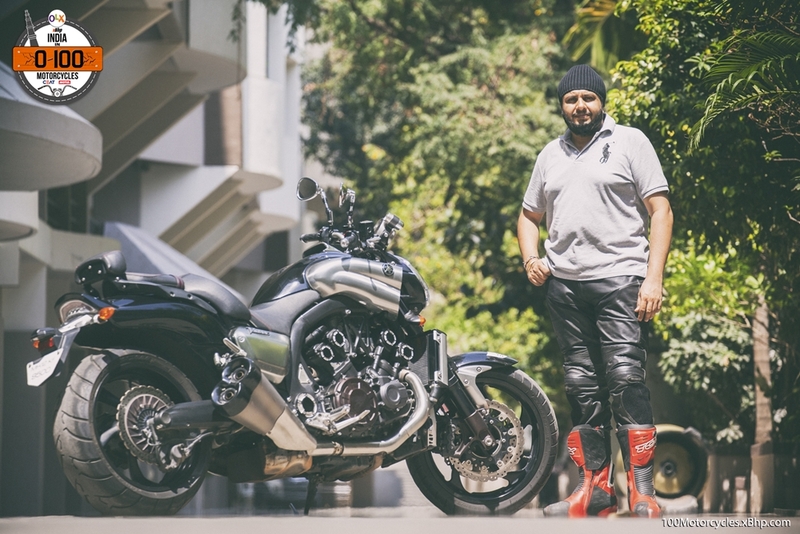 We would like to thank Mr. Ravjeet Bomrah, the owner of V-Max, for sparing his time for us and letting us spend some wonderful time with his motorcycle. 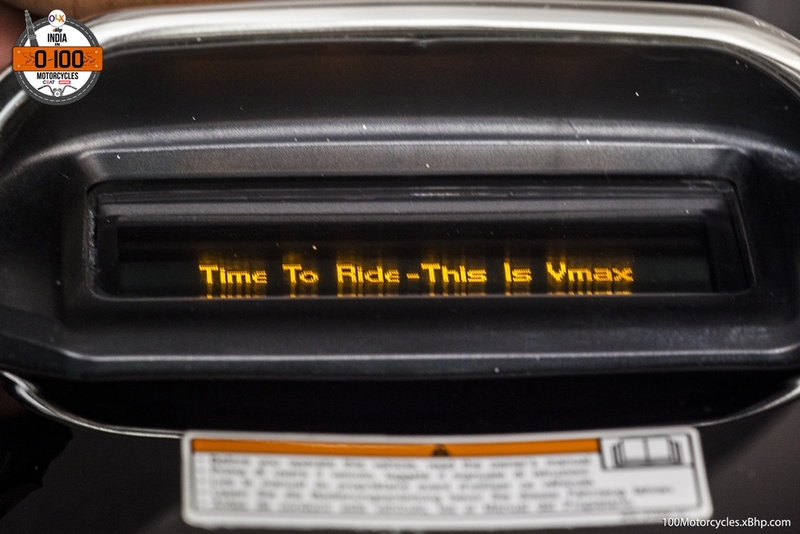 What the V-Max hasn’t got going for it is the weight. 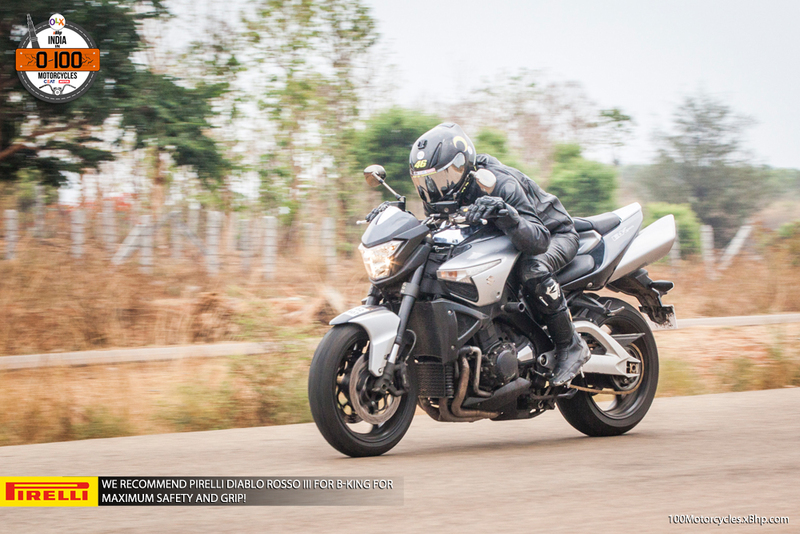 It scales at 310 kg ready-to-ride, full 71 kg heavier than the Diavel, which somewhat negates its massive power advantage. 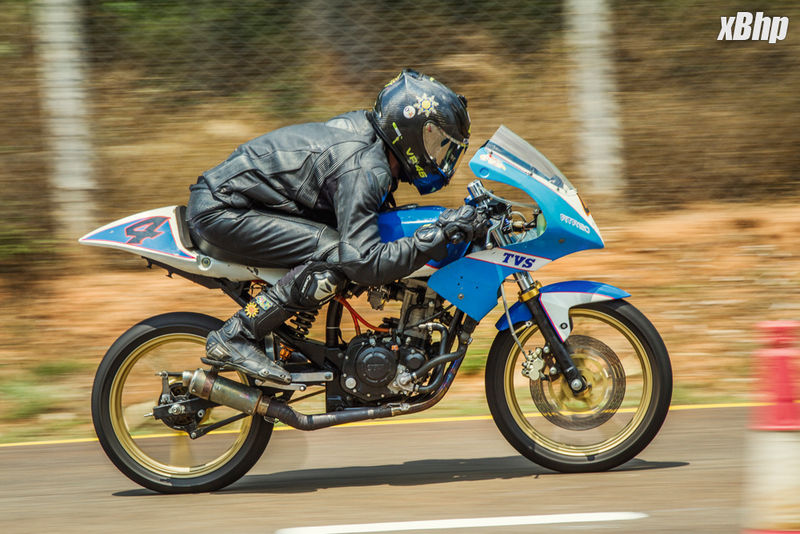 Still, this Yamaha is not something to mess with as far as the rider is concerned. 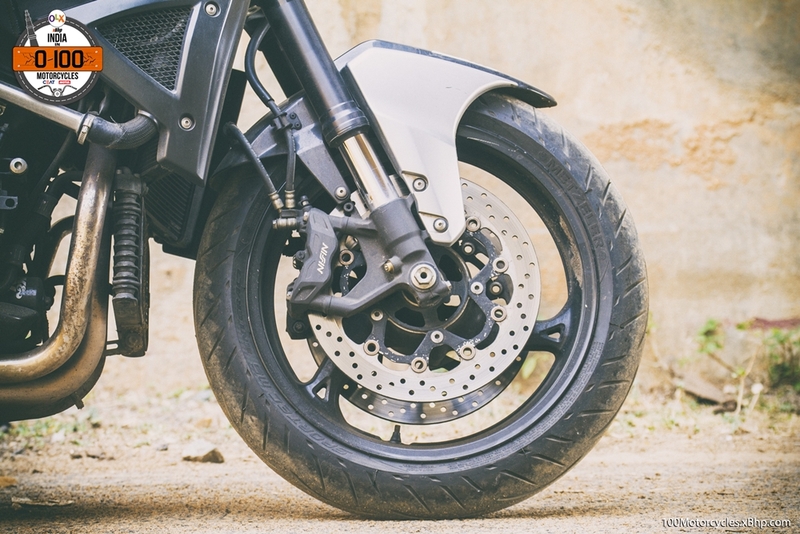 Wheel-spin is like an integral feature of this engine and at the slightest hint of some enthusiastic wrist input, the rear tyre would create a screeching sound as it searches for traction. 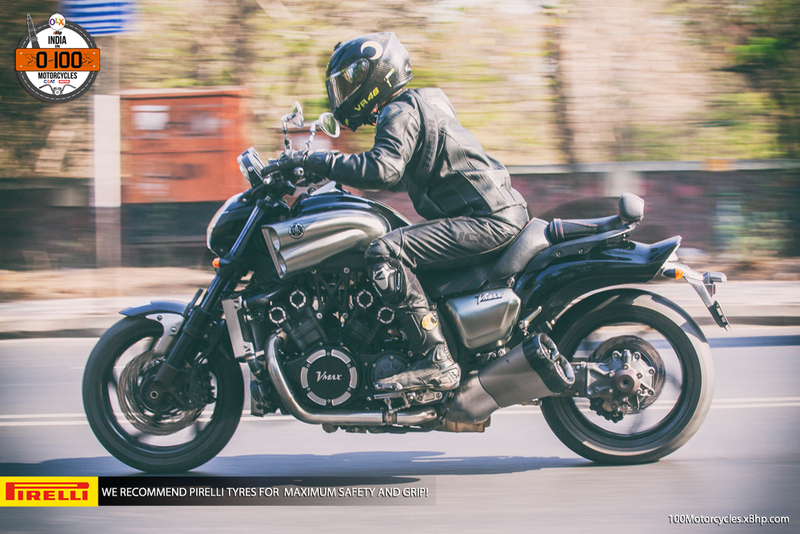 With all that power and especially the torque, the V-Max has got a Superbike-like acceleration from standstill. None can feel dull on it. 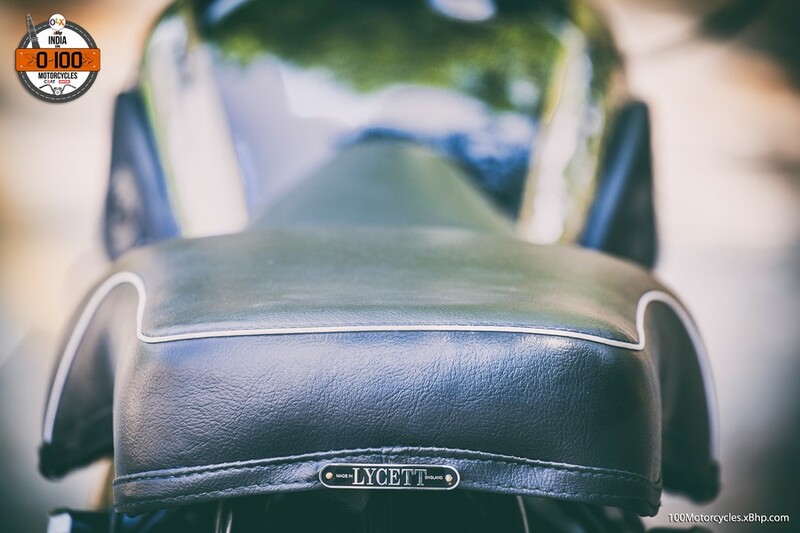 The motorcycle is ballistic to ride – you wouldn’t normally use these words to describe the “performance” of a cruiser. 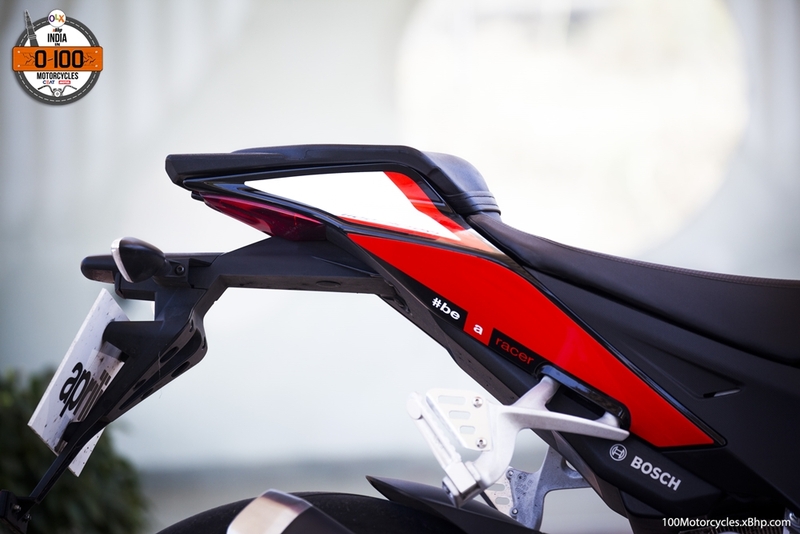 And for its weight, it goes remarkably well in corners. 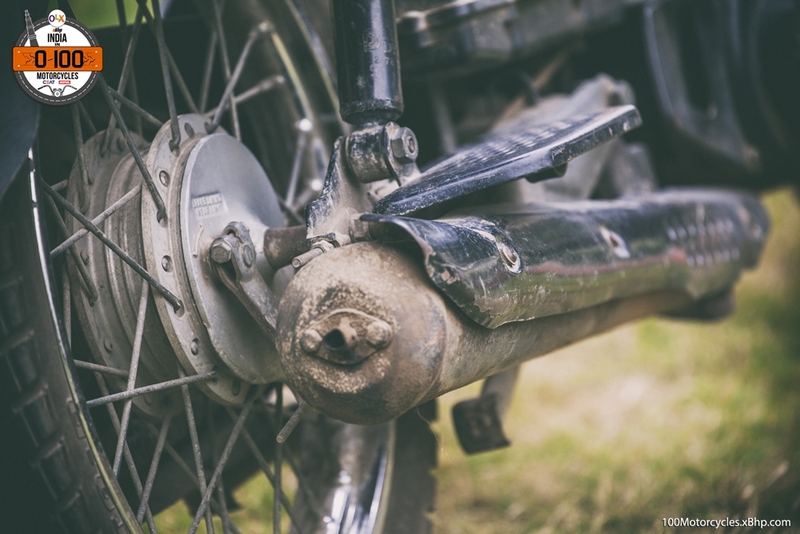 The Japanese aren’t really known to make bad-handling motorcycles. 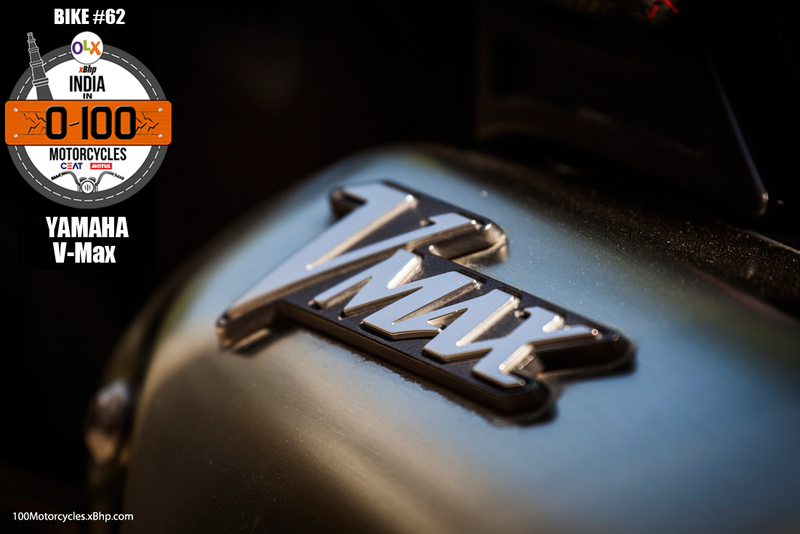 Everything about the V-Max tells about its performance oriented nature. 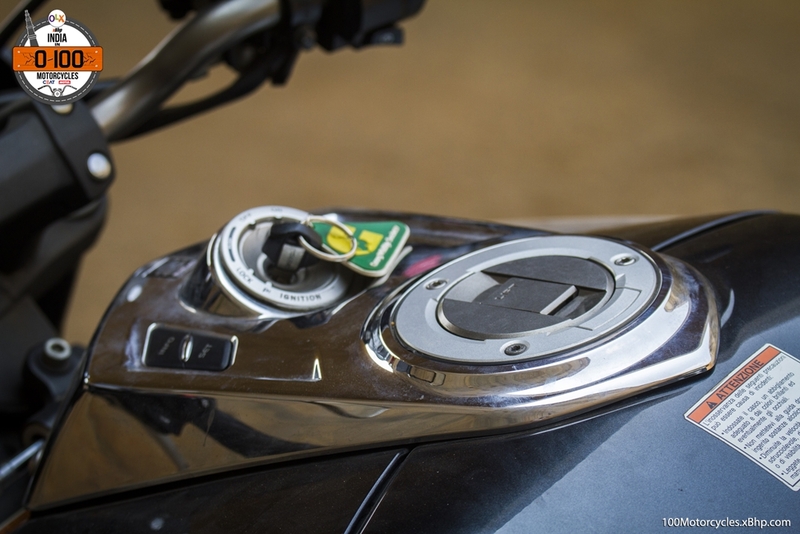 The fuel tank has two massive air-intakes on its either side that boost performance at high engine RPMs. 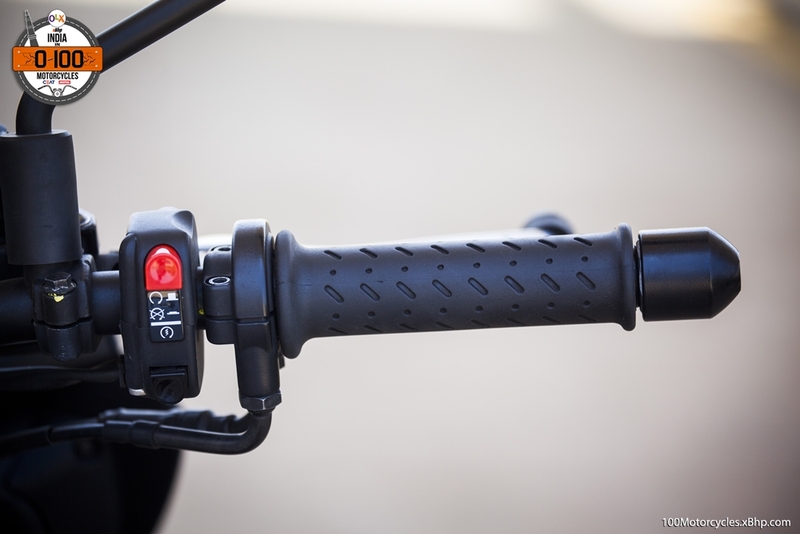 The rider foot-pegs are slightly rear set and the handlebar is relatively flat for a cruiser. 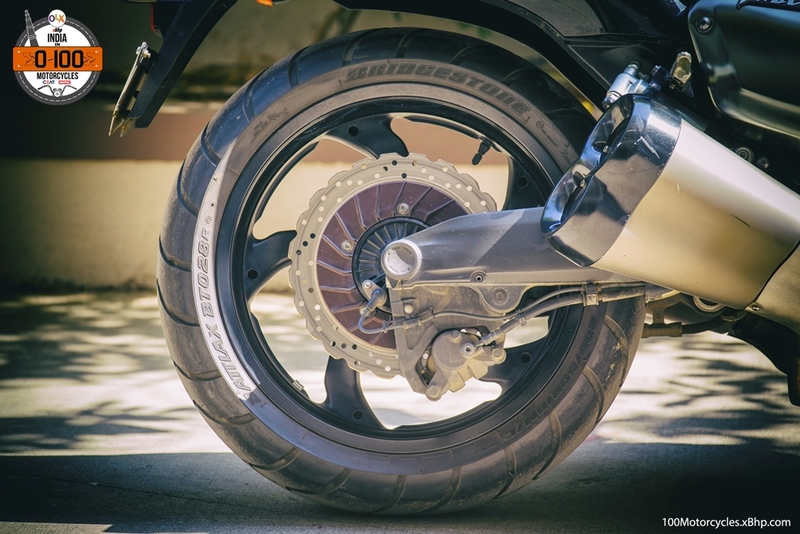 Brakes are high-performance as well with twin 320mm rotors at the front and a single 298mm rotor at the back. 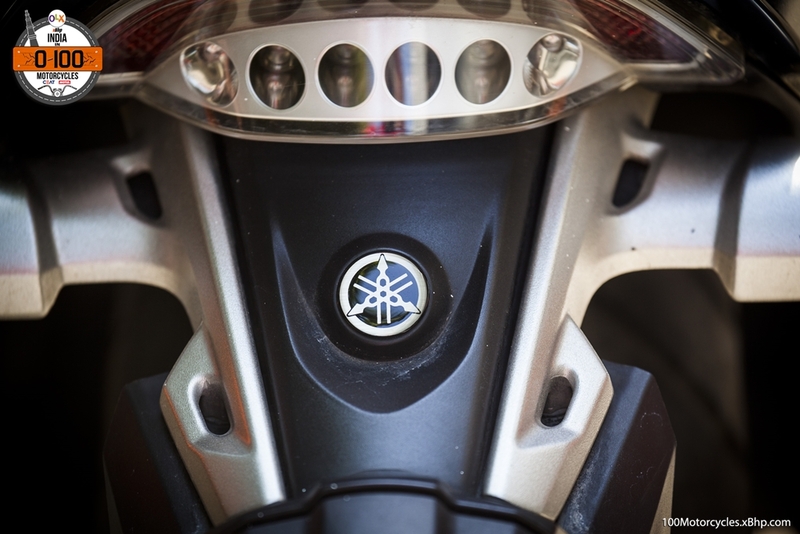 Yamaha has never really promoted the V-Max as aggressively as what Ducati is doing with the Diavel. Still, it continues to be an important part of the power-cruiser segment and just can’t be missed. 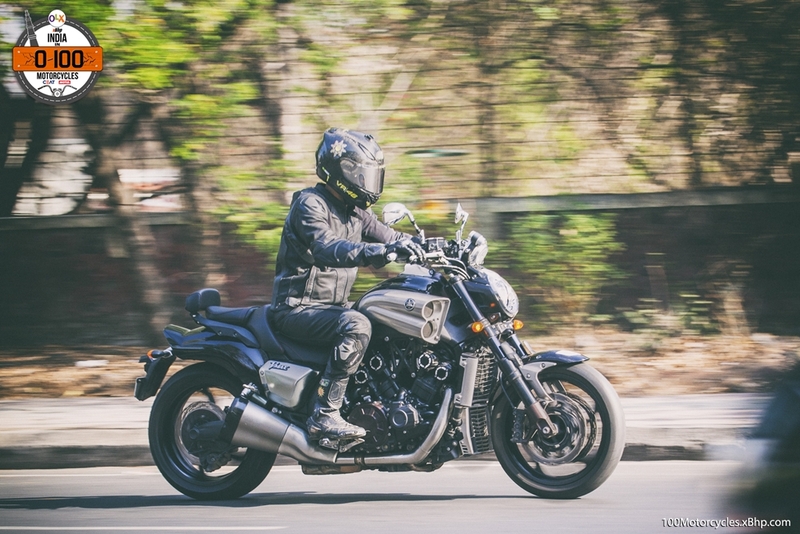 It’s almost a decade that the current V-Max was launched, and that it still looks and feels as radical as it was in 2008 is a testament to Yamaha’s design and engineering. 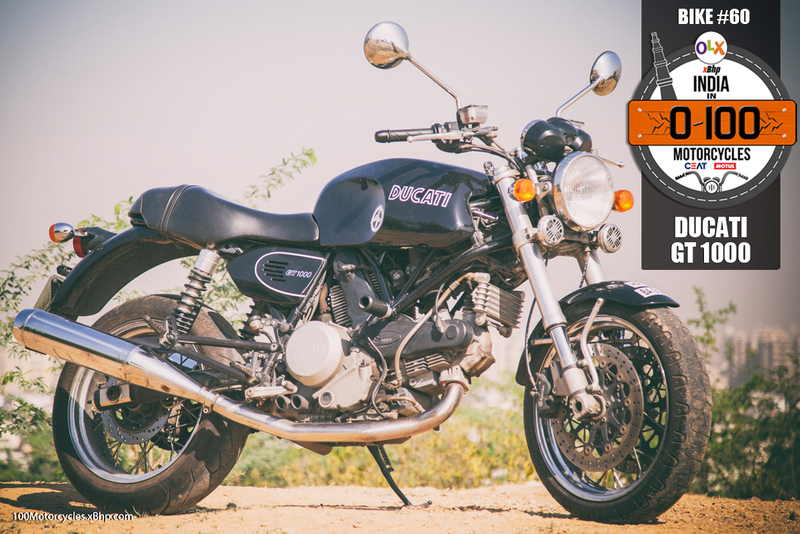 It doesn’t come cheap, it is Rs 26.9 Lakhs ex-showroom Delhi, so it is easily far out of reach for many of us. But then, we can always try our luck on OLX and see if we can get one second hand for a lesser amount of money. 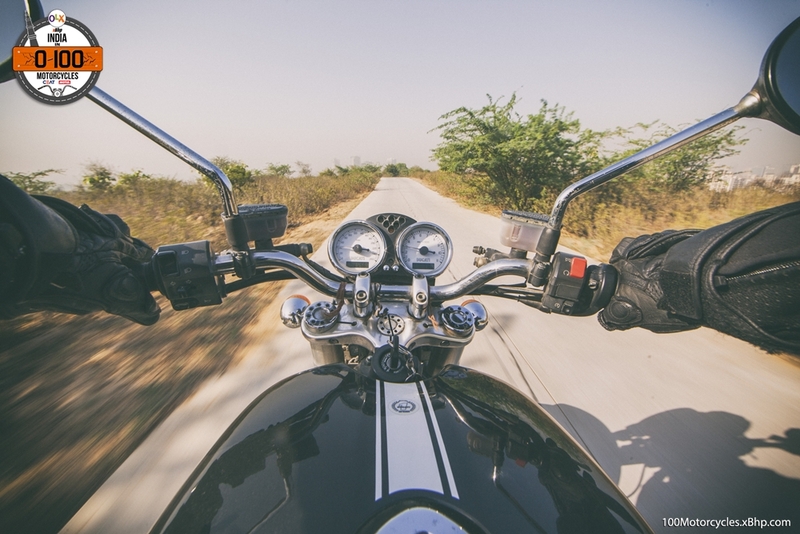 Taming the beast – is a phrase commonly used by motorcycle enthusiasts when they talk about riding a powerful motorcycle. 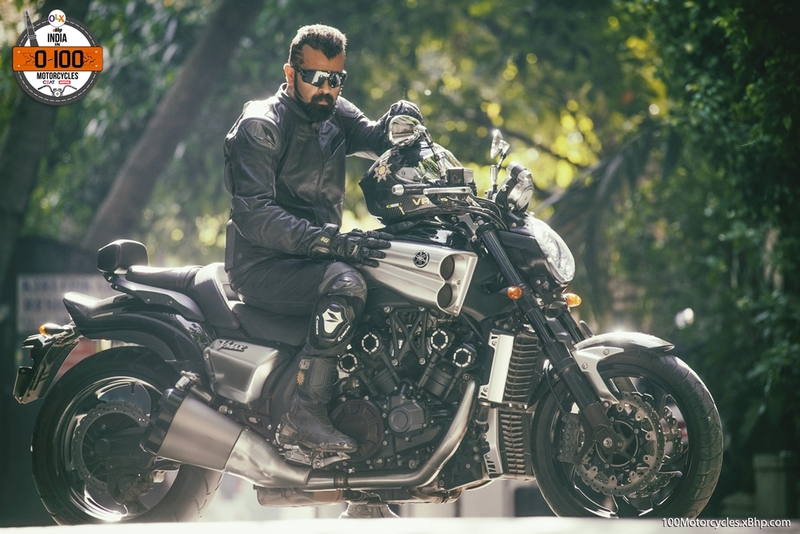 And many of them are indeed a beast – like a ferocious animal – that demands respect and understanding by the rider of what he’s getting into. 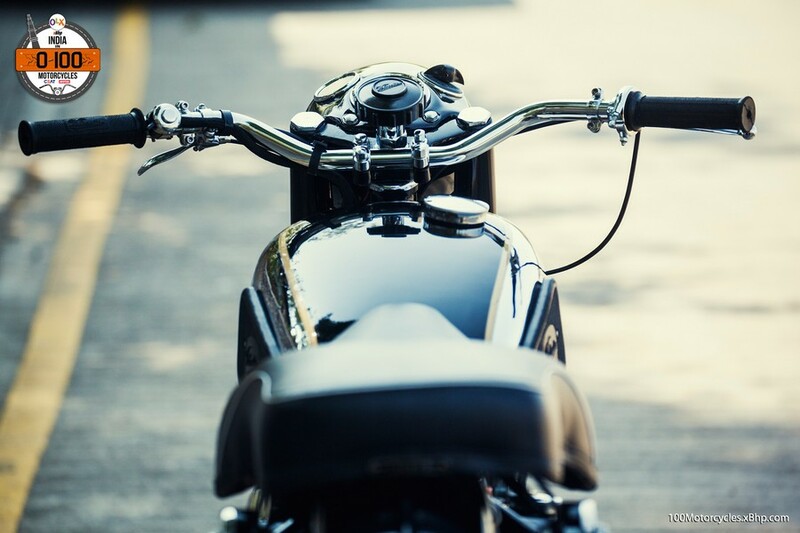 Motorcycles are personified all the time as people can relate them to their personalities. It is like they are the extension of our characters and vice versa. Some of them are wild enough to be personified as animals, wild animals, that howl, growl and roar. 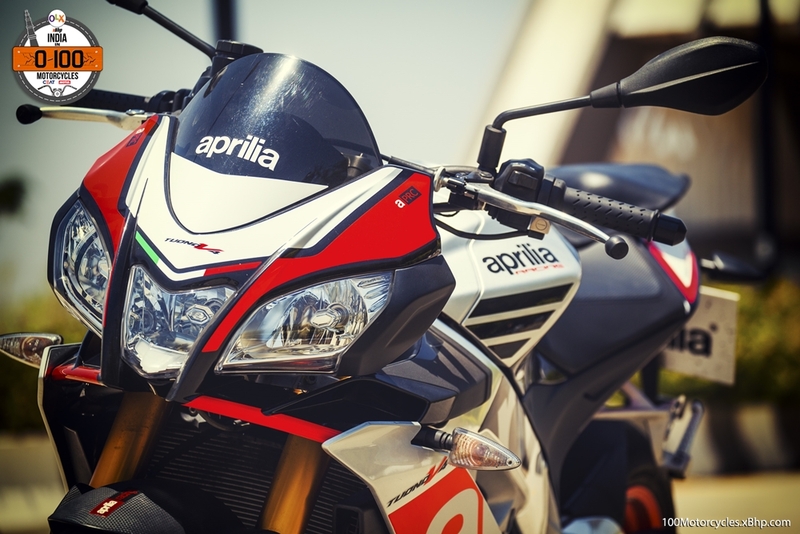 Aprilia Tuono V4 is one such motorcycle. If it was a person, it would be brash, arrogant and the one who is proud of it. If you object to it, it would tell you “this is how I am”. It would be all this, but not disrespectful to you because if you’re nice to it, it would take care of you as well. Just don’t try to be overly smart with it! 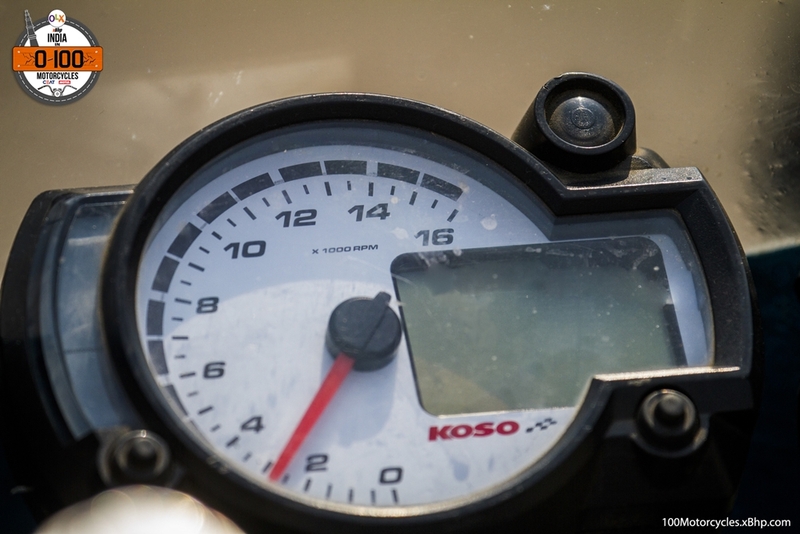 But the Tuono isn’t a brash person. 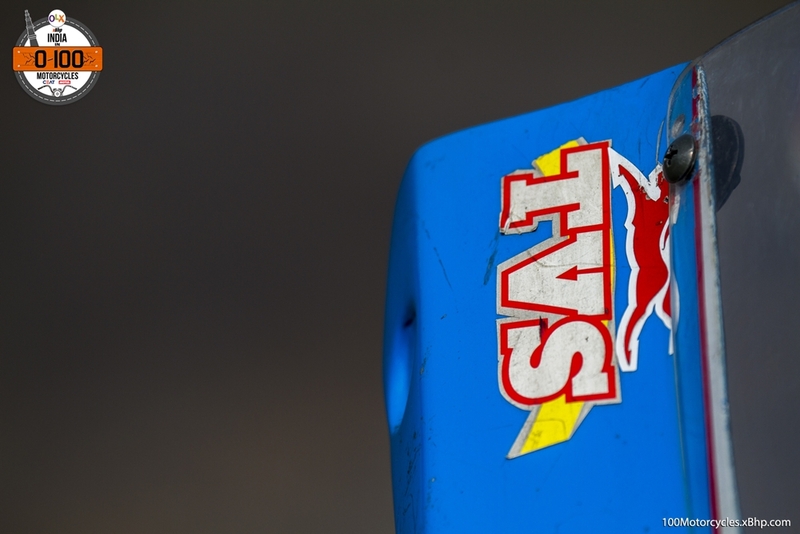 It comes to life with the roar of a wild animal, a beast, but has the quickness and the agility of a Cheetah. 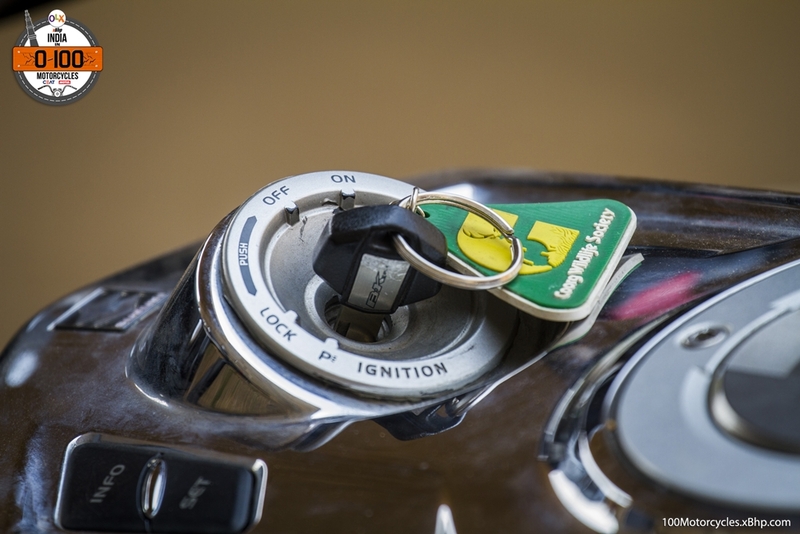 When you press the thumb starter after all the FI checks have been done, the engine rather roars to life than merely comes to life. It produces a relatively high decibel sound as if it’s been disturbed from its sleep and it does that just for a second or so before settling into a steady rhythm. 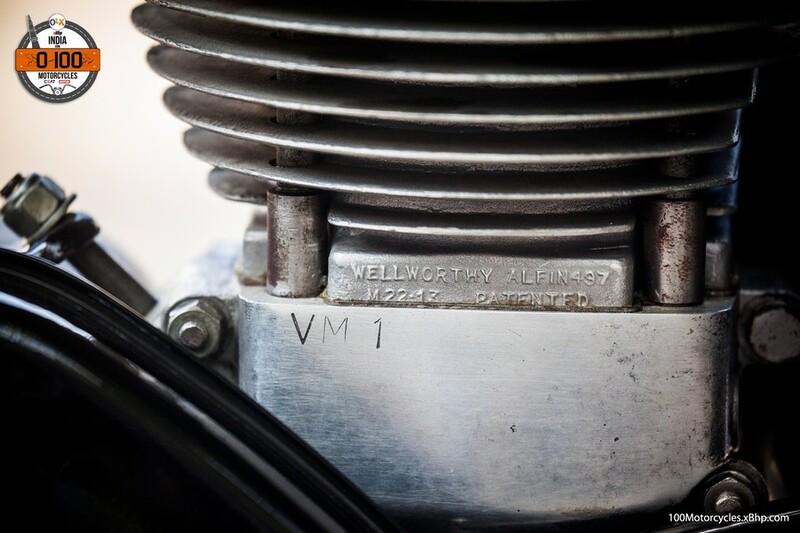 And this leads us to the most amazing part of the whole motorcycle – the V4 engine – what a gem that is. The 1077cc unit has 4 cylinders put together in a ‘V’ layout which churns out 175.3 PS of power at 11,000 RPM and 121 NM of torque at 9,000 RPM. It is a blast to experience. 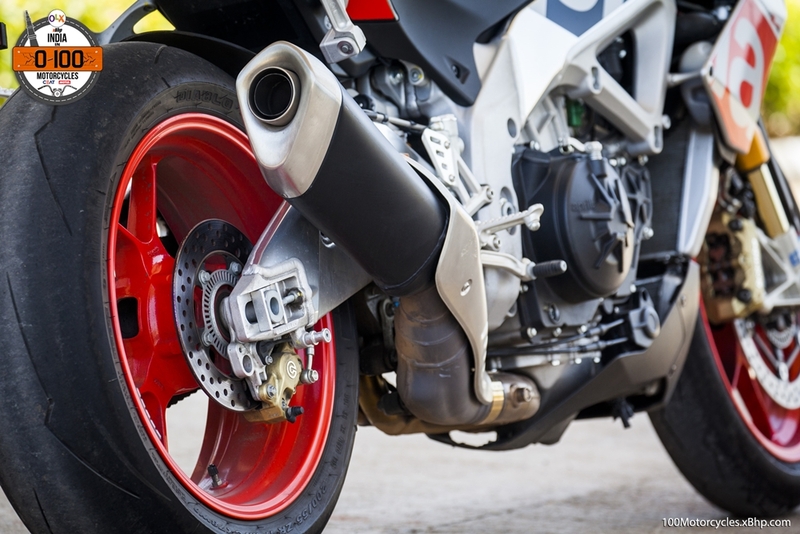 The whole motorcycle – the chassis, suspension, engine and the bodywork – are derived from the RSV4 Superbike. 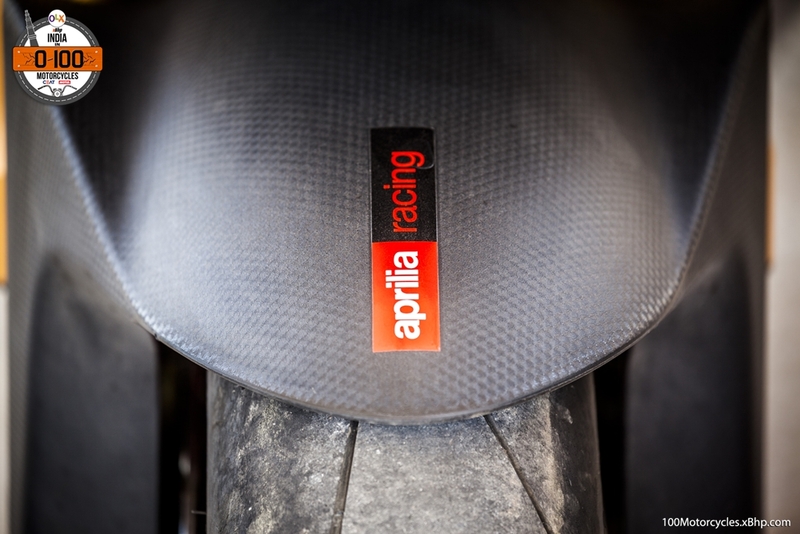 And here’s the interesting piece of info about the RSV4 – Aprilia made it specifically for WSBK (Superbike World Championship) so that Max Biaggi could take them to the top, and he did! 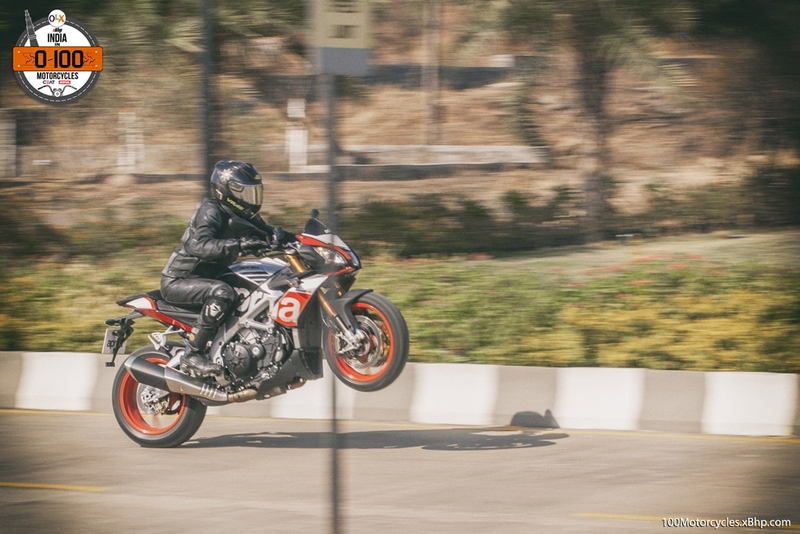 So what we get in the Tuono is the same V4 engine but detuned for better street friendliness, of course! 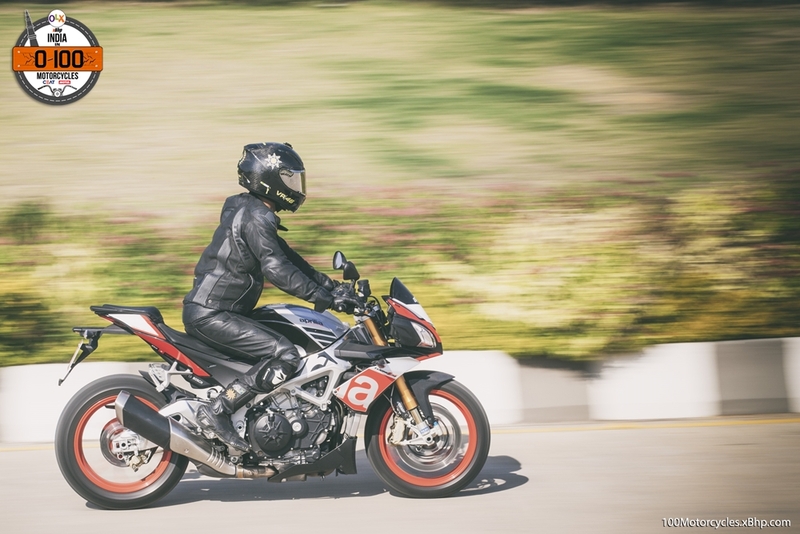 But with 175 horsepower, it is still out of the league of many riders to use it to its full potential on the streets or on a racetrack. 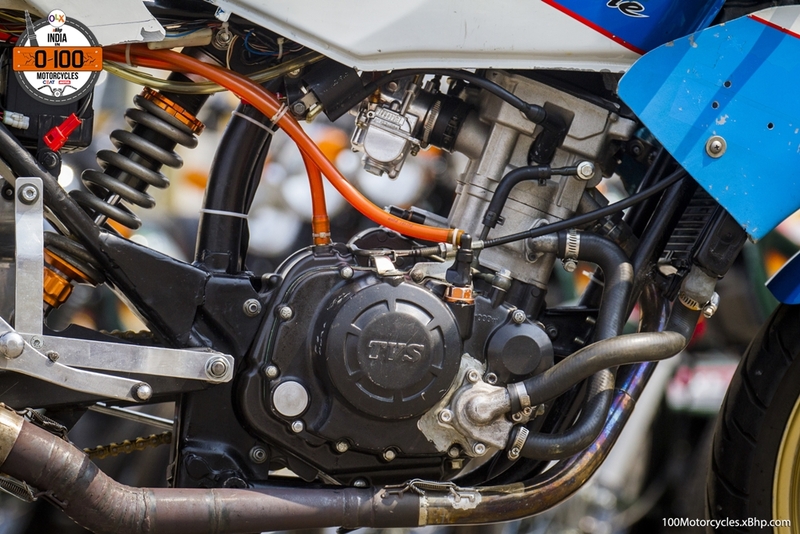 Its inherent nature is that of generating raw and aggressive power, after all, it is basically a race-spec engine made to primarily run on tracks and win races and championships. 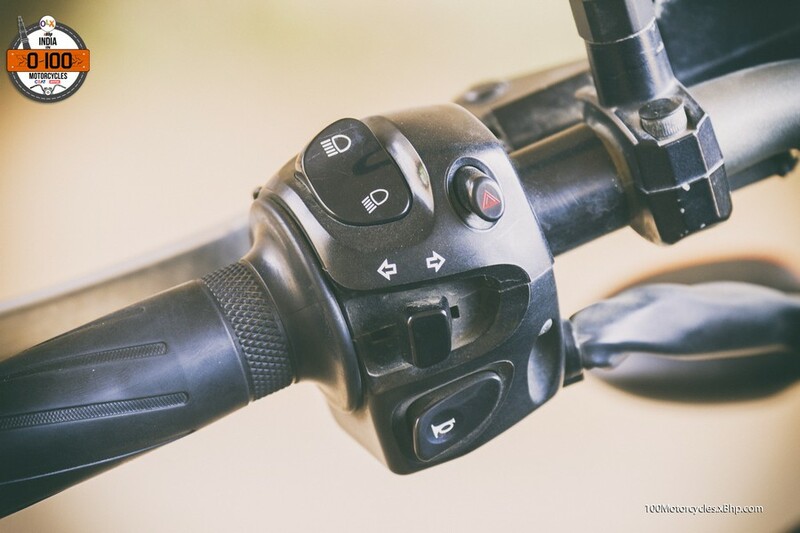 But thanks to the Ride by Wire throttle, it has three riding modes to keep that maniac power delivery under control – T (Track), S (Sport) and R (Race). Out of all three, Race allows you to play with all the power with the least intrusion from the software. 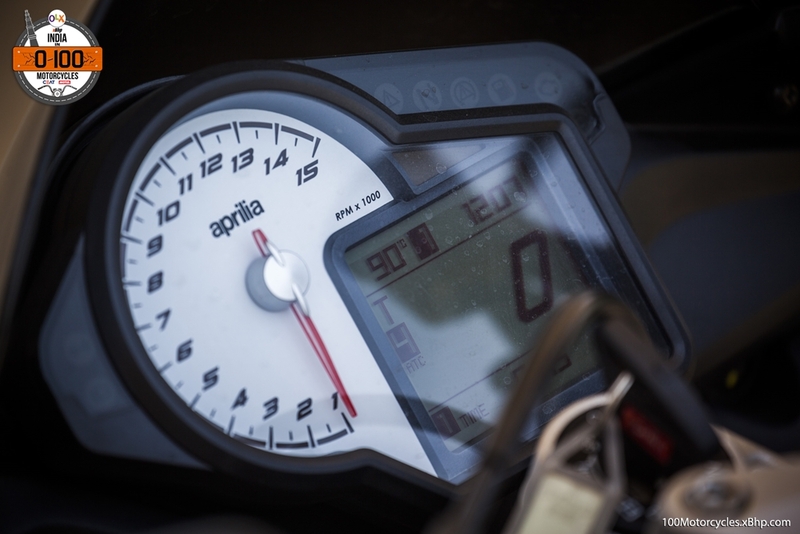 What’s also standard is the APRC package which translates to Aprilia Performance Ride Control. 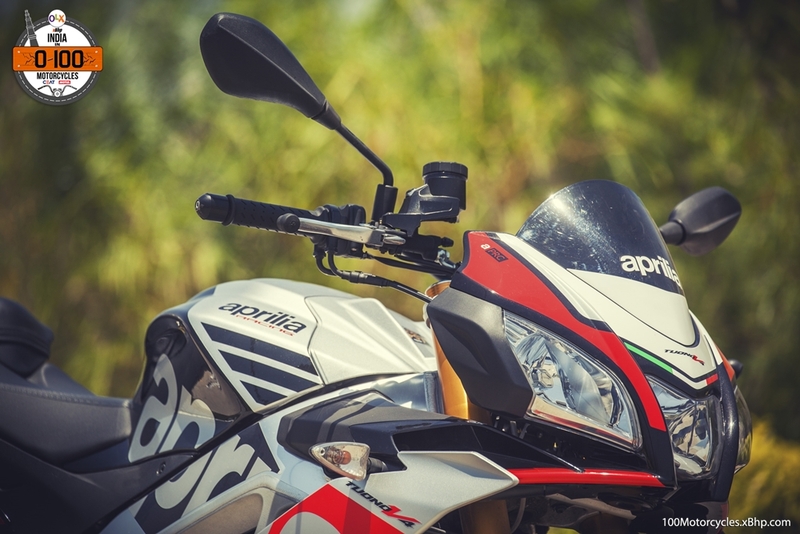 It’s a patented system which includes Aprilia Wheelie Control, Aprilia Traction Control, Aprilia Launch Control and Aprilia Quick Shifter. 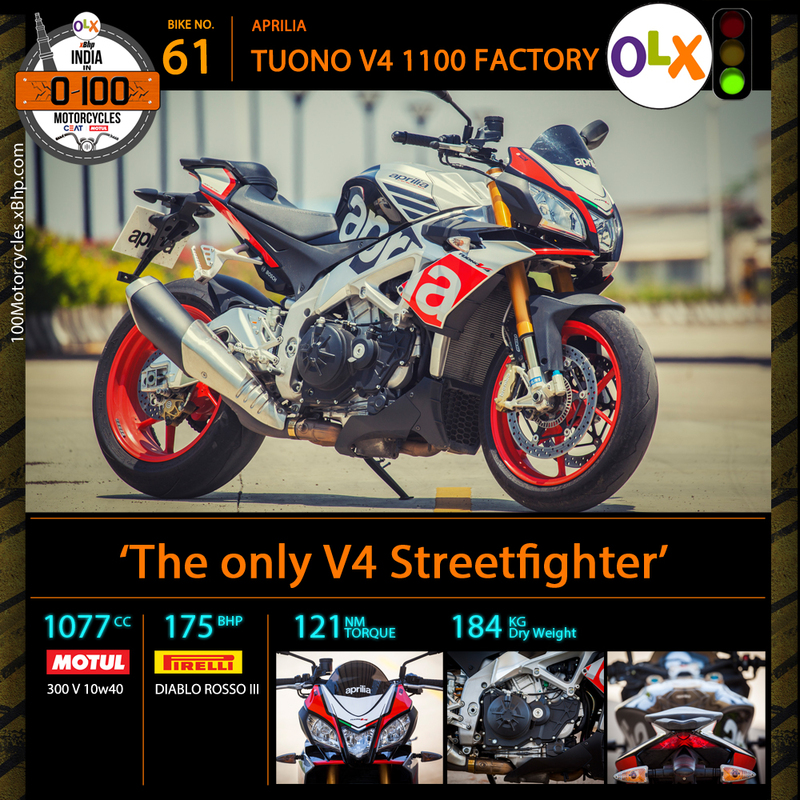 The Tuono we got our hands on wasn’t the standard one, it was the Tuono V4 1100 Factory and it comes with some perks – first, the Superpole graphics and second, the Ohlins suspension front and back. 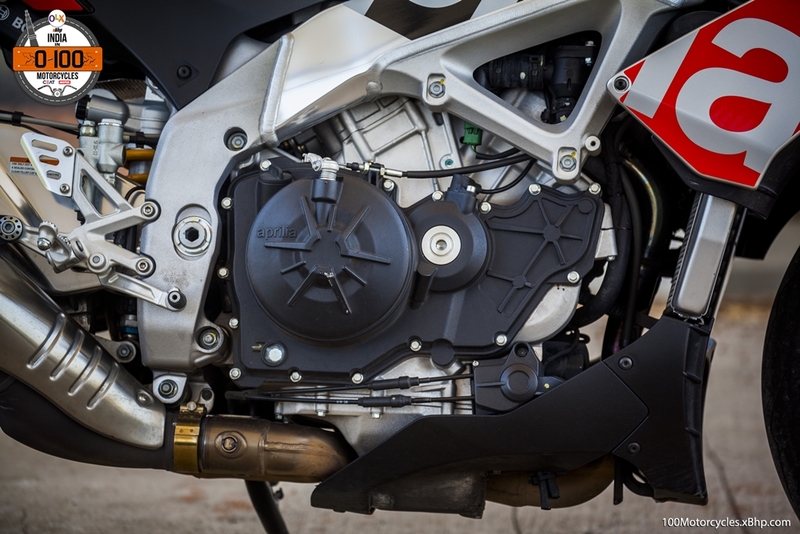 All things combined, the Tuono V4 1100 Factory is possibly the most track ready naked out there right out of the factory floor. 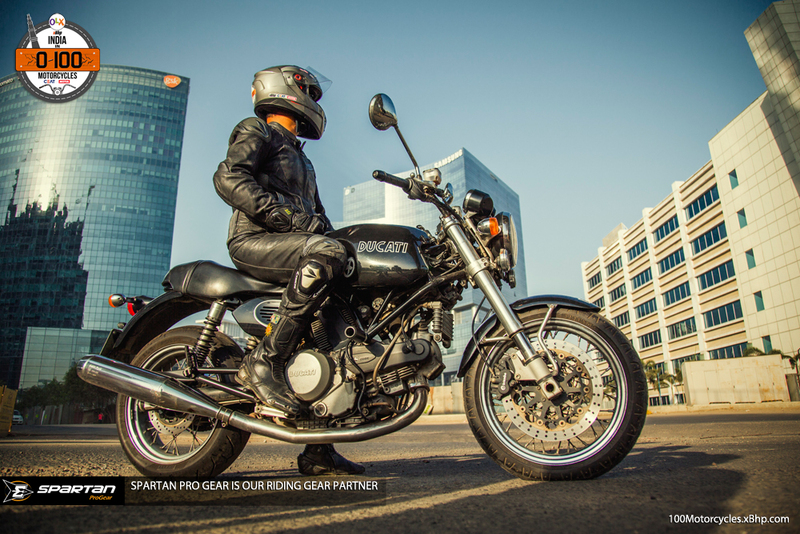 The riding experience has been tremendous – it is addictive, to say the least. It will spoil you like anything. 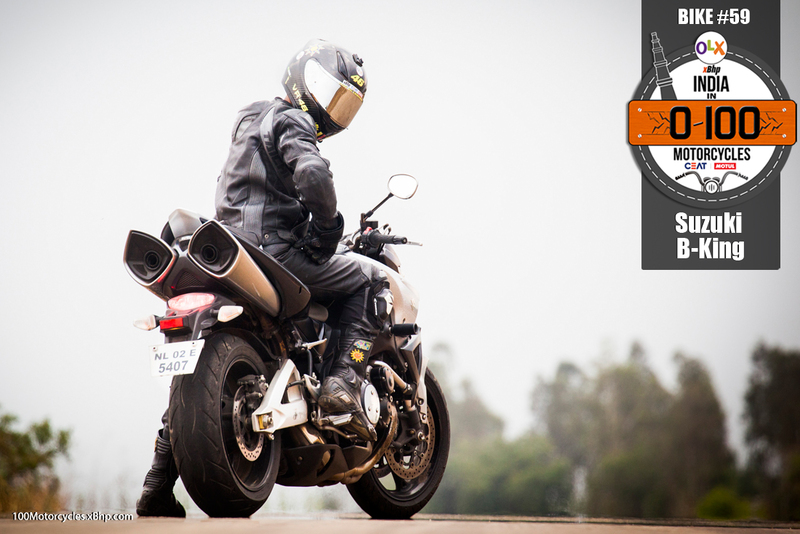 The beastly exhaust note, acceleration, handling and everything else about the motorcycle, when combined, produce an unmatchable riding experience. 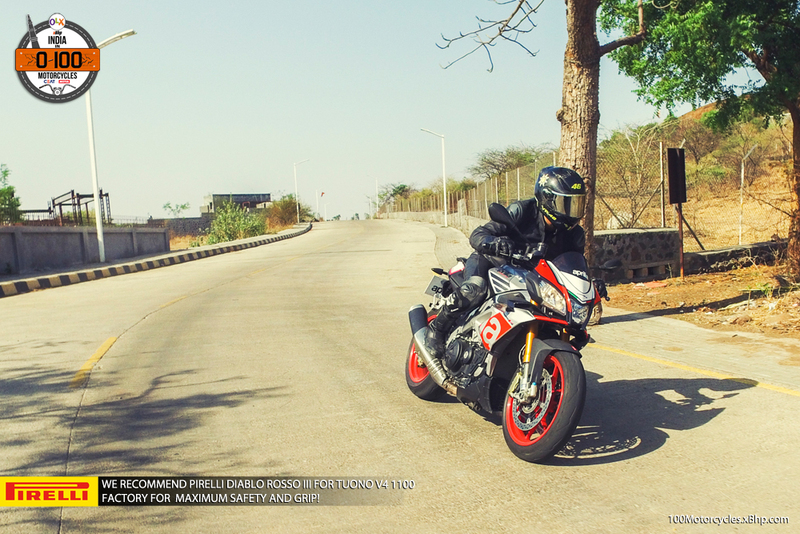 And if you’re someone who detests sportbikes for some reason, the Tuono V4 will be your guilty pleasure. 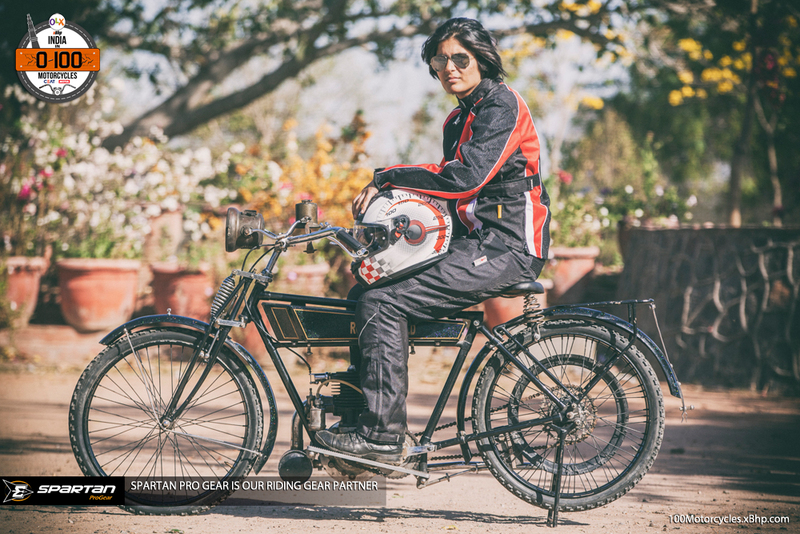 It could even be the dark side of your nature which you’d love to sport every now and then. 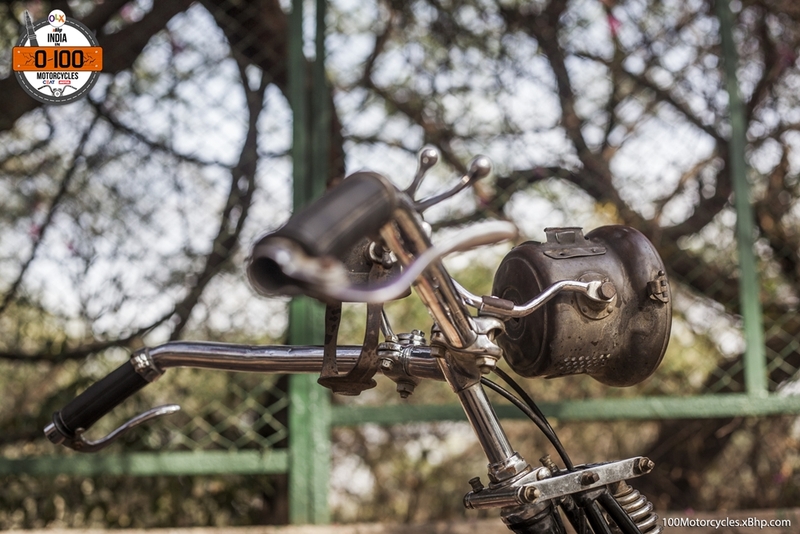 Even in the typical Indian traffic, it is not terrible to ride which we were really happy to find out. 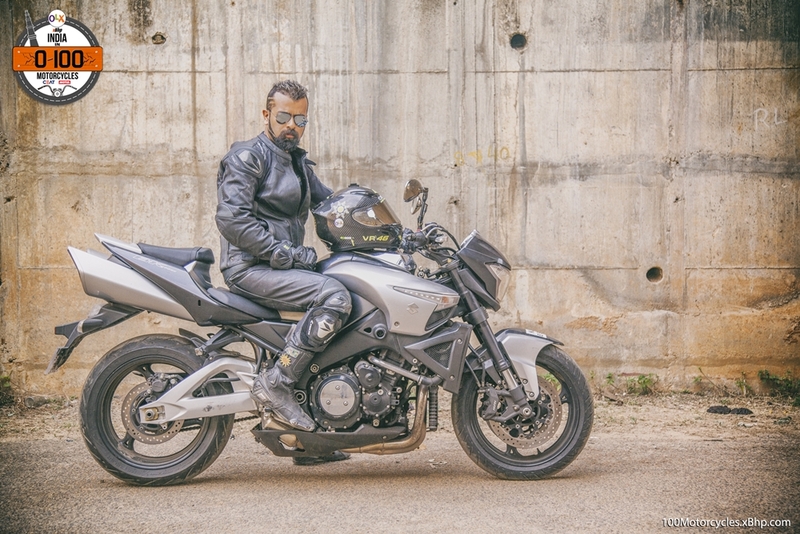 What one needs to be careful about is the immense power, if that can be controlled, the Tuono is a tremendously enjoyable motorcycle to ride even in a city. 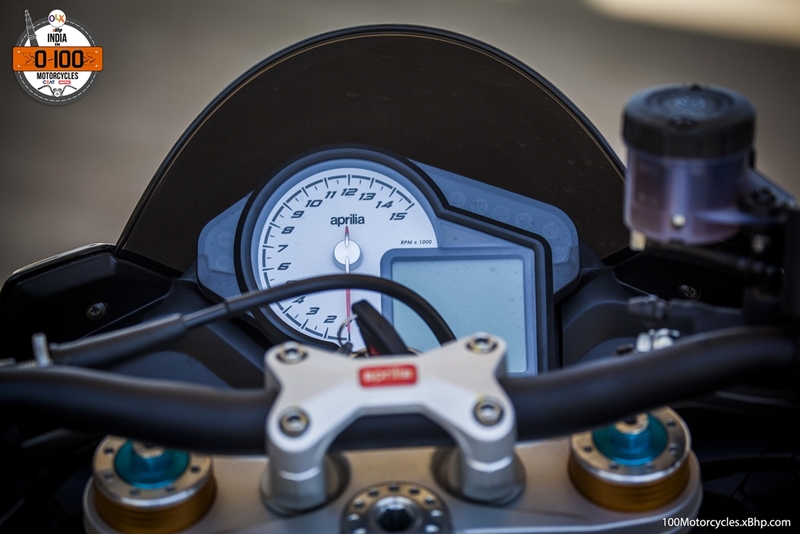 The response from Ohlins suspensions at their factory settings was equally impressive. 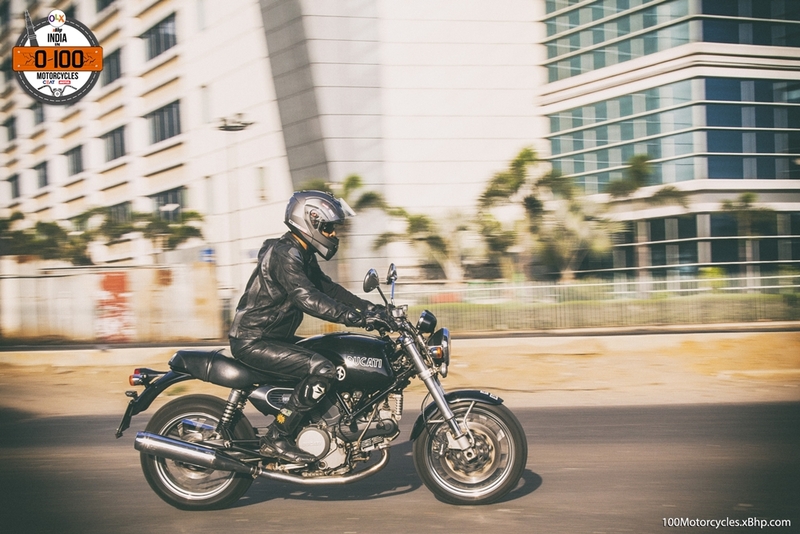 The variety of city roads that we rode the Tuono on, it felt comfortable and no unnerving jerks were felt through the shockers. 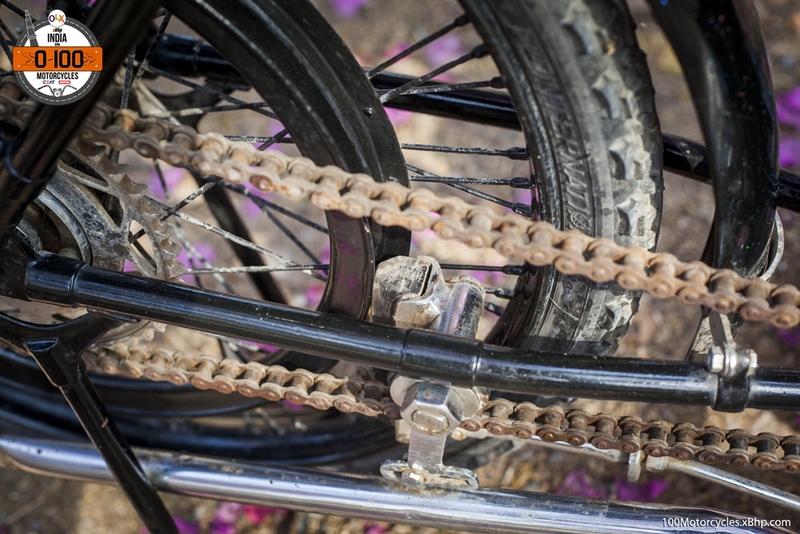 They did a splendid job of keeping the ride smooth and stable throughout. 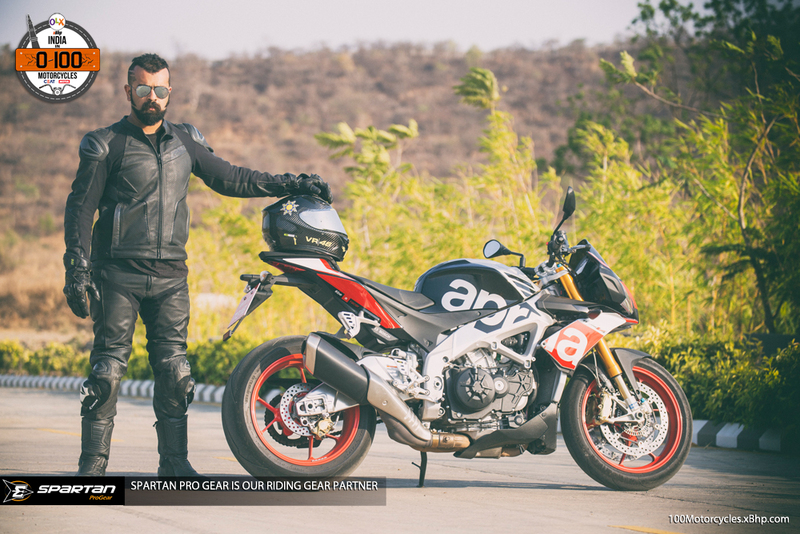 The Tuono V4 is one of the best motorcycles to buy for anyone looking for maximum performance out of a sportbike and the one which is also comfortable. 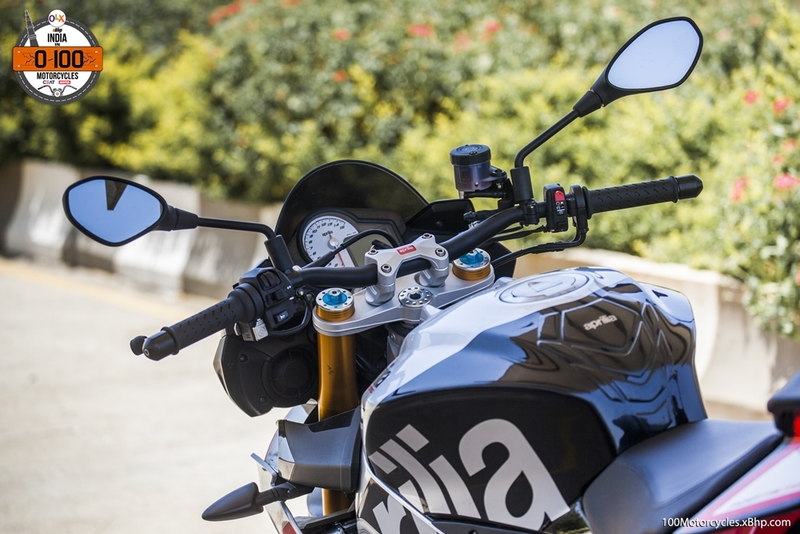 And unlike a typical streetfighter, the Tuono comes with a half-fairing offering decent amount of wind protection too. 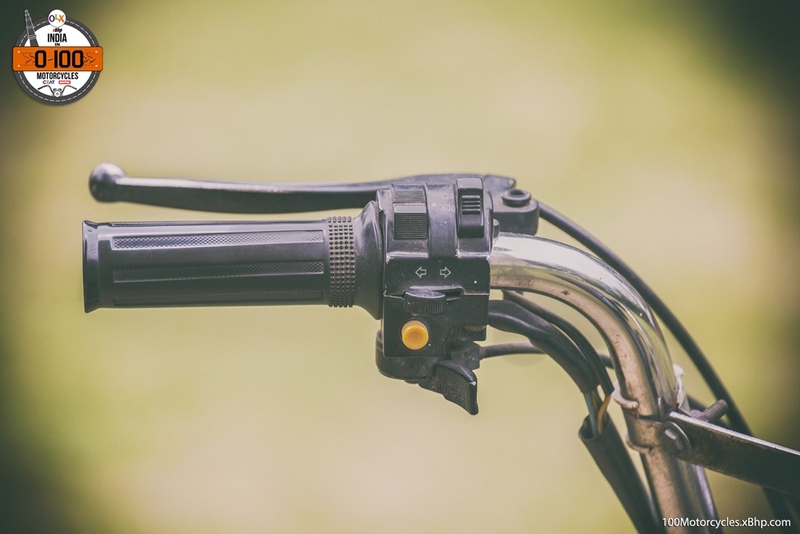 It is more than one bike! 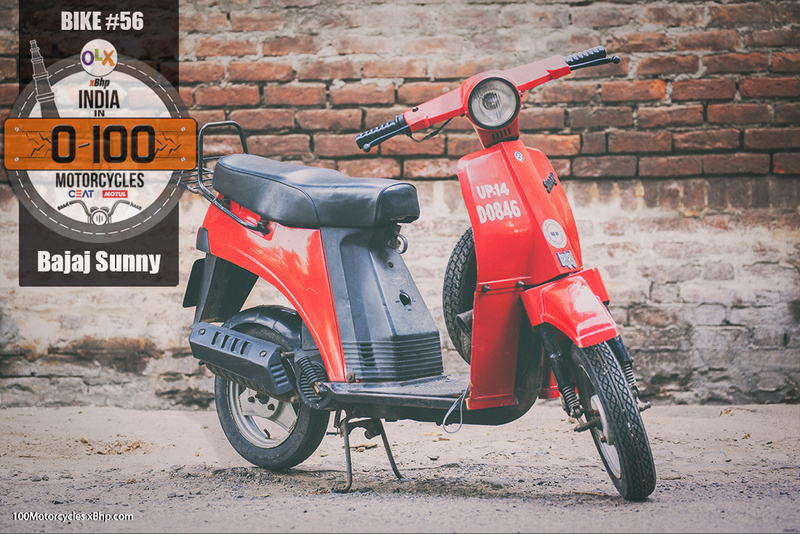 Lastly, it doesn’t come cheap, it’s Italian! But then again, you can always try your luck on OLX and see if you can find it affordable as a second hand. 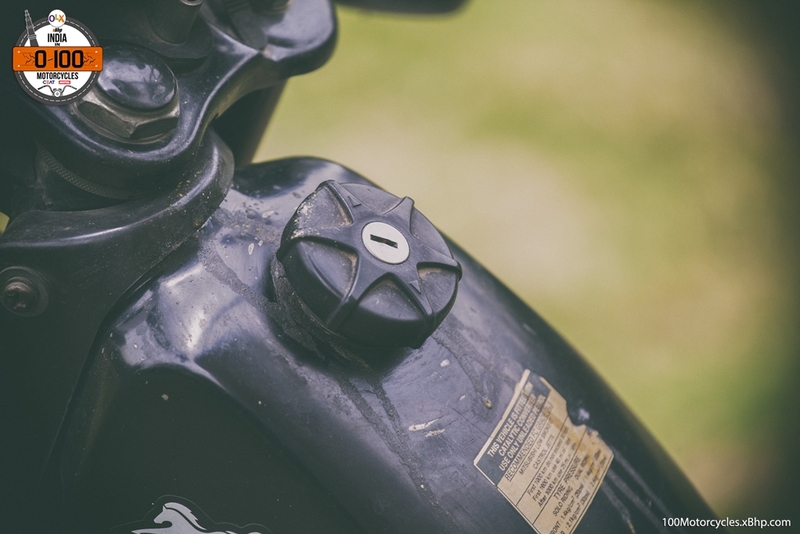 Not everyone would understand all kinds of motorcycles. 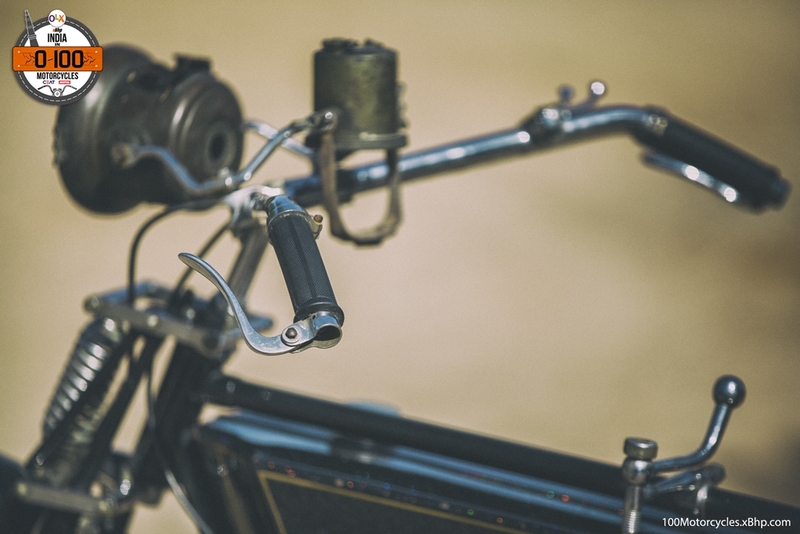 Another way of saying this is – not everyone would understand motorcycles from all eras. Not that we should, we all have our own preferences. 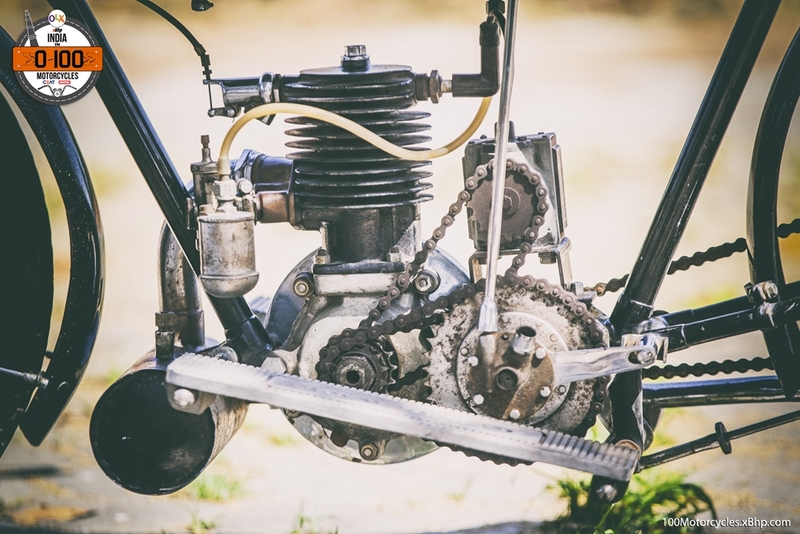 Having said that, there have been many good motorcycles in the past that went on to give birth to various segments of motorcycles we know of today. Falling short on Cash? 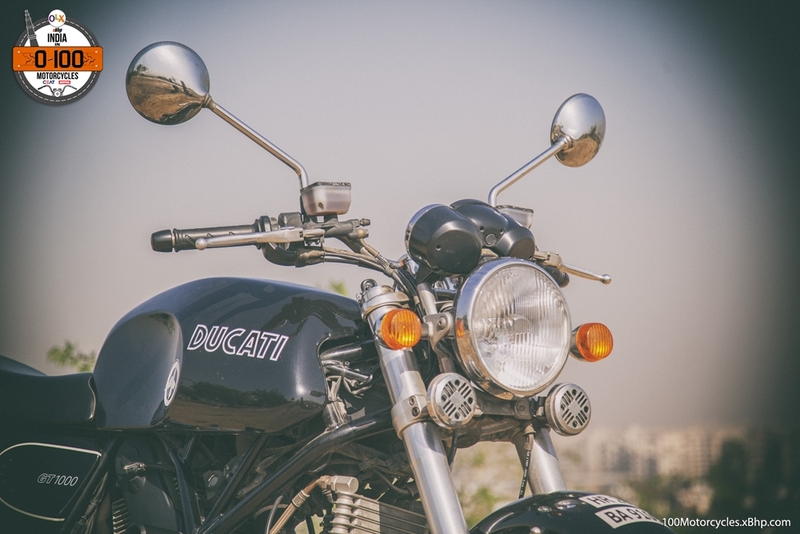 Find your favorite Ducati motorcycle listed on OLX for sale and you might find an interesting deal that fits your Budget. However, what worked earlier may not work today. 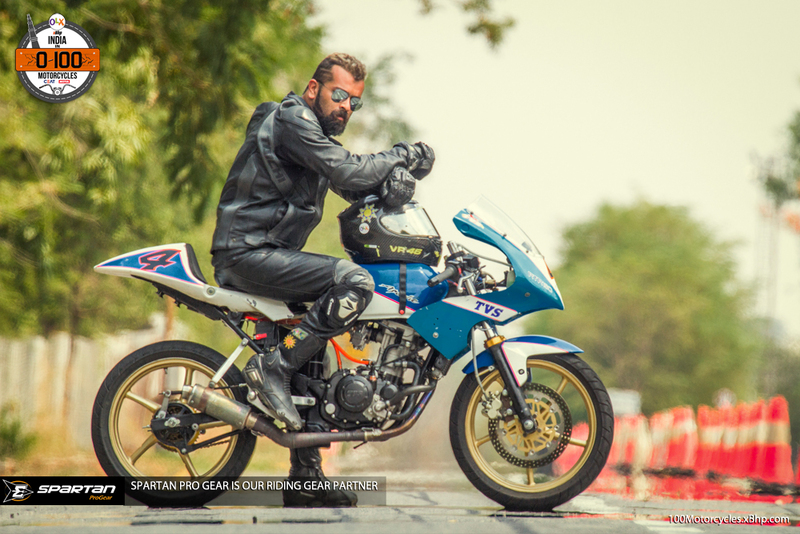 Say, if we are to ride a certain classic motorcycle from 40 years back, we may find it lacking terribly in all those things that make a good motorcycle – performance, handling, braking, comfort, looks, etc. – even if it might have been a revelation back then. 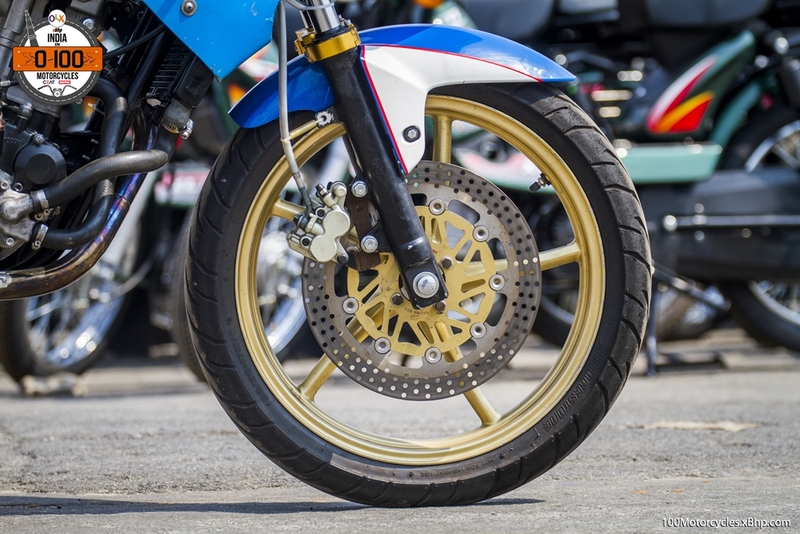 And that would be hardly surprising considering 40 years of technological advancement which naturally makes two-wheelers of today remarkably different than those in the past. That’s progress, that’s evolution. Secondly, given that they are from a entirely different generation, we simply may not understand or “get” them. 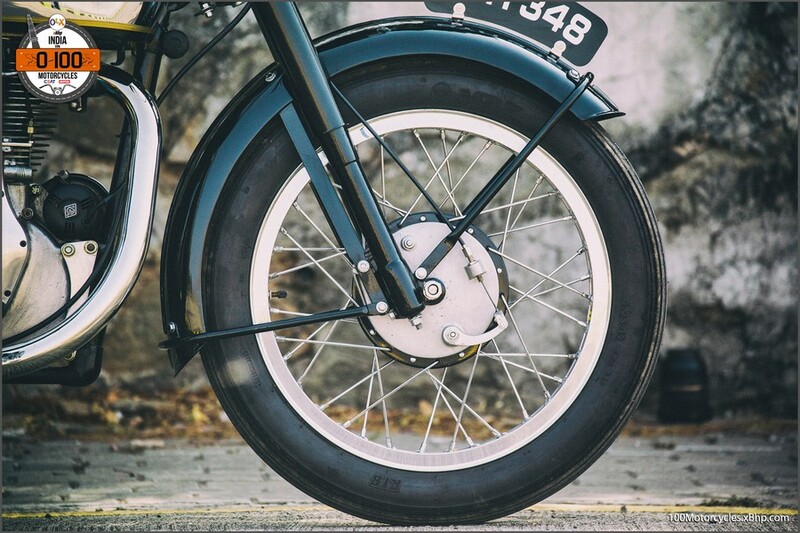 But wouldn’t it be great if we can still find a way to enjoy and actually feel happy about the motorcycles from the bygone era? 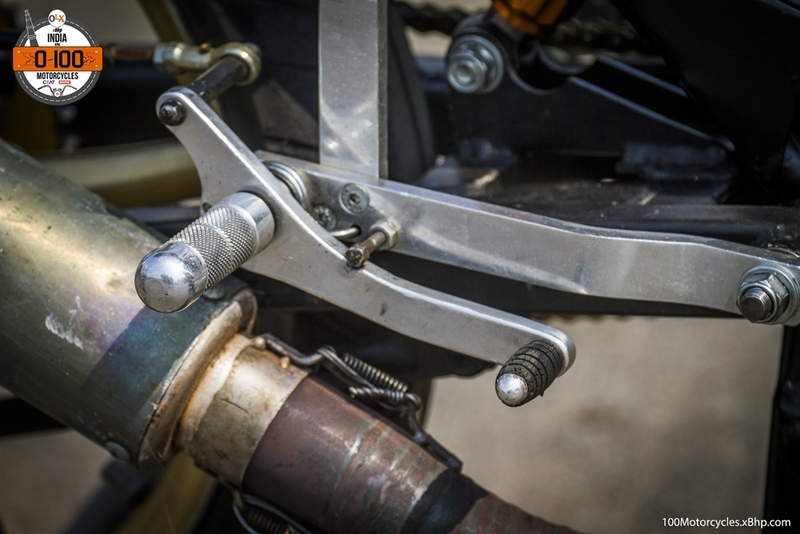 Good for us, various bike makers found a solution to that years ago – Modern Classics. 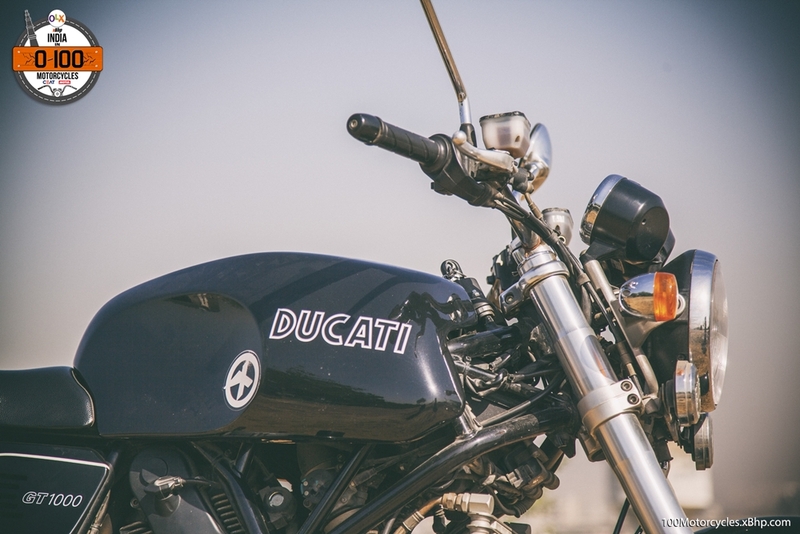 Now, Ducati has been making motorcycles for a long time now and their bike lineup is a great example of advancing-through-technology over all these years. 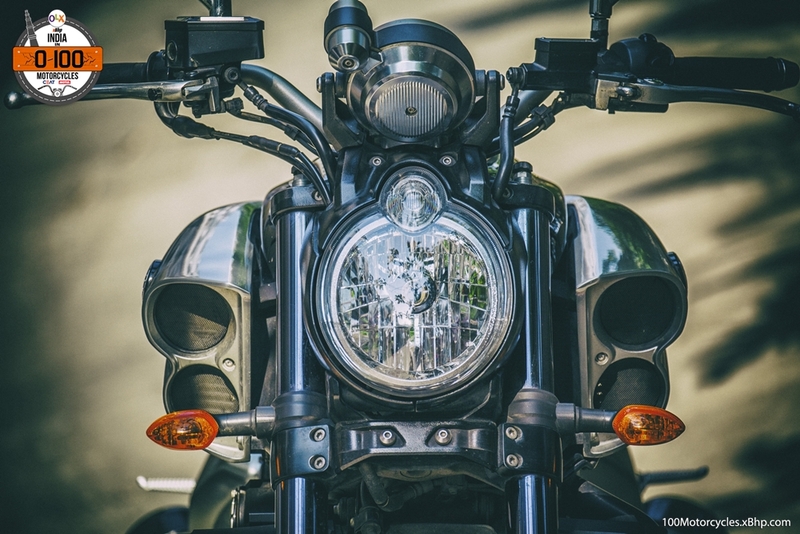 Many of their motorcycles have changed more in design and nomenclature than some other motorcycle manufacturers around the world. 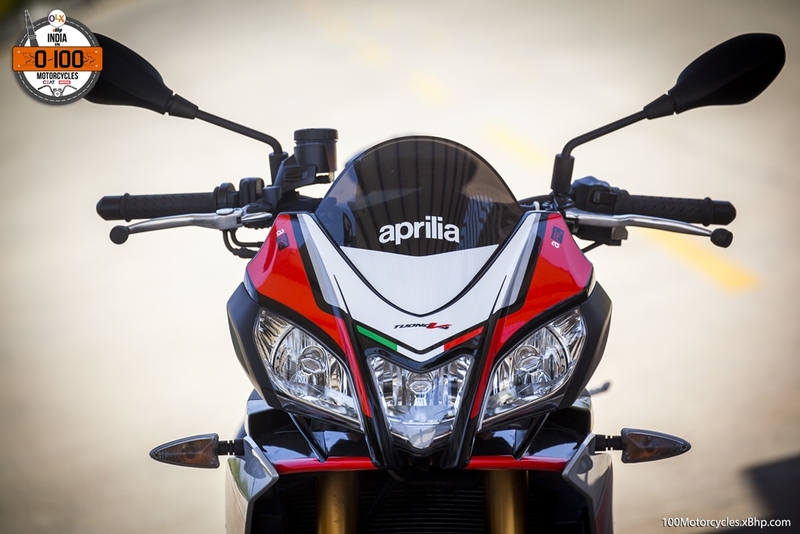 From the classics to the Superbikes, the Italian company has had everything. They even had a MotoGP replica in the amazing Desmosedici RR. 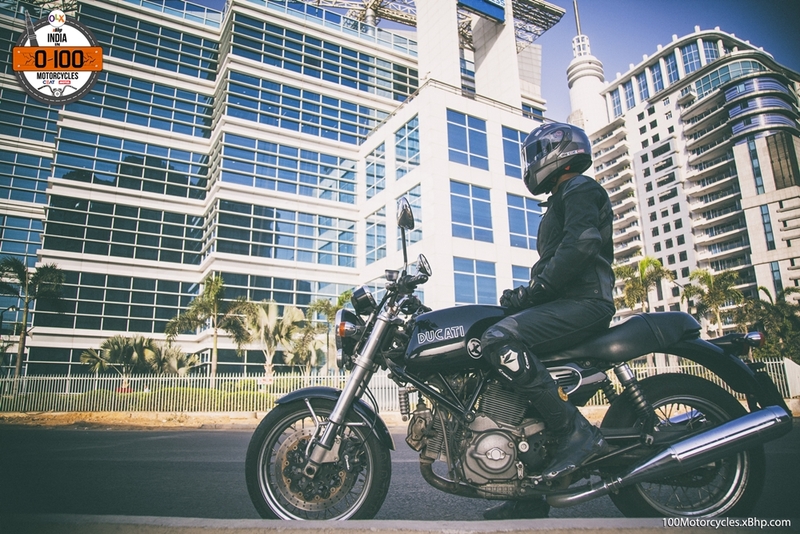 Modern classics – it’s a pretty unique category of motorcycles where the past is pulled into the future to meet the present! 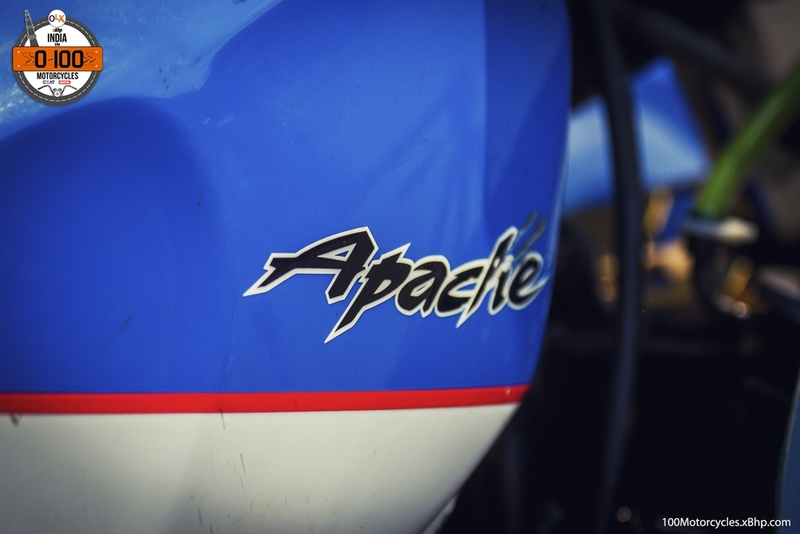 It’s about nostalgia more than the numbers on the dyno. 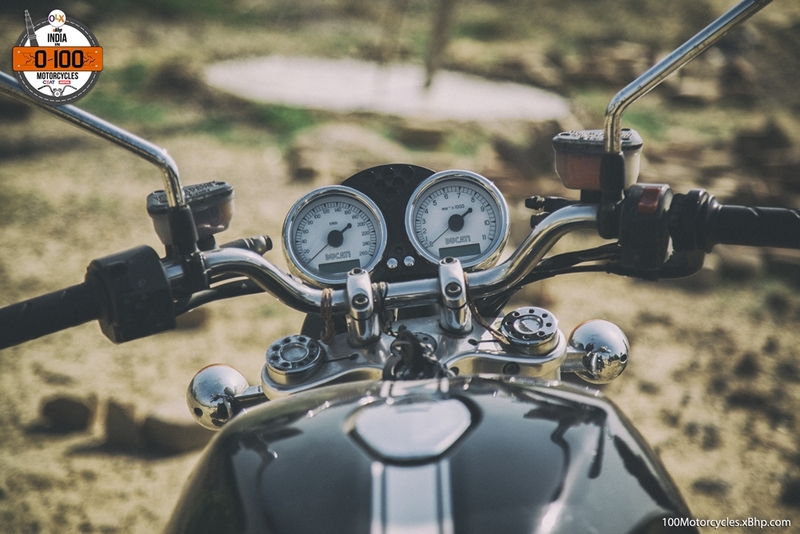 It’s about the “feeling” which made motorcycles connect with the rider’s heart in the first place. 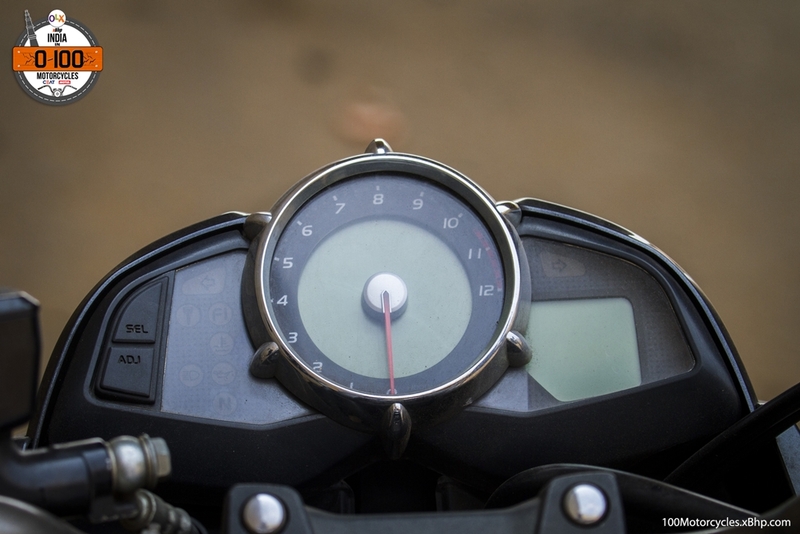 It’s about understanding motorcycles at their core. 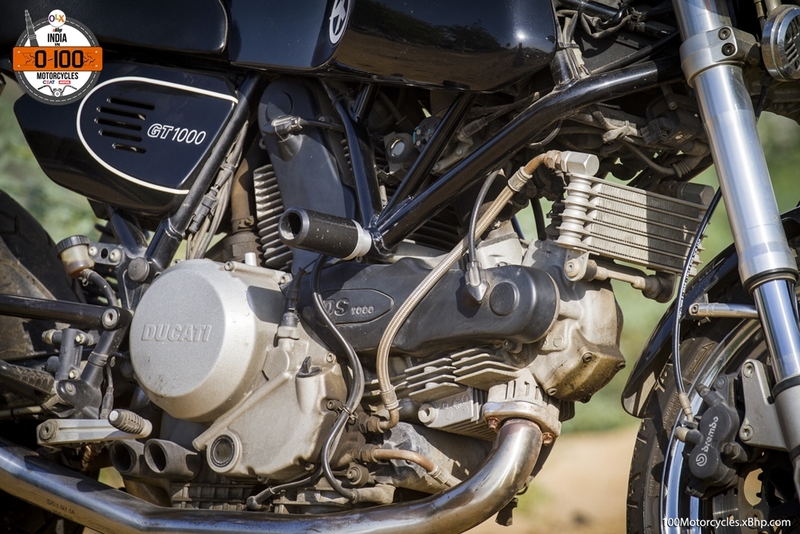 One such motorcycle Ducati had in their stable was the GT1000. Had. 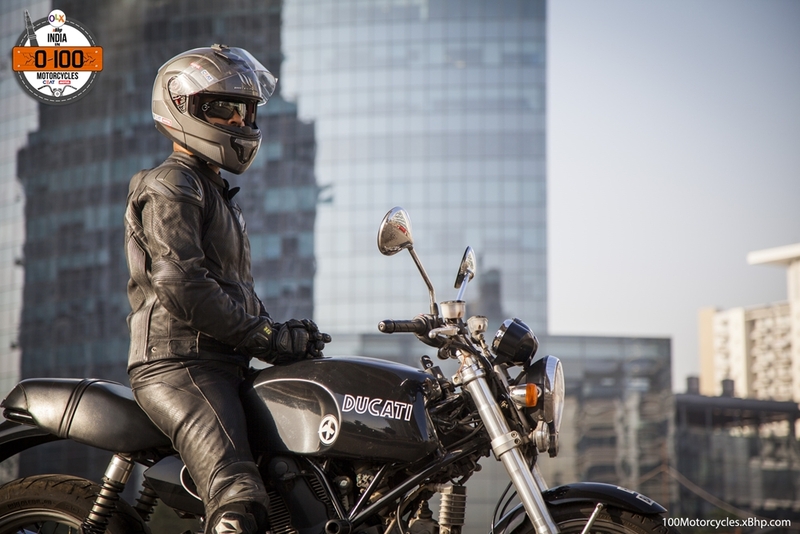 It was made for a very short time from 2007 to 2010 as a part of the Sports Classic range of motorcycles which also included Sport1000 and Sport1000S. You and I can’t get one today, not brand new at least, but we can always try platforms like OLX and we just might get lucky. 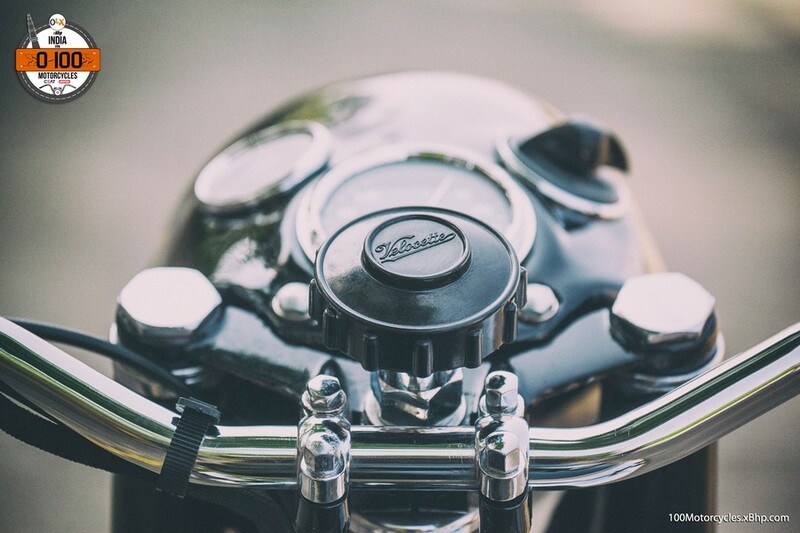 GT1000 is a classic. 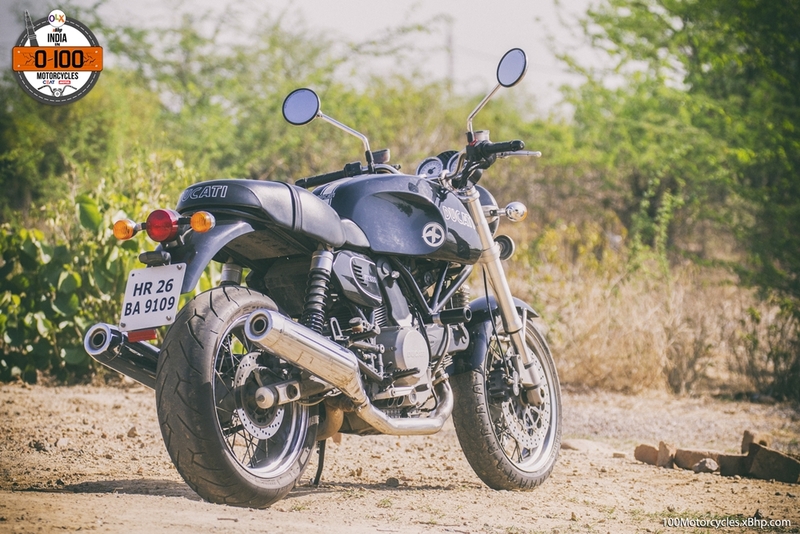 It came with an L-twin air-cooled 992cc engine which produced 92 PS of power at 8,000 RPM and 91.1 NM of torque at 6,000 RPM. 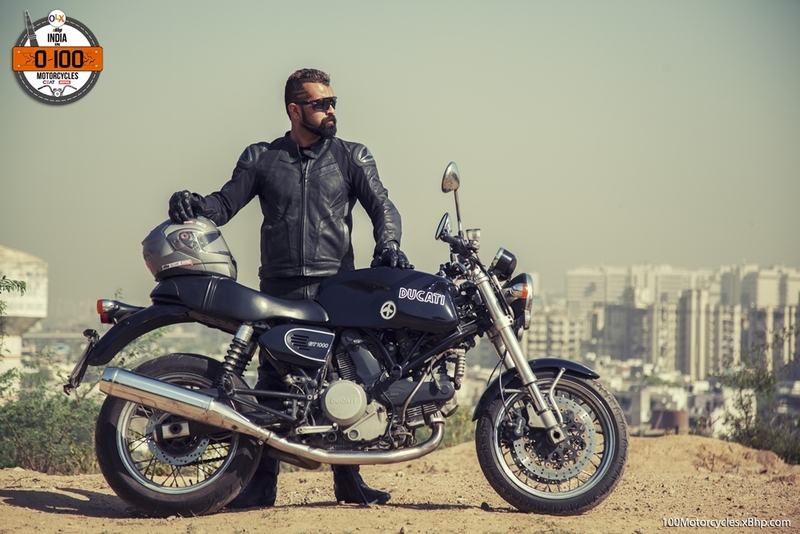 We Sincerely thank Mr. Manish Rajpoot for sparing his time for us and letting us ride his Ducati GT1000. 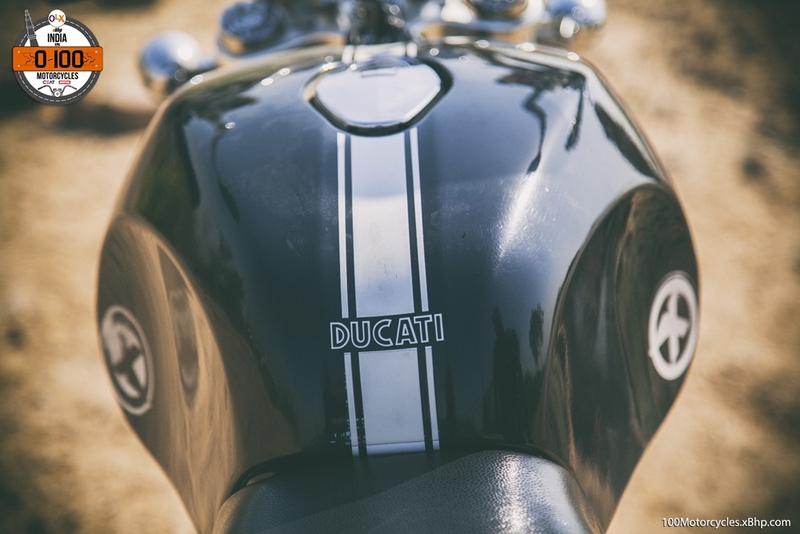 The design was more or less of a standard motorcycle, but of course, being a Ducati it was a bit different. 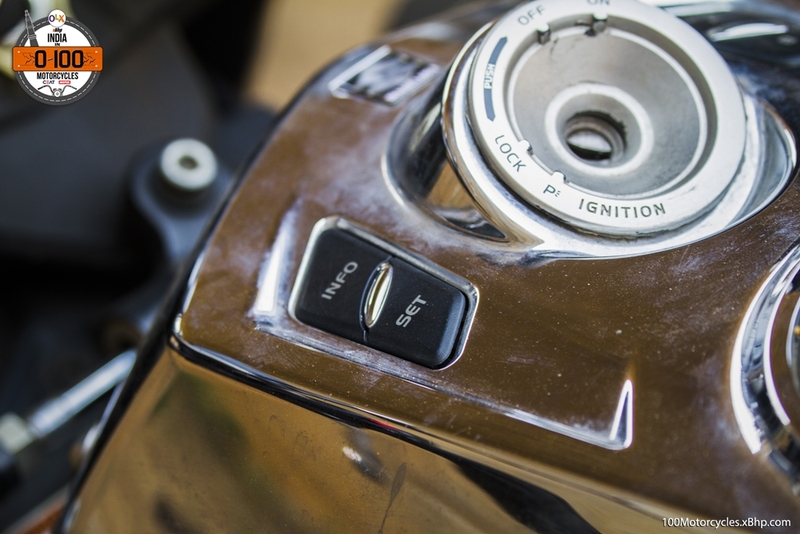 But the bits and pieces that made that design were far from outdated. 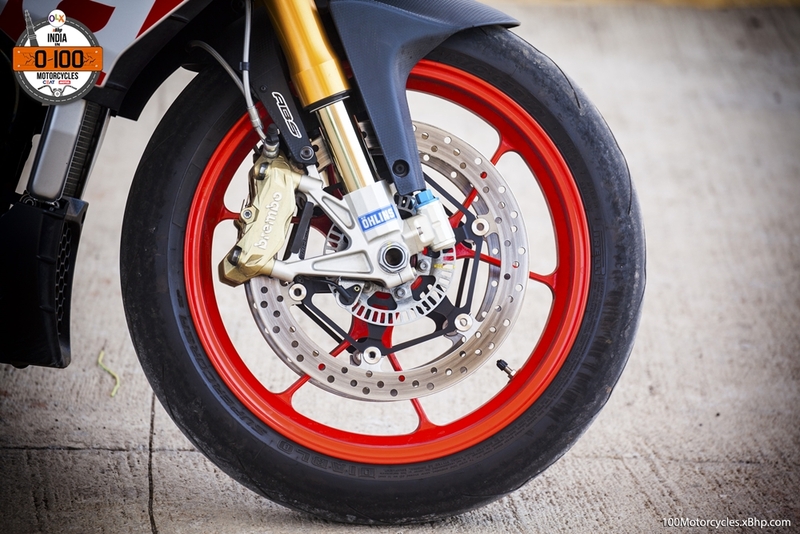 At the front, there’s a pair of upside-down forks from Marzocchi and Brembo floating callipers front and rear. 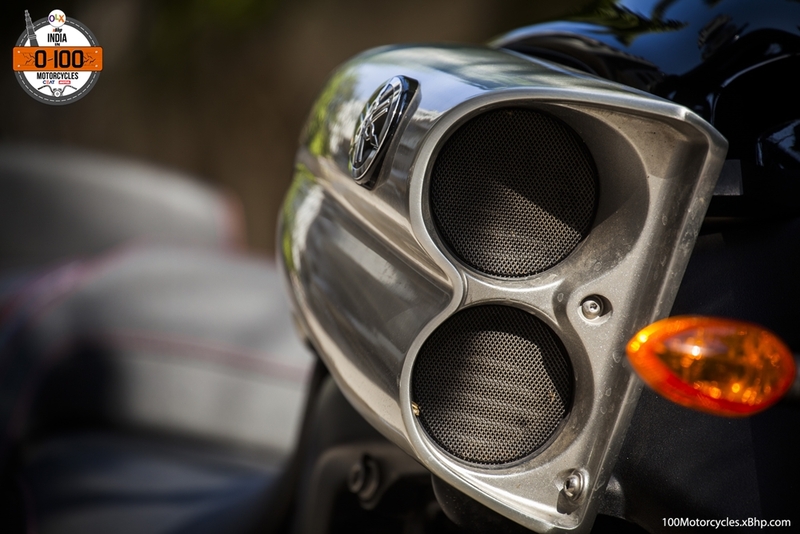 The rear comprised of twin shockers from Sachs. 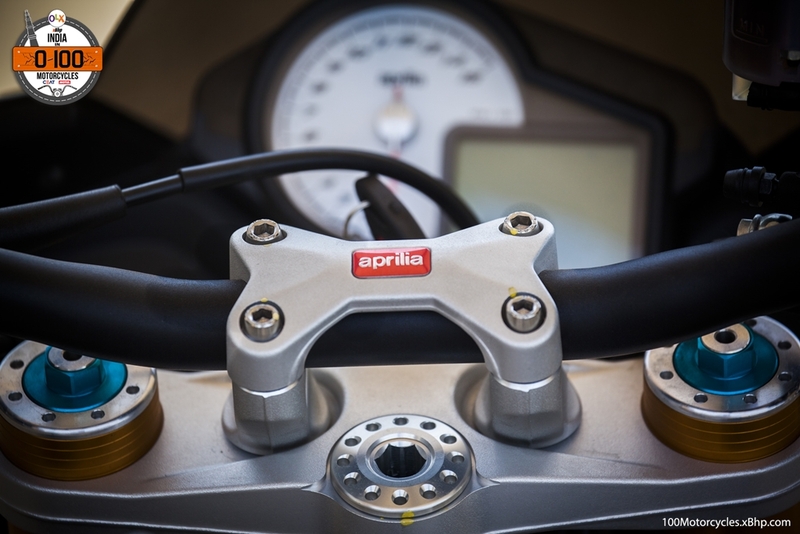 That’s what has always been great about Ducati, they have never under-equipped their motorcycles as far as chassis and suspension are concerned. 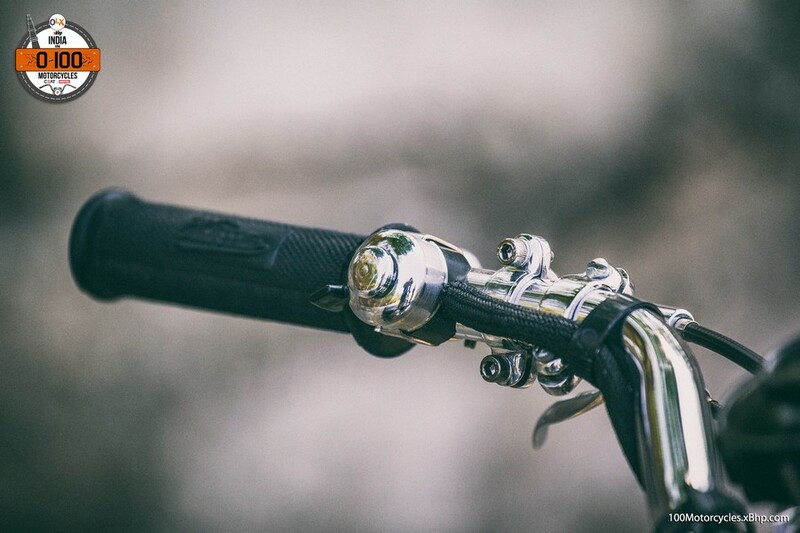 The steel trellis frame is also discreetly finished and has a minimal appearance. 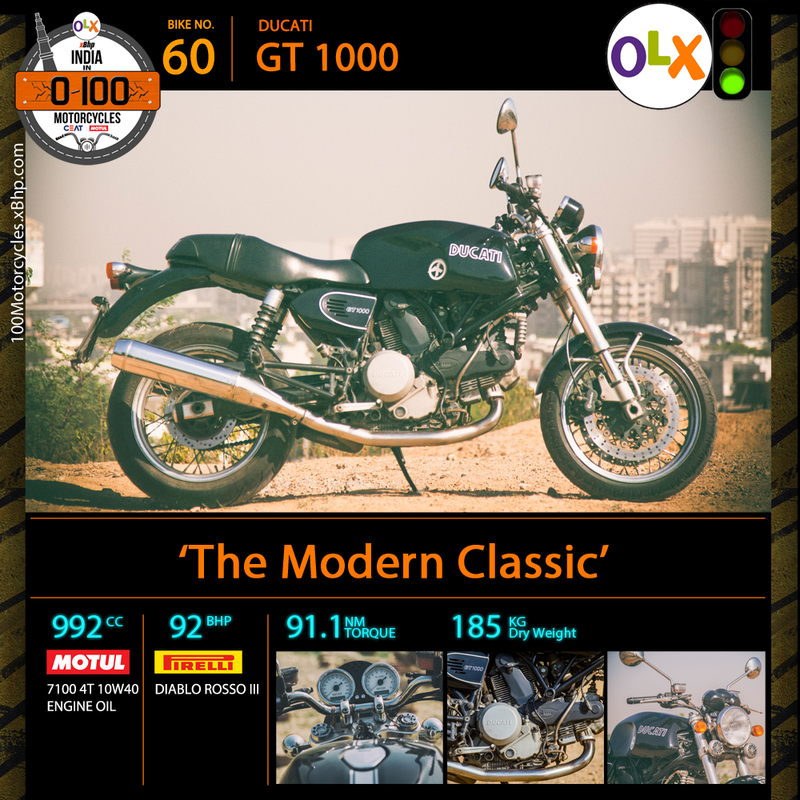 Visually, the most prominent elements of GT1000 are its 90-degree engine and the fuel tank. 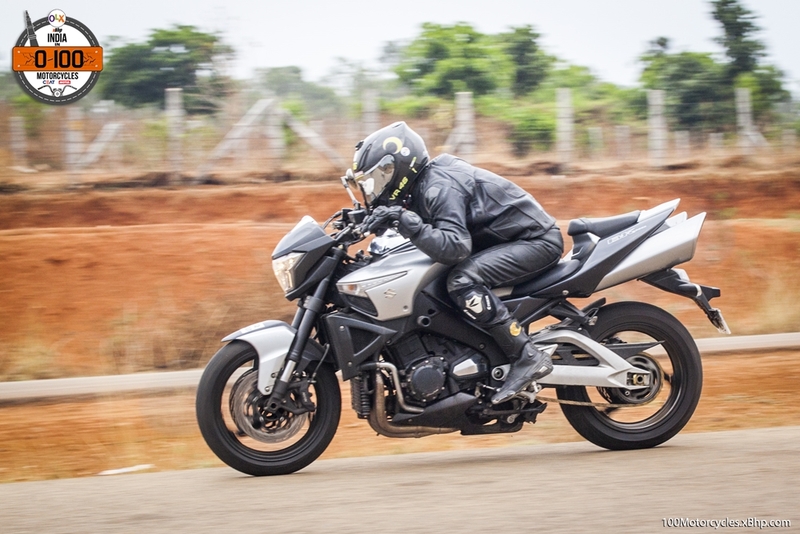 The competitive suspension and chassis turn it into a decent performance motorcycle overall. They help utilize all those 92 horses to the fullest. 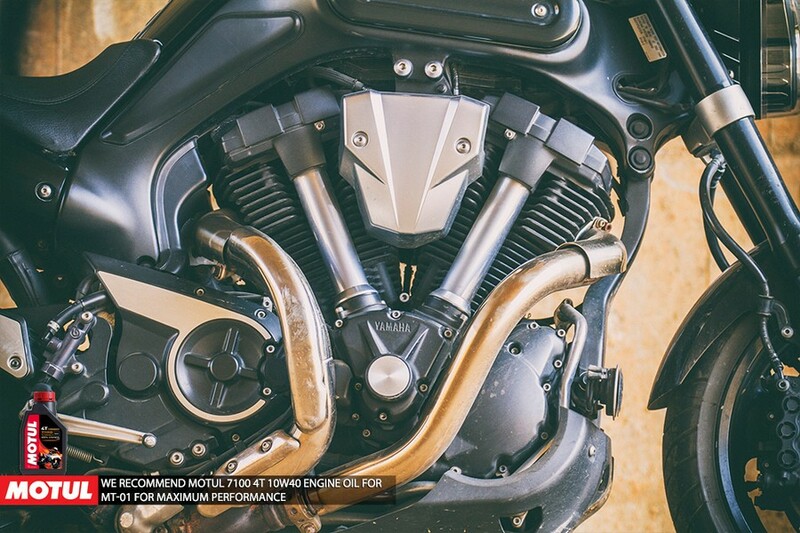 It’s plenty of power for all kinds of roads. 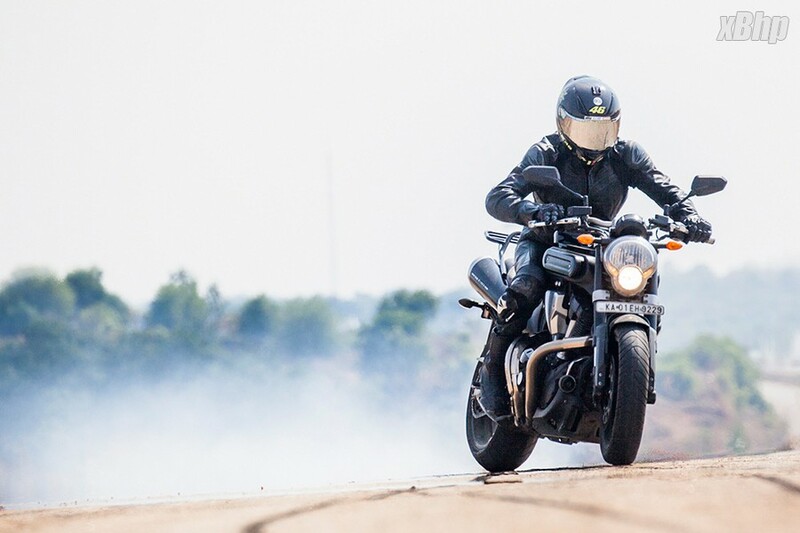 It’s more powerful than the entire Bonneville range from Triumph and looks more solid as well. 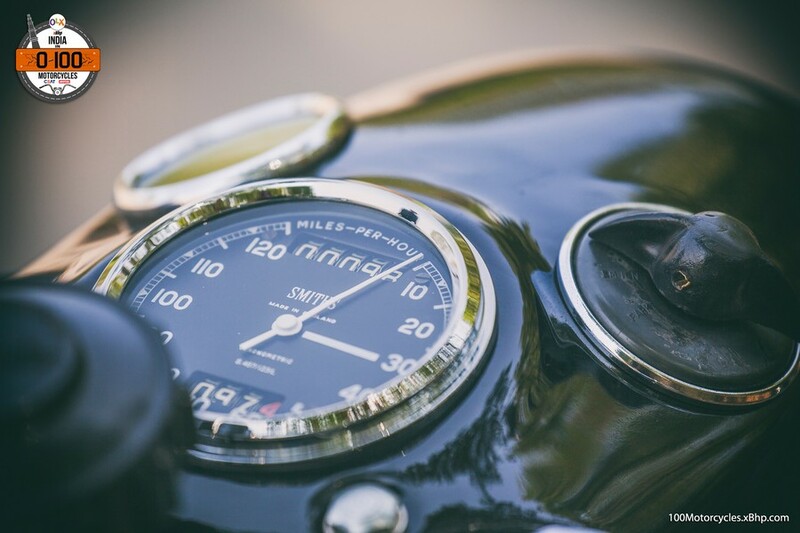 The GT1000’s representation as a performance-classic wasn’t a surprise – it was designed by Pierre Terblanche and based on MH900e motorcycle which was actually a replica of Mike Hailwood’s 1978 Isle of Man TT motorcycle. 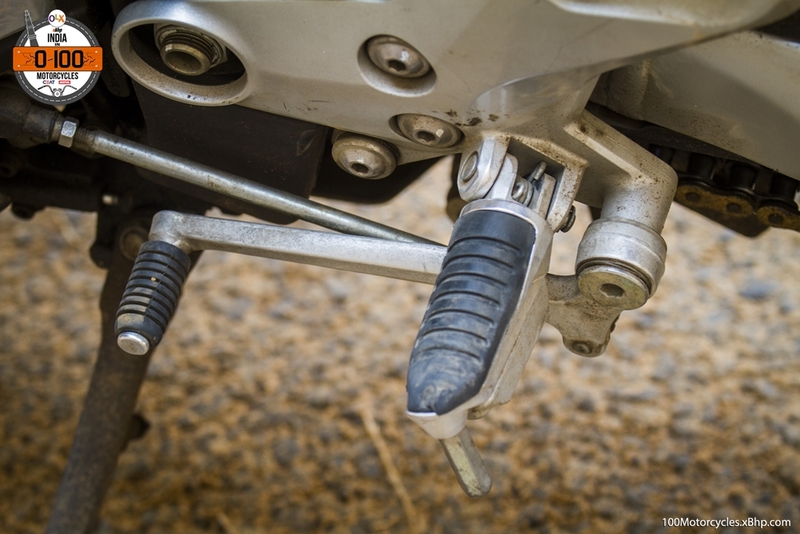 The foot-pegs are rear-set and the rider sits very slightly leaned forward to instil that sportiness. 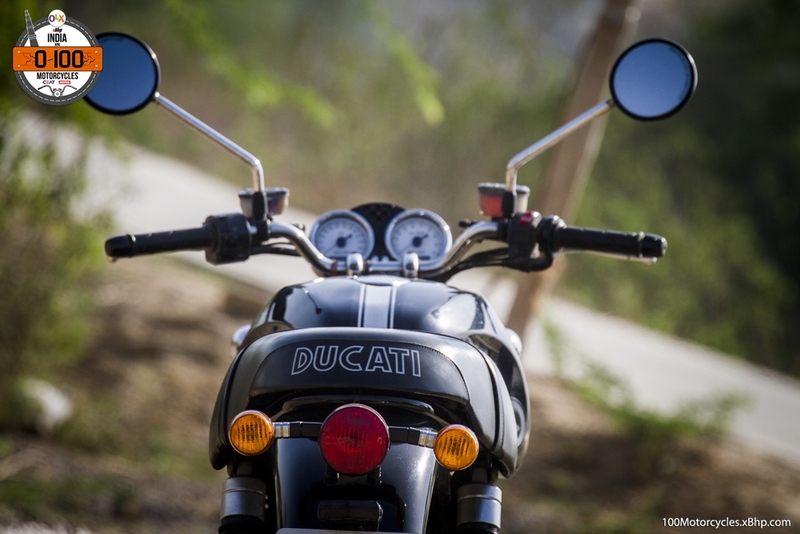 Ducati isn’t known to make motorcycles that do not handle well irrespective of what category it caters to. 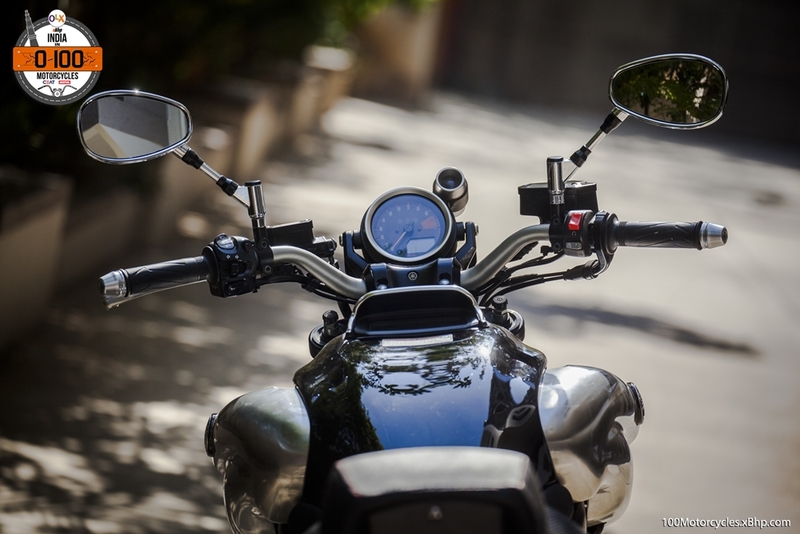 The GT1000 is one such example. 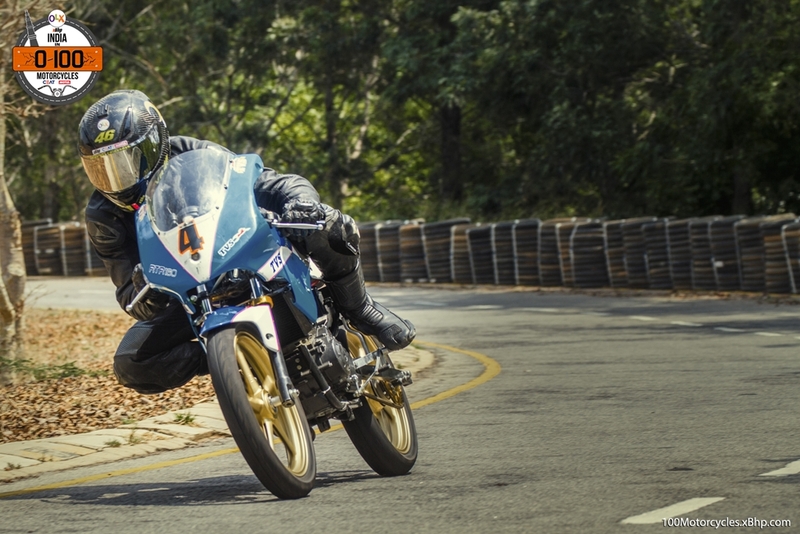 It’s a retro, a classic, but it is fun enough when there’s a series of corners ahead of you. 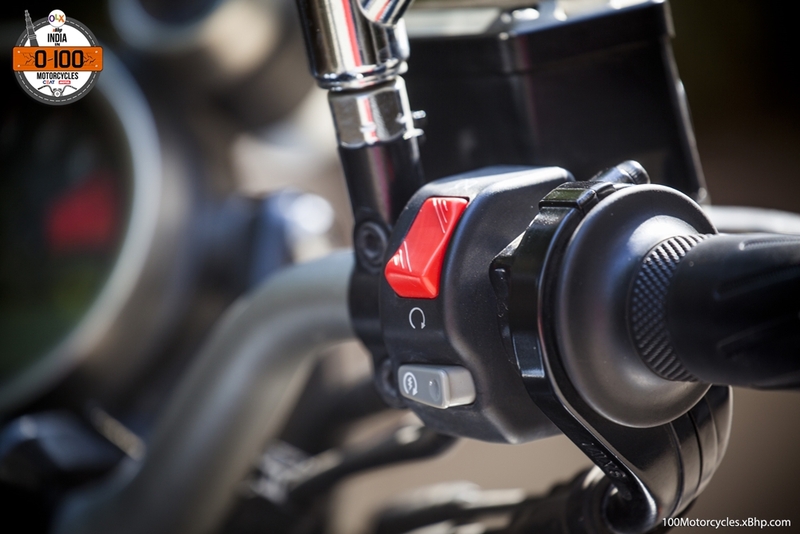 It would have been great if it was still made today and pitted against the latest generation of Triumph Bonneville’s – they are modern and come with rider modes and what not. 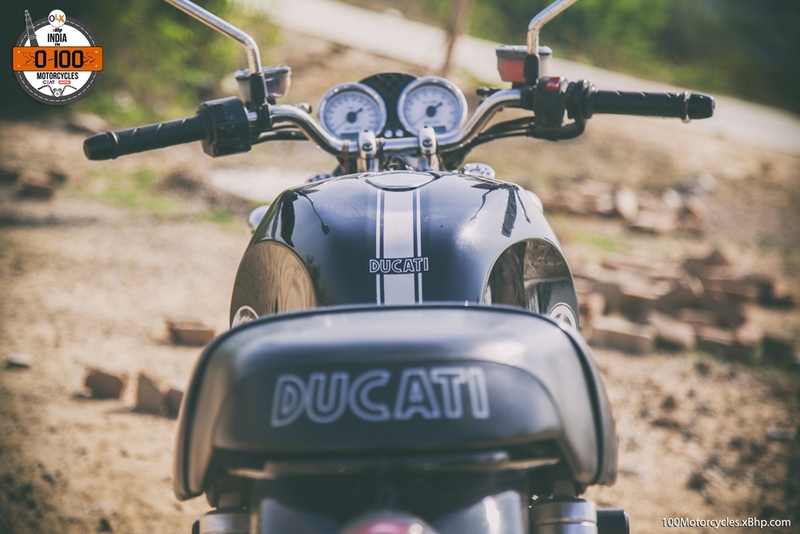 Definitely, there’s a pretty big market for these motorcycles around the world, and Ducati could have had a good pie out of it. Maybe they’ll make the GT again, and if they do, it will be interesting to see how they do it for the second time. 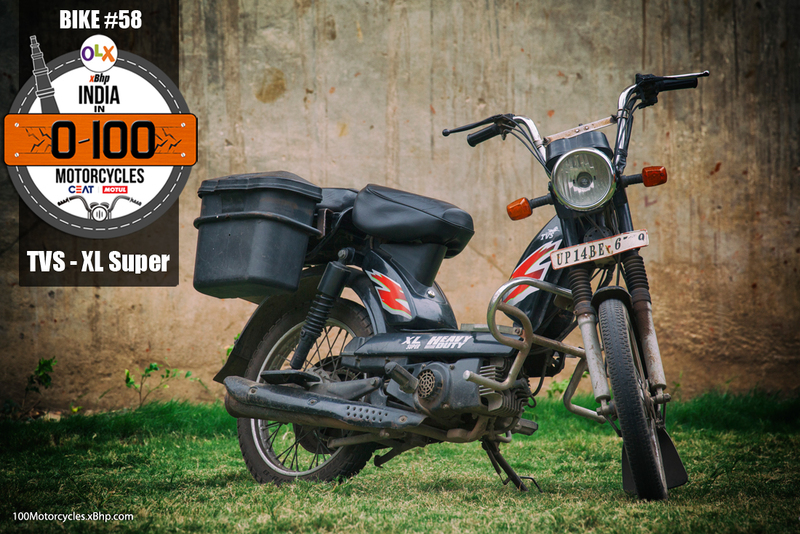 Buy a used Suzuki motorcycle from OLX. 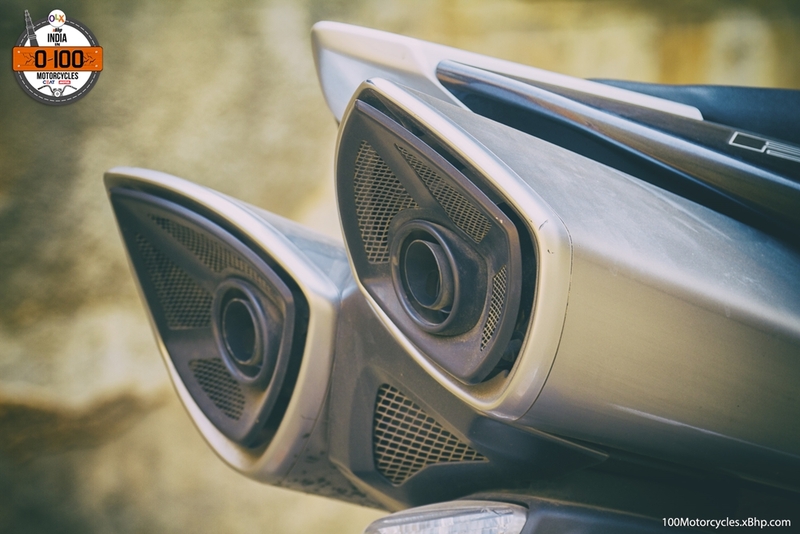 A pair of under seat exhausts that look like they’re going to shoot cannon balls. 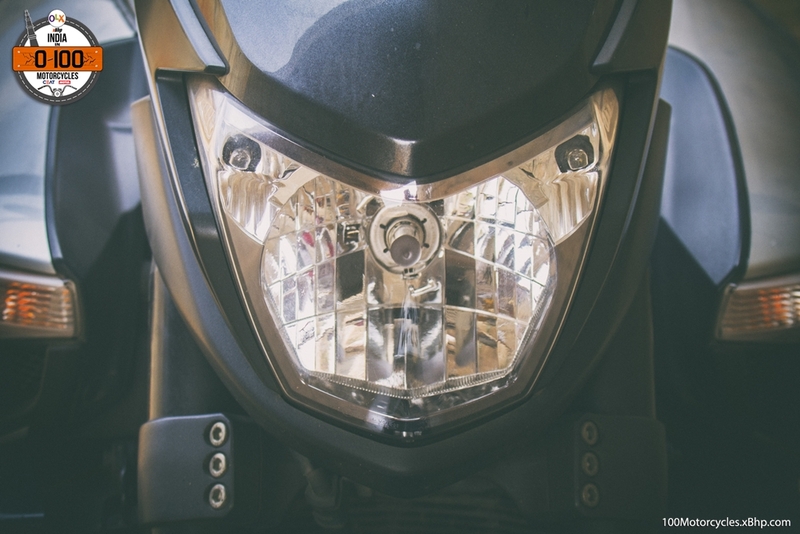 The front that appears as if it’s a robot transformed into a space-age motorcycle. 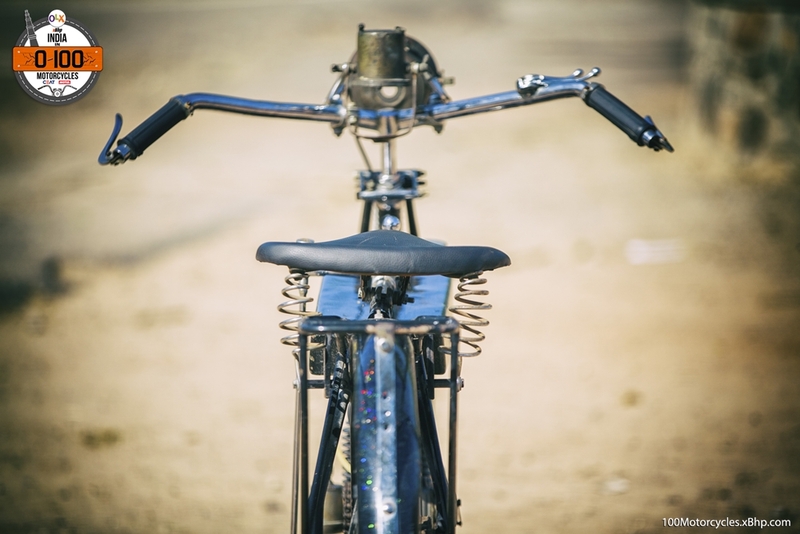 That’s the B-King for you, and it comes from the land that isn’t really known to make radical looking two-wheels – Japan. 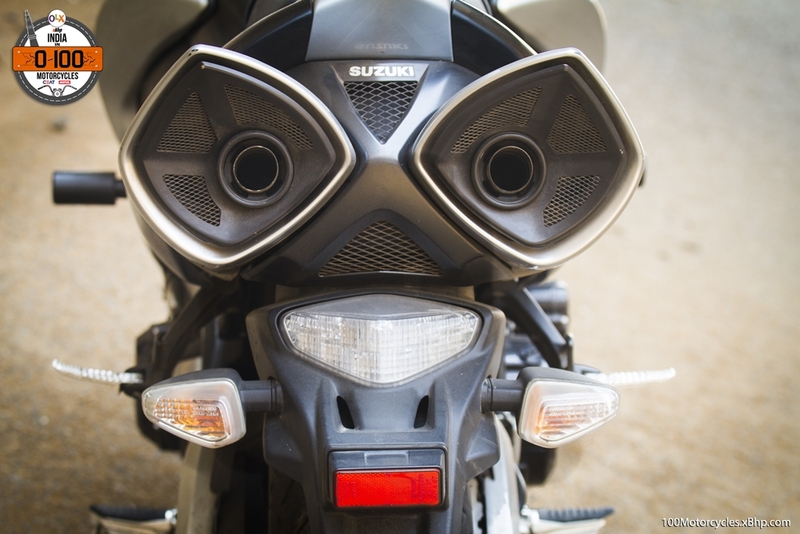 And it “was” made by Suzuki. Yes, because its production was put to end 4 years ago in 2012. Falling short on Cash? 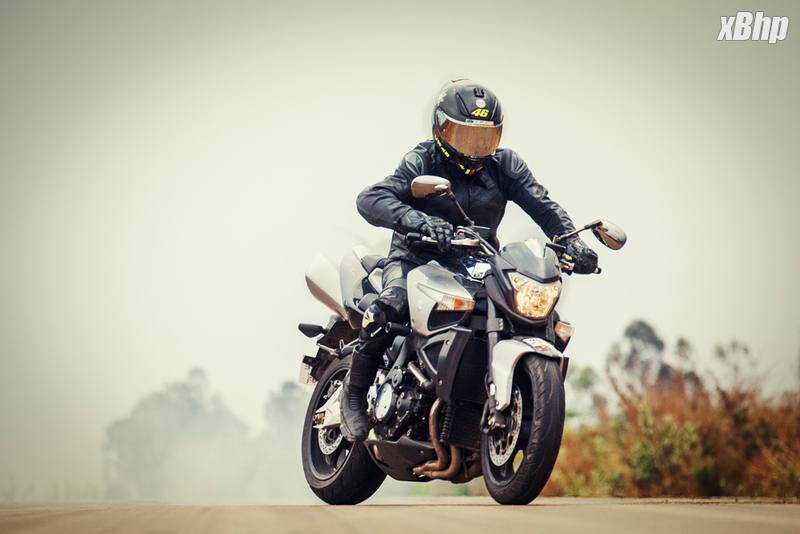 Find your favorite Suzuki motorcycle listed on OLX for sale and you might find an interesting deal that fits your Budget. 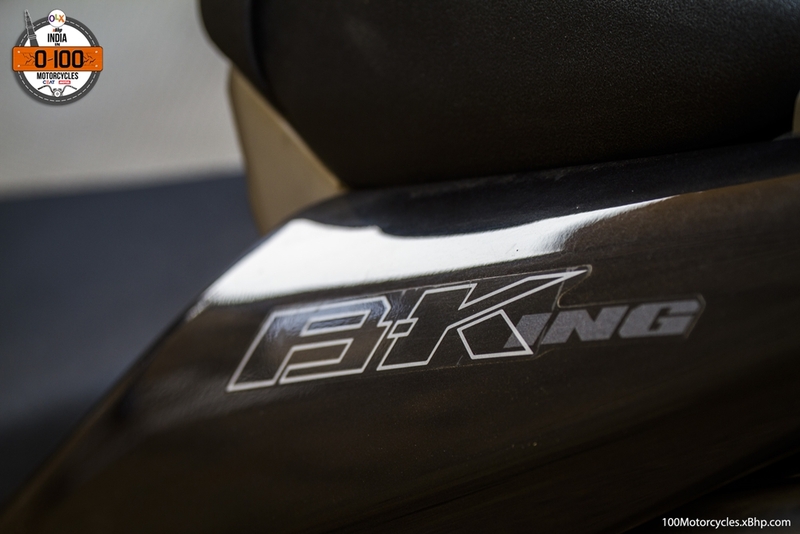 The B-King had a pretty short production run from 2007 till 2012. 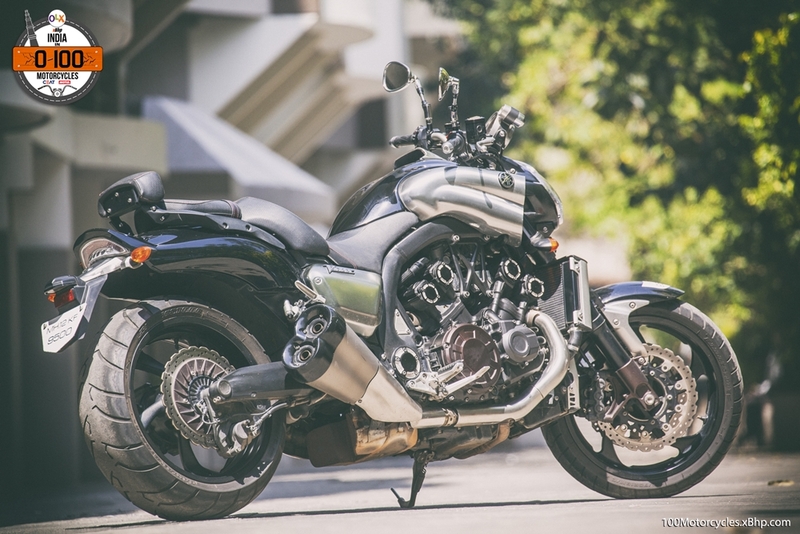 It was first shown as a concept, of course, at the Tokyo Motor Show way back in 2001 with a supercharged Hayabusa engine. 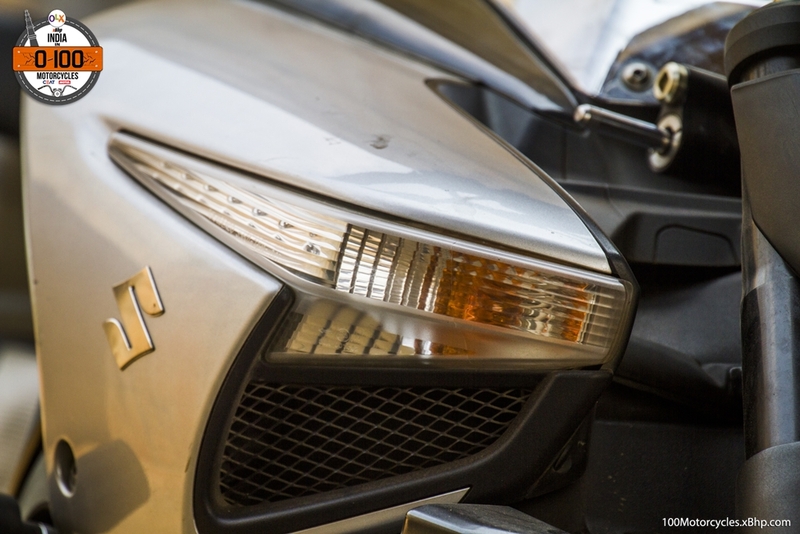 It took Suzuki nearly 7 years to turn it into reality, but the motorcycle that rolled out of the factory floor looked almost like the concept that it was. 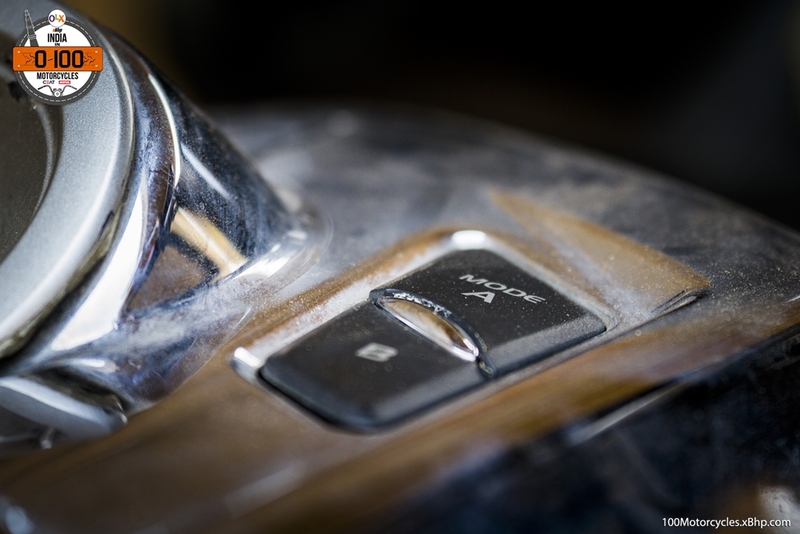 How many automotive concepts have seen the daylight? Not many. And the ones that have, differ quite clearly from how they were originally imagined. 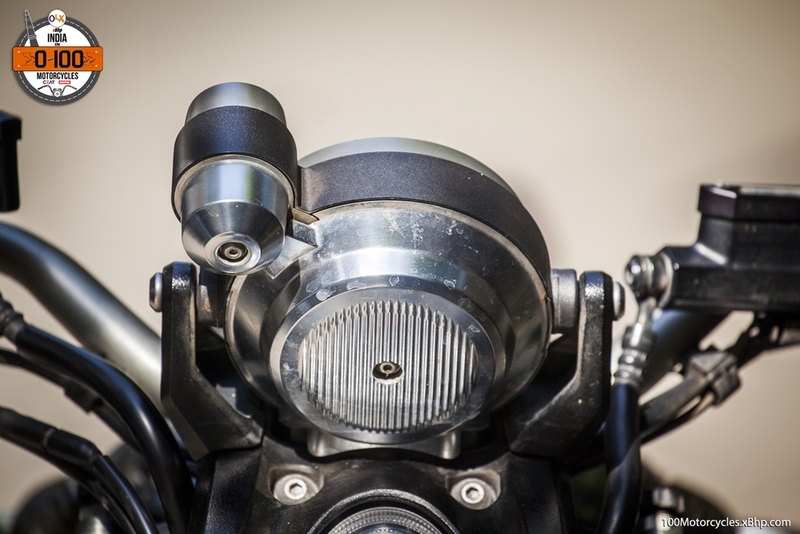 But there are few production motorcycles that are almost the carbon copy of their earliest designs. 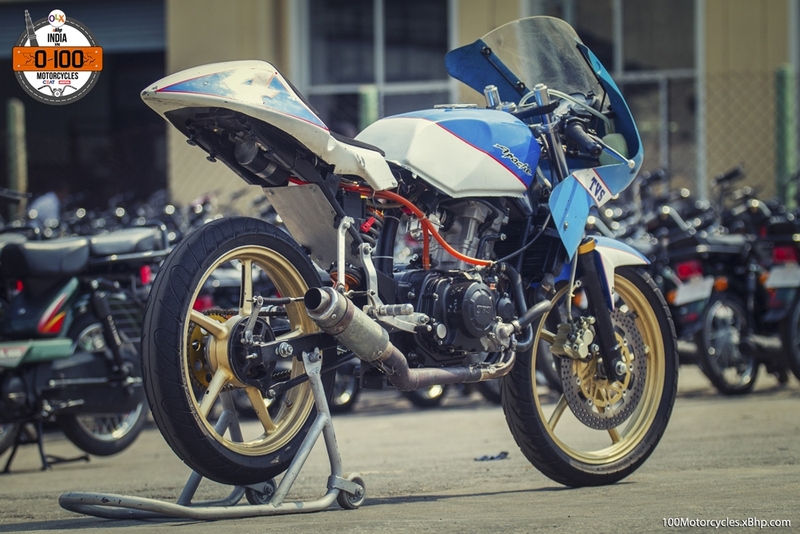 Two of the most popular are – Honda Rune and Suzuki B-King – we have found both for the 0 to 100 Motorcycles project. 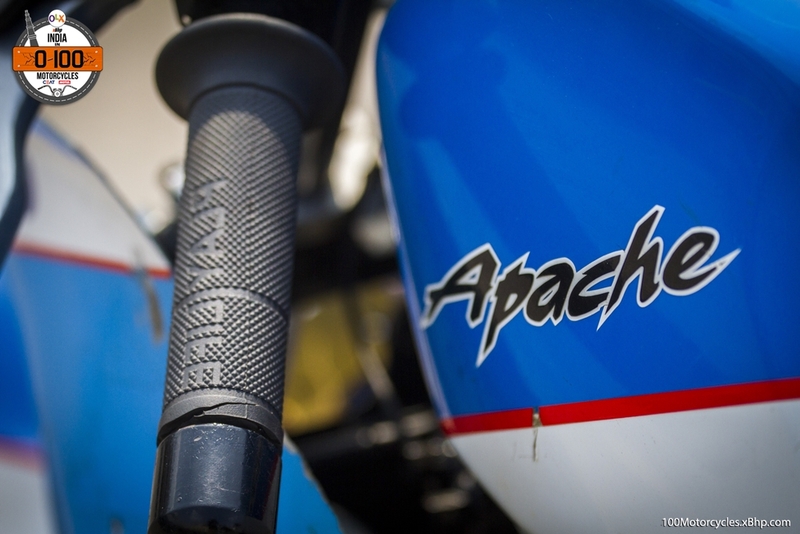 The Honda we have already covered, this time, it is the turn of the equally radical Streetfighter from Suzuki. 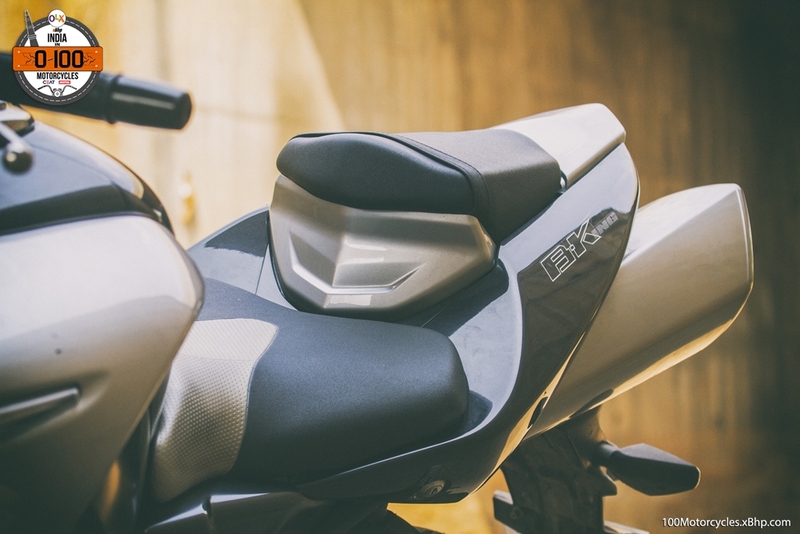 Looking at it from either side, the B-King has a pretty sharp tail section if it was not for those out-worldly exhausts. 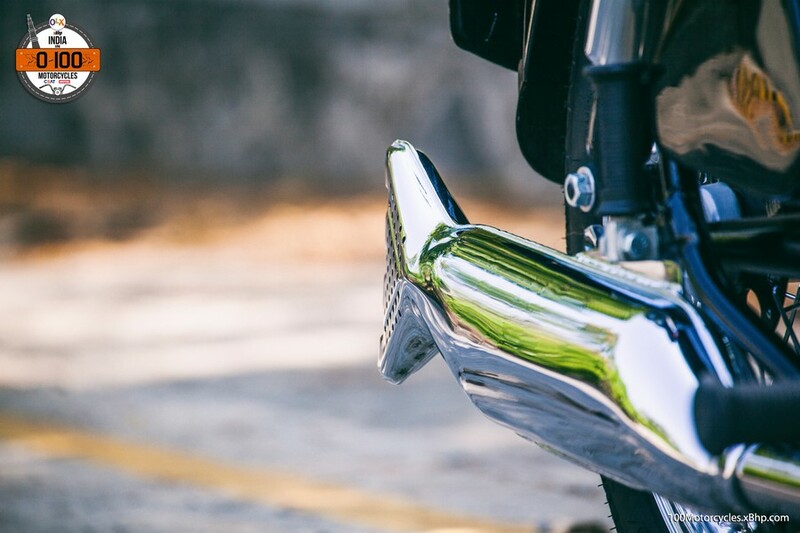 In fact, there are various B-Kings with aftermarket exhausts that are side mounted that invariably turn the motorcycle’s bulky design into sharp and aggressive. 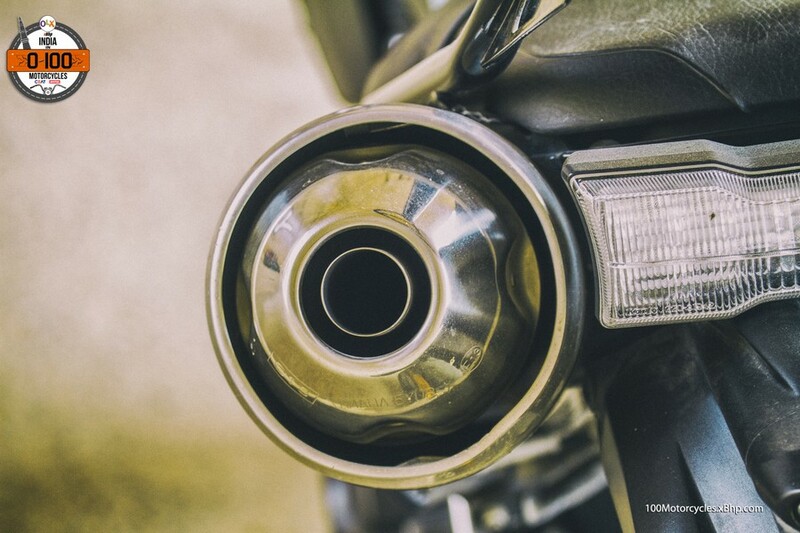 And no matter how robotic the whole front section of the B-King is, its most striking point visually remains that massive pair of under seat exhausts. 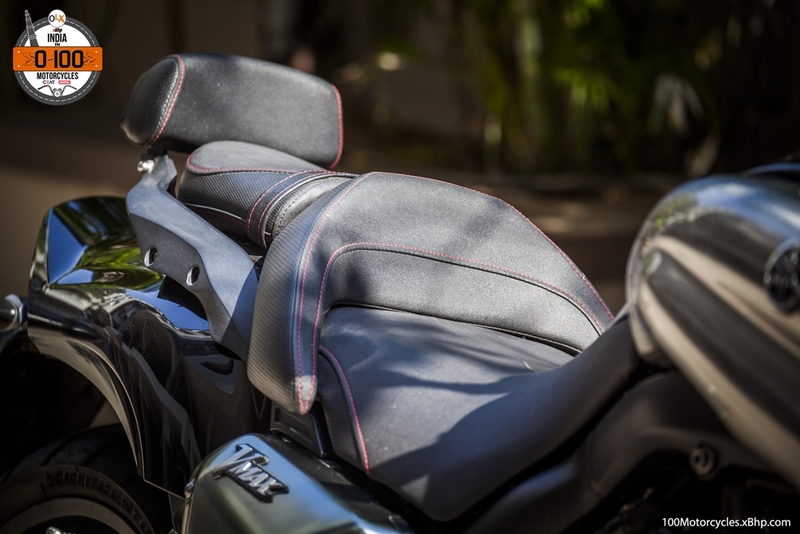 It renders the motorcycle almost pillion unfriendly in an instant! 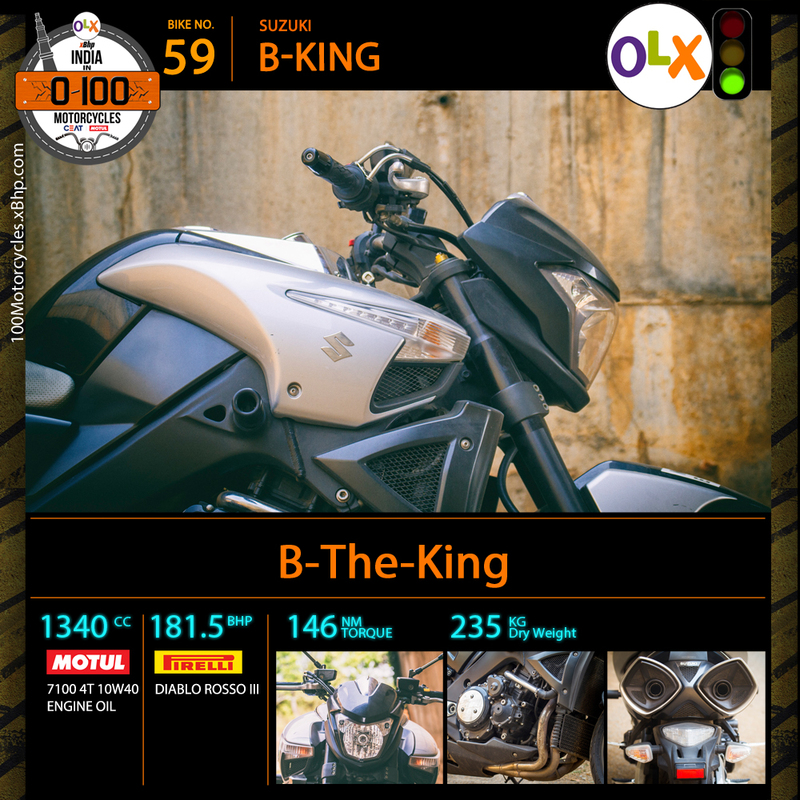 Aside from the bulbous bodywork which scales the bike at 235 kg, the B-King is surprisingly easy and light to handle. 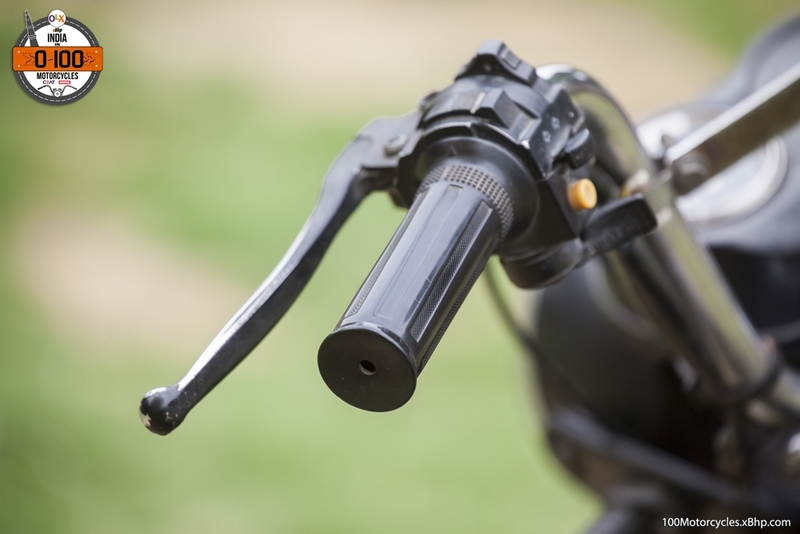 Japanese are not known to make motorcycles that do not function well! 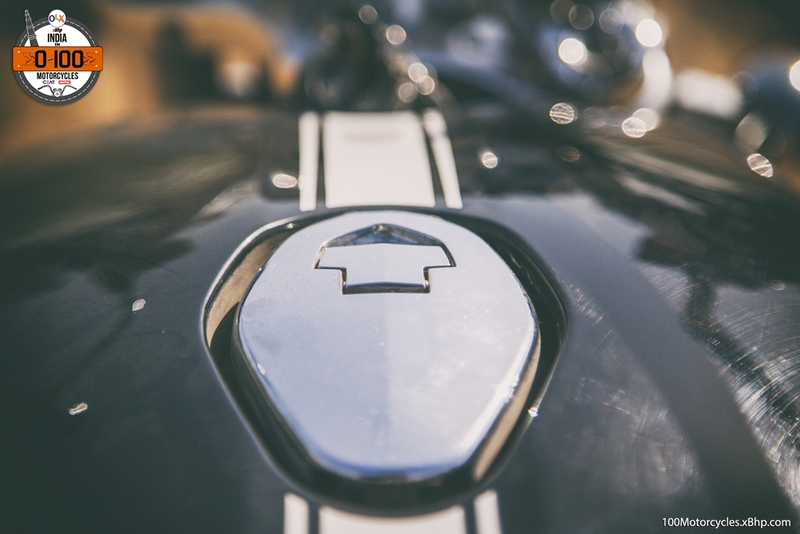 While there’s hardly any similarity in design between the B-King and the one it is derived from, Hayabusa, they both have two key things in common. 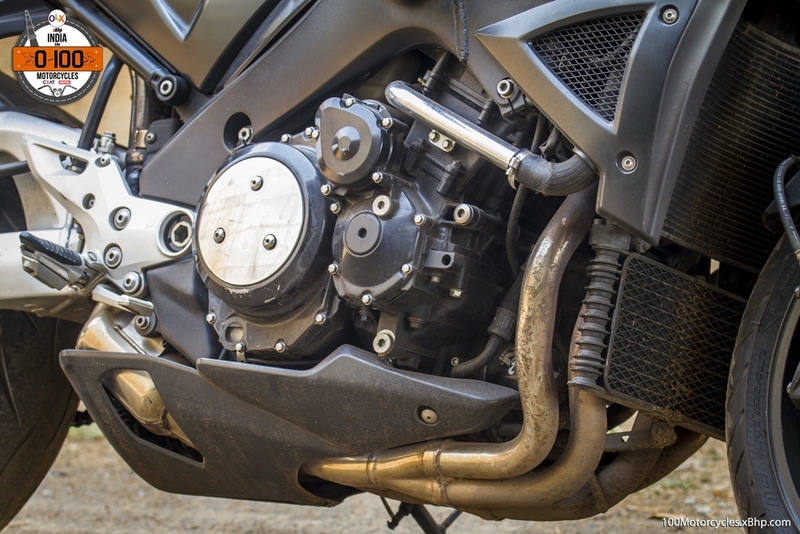 The engine – the naked Busa, if we can call that, sports the same ultrafast 1,340cc inline liquid cooled engine which produces around 183 PS of power at 9,500 RPM and a cruiser-shaming torque of 146 NM at 7,200 RPM. 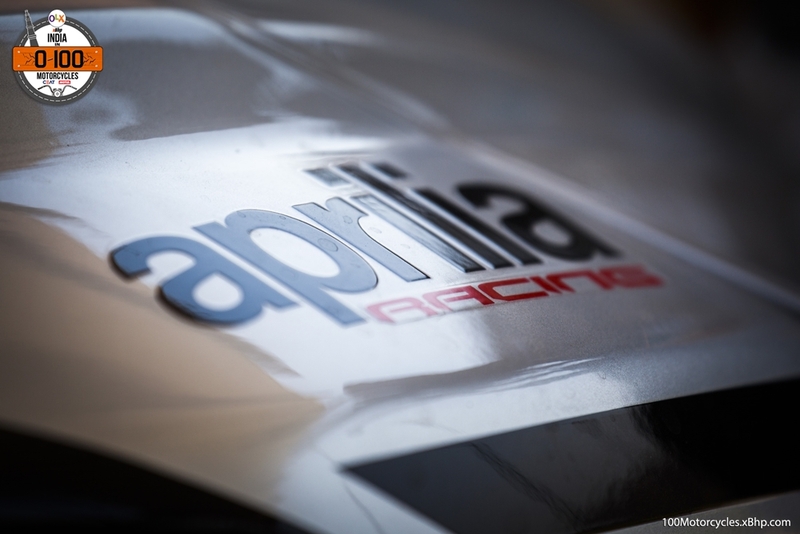 It’s fast, naturally, but it has been robbed off that record-breaking top end of its full-faired cousin. Obviously, it didn’t have the supercharger like it had as a concept. And being a naked, it doesn’t have to be that fast either. 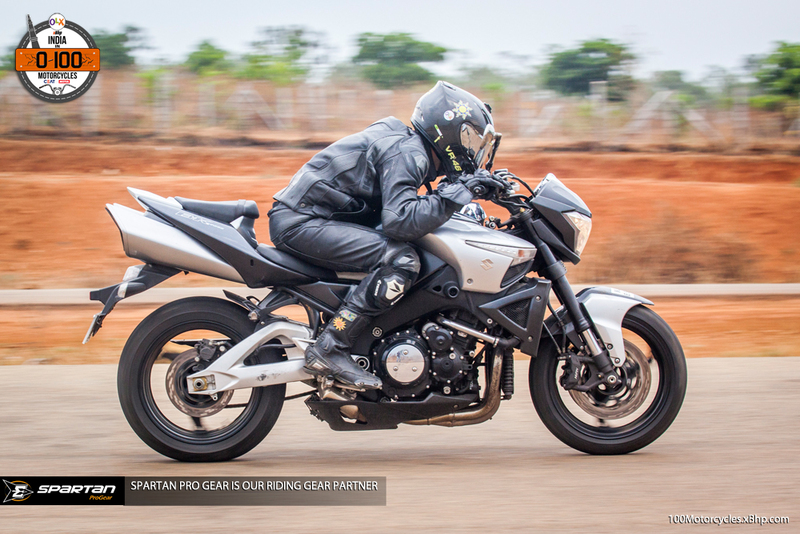 Second, it has controversial looks just like the Hayabusa. 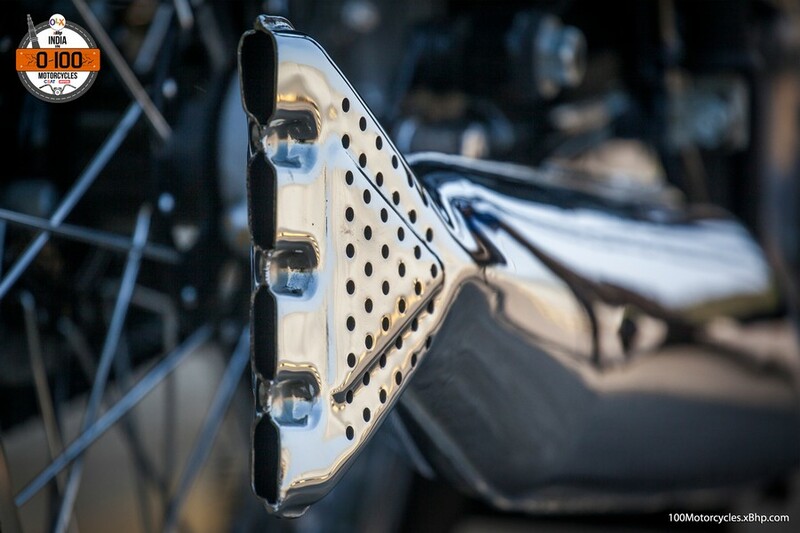 There’s no in-the-middle-thought with the B-King when you look at one, you will like it or you won’t! It didn’t come with ABS as standard, but it could be had as an option. 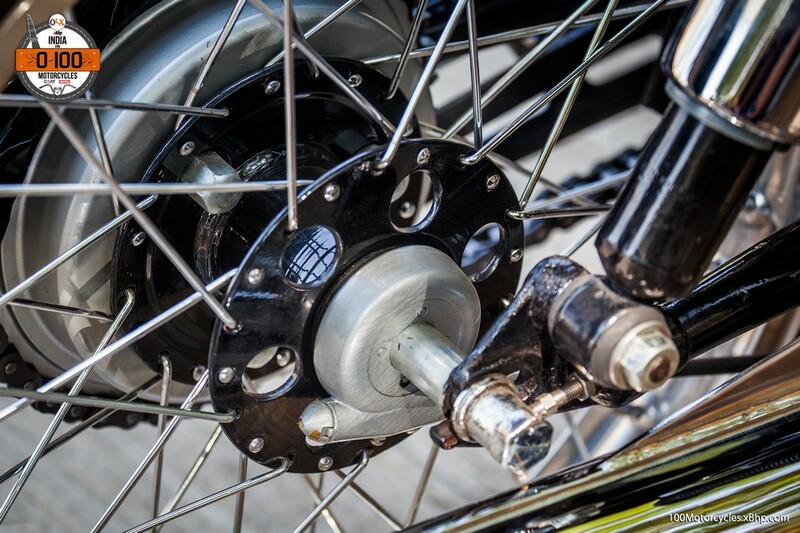 However, the Nissin equipped brakes were highly regarded for their performance. 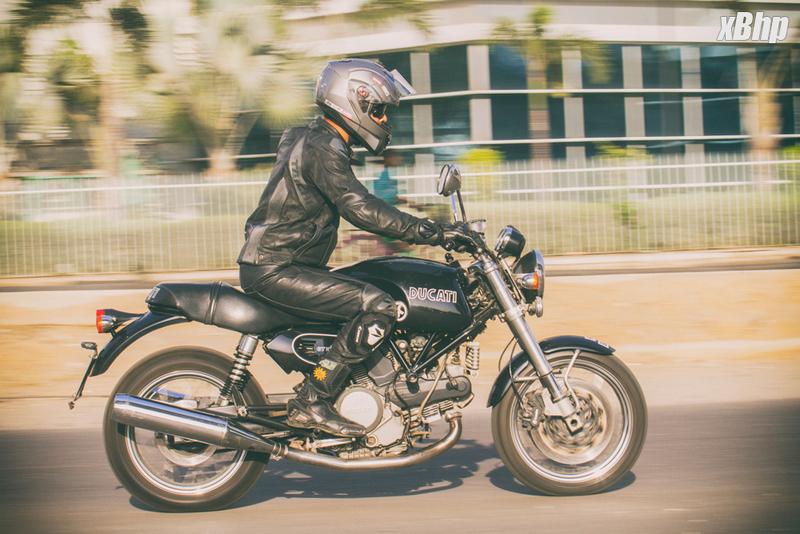 The aluminium frame made the motorcycle remarkably easy to manoeuvre in traffic and it was quite fantastic in corners as well. 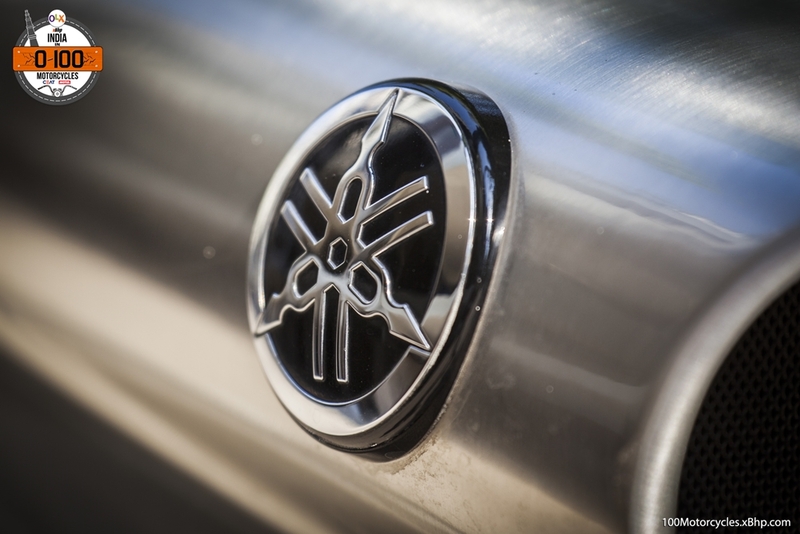 In the last 15-20 years, we have some category-defying streetfighters from Japan. 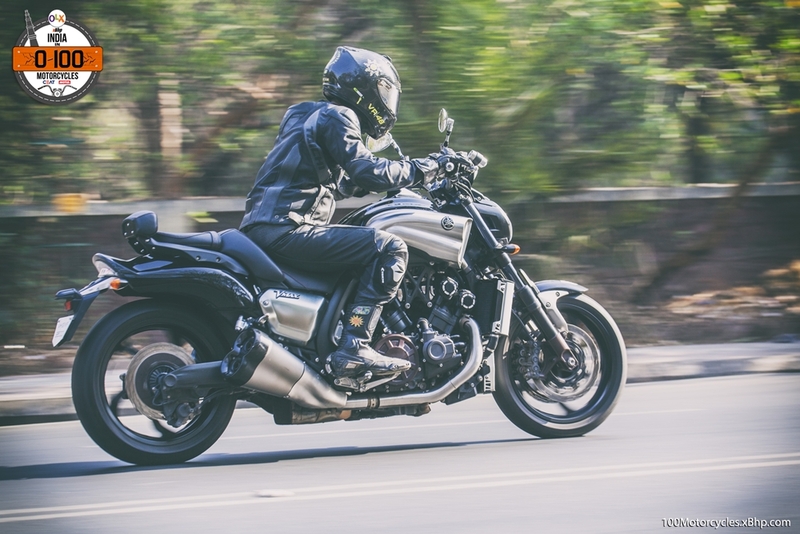 Honda made the naked version of their Superblackbird and called it the X11. 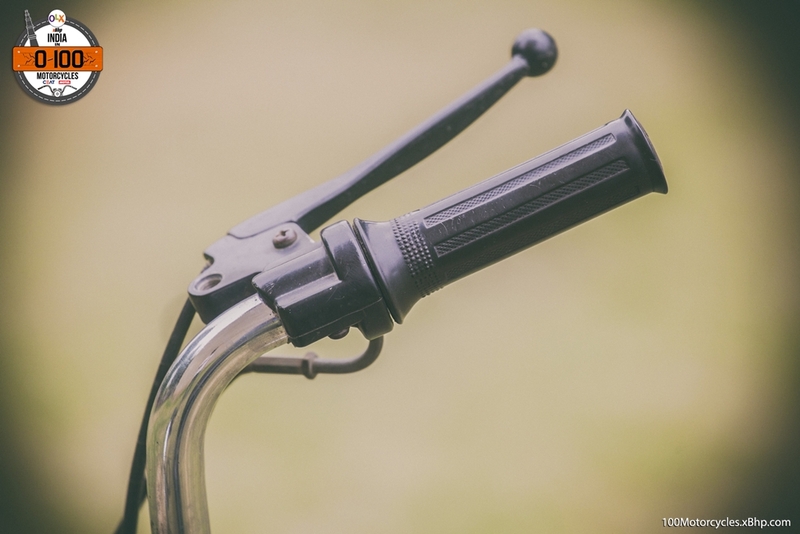 It was big and bulky, although, not nearly as radical looking as the B-King. It was made from 1999 to only 2001. 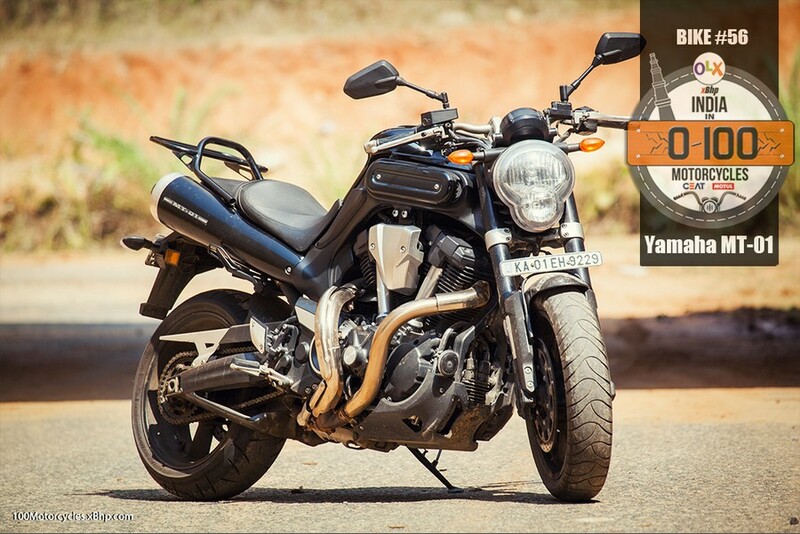 Then, we have had the extremely popular Yamaha MT-01 which was also made from 2005 to 2012. 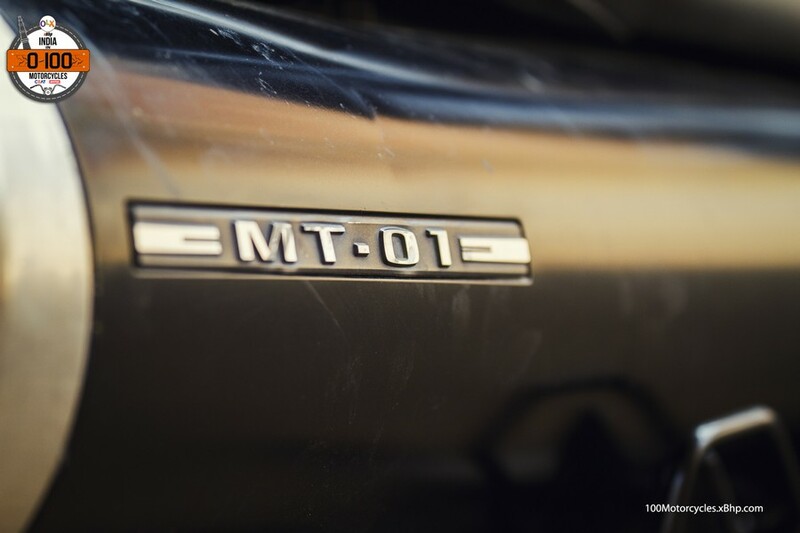 And even today, it is considered the most impactful MT ever by many of its fans. 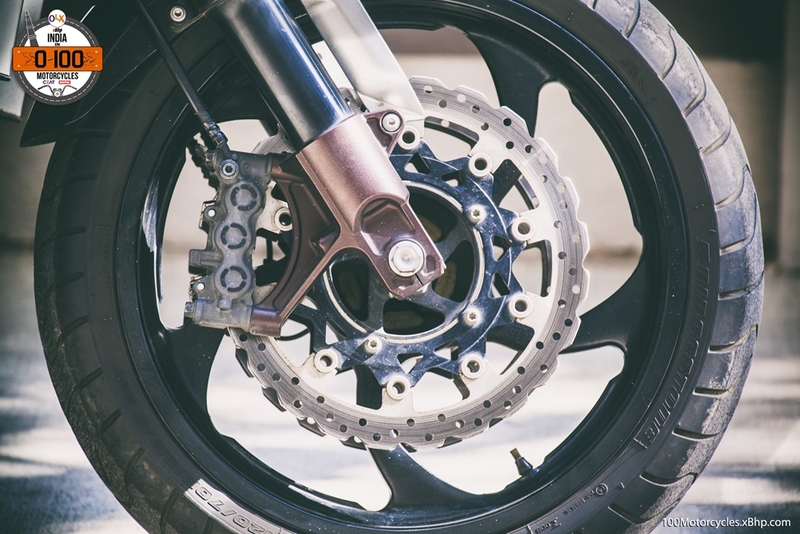 All these three motorcycles – X11, MT-01 and the B-King – had limited production run, but they were fairly successful especially the Yamaha and the Suzuki. 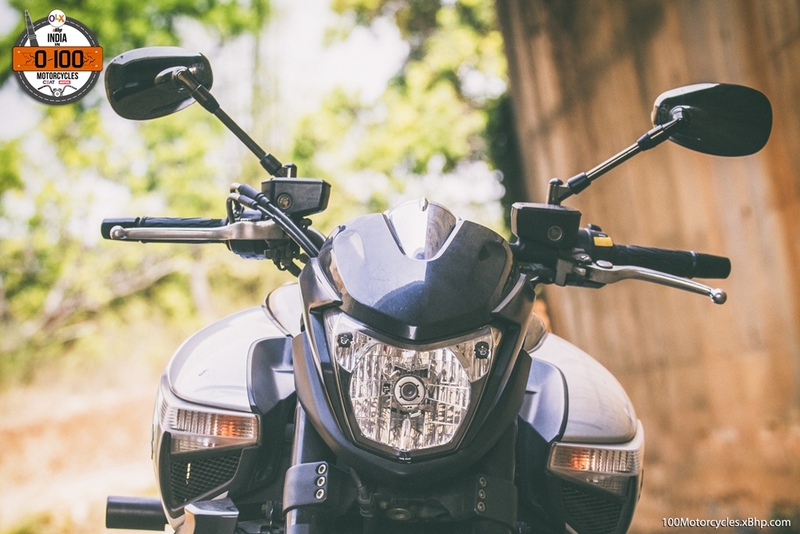 They may not be too practical due to their size, but they have proved to be extremely capable and rider friendly motorcycles contrary to how they are perceived. 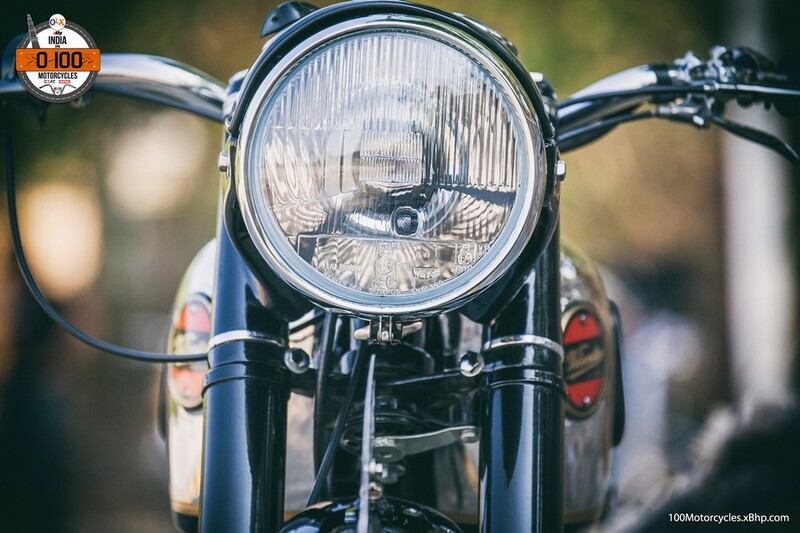 Maybe, there’s a place for such motorcycles. 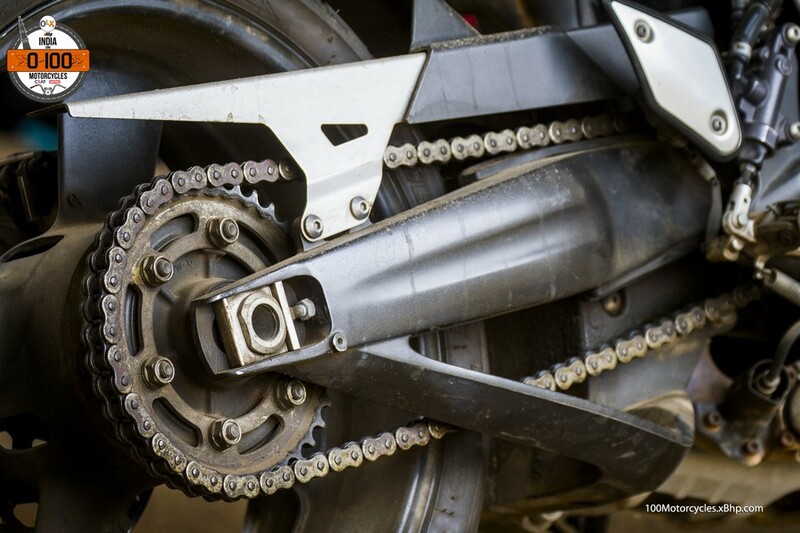 We would like to believe that if there’s a place for big and heavy adventure-touring motorcycles like the BMW R 1200 GS, motorcycles like the B-King could enjoy some space in the industry as well. 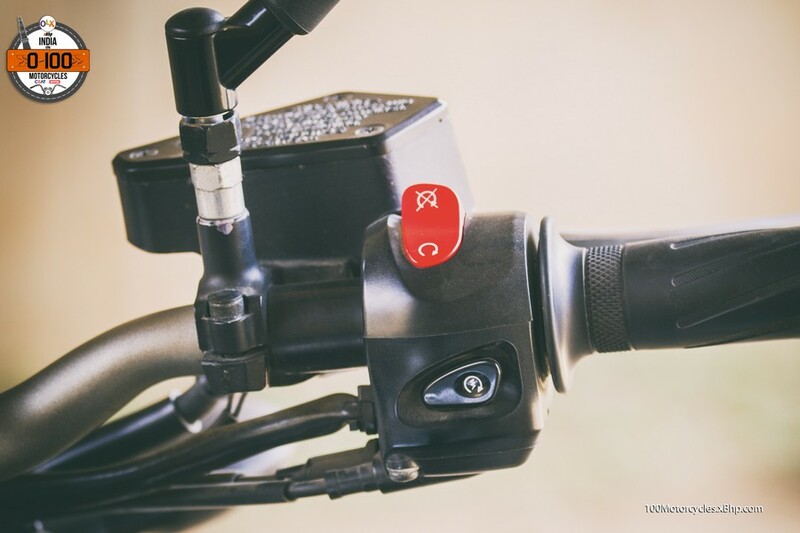 But if you want one today, you’ll have to look for a second-hand B-King and OLX might come in handy in this situation. Give it a try! 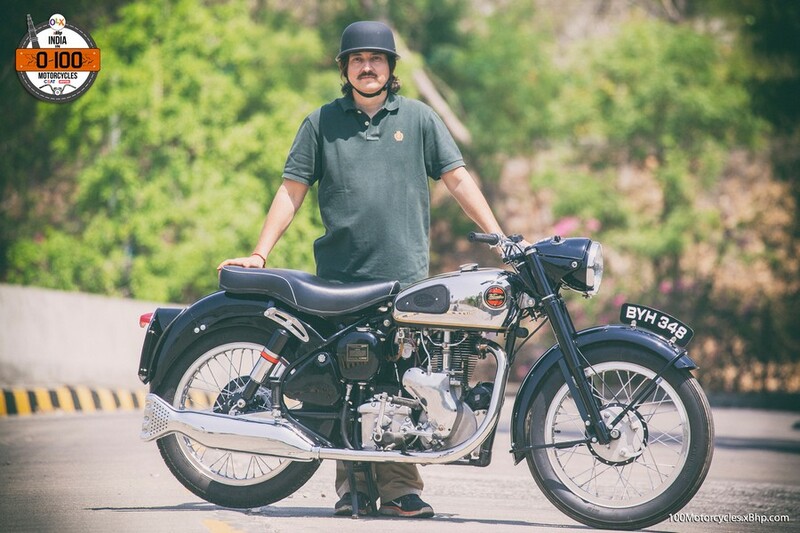 We would also like to thank Joe’s Garage for letting us spend some unforgettable time with this very special motorcycle. 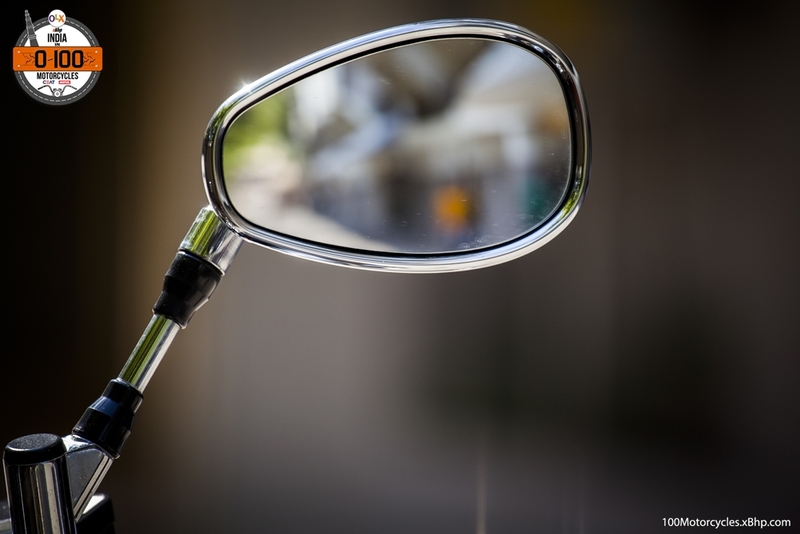 It’s that situation when certain things you’ve done in the past come rushing back to you. 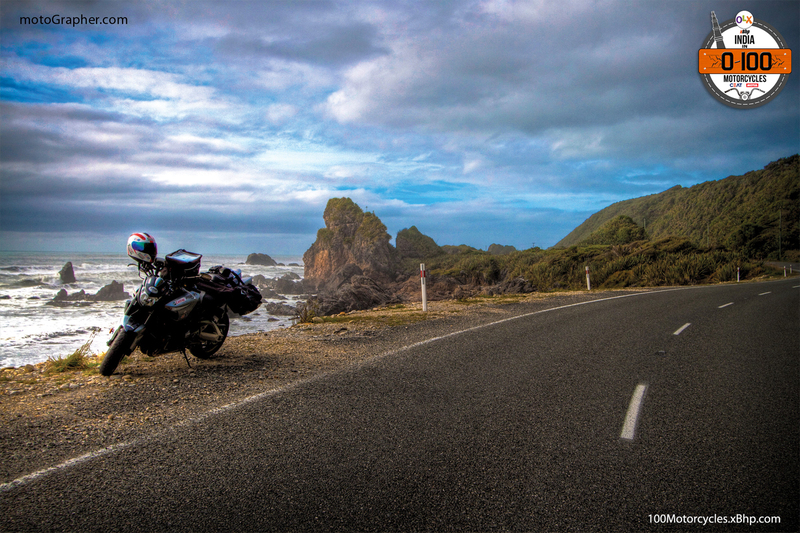 Back in 2008, we rode the Suzuki B-King around possibly the most beautiful country in the world, New Zealand, for 8000 kilometers! 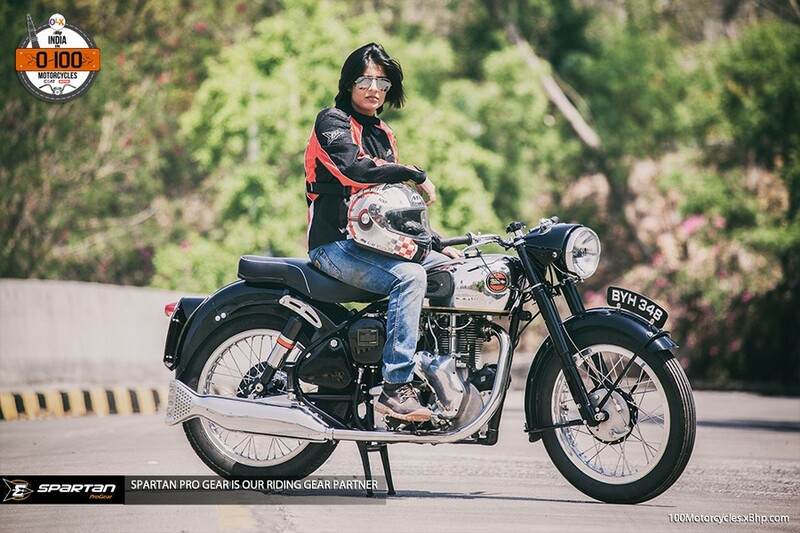 Here are few pictures from that ride. 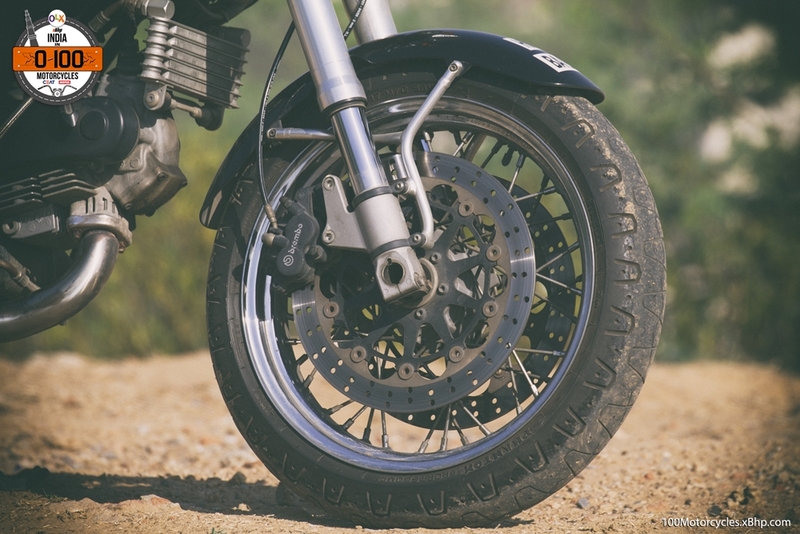 Recommended Tyres for more safety and grip! 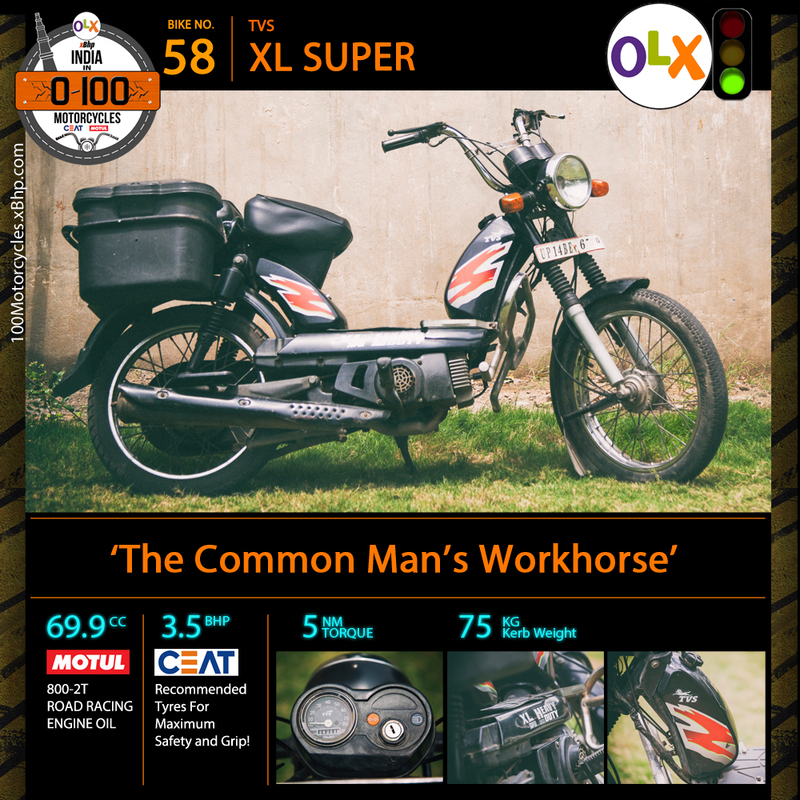 Buy a used TVS XL Super from OLX. 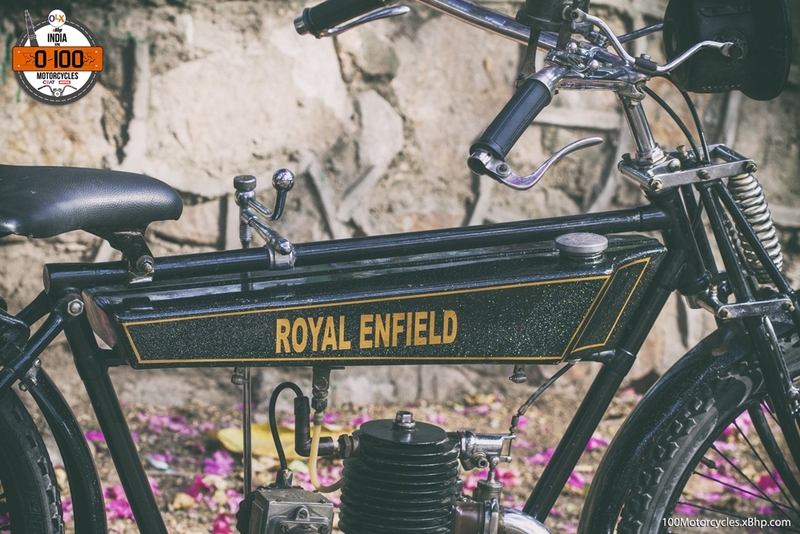 The likes of Royal Enfield and Jawa brought motorcycles into India as mainstream two-wheelers. 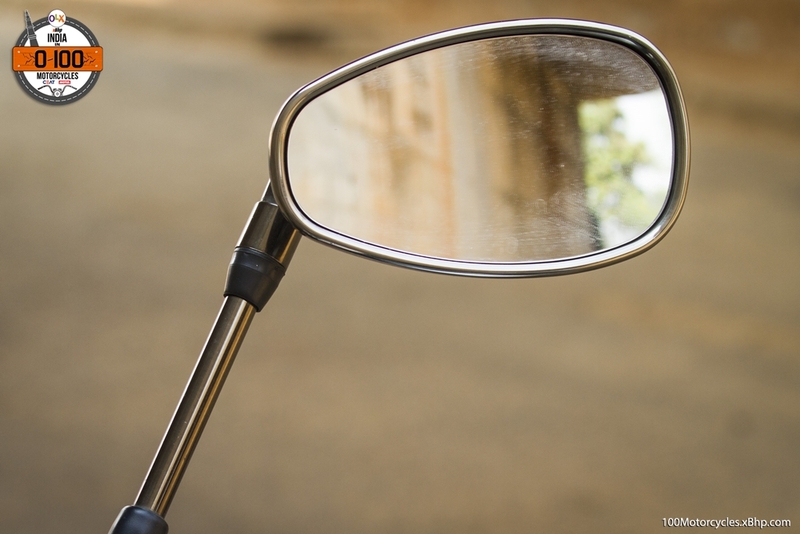 Hero, Bajaj and TVS began their motorcycle journey much-much later. 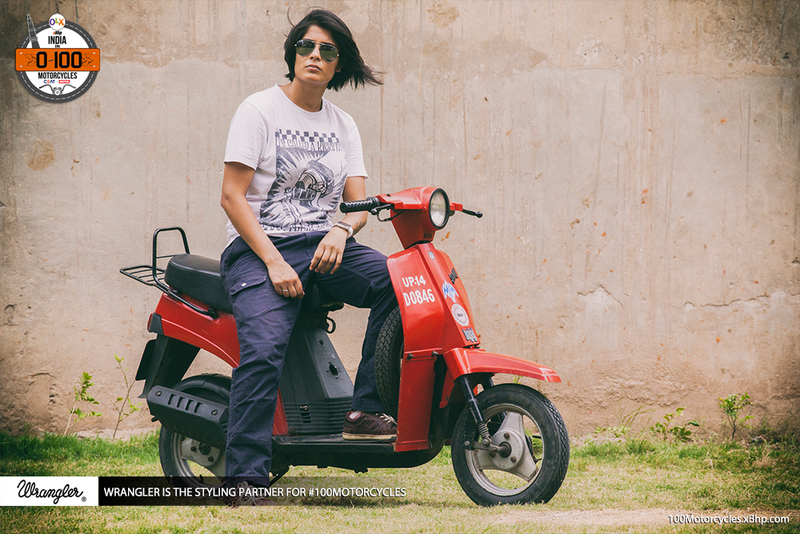 While Vespa and Lambretta brought scooters into our market before Bajaj got inspired. Think about it. 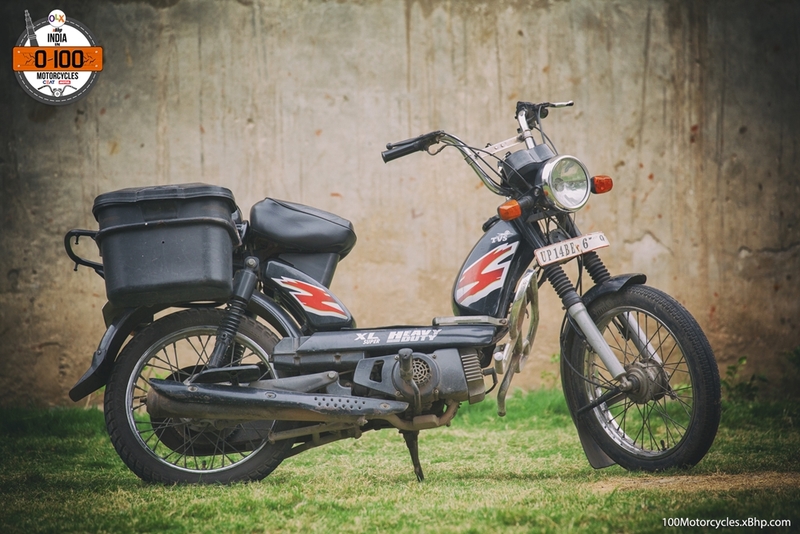 Moped, even though a global concept, was brought as one of the mainstream vehicles in the country by TVS, an Indian two-wheeler manufacturer. 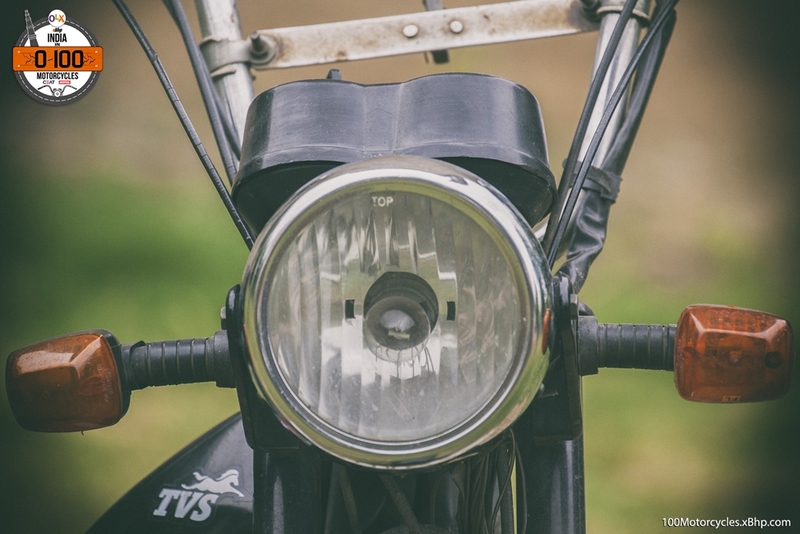 In fact, TVS started their two-wheeled journey through a 50cc 2-stroke Moped which they first made in 1980. 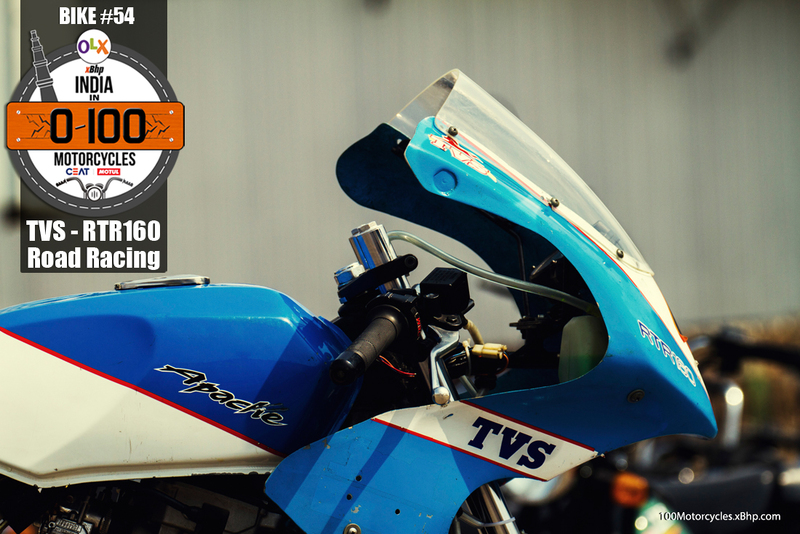 In 1983, TVS became the first Indian company to enter professional motorcycle racing at the domestic level with none other than the TVS XL 50 moped which was tuned to deliver a top speed of 105 kilometres per hour! 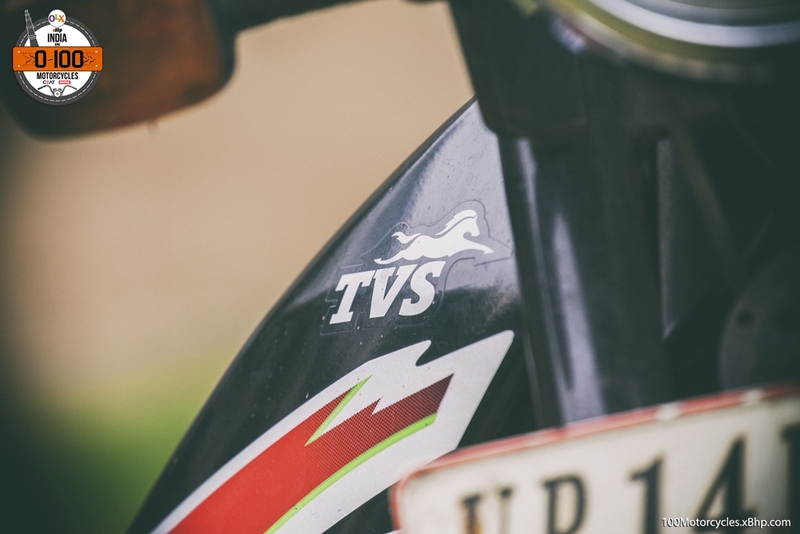 Since then, TVS hasn’t stopped doing two things – doing races and making mopeds. 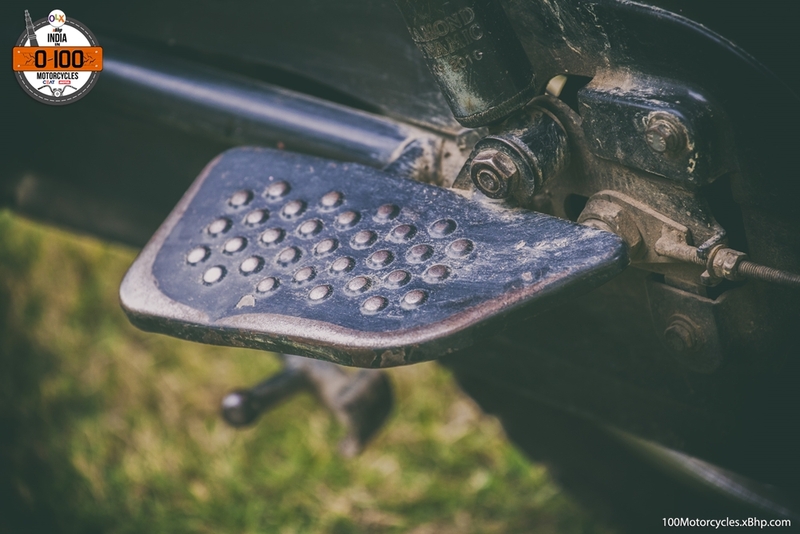 A word derived from ‘motorcycle’ and ‘pedal’, moped is the name usually given to a small motorcycle which is also run through pedals – just like a bicycle. 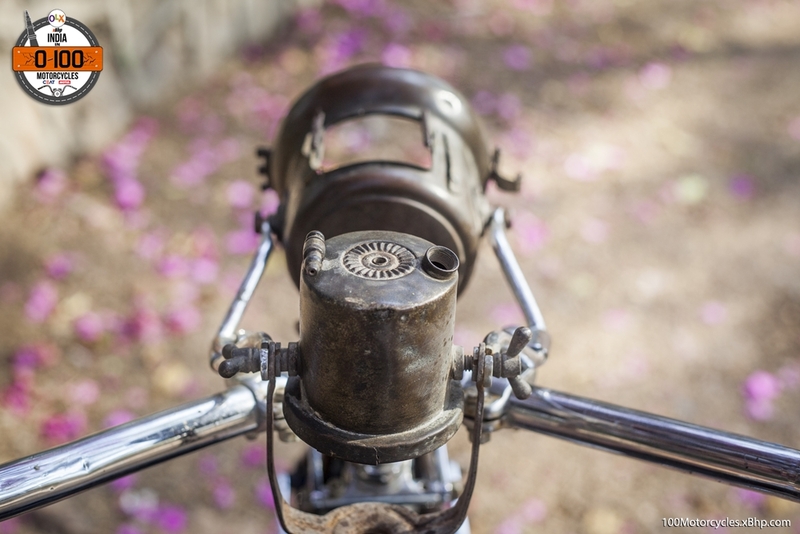 Many or most earlier mopeds came with pedals as well. We remember that, don’t we! And it was fun riding them that way. 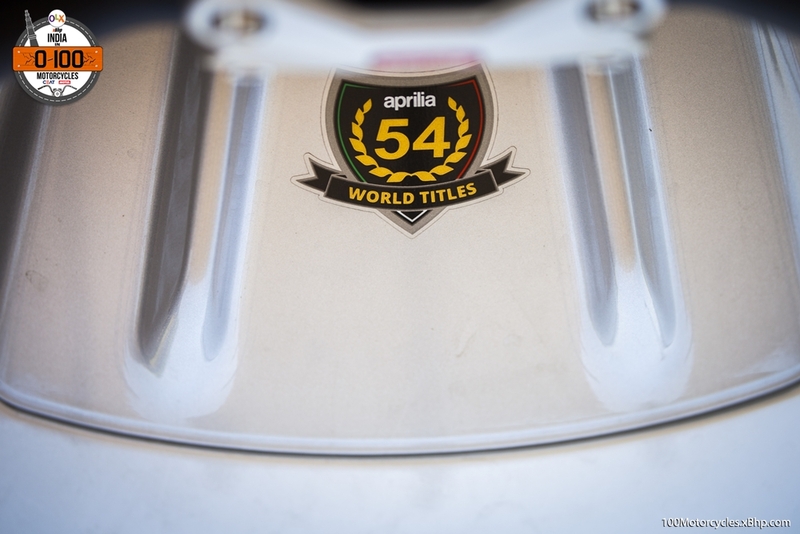 You can’t say much about its physical presence, can you? 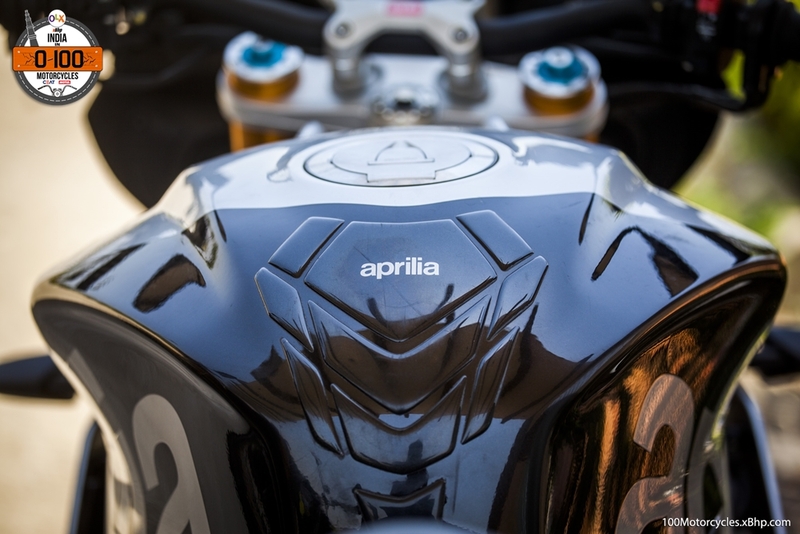 There’s no brawn, it’s hardly intimidating in any imaginable way and, not to sound too rude, it looks quite weak! 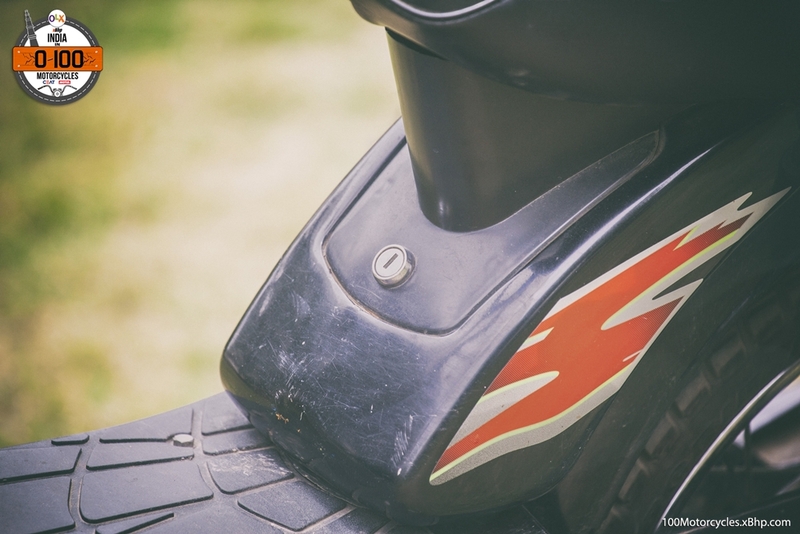 But what might seem like ripping the TVS moped apart, is actually just the beginning of some rightfully earned admiration. 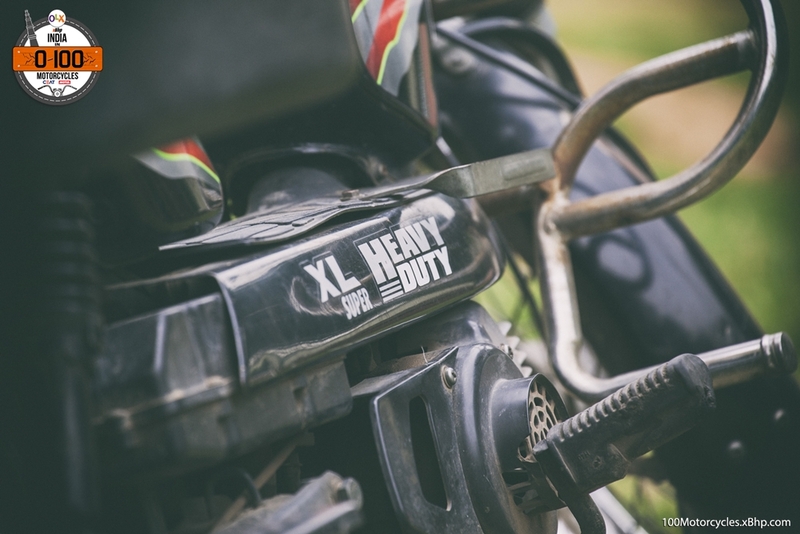 TVS XL is one of the best examples of a reliable vehicle ever made by an automobile manufacturer in India, whether domestic or international. 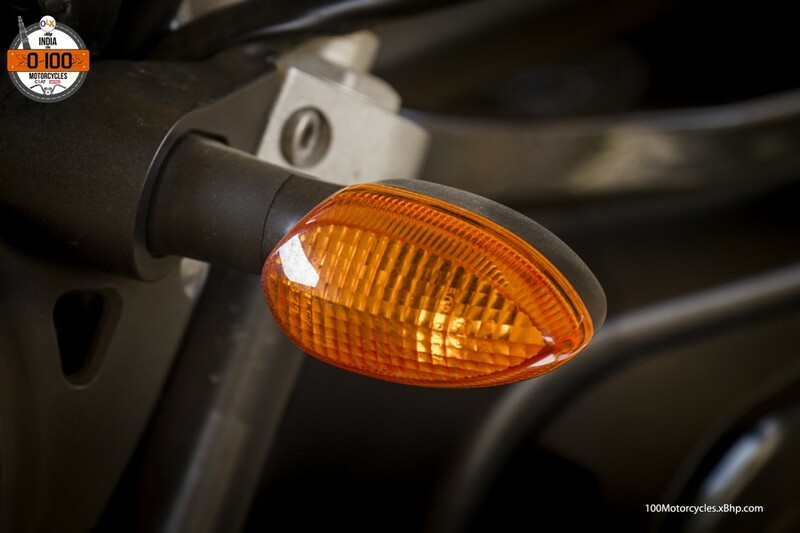 It is in continuous production since 1980, of course, improved regularly as per advances in technology. 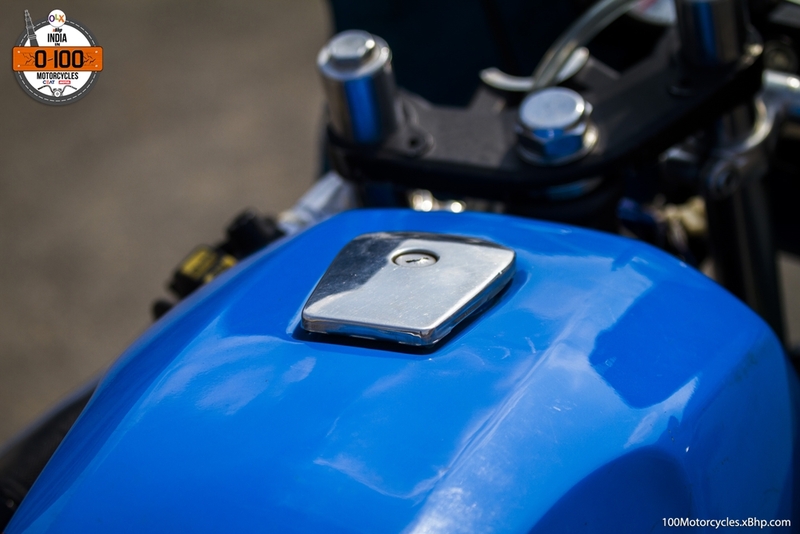 But this tells us what a huge success this small motorcycle has been. It has been accepted by people through the country. 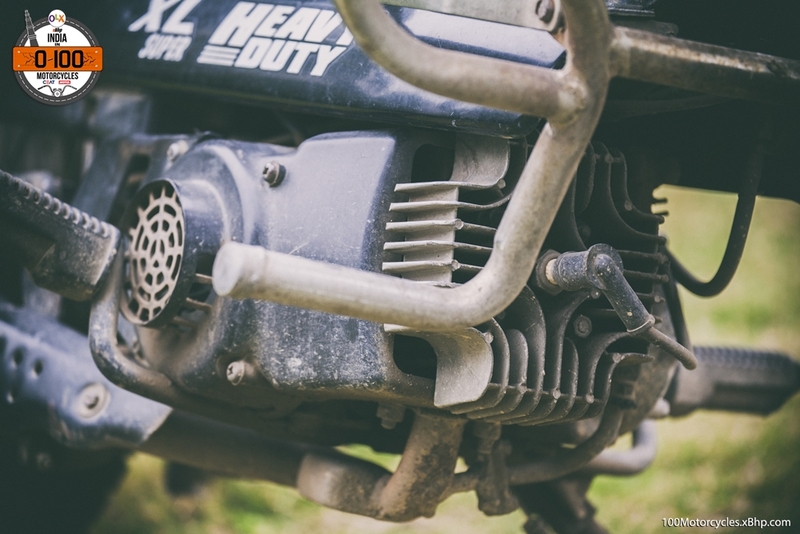 Its load carrying capacity is probably the biggest surprise about it. 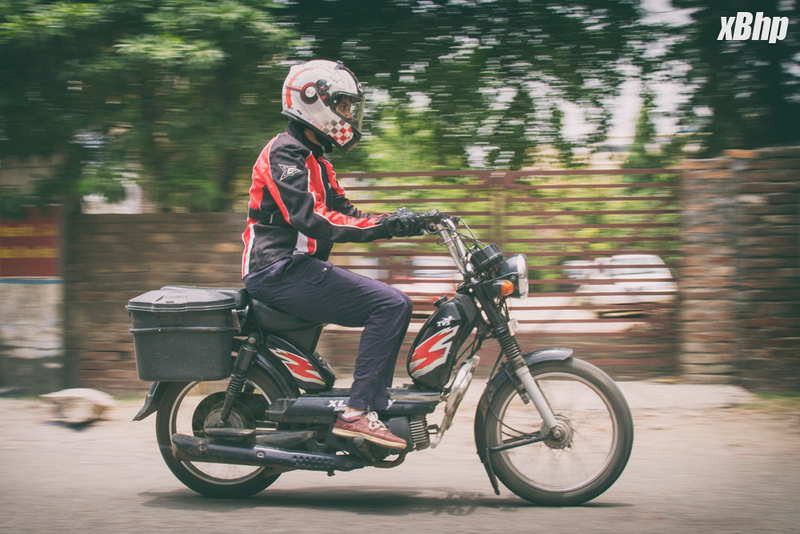 Every now and then we see wholesale guys carrying the stuff all over the TVS moped and deliver it in different parts of the city. 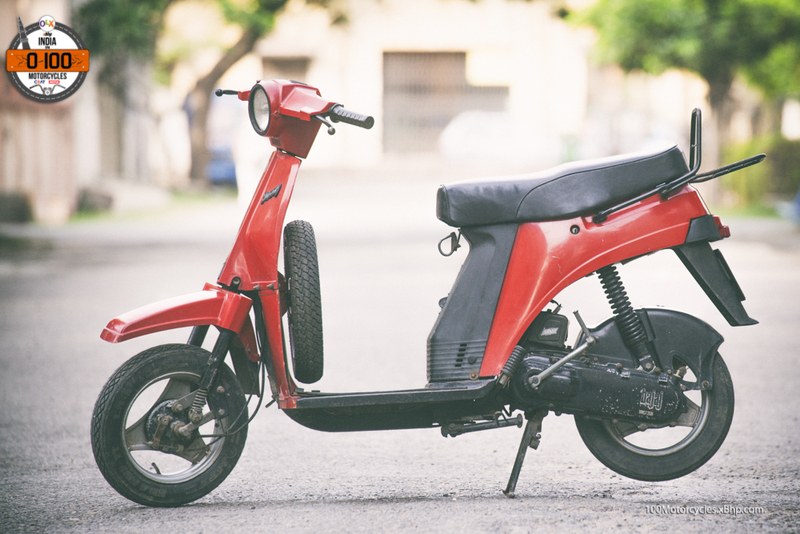 What’s even more surprising is, the moped doesn’t look like it’s struggling at all! It appears to just go on and on and on. 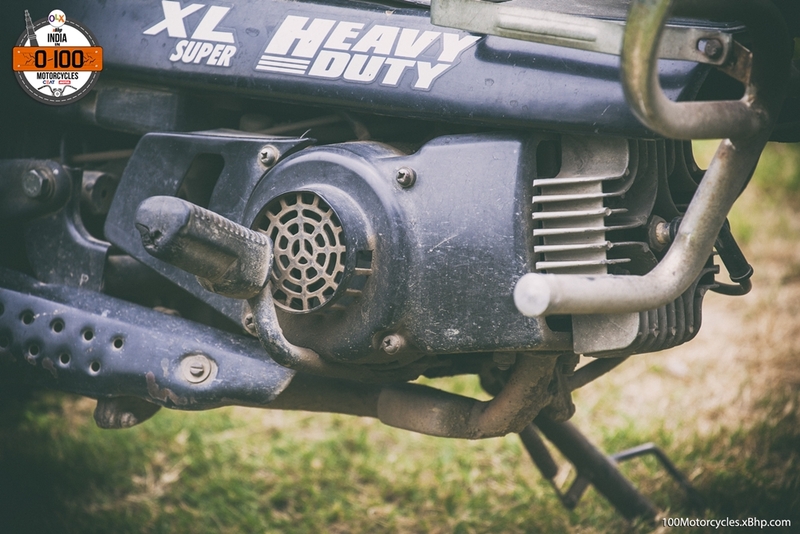 The constant rasp from that small 2-stroke engine doesn’t give any signs of dying out. 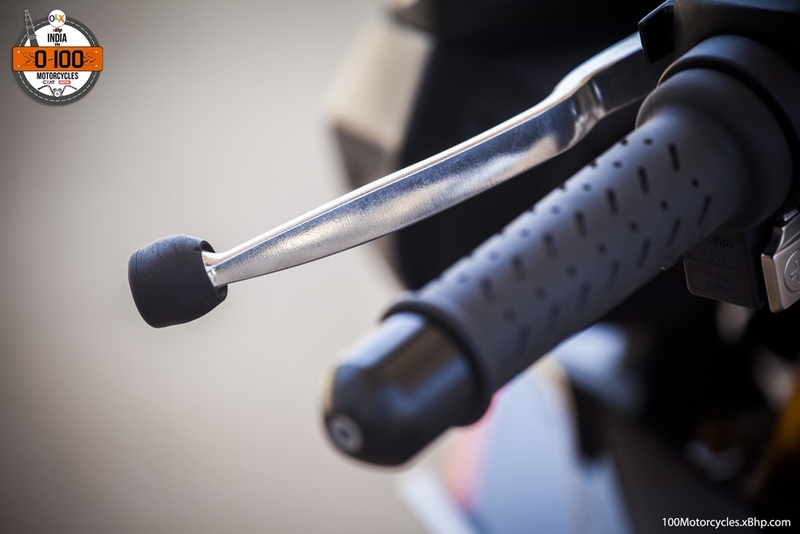 It is, quite apparently, a small-super-bike. 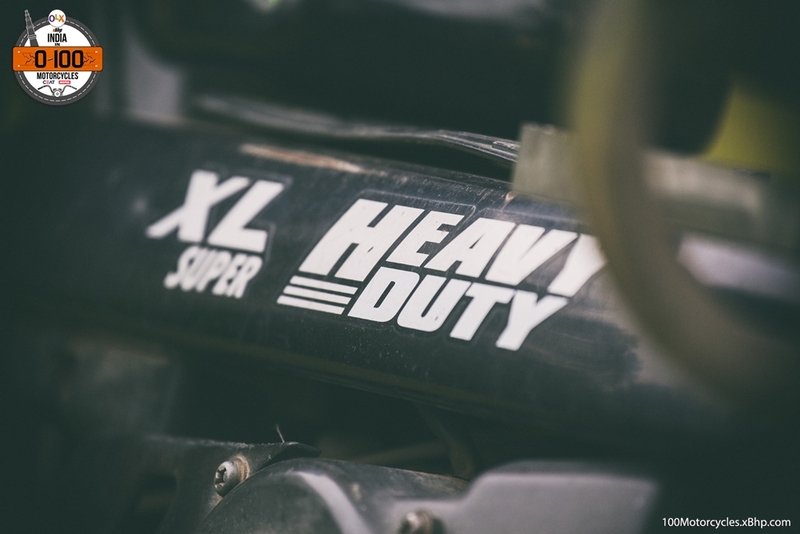 The XL Super Heavy Duty is one of the latest mopeds made by TVS and powered by a 69.9cc 2-stroke single cylinder horizontal layout engine. It produces 3.5 BHP at 5,000 RPM and 5 NM of torque at 3,750 RPM. 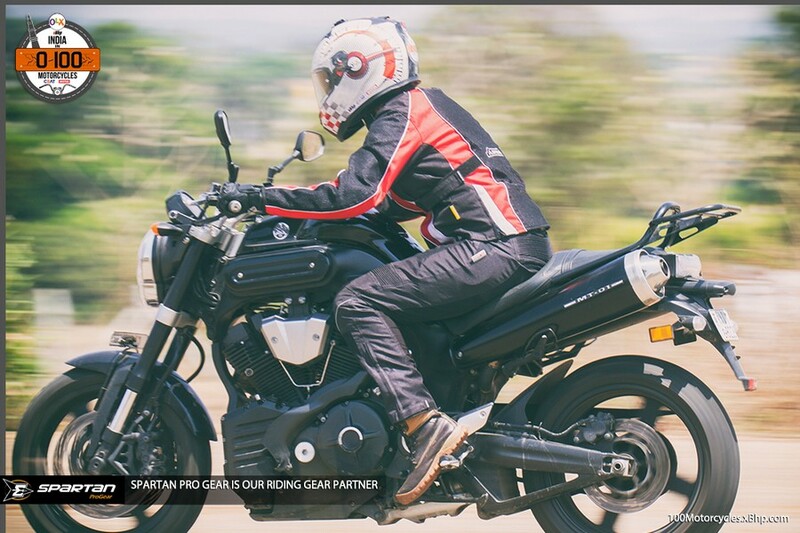 And it weighs at only 75 kg ready-to-ride and comes with just one-speed gearbox. 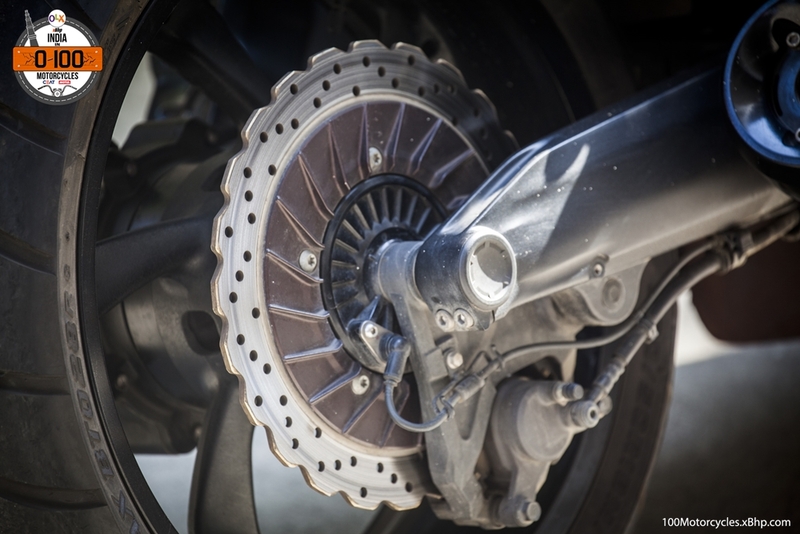 The clutch is centrifugal (basically, it means it doesn’t have manual operated gear). 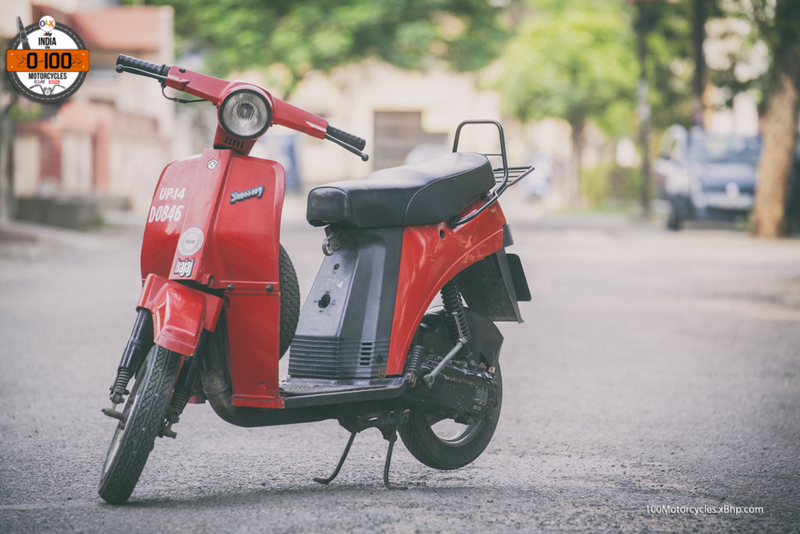 It is natural that it attracts a specific section of the buyers and not the mainstream audience who buys normal motorcycles and scooters for their purpose. 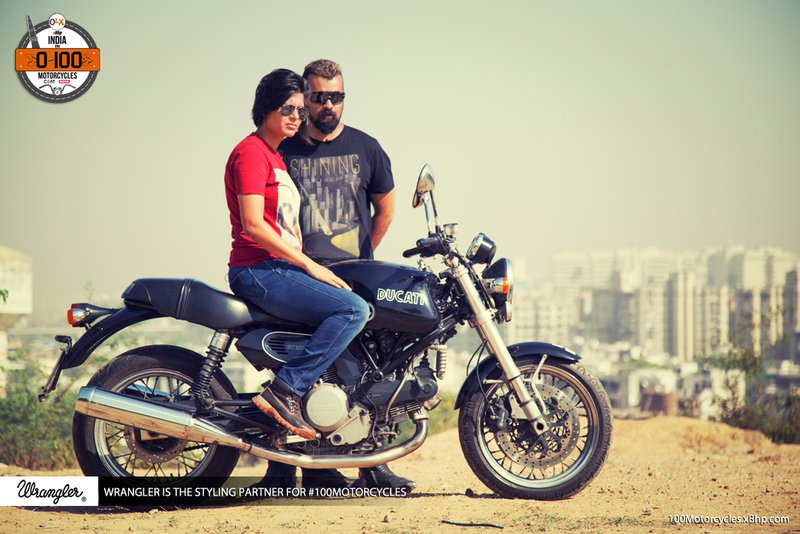 Companies have actually tried to promote them for regular buyers and even target the youth. 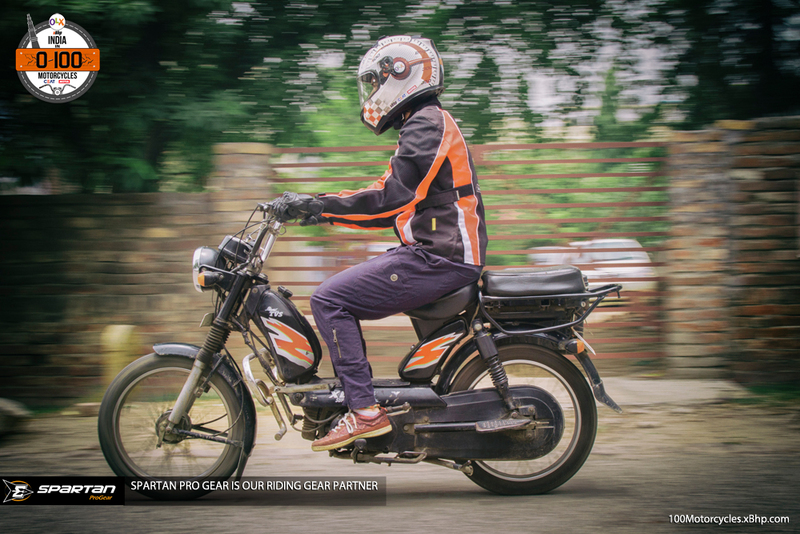 Remember the time when Aamir Khan was the brand ambassador for Hero Puch and the advertisement showed him riding a Hero Puch moped with other young college going guys and girls! 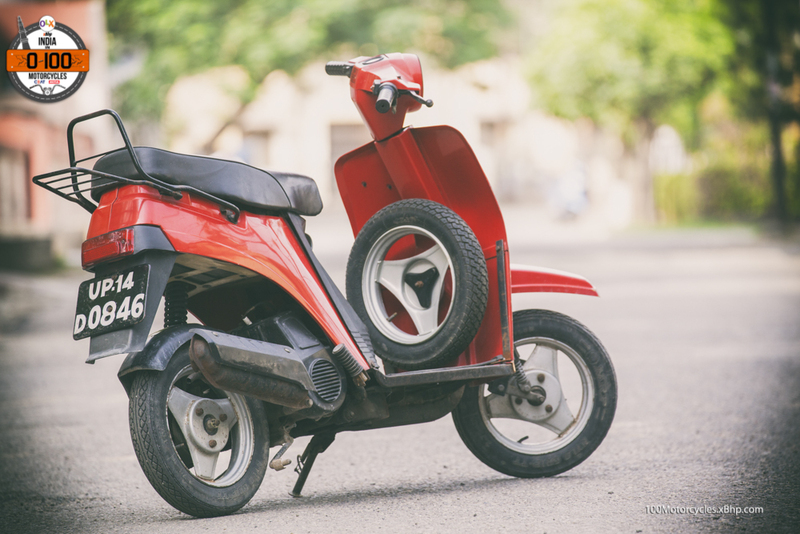 But the moped just didn’t cut it with the youth. 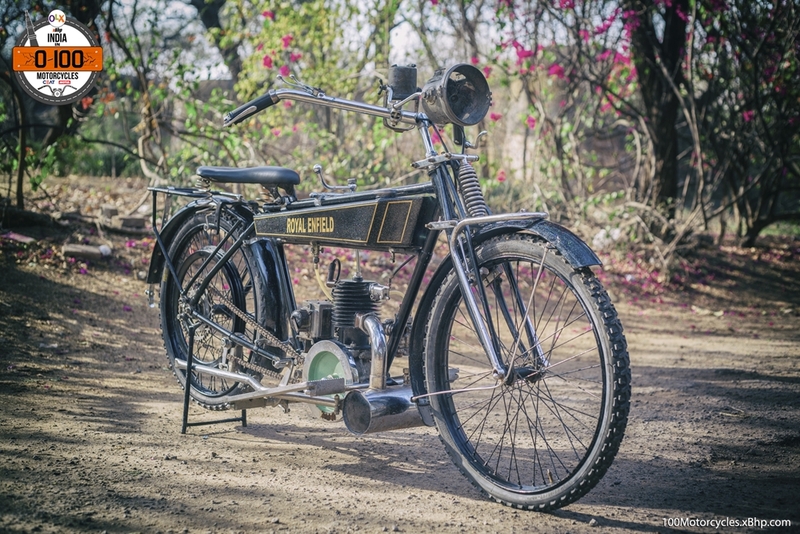 No doubt, the biggest reason is its design and the small engine, no matter how useful, praiseworthy and reliable it is otherwise. 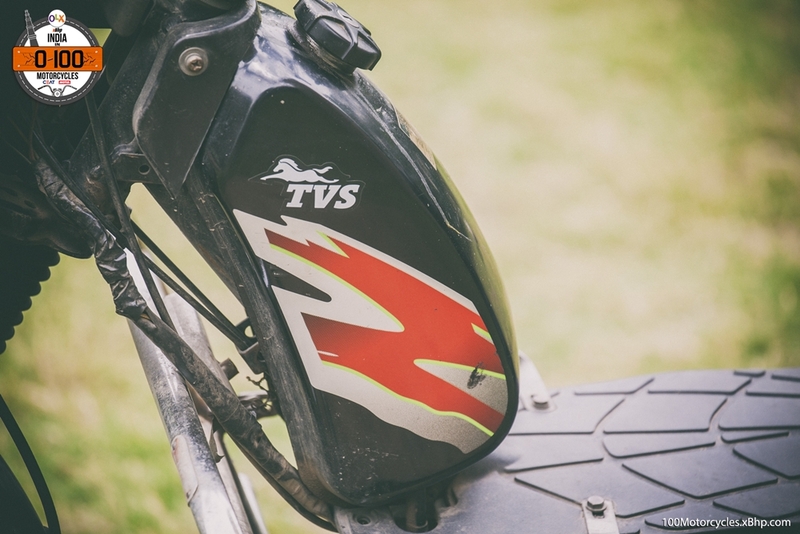 Yet, that hasn’t stopped TVS from making it and turning it into one of the most successful two-wheelers ever made in the country. 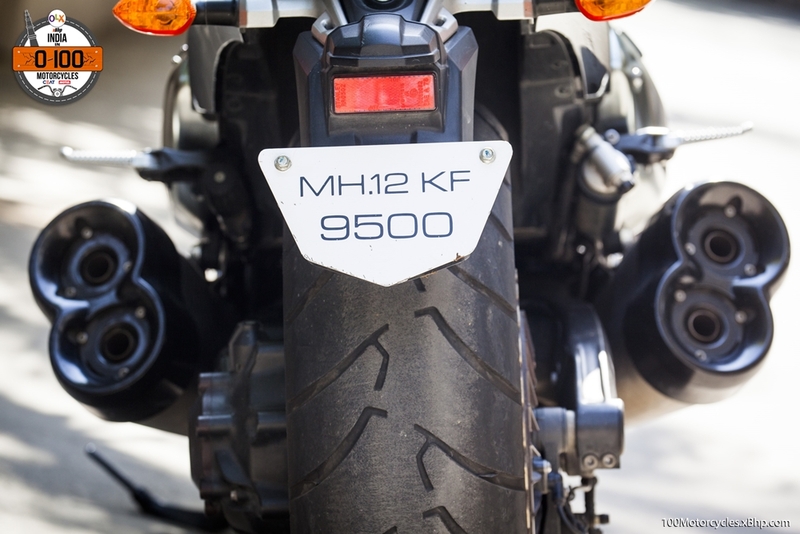 Since its debut in 1980, the Chennai-based bike maker has sold over 1 crore XL mopeds in India. What an achievement. 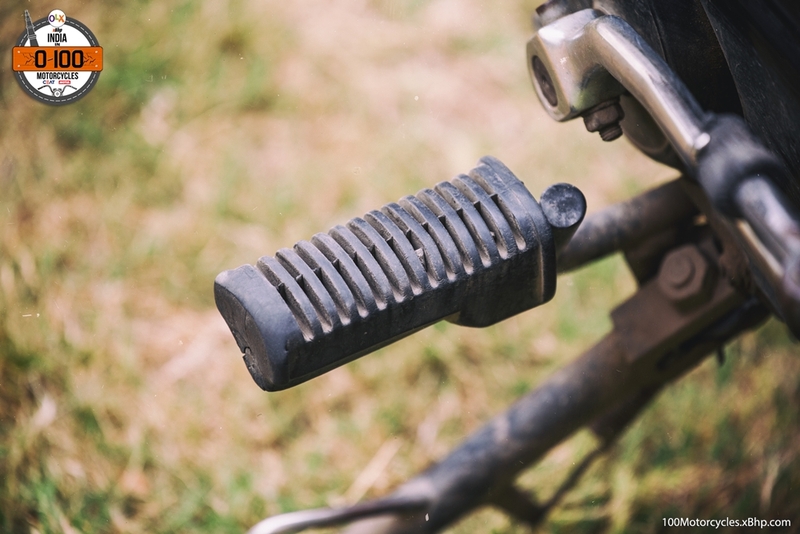 This thing just works when and where it matters. 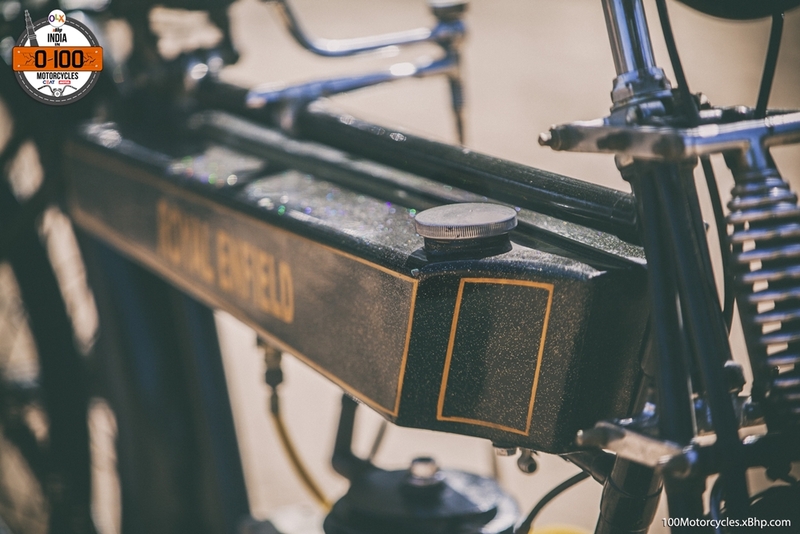 For many people, it is ignorable, but it is an engineering marvel and everything to be proud of. And if you at all think that it is meant for you, you can get one really cheap on OLX. 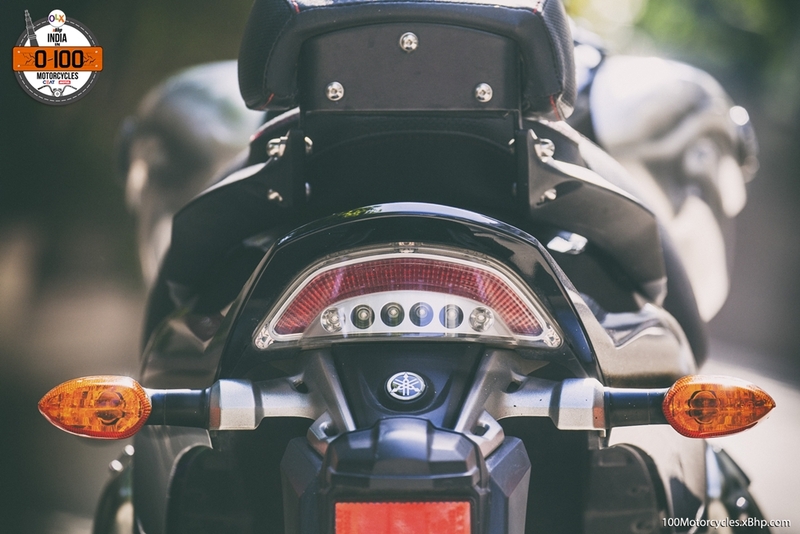 We love a variety of motorcycles, that’s one of the best things about being in love with motorcycles in general and not just a brand! We really don’t see it happening any other way. 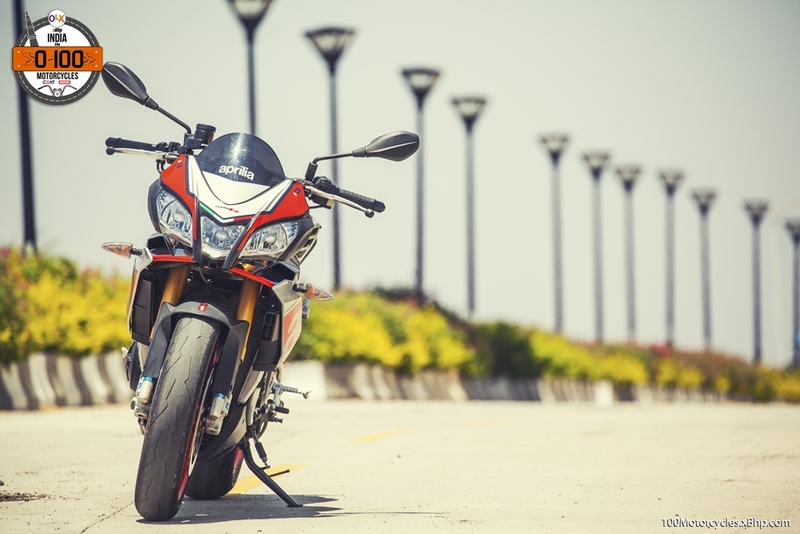 Nowadays, the trend for sportbikes is making them lighter and more compact than ever before. 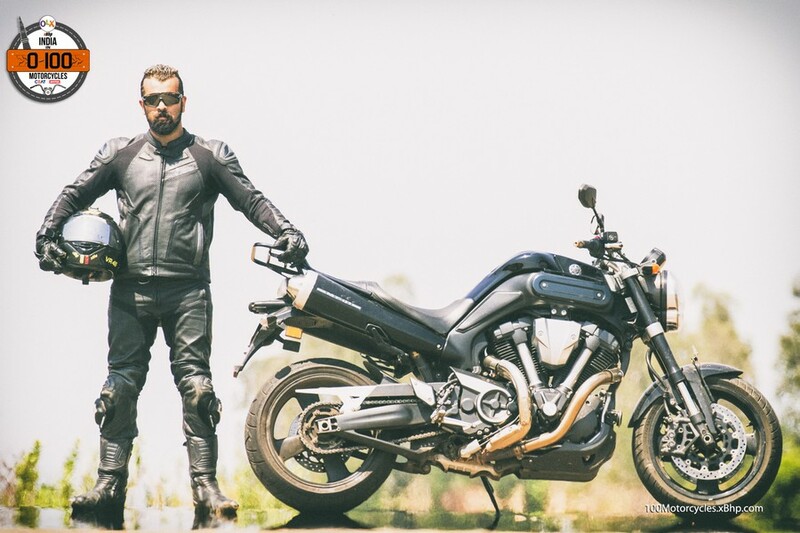 Logically, it is probably the right way because sportbikes are meant for performance primarily than providing the “riding into the sunset” feeling! 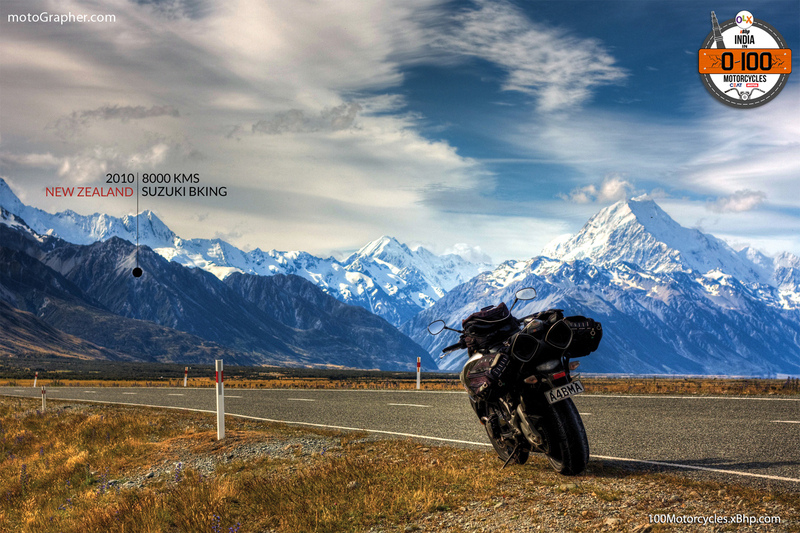 That you can do on any motorcycle, by the way. Nevertheless, it wasn’t like this all the time. 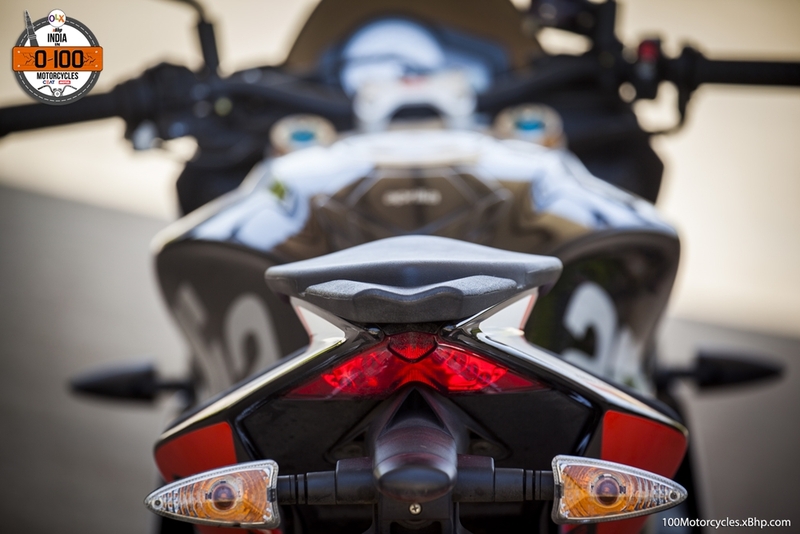 The naked motorcycles, many times, are derived from the full-faired sportbikes. 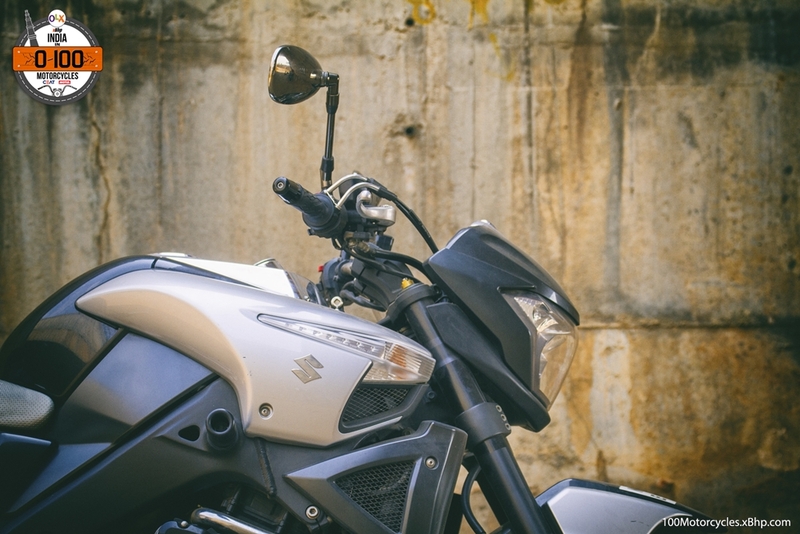 They have a more manageable riding position due to the single-piece handlebars, the engine is tuned more for torque at lower RPMs to make riding in traffic an easy affair and overall, they are easier to live with. 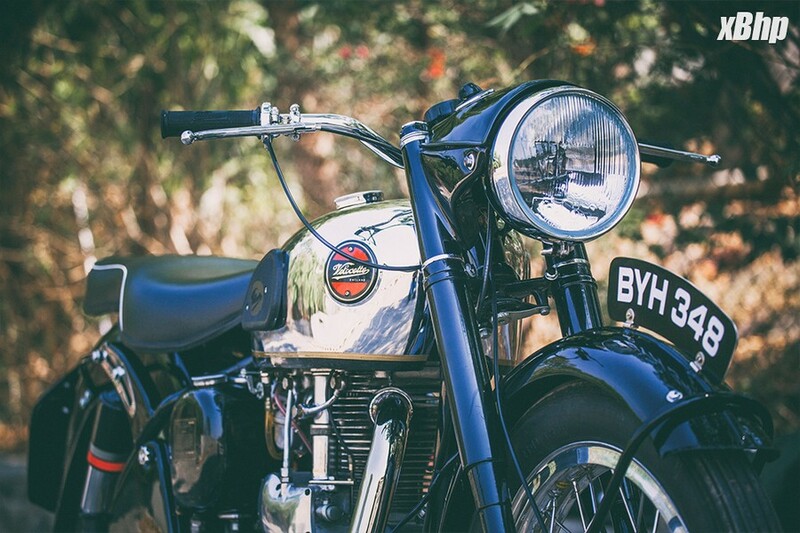 But not all naked motorcycles have been like that. 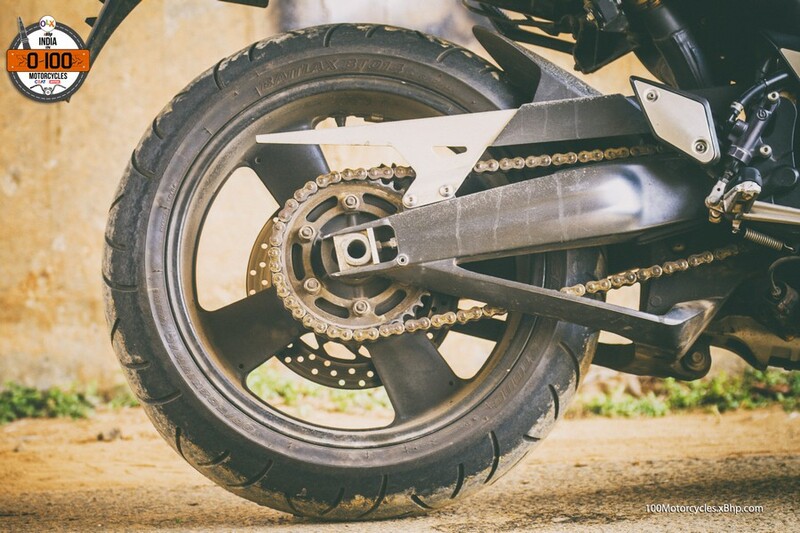 We have had the likes of Suzuki B-King, that bulky and radically designed motorcycle which would look at home in a Transformers movie, and the Honda X11 (Superblackbird’s naked version). 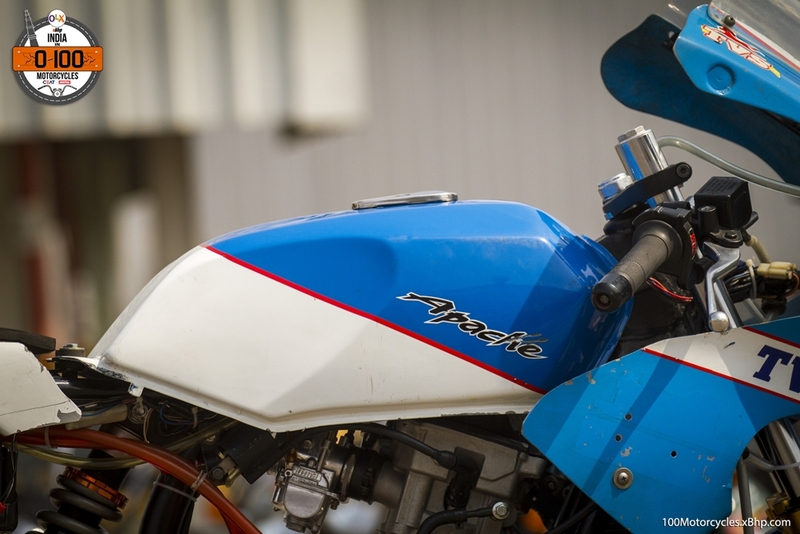 These motorcycles defied the basic trend of making nakeds and streetfighters. They were big and bulky and had a fairly small production run. 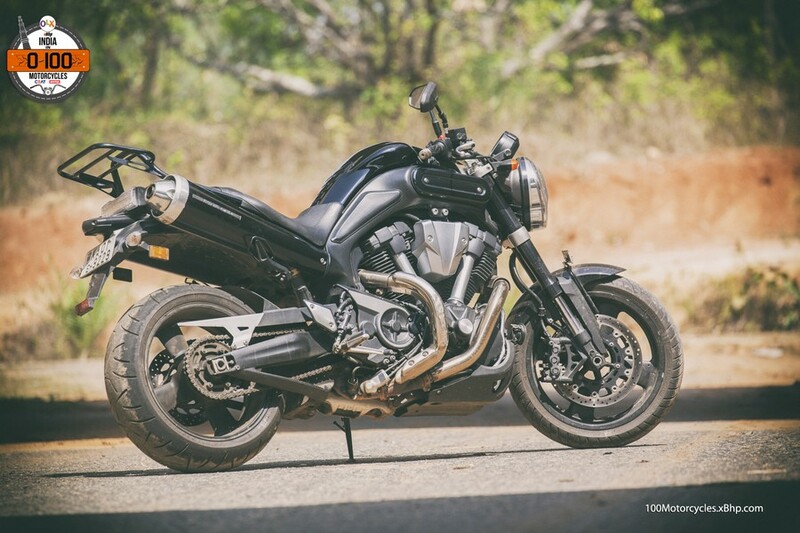 This reminds of another such motorcycle, MT-01, from Yamaha. 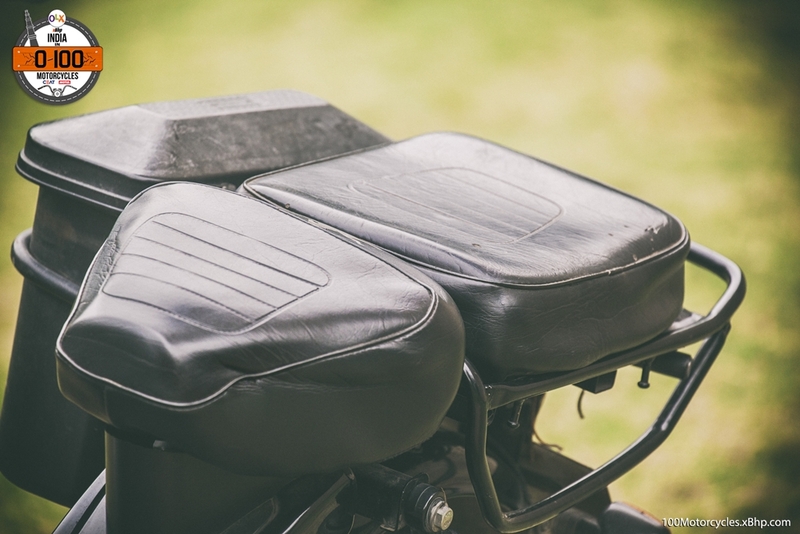 Yes, the one with a big, burly V-twin engine and a pair of under seat exhausts. 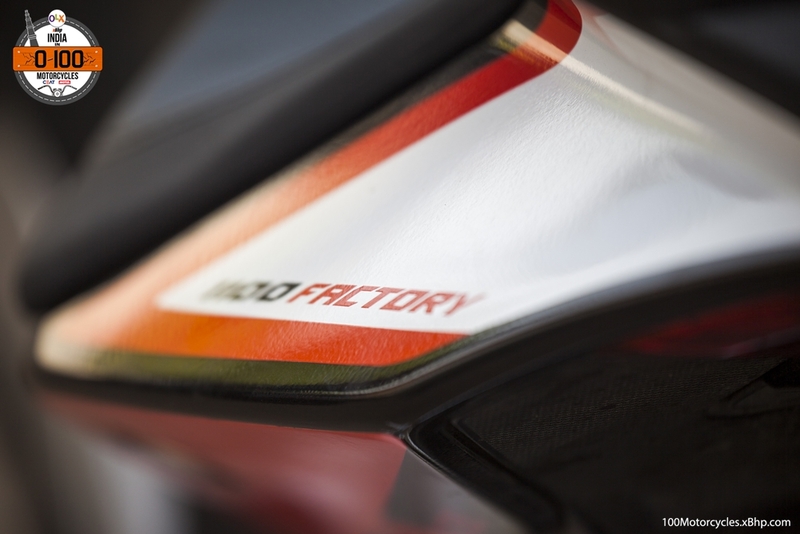 Showcased as a concept in 1999 at the Tokyo Motor Show and launched in 2005, the MT-01 was made till 2012. 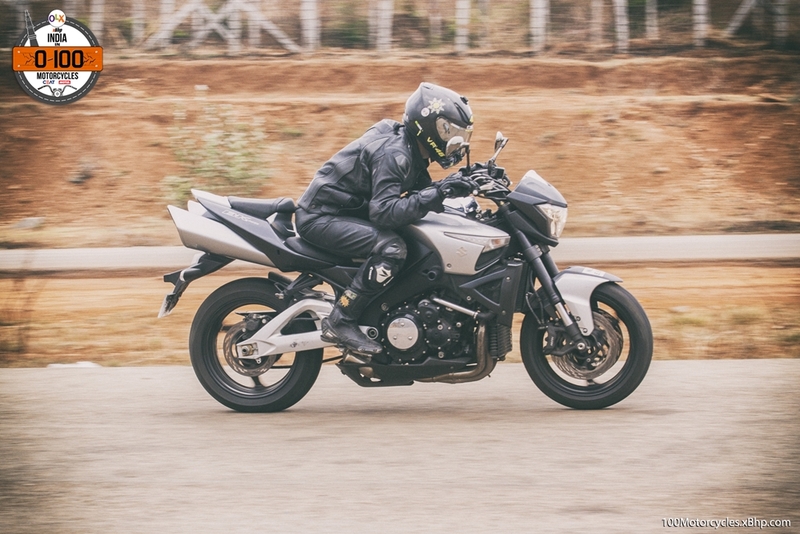 The Yamaha MT-01 is one of those motorcycles that are very rarely found in India and Yamaha has also stopped producing it. 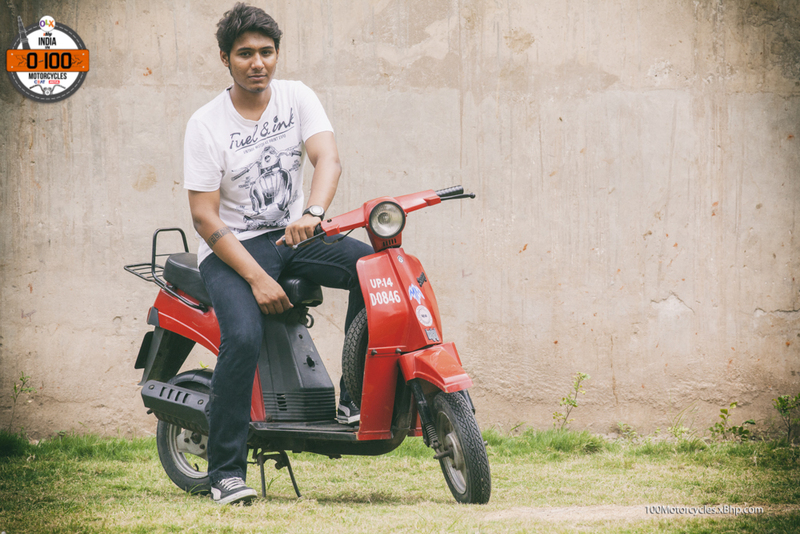 So, if you want to buy one, keep an eye on OLX, maybe you can find one listed there someday. 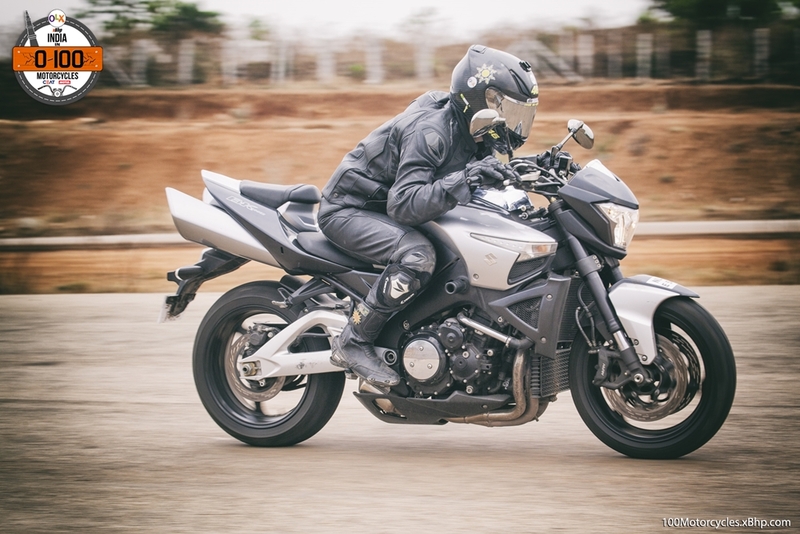 Yamaha MT-01 wasn’t really a streetfighter. 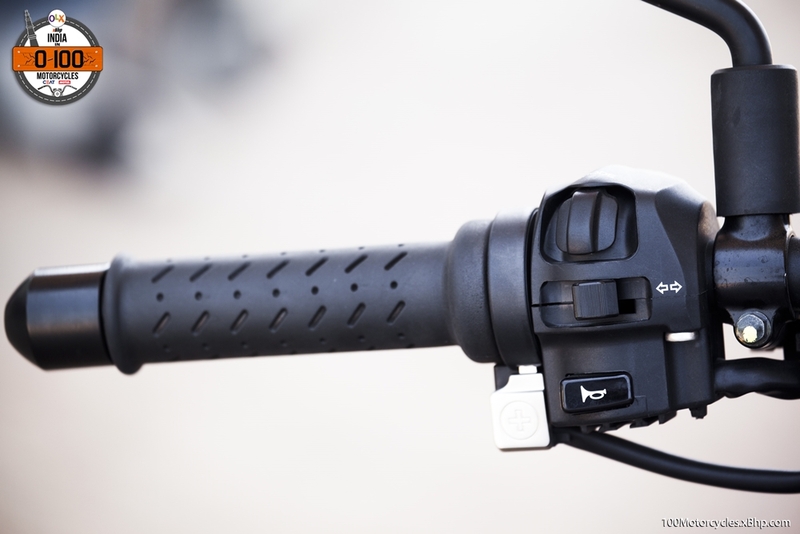 Look at it and it was clear it wasn’t really made to slice through traffic irrespective of its actual capabilities. 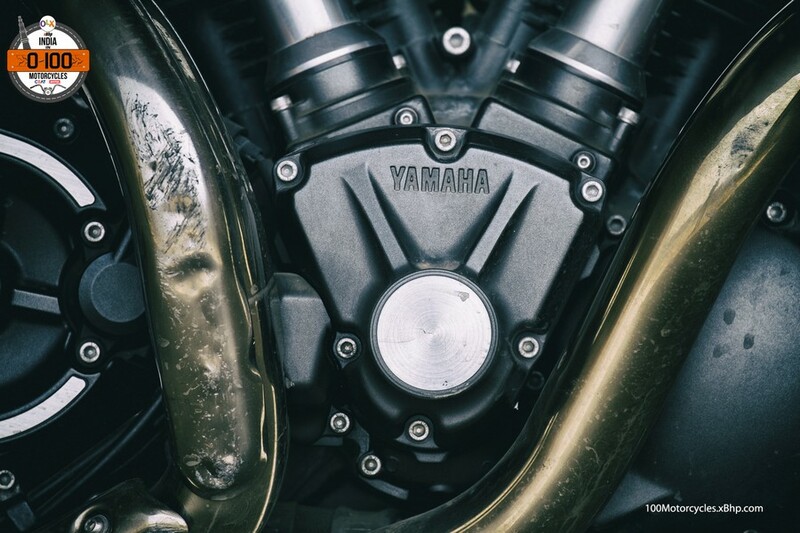 The 1670cc V-twin engine was taken from the Yamaha Warrior power cruiser, but obviously, it was modified to deliver performance more suited to a sportbike. 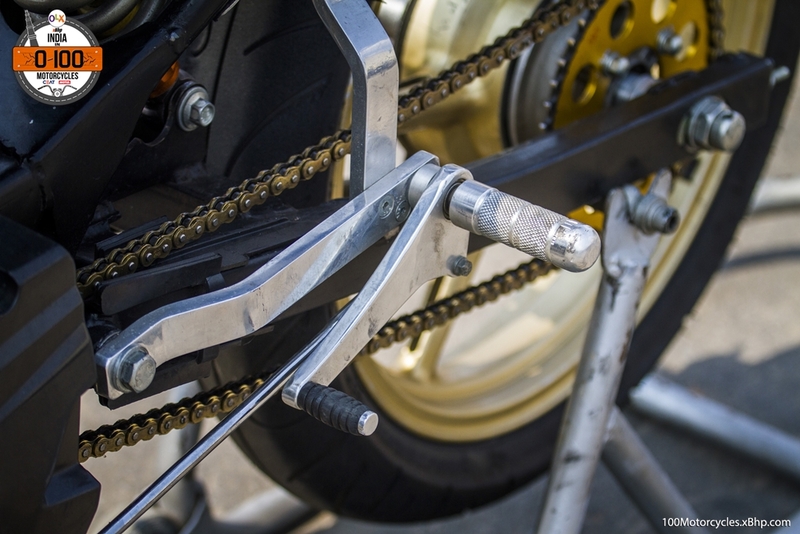 Mounting points were changed as well so that it would fit inside the chassis of MT-01. 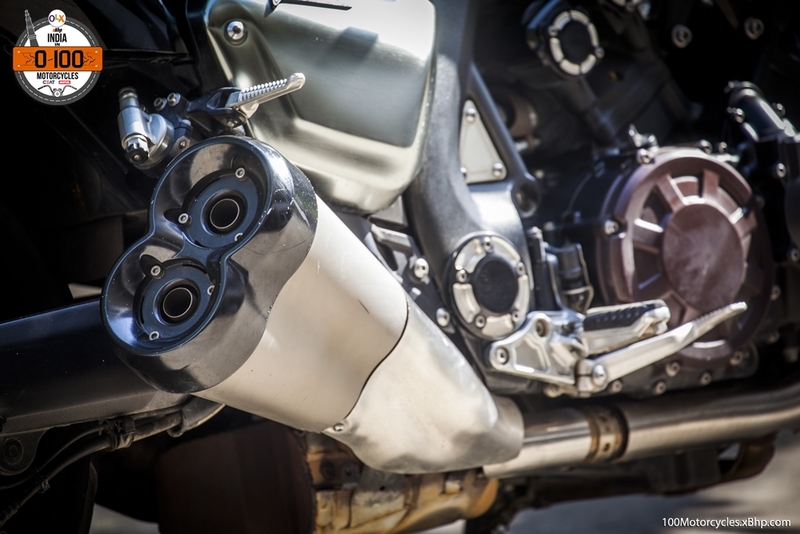 The engine produced 90PS of power at 4,750 RPM and a massive 150.1 NM of torque at 3,750 RPM. 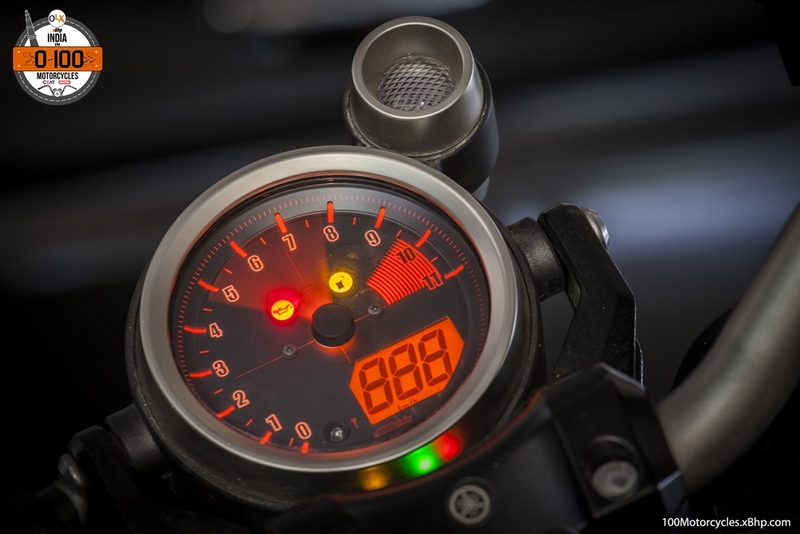 Such a combination of power and torque is unheard of in a sportbike and those RPMs is where many or most cruisers top out as well. 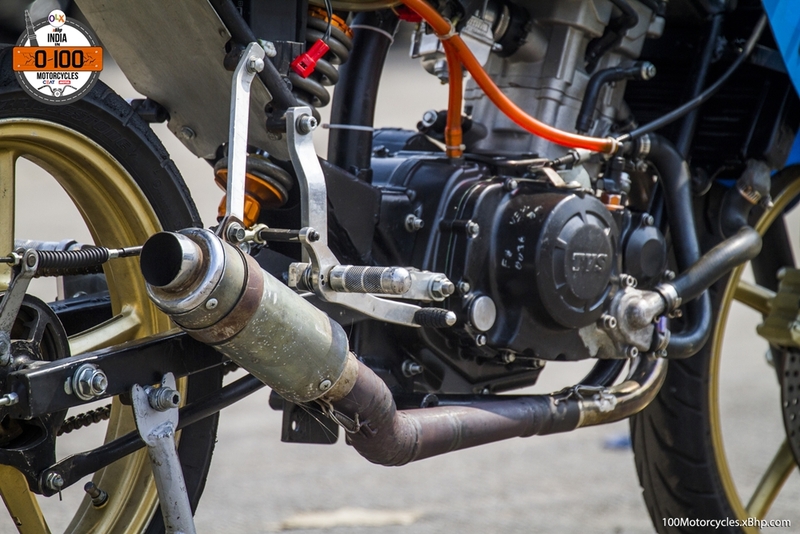 And we got that in a naked Yamaha! 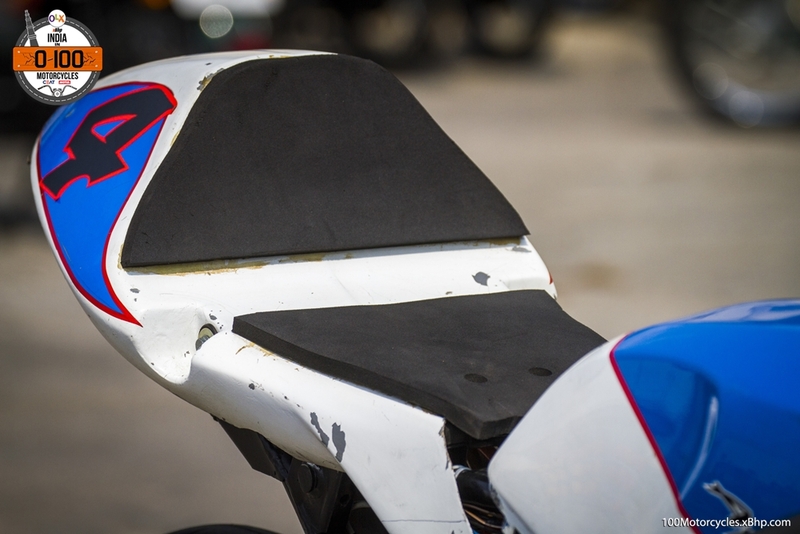 It was heavy at 265 kg ready to ride, although, efforts were made to keep it as light as possible. 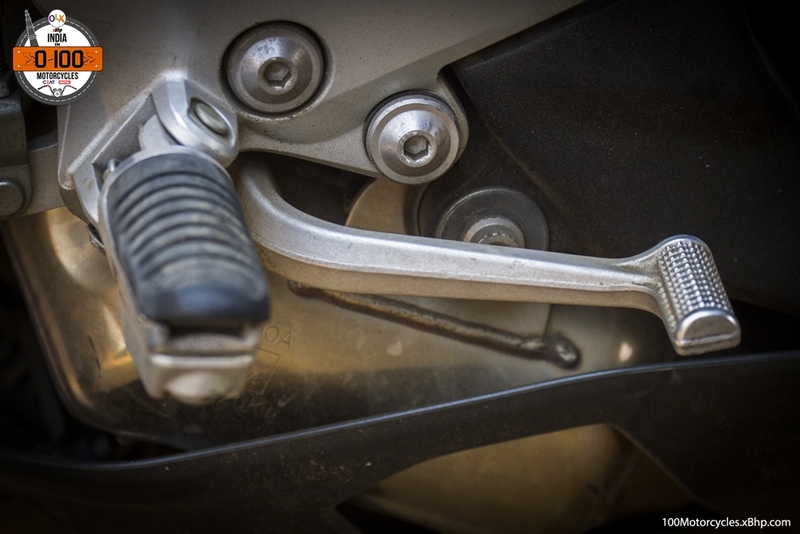 The main frame was made out of die-cast aluminium and so was the YZF-R1 inspired swing-arm. 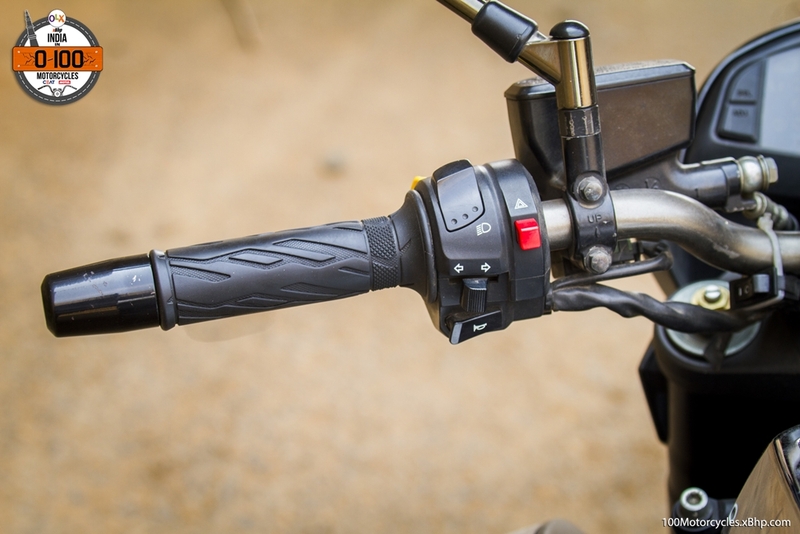 At the front, there are upside down forks and a mono-shock at the rear. 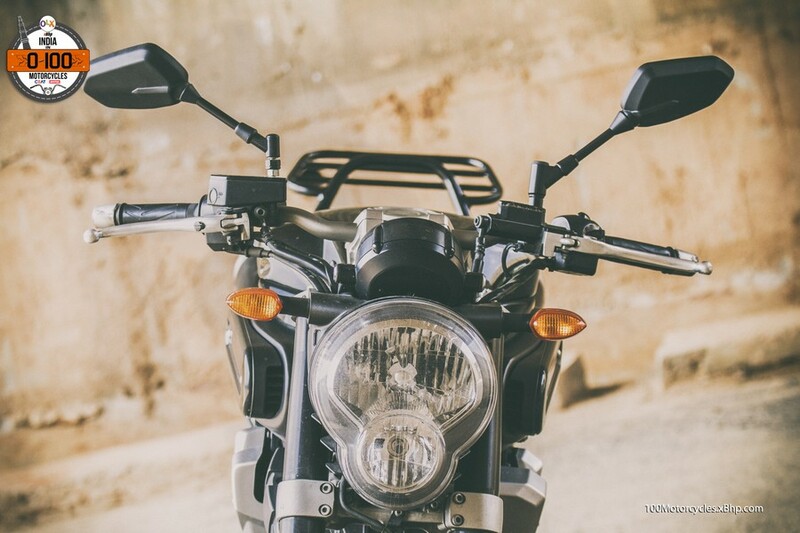 It had the geometry of a streetfighter, it just didn’t have the dimensions and weight of one. 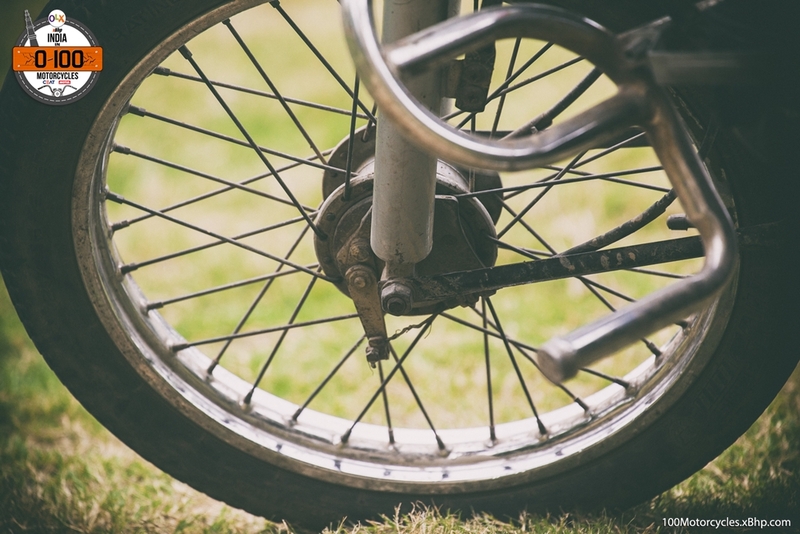 Also, the front wheel was an 18-inch while the rear was a typical 17-inch. 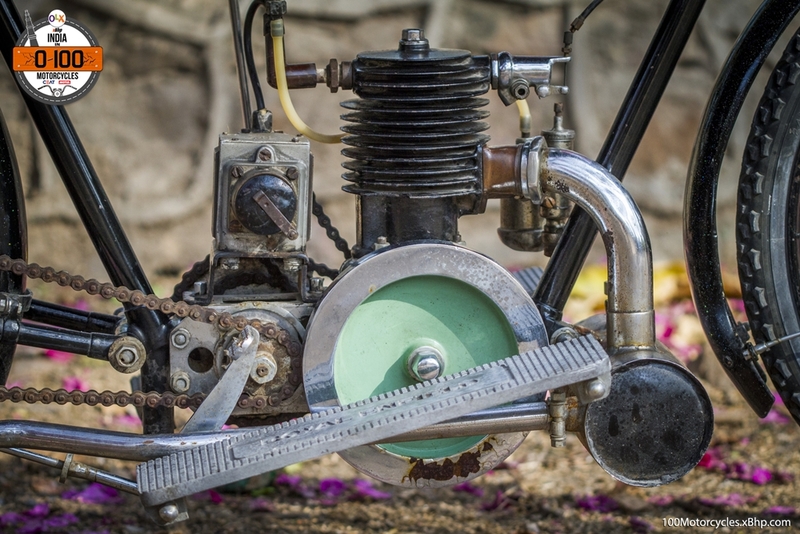 Even though the overall design of the motorcycle was quite unique and good, the engine remained its most visually stunning element. 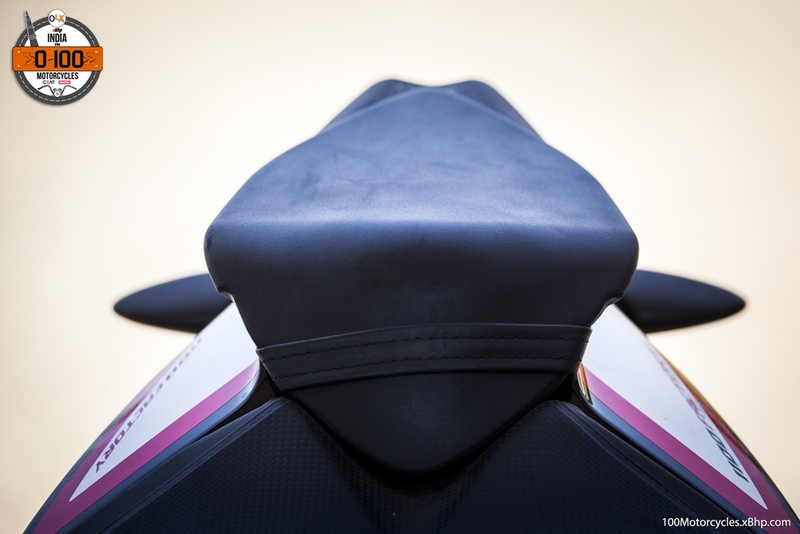 Another thing that caught everybody’s attention was the pair of under seat exhausts. Well, they were almost under seat! 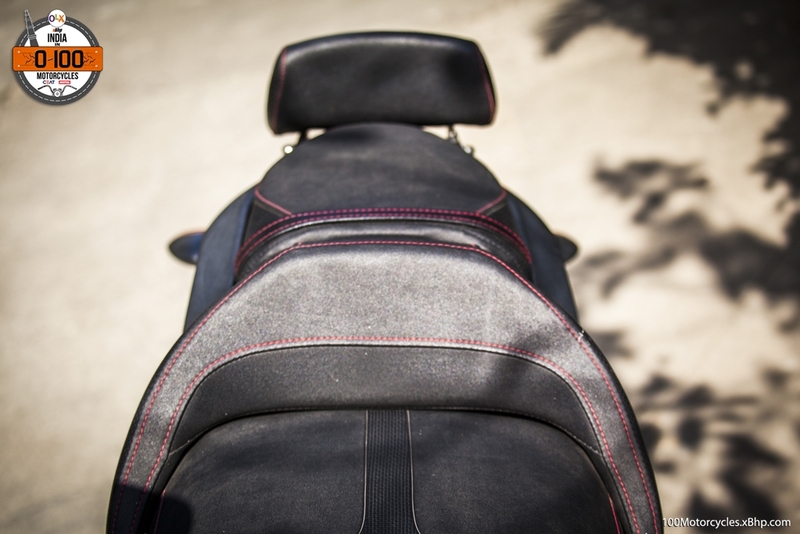 And they didn’t look like making the life of the pillion any easier. 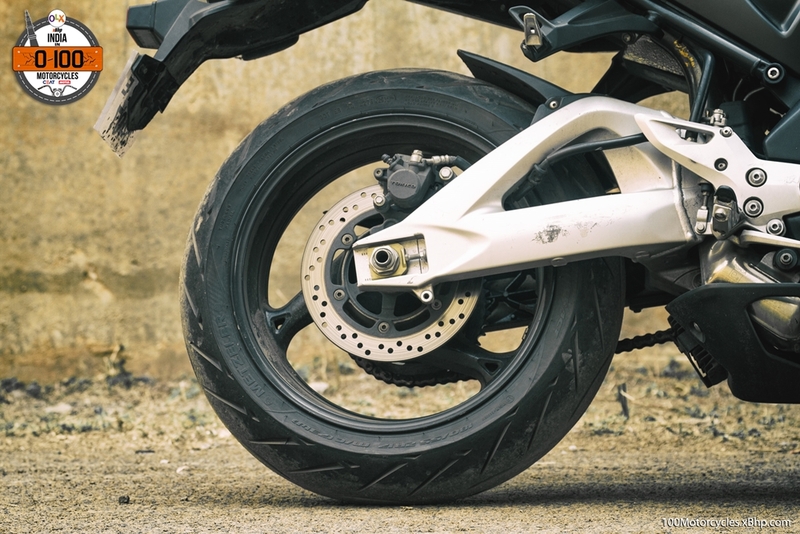 In comparison, the current generation of MT sportbikes is quite petite as if they have gone on a diet programme. They are smaller, quicker and faster. They turn much better as well and are easier to live with, in a city. 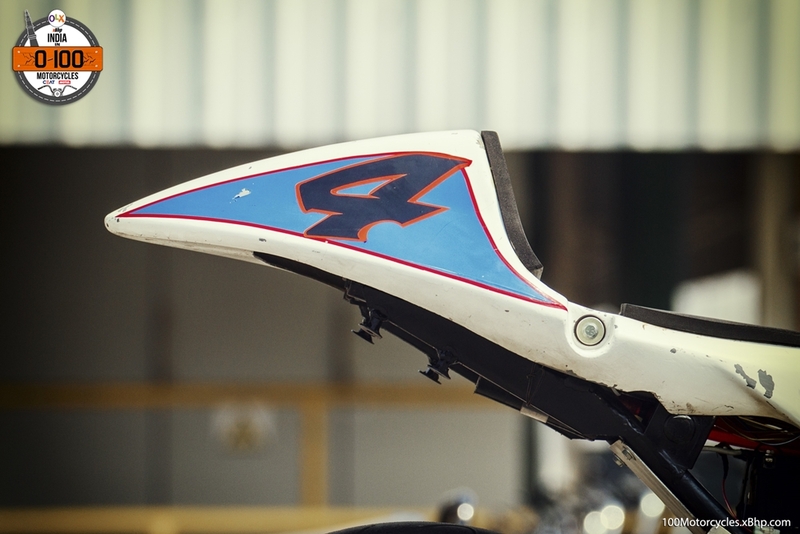 However, they really can’t match the 01 as far as badass attitude is concerned. 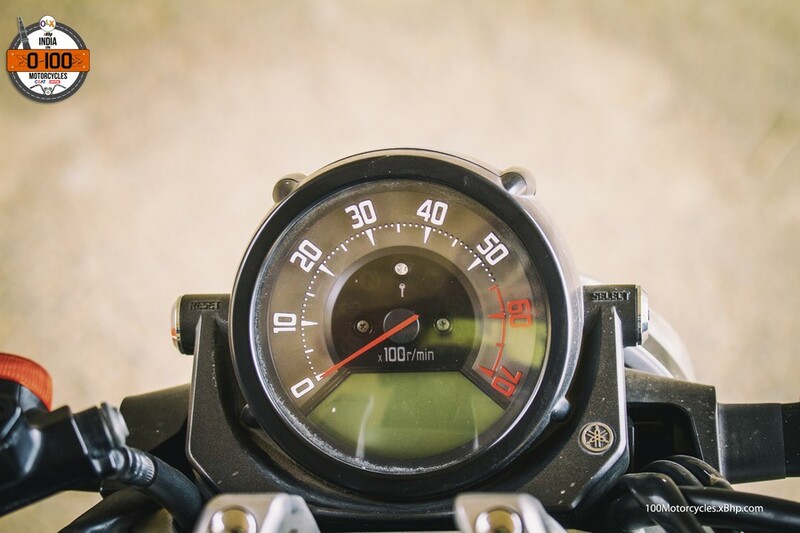 We would guess that this is what the MT-01 was all about – attitude more than anything. 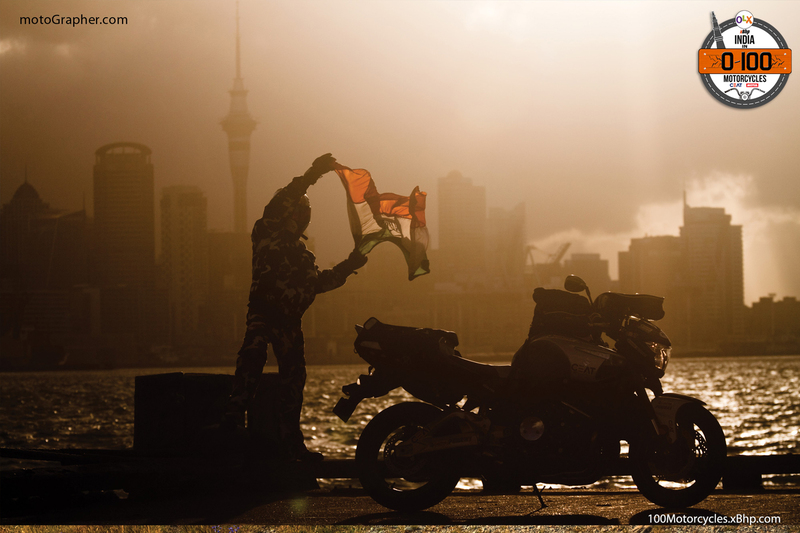 And it did revive some memories in the group as well! 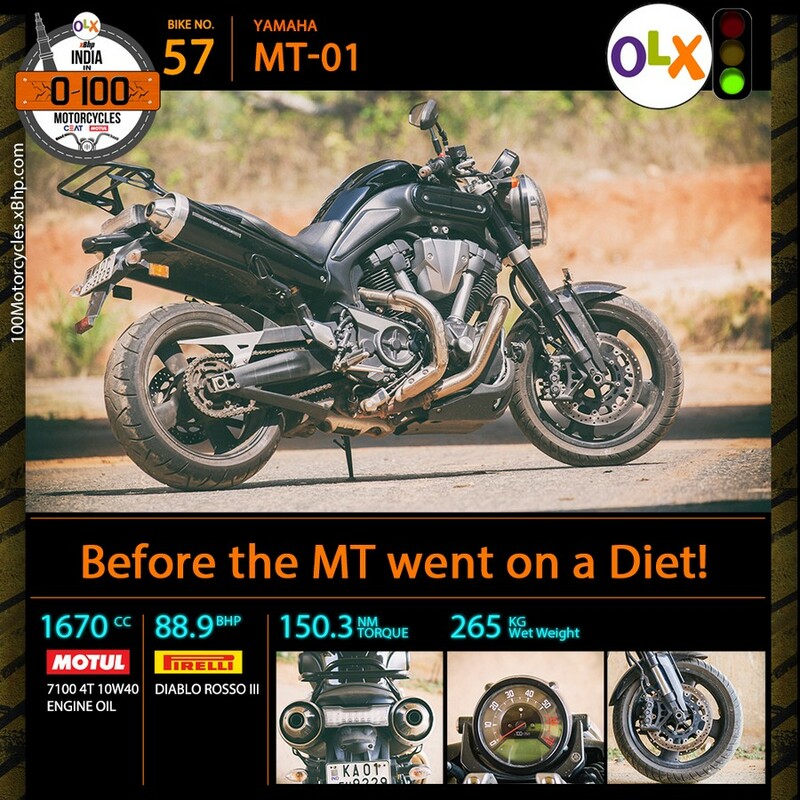 Of course, you can’t get it brand new today, but hey, you can always try to find one on OLX. Who knows where you might get lucky. 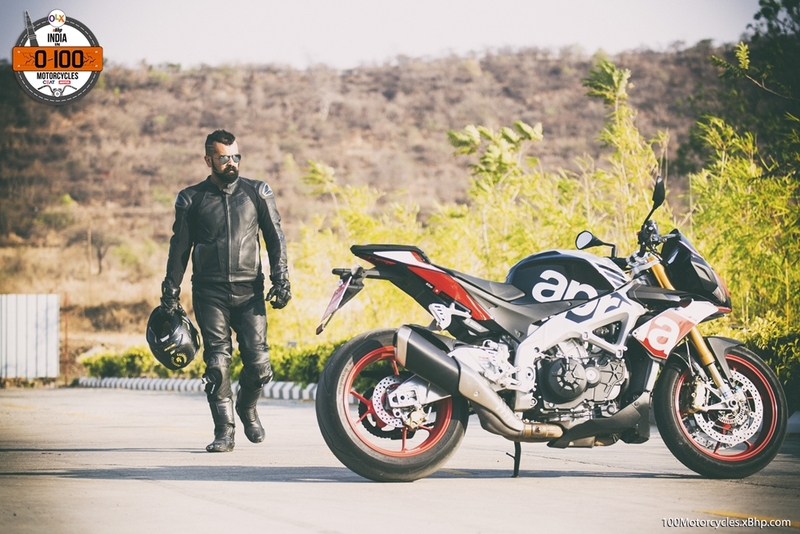 We would also like to thank Mr. Akhil Venkateshwaran (aka Rossiter on xBhp) for sparing his time and letting us spend some wonderful time with his Yamaha MT-01. 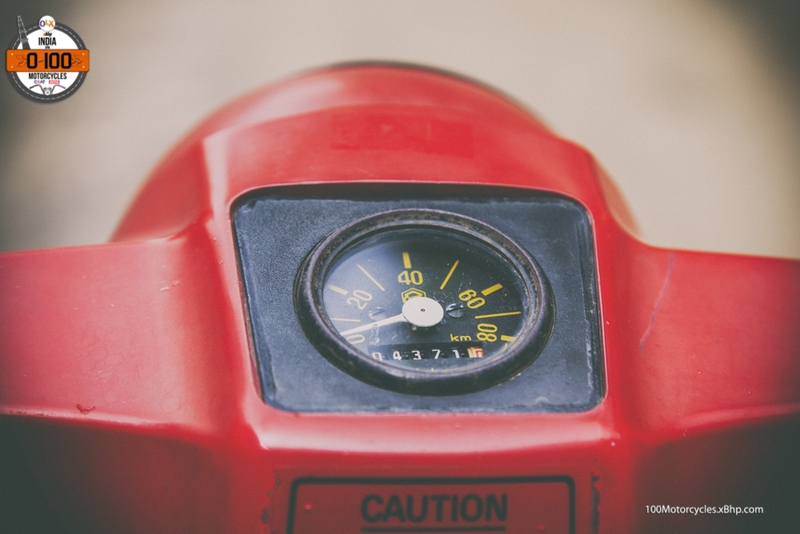 Do you think that a company can develop and launch a vehicle just to see the market response? Irrespective of what you may say about that, there’s always some market study behind the launch of each product. 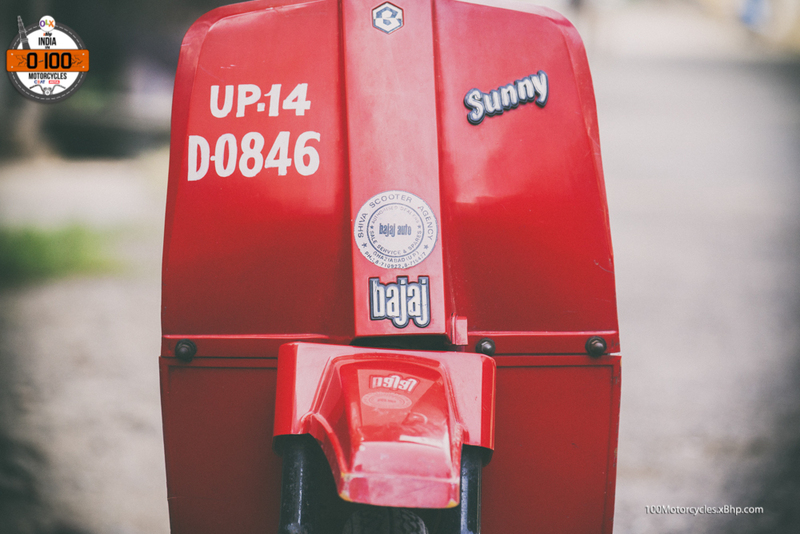 Bajaj Sunny is the sort of a vehicle which prompts the above question. 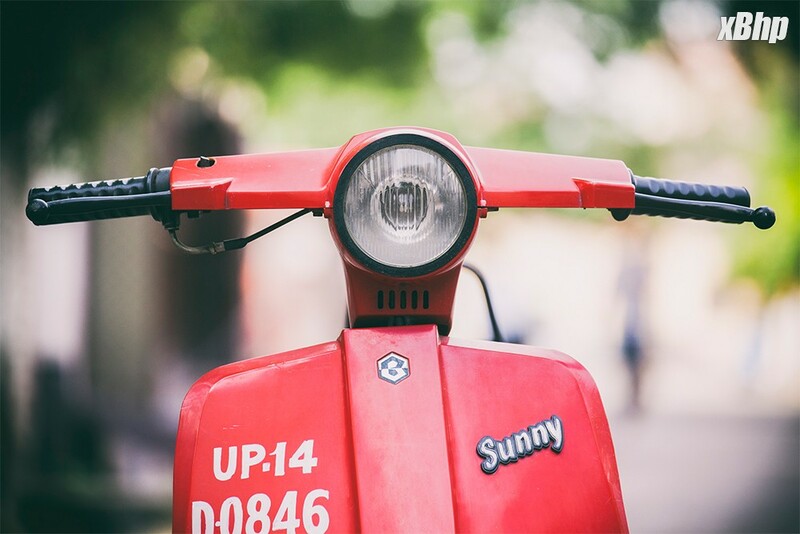 Launched in 1990 specifically for teenagers between 16 to 18 years old (who were eligible for a license for gearless two-wheelers in India), Sunny enjoyed decent success and naturally became quite popular among the younger crowd. Its miniature dimensions always made it very easy to ride around. 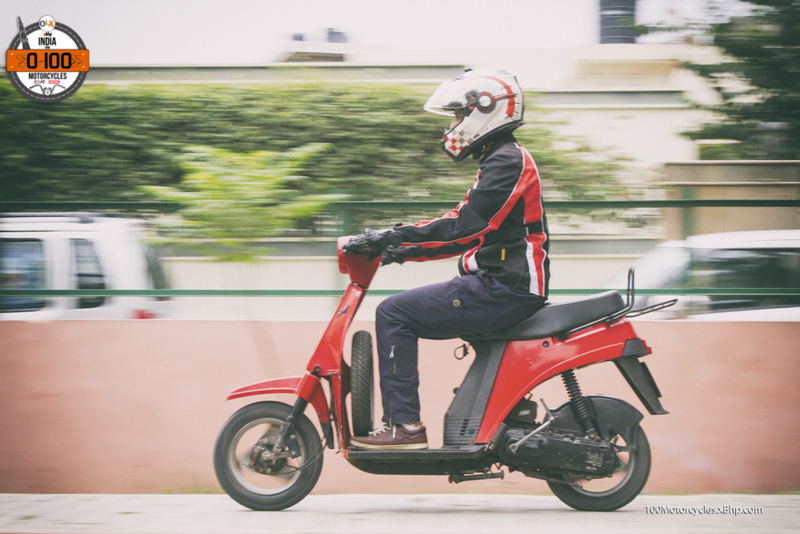 Even then, the mentioned age group is a pretty thin market to go for, but of course, given the intent of the scooter Bajaj may not have expected huge sales numbers anyway. 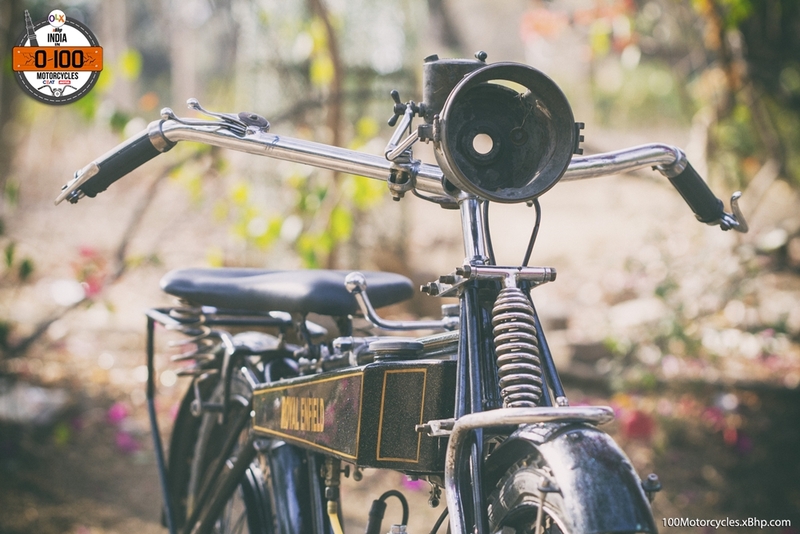 It may have indeed been an experiment to provide a motorized two-wheeler to the people who were in the touching distance of their adulthood! 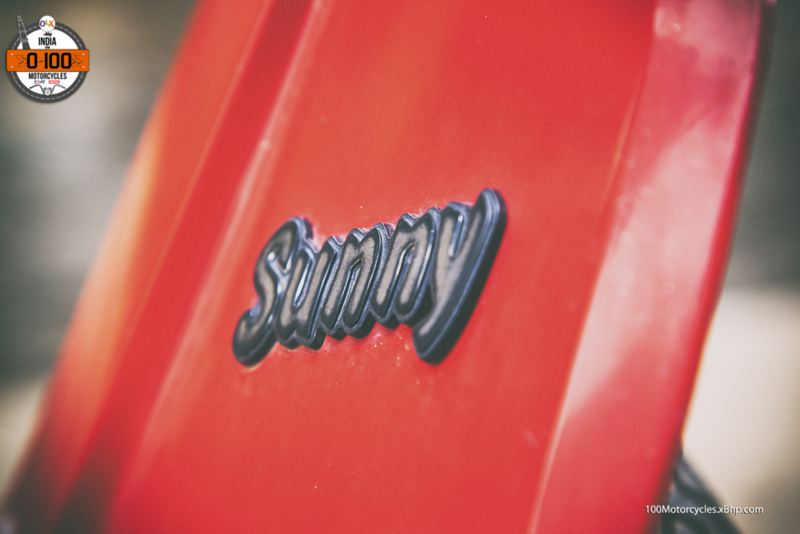 But the tiny size of the Sunny does make it a toy-like scooter, almost for kids, rendering it more or less unimportant. 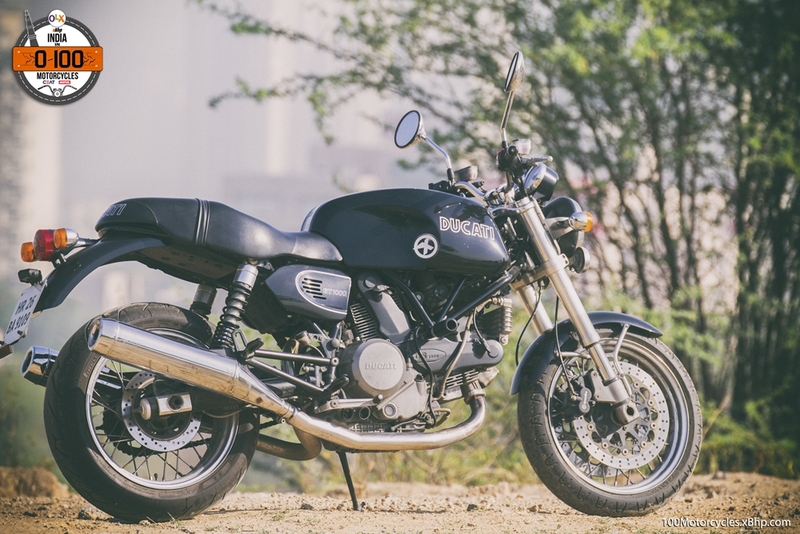 Interestingly, that was its biggest advantage making it more approachable than any other two-wheeler on the market at that time irrespective of your age and experience. 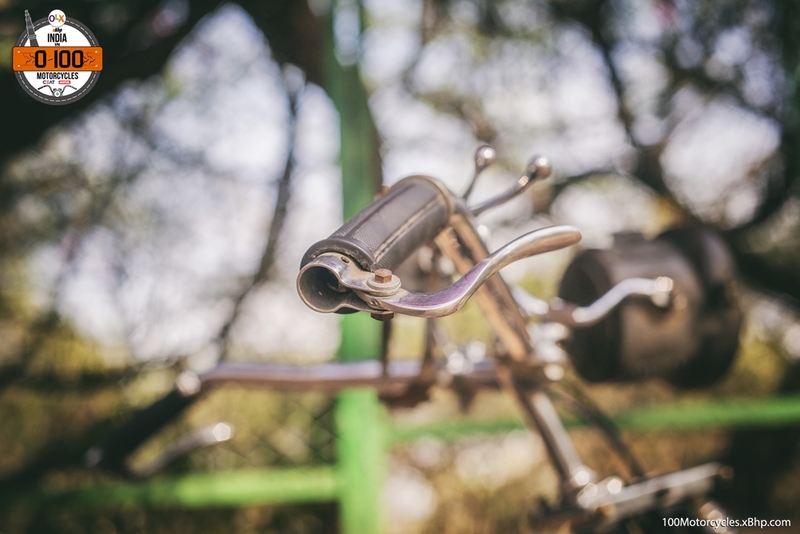 It was so small that one could hardly care any less while riding it. 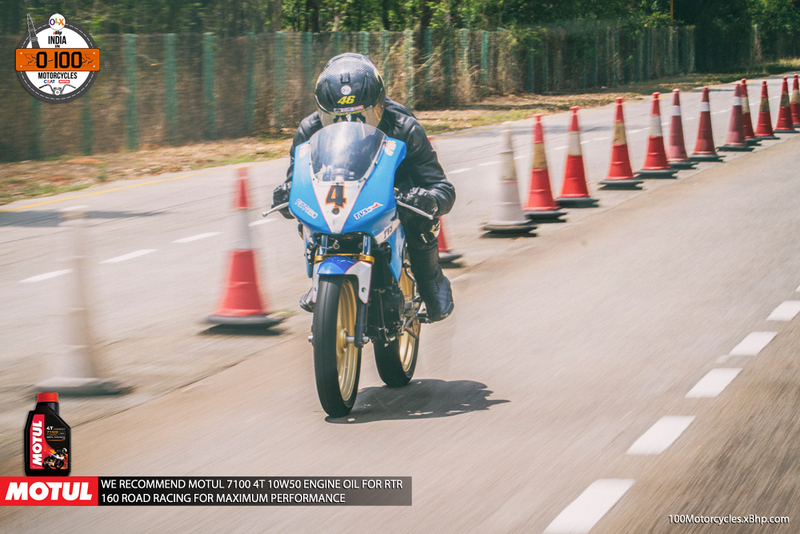 It came with a small 50cc 2-stroke engine capable of producing around 2.8 BHP at 6,000 RPM. 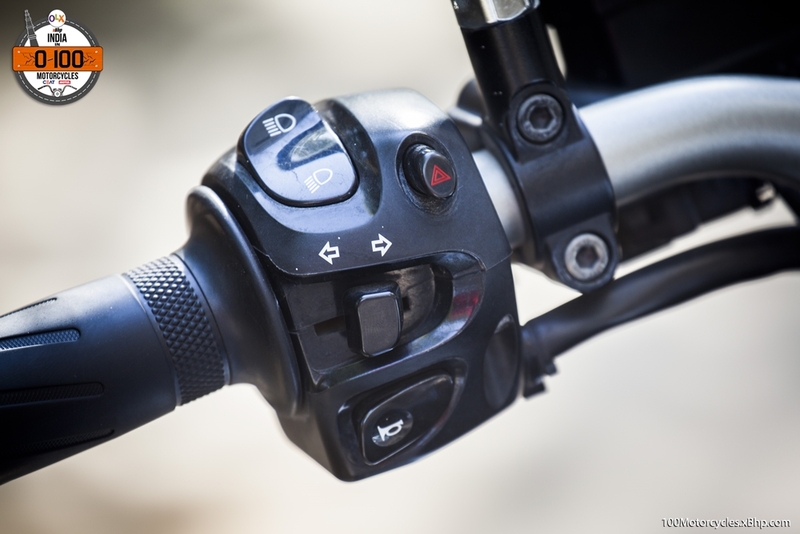 It had a single gear and that was automatic. 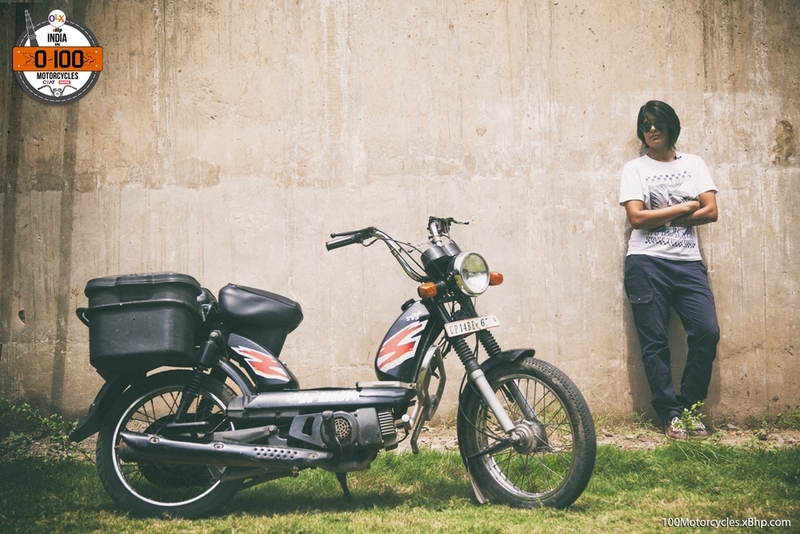 Of course, despite it being targeted at teenagers, anybody could ride it. 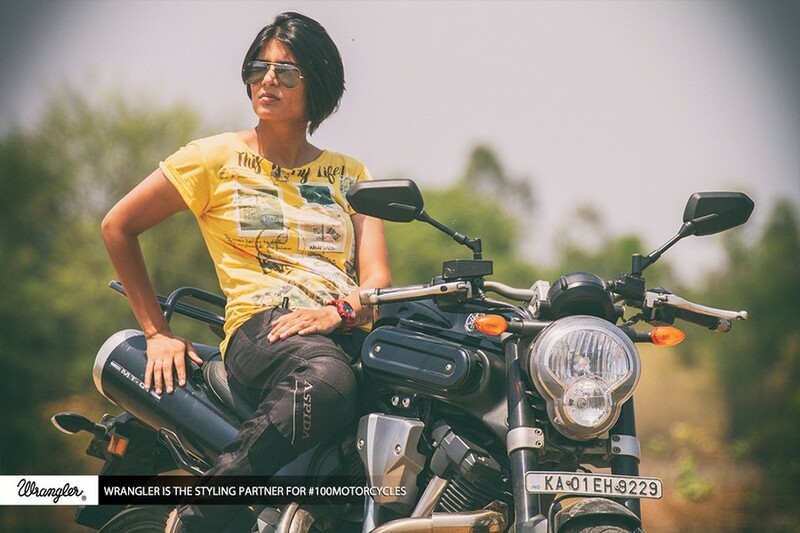 Many young guys and girls, in fact, used Sunny as a worthy two-wheeler to learn riding on. 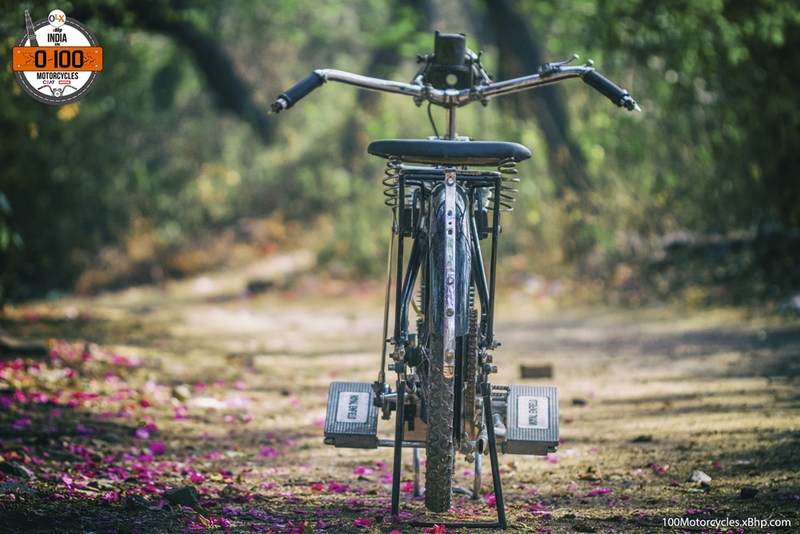 It was easy, unintimidating and was great to learn about balancing a motorized two-wheeler. 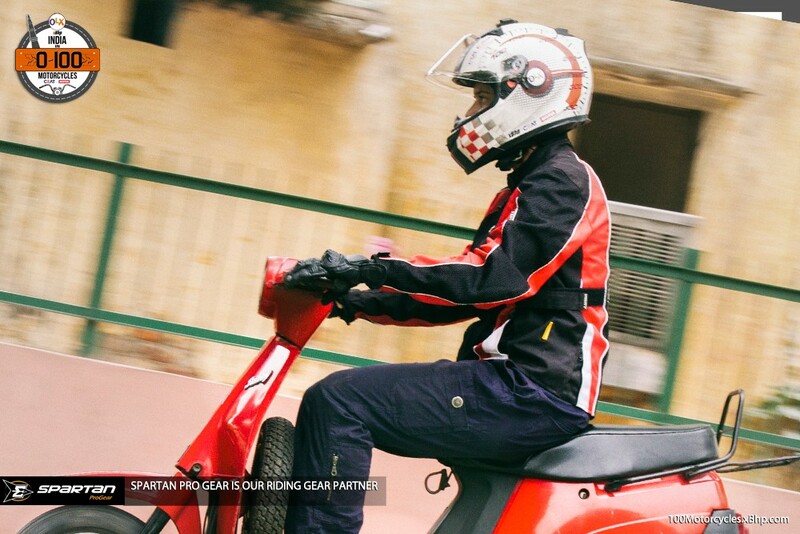 Even with that small engine, it could carry a load of up to 120 kg while the weight of the scooter itself was just 63 kg (dry). 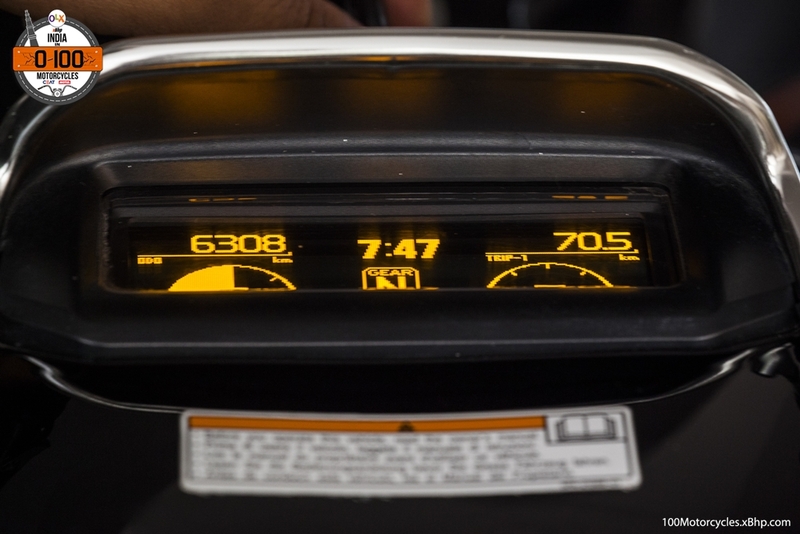 It had a top speed of around 50 km/h and returned fuel economy of similar numbers. 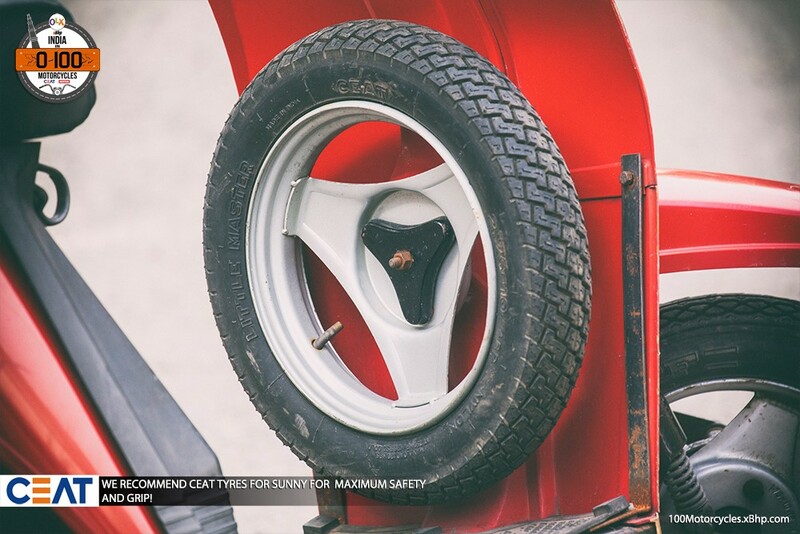 Tyres at both ends were 10-inch and equipped with drum brakes, and there was a spare wheel which was mounted on the inside of the front body panel. Really, there’s nothing more to it. 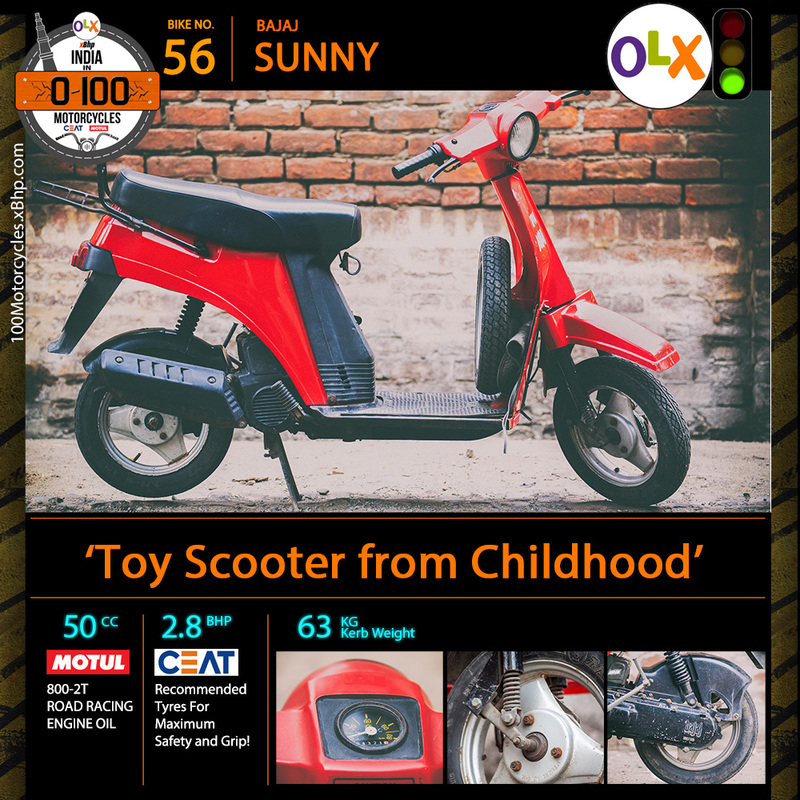 If you love Bajaj Sunny and want to buy one to rediscover your childhood, you can buy a Bajaj Sunny from OLX. 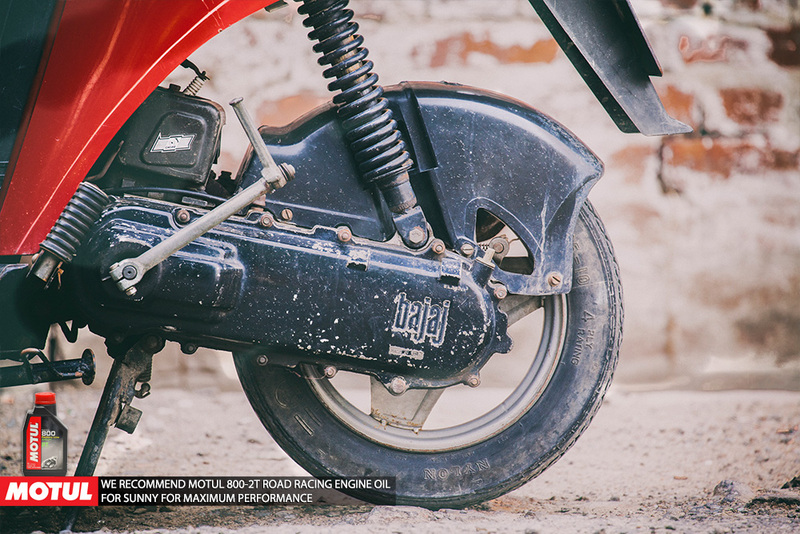 Click here to see all the Bajaj Sunny listed on OLX. 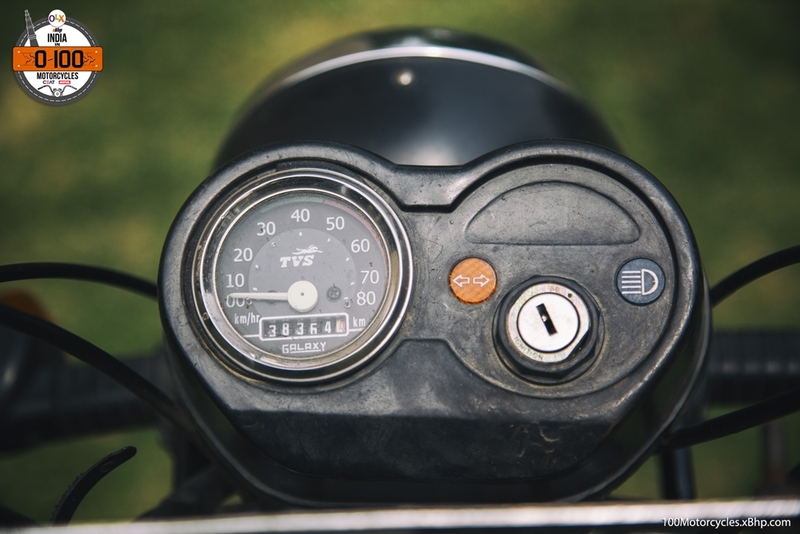 In 1997, Bajaj replaced Sunny with Sunny Zip which had a slightly more powerful 60cc engine. 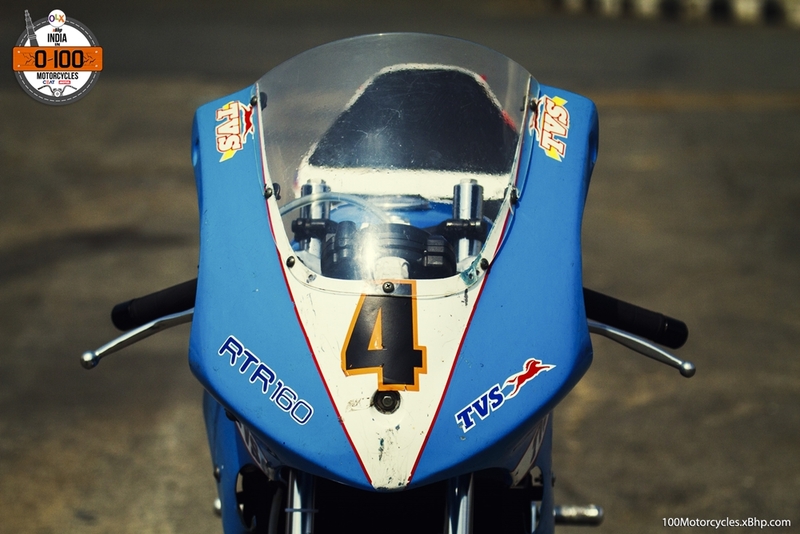 It was also a 2-stroke motor and produced around 3.5 BHP. On a personal note, I remember one of my friends having it when we were in school. We did ride it a lot, especially in the neighbourhood. 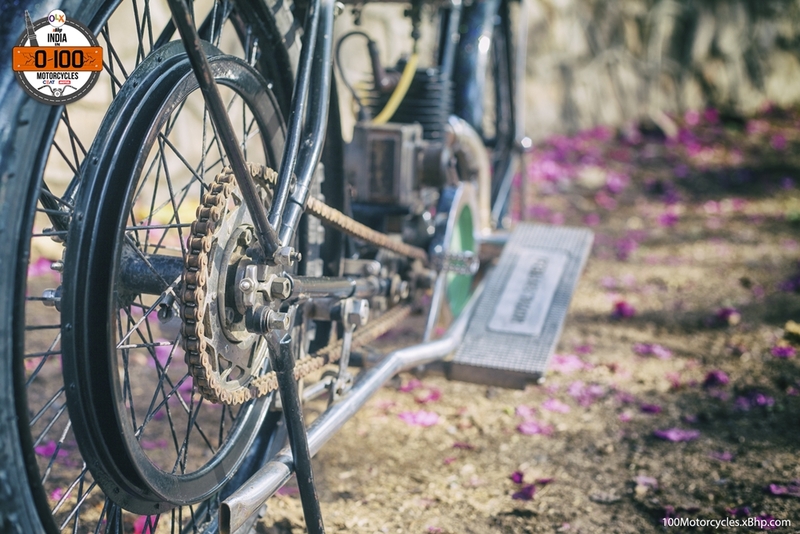 It was too much fun and felt like an appropriate upgrade from our bicycles. Have you ever heard anybody say this kind of a thing before? 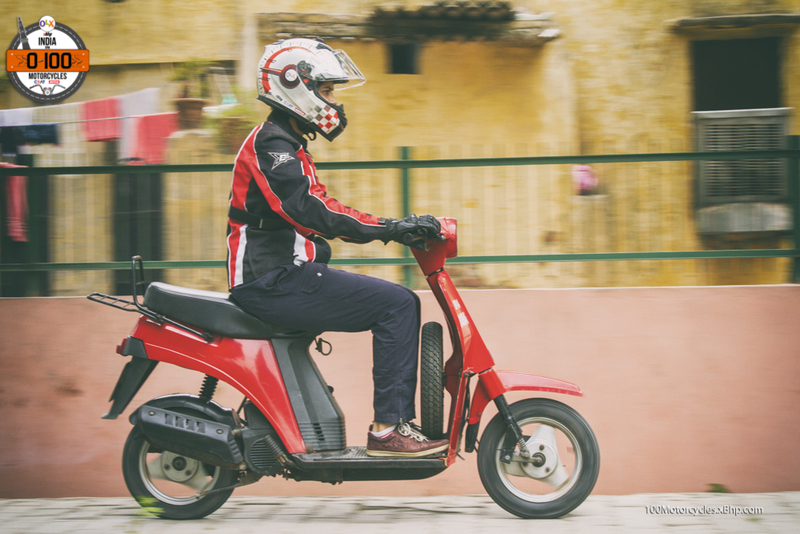 A scooter as an upgrade from a bicycle? I guess, that sums up the Sunny pretty well. 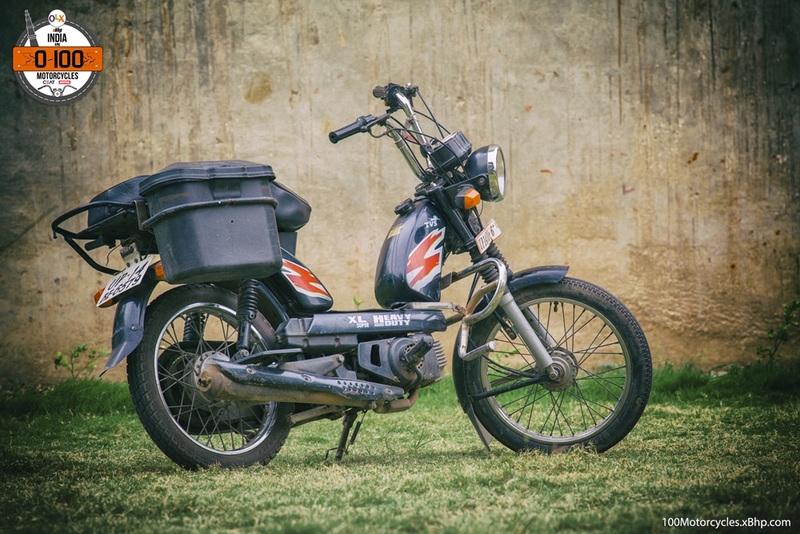 And we are quite positive it can still be found and bought through OLX, so give it a try if you still fancy one. 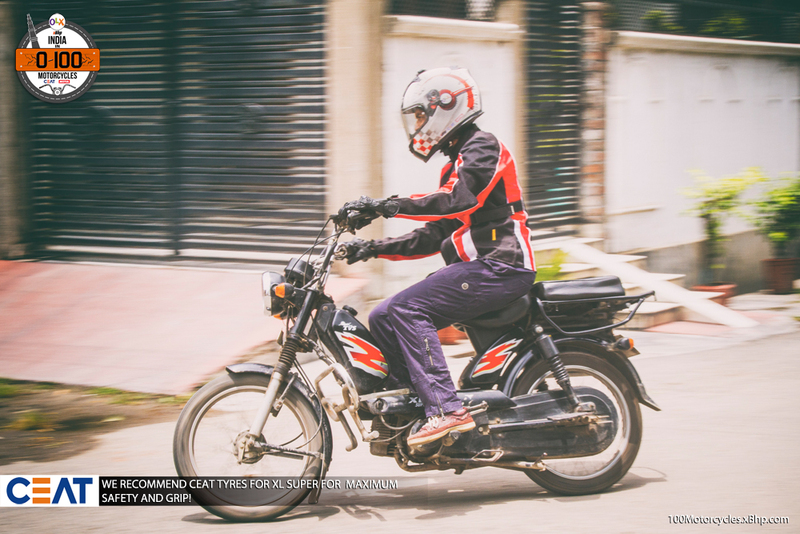 We would also like to thank Mr. Harshit from Mahesh Motors for sparing his time and letting us experience our childhood once again with the Bajaj Sunny. 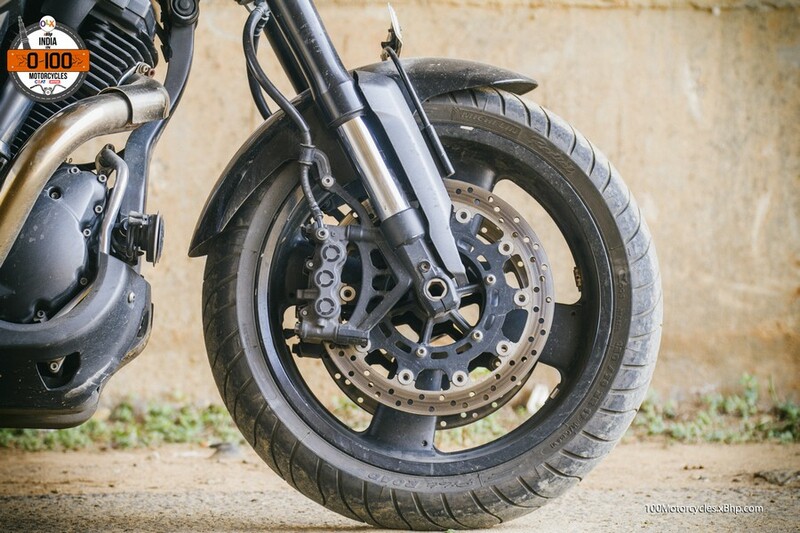 Recommended Tyres For Maximum Safety and Grip! 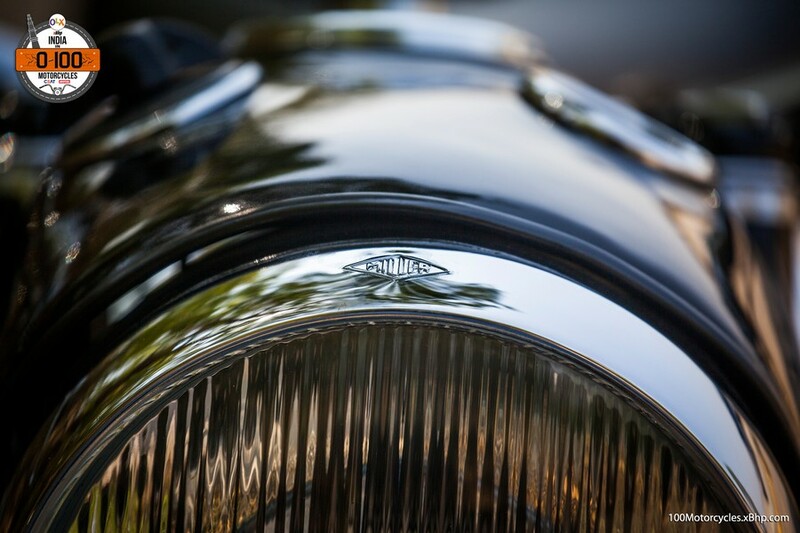 History of automobile building is full of interesting stories and such stories come to life whenever a creation makes a memorable impact on the people and in the industry. We have a similar story to tell this time around which was penned down and put out of a factory in 1955. 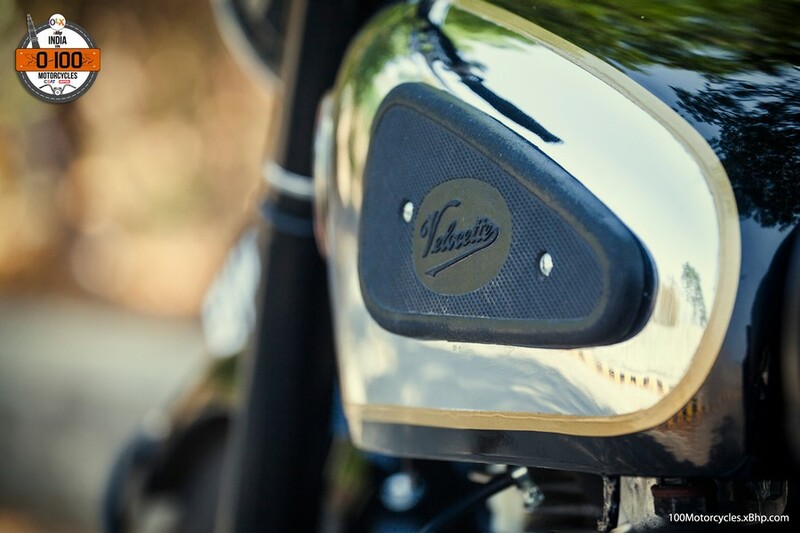 It is about a Venom, a 500cc standard motorcycle built by a British bike maker Velocette. 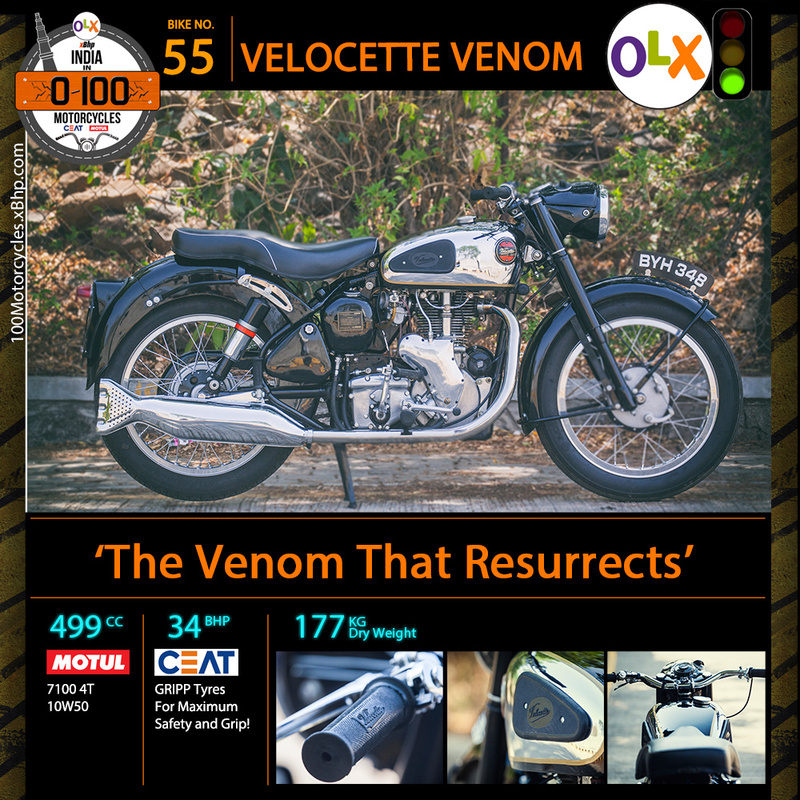 Called Velocette Venom, this motorcycle was in production from 1955 till 1970. 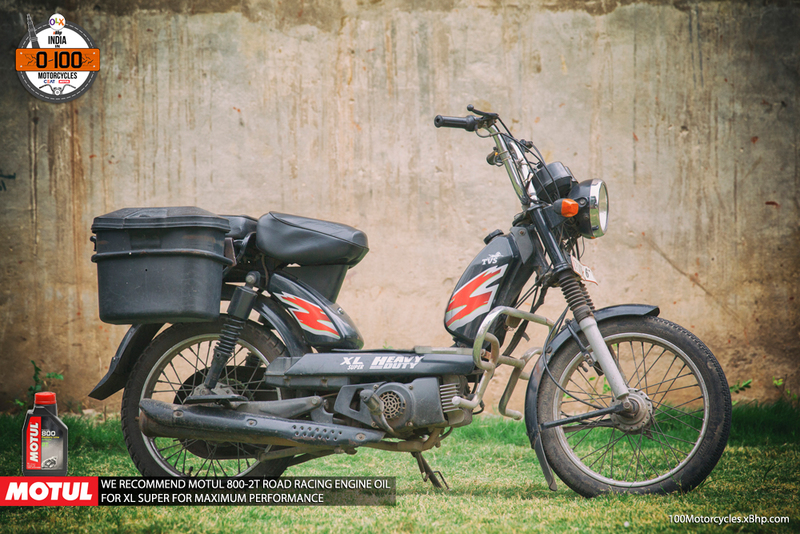 It came with a single cylinder 499cc 4-stroke air-cooled engine capable of producing around 34 BHP at 6,200 RPM. 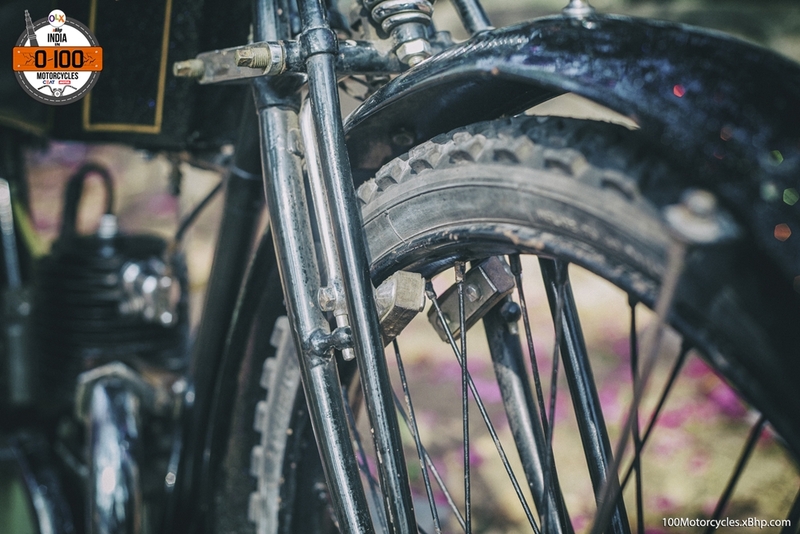 It was a performance motorcycle at that time and was developed to compete with other British twin-cylinder standard motorcycles. 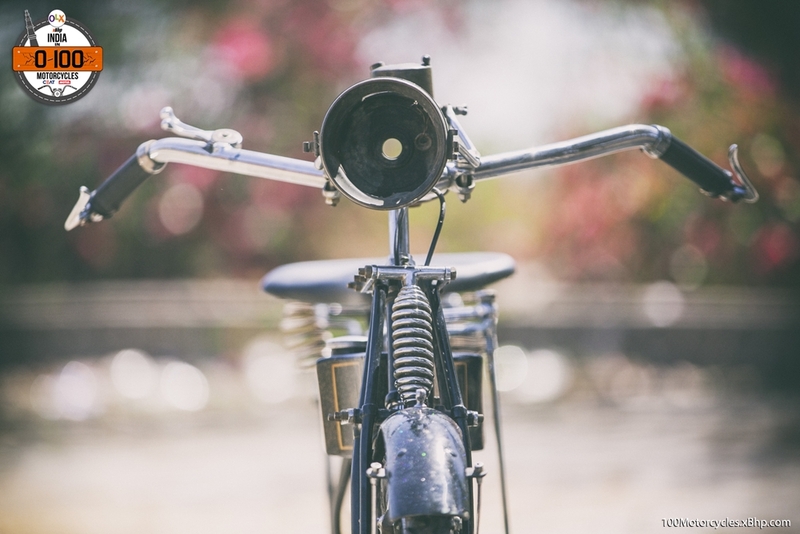 The fact that it was a performance motorcycle for its time is because its engine is constructed using two types of metal – Cast Iron and Aluminium alloy. 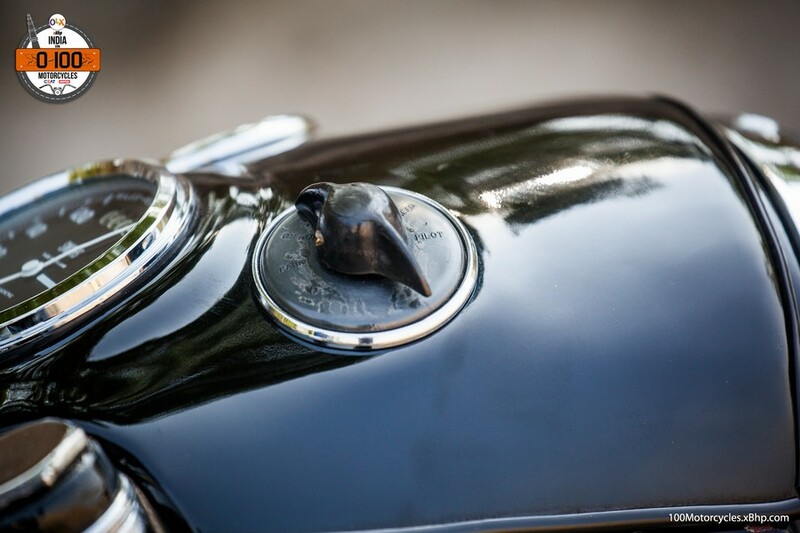 However, the Cast Iron is employed only as a liner while the whole cylinder head is made of aluminium. 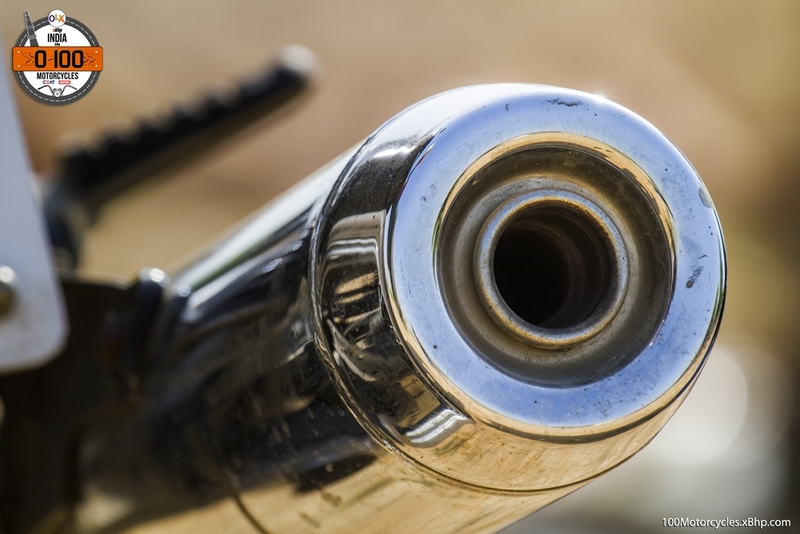 Also, the piston is high compression for better high performance. 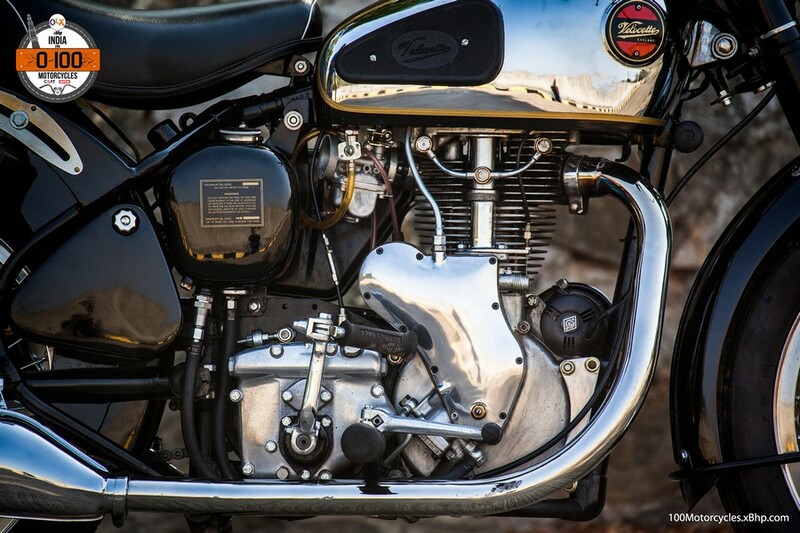 And this motorcycle did prove its performance worth by achieving a very special feat in 1961. 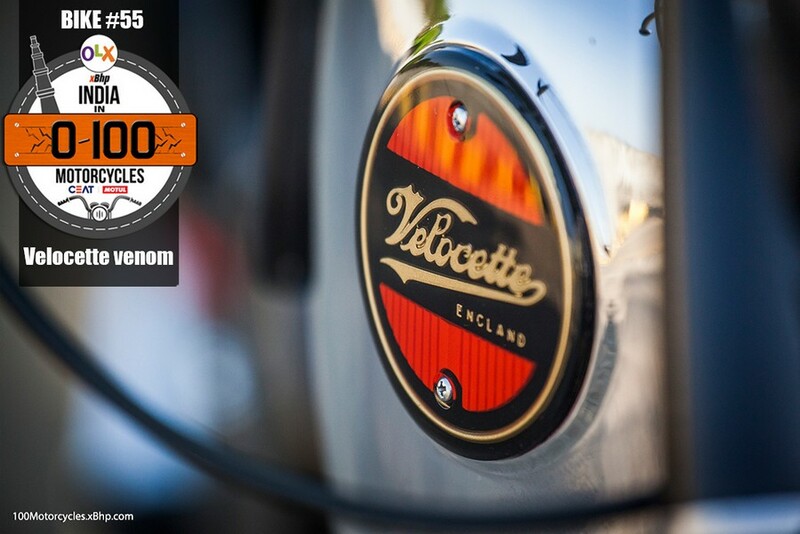 Velocette prepared a full faired version of Venom purposefully and ran the motorcycle for 24 hours nonstop at its top speed of 100.05 miles per hour (161.01 km/h). 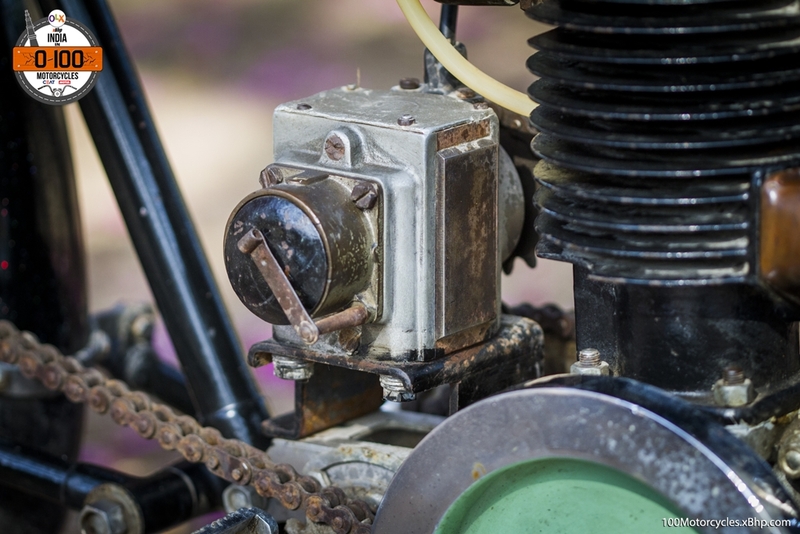 This is nothing short of an unbelievable proof of a motorcycle’s reliability from 1961! And this record is said to be unmatched till 2008 at least (we aren’t sure if it stands even today). Nevertheless, it is absolutely impressive. Where did we find it? 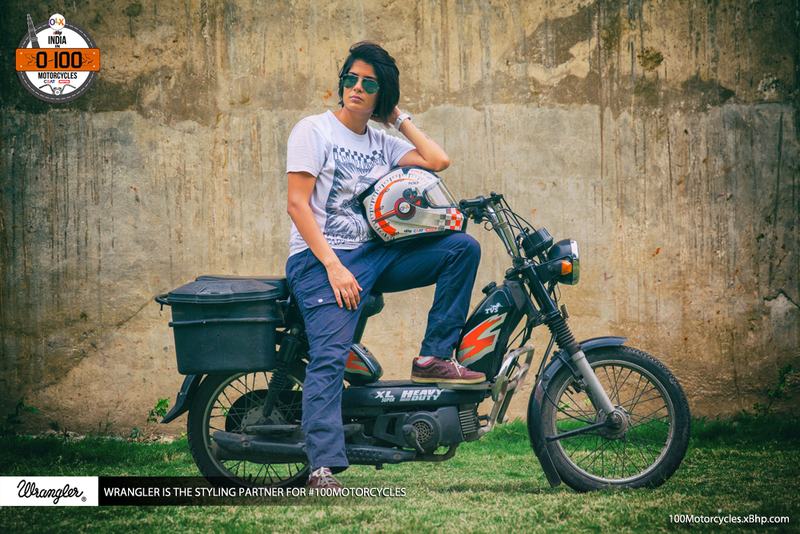 We have been going around the country to find motorcycles and scooters that are absolutely interesting irrespective of when they are made. 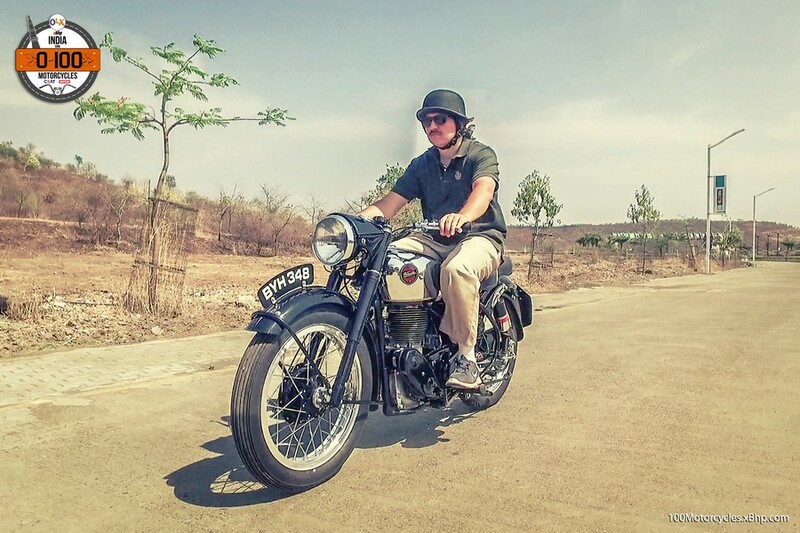 We met Mr. Rahul Manthalkar in Pune who owns this beautiful piece of machinery from 1955. 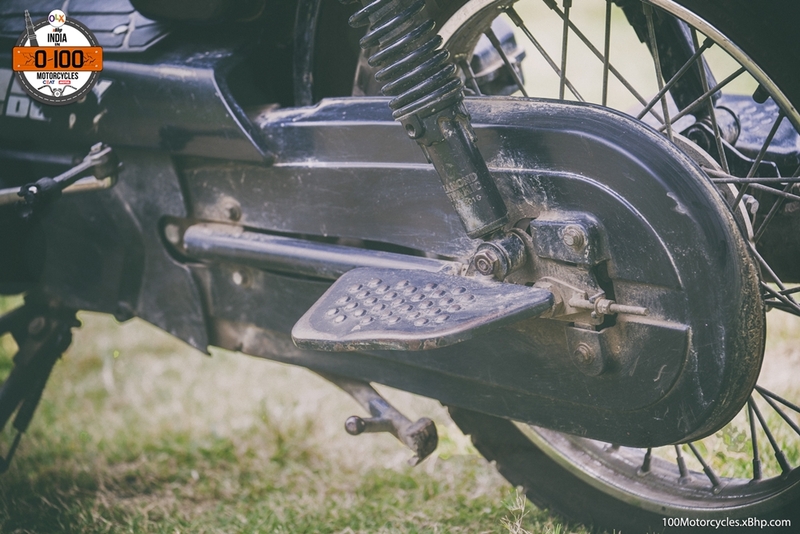 Maintained quite flawlessly, his Velocette Venom is a rare motorcycle and possibly one of the few that would be in such an impressive running condition. 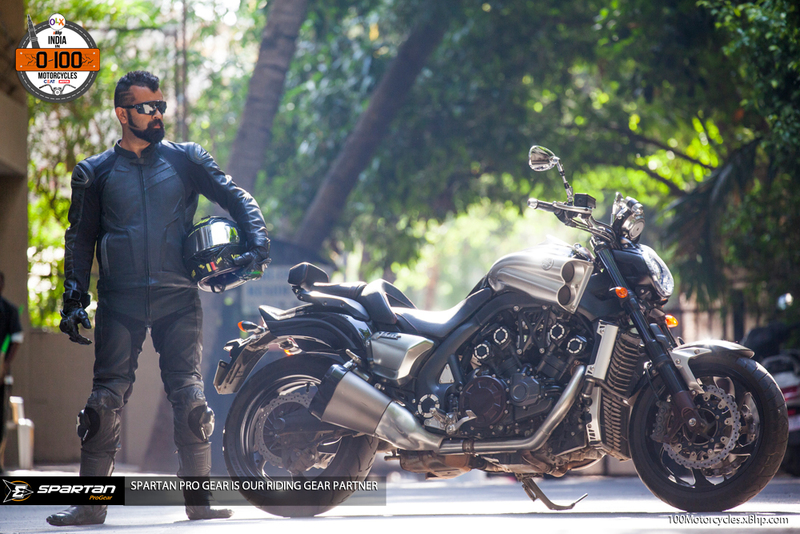 We thank Mr. Rahul Manthalkar from Pune for letting us shoot and ride this beautiful machine! 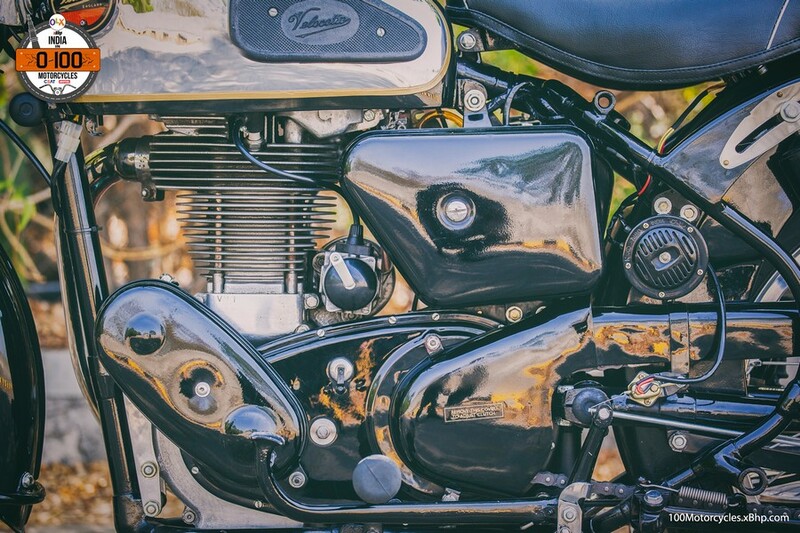 Velocette Venom came with a healthy dose of chrome – on the fuel tank and the whole exhaust system – and rest of the body work in shining black. 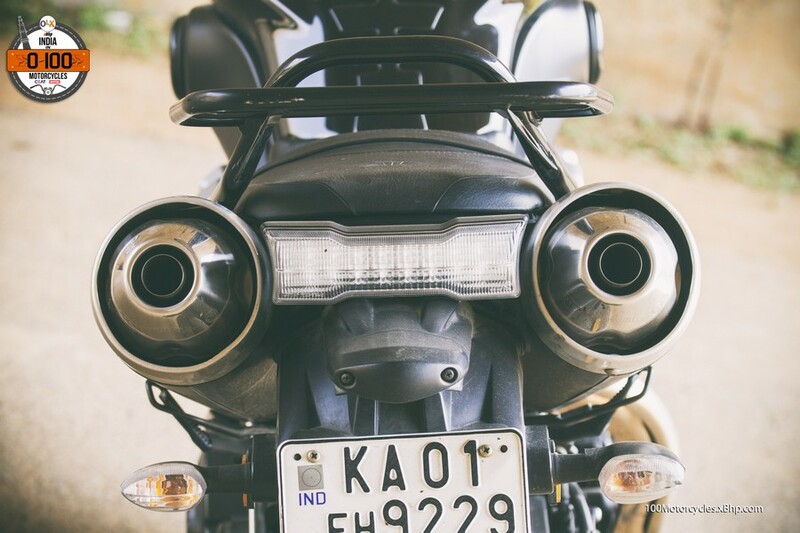 However, Mr Rahul tells us that his favourite piece on the motorcycle is the exhaust which is known as the “fish tale” exhaust. This is because of its fin-like design towards the end. 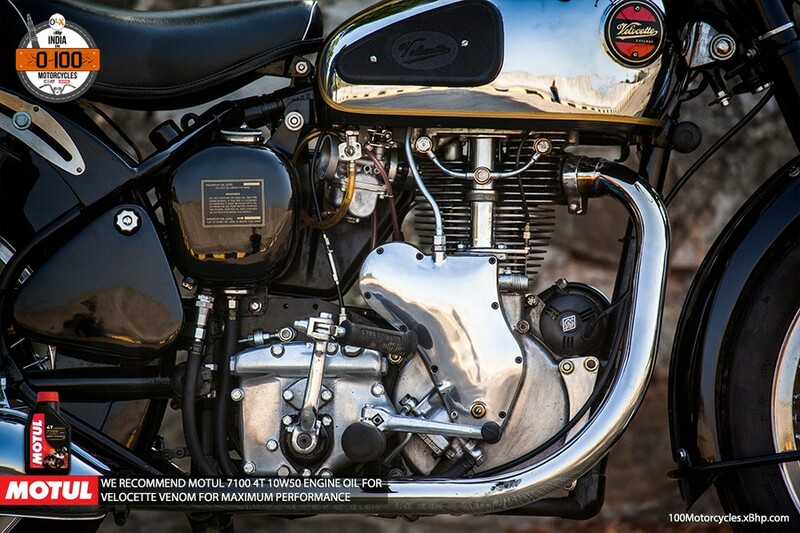 Looking at this motorcycle somehow makes us feel that this is how the Royal Enfield Bullet could have been built. 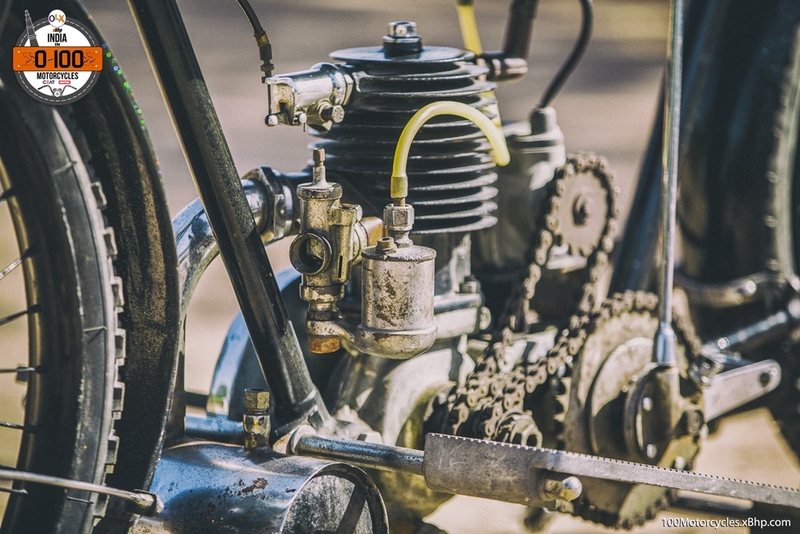 Velocette Venom is a solid proof that even an old motorcycle like this could be made powerful with just a single cylinder engine. 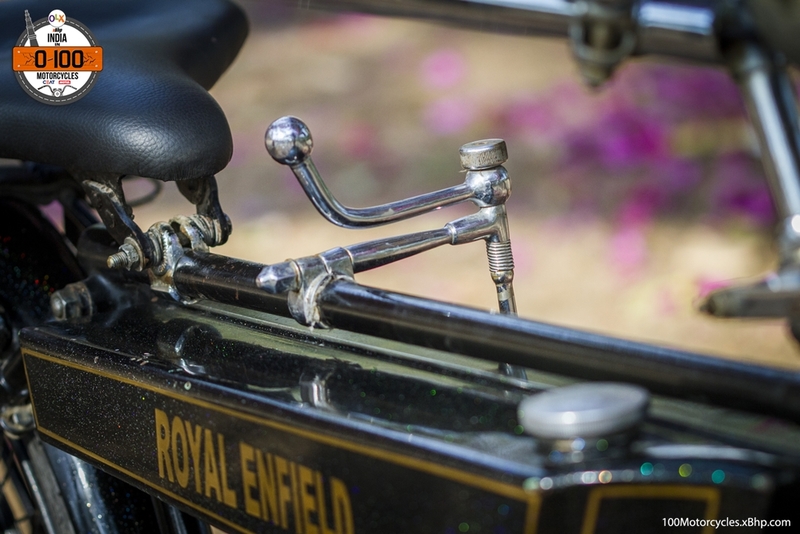 Anyways, that aside, it was nice to see a British motorcycle capable of such performance and reliability which is not Triumph! 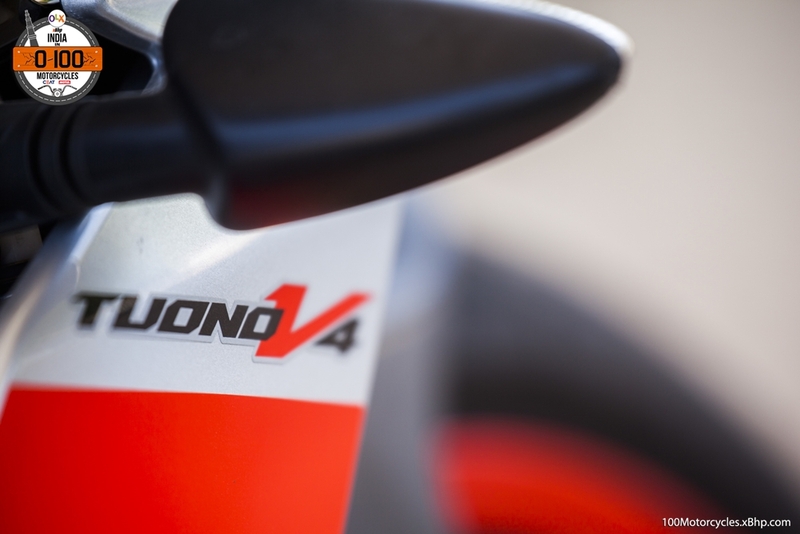 And especially that 24-hour record did make us curious enough to see if it can still pull that off. Obviously, we didn’t try it and we would say it doesn’t really matter today. 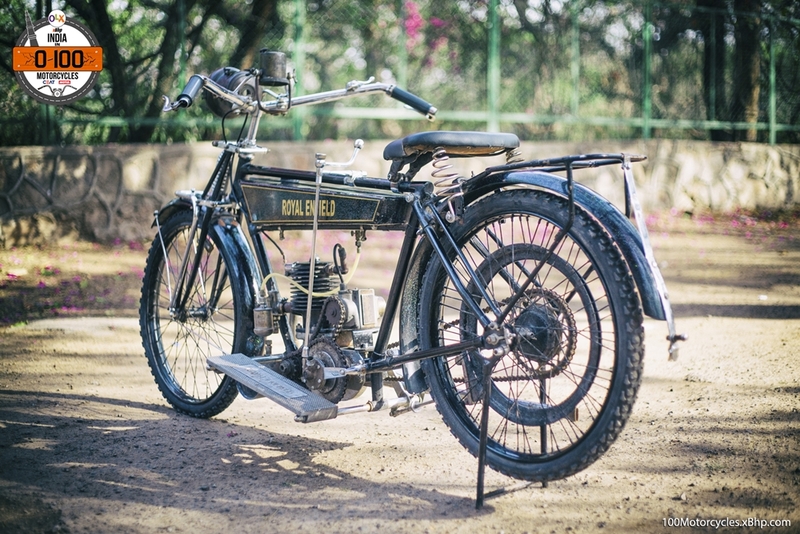 This motorcycle belonged in its time, proved its metal and still runs today thanks to people like Rahul Mathalkar. We thank him for his time. 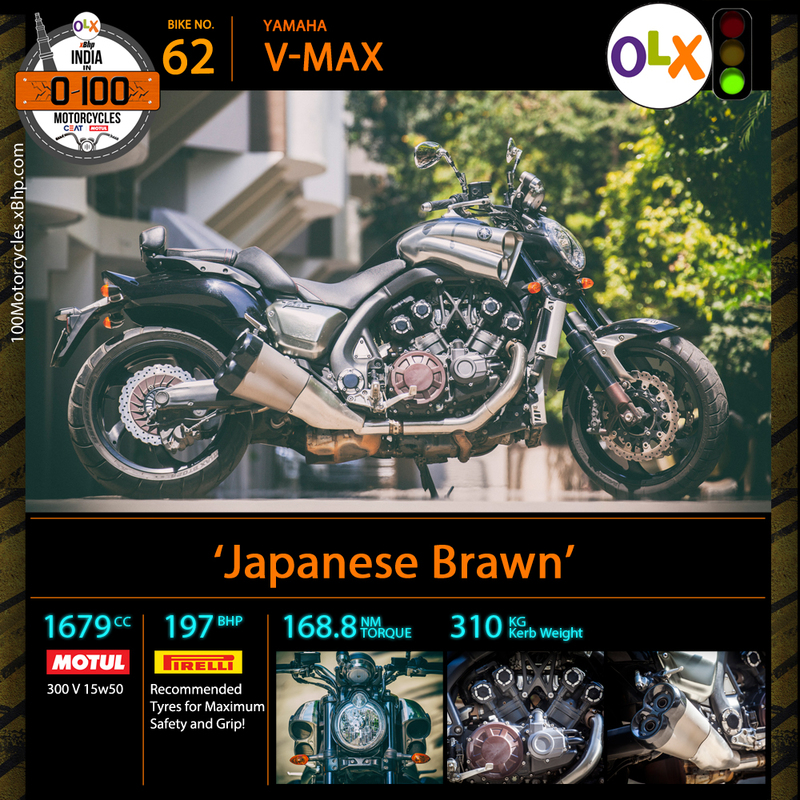 Did we mention yet that you can try your luck on OLX and see if you can find this bike? Well, you’d be truly lucky if you did. 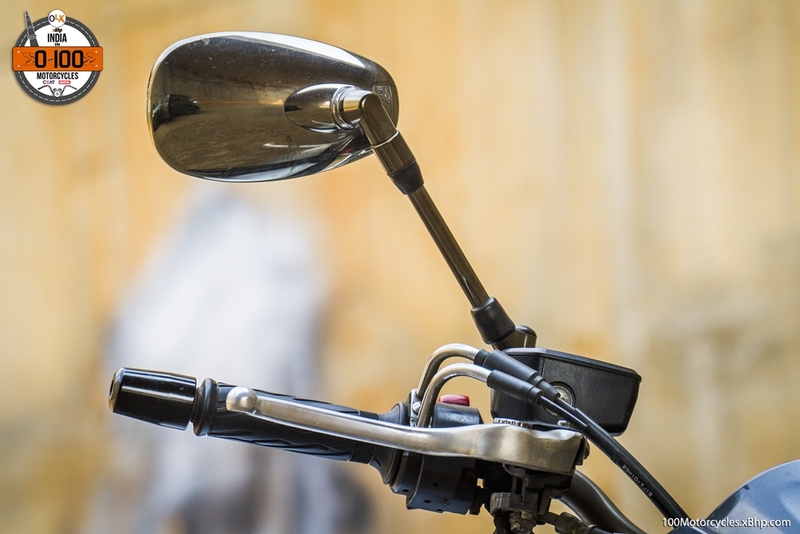 Buy a used TVS motorcycle from OLX. 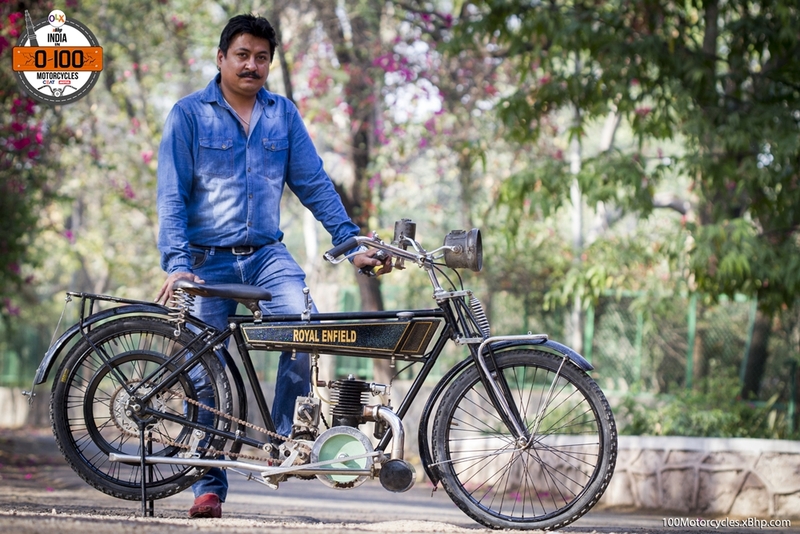 We have been covering 100 special motorcycles and scooters most of which have played an important role in shaping the trends in the Indian motorcycle industry. 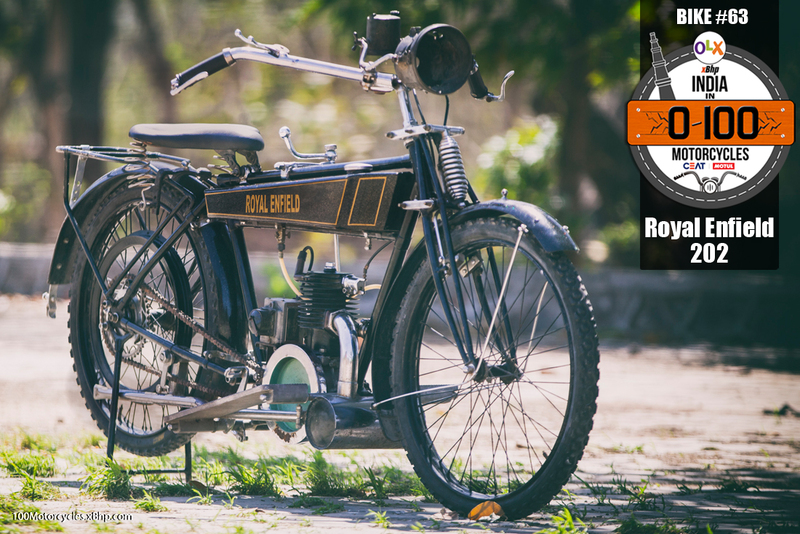 Suffice to say that we have come across another machine which is not really road legal, but it is vital for its company in order to improve their road-going motorcycle. 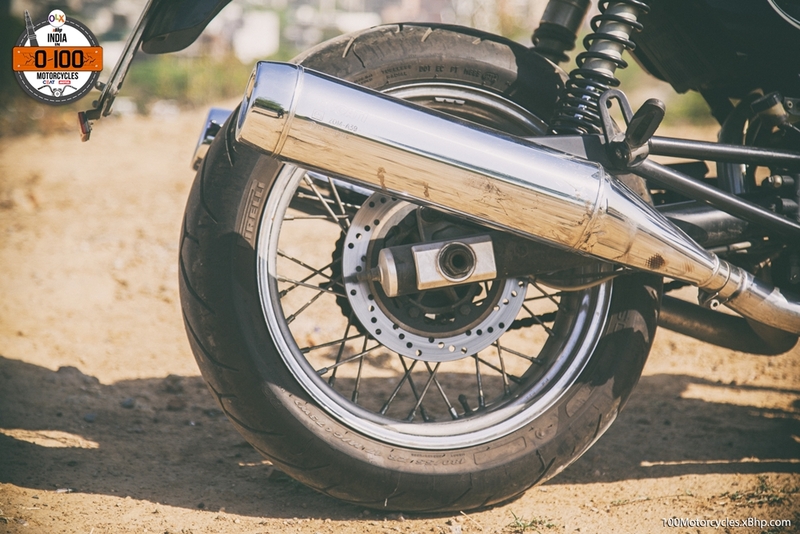 See all used TVS Motorcycles listed on OLX for sale and you might find an interesting deal that fits your budget. 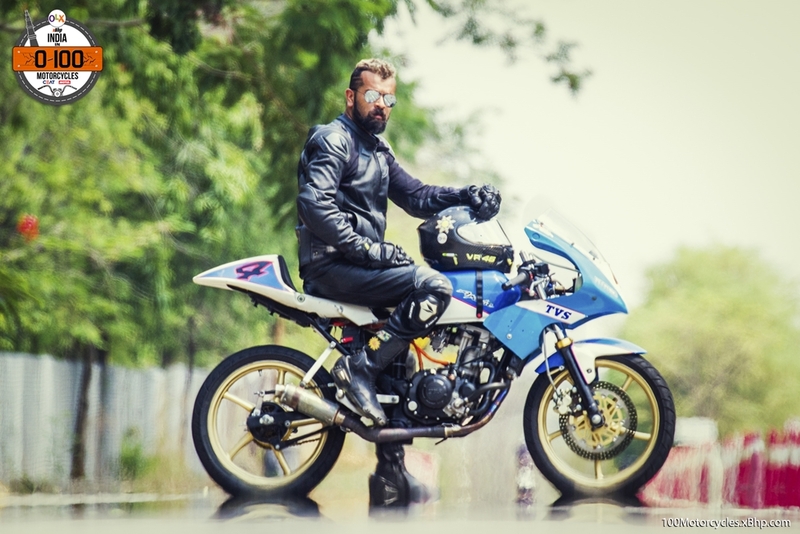 Meet TVS Motor and their road-racing RTR 160. 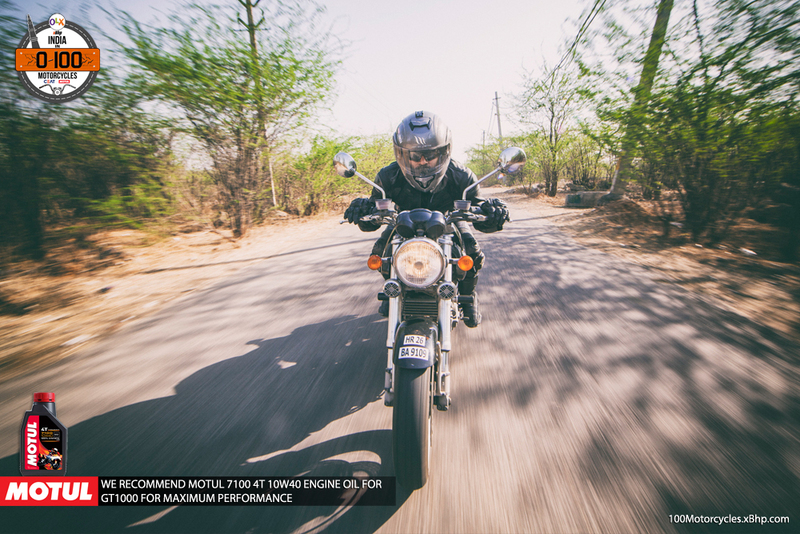 Complete with a performance oriented engine and the bodywork which serves only one purpose – aerodynamics – this particular 160 is TVS’s pocket rocket. 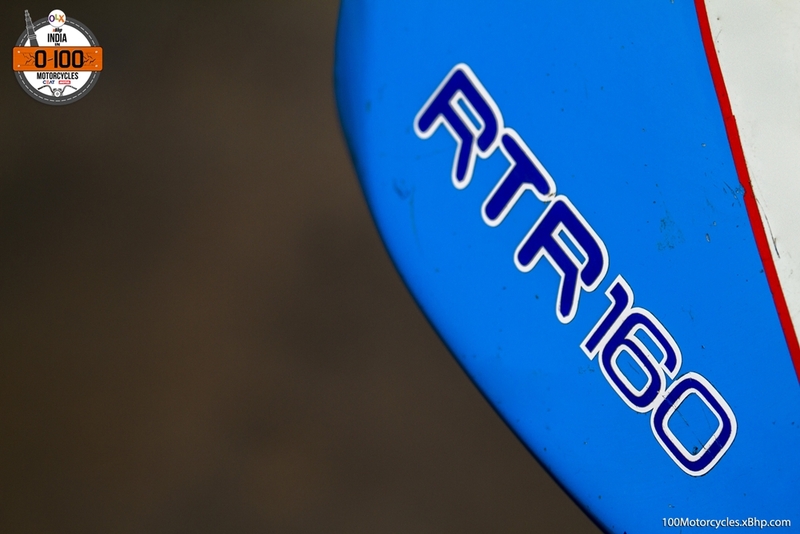 There are significant differences between the production RTR 160 and the racing version of it. 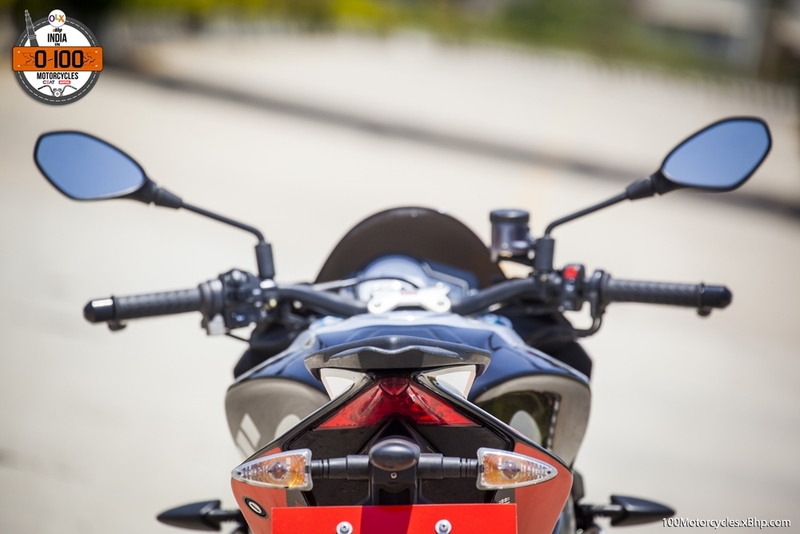 To start with, the engine is a 160cc single cylinder unit, but it is liquid-cooled, produces 32 BHP of power (that is correct) and revs up to 14,000/14,500 RPM in its top gear (5th). 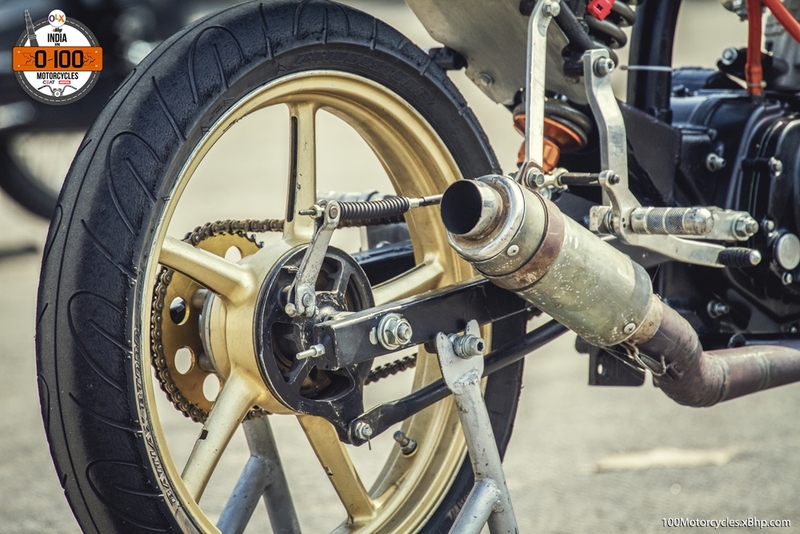 It weighs somewhere around 100 kg to meet the racing regulations of minimum weight (which is 100 kg), although, without fuel, it weighs just 98 kg. 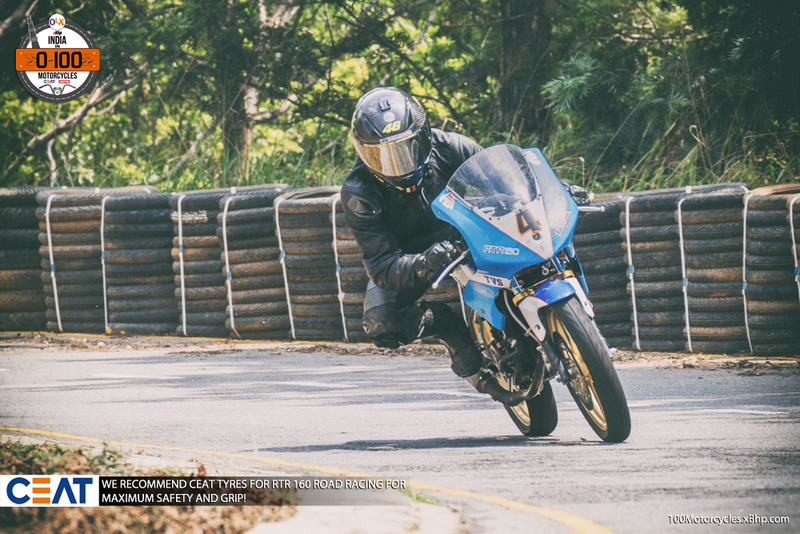 Combine that weight with the power figure it produces and you’ve got one hell of a 160cc motorcycle. 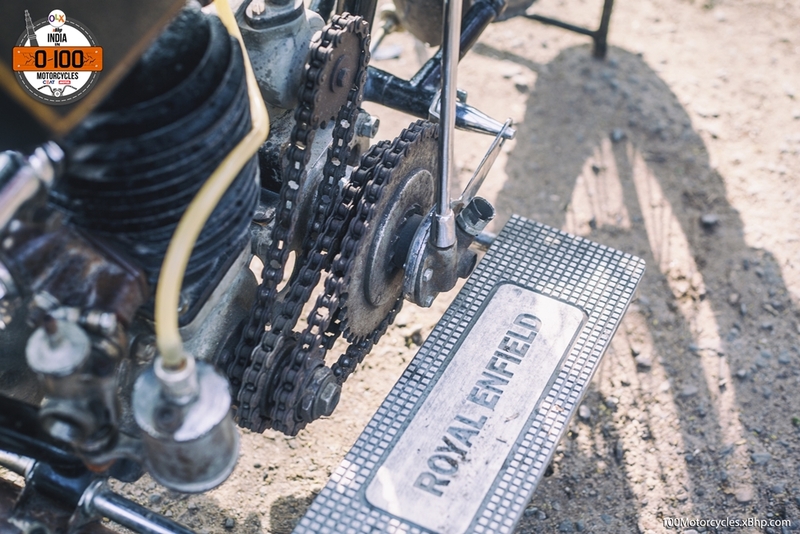 And did we mention yet that we rode it and how much fun it was to do so? Oh, it was one of our best experiences ever. 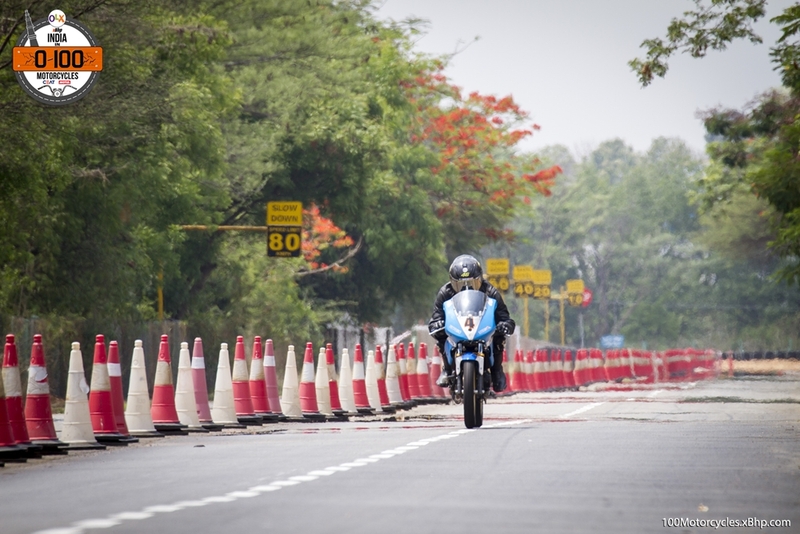 We got a rare chance to visit the TVS Motor factory in Chennai and ride their purpose-built racing 160cc sportbike. 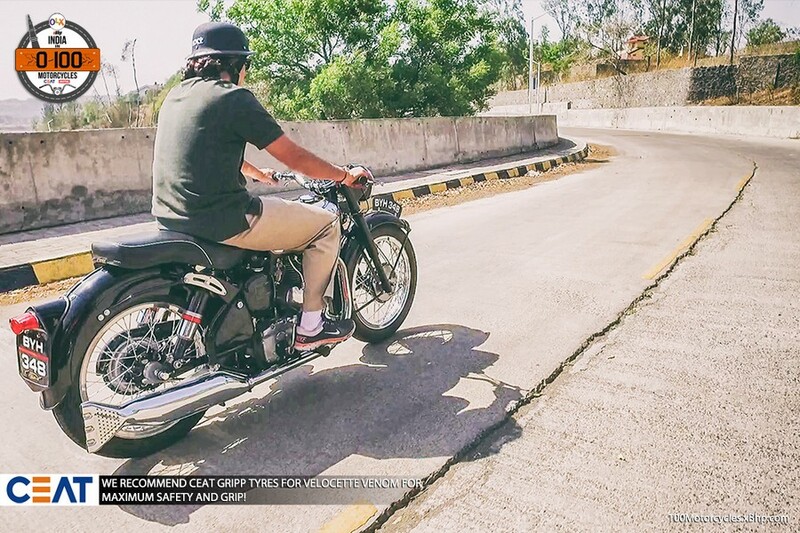 Honestly, we didn’t expect much from it, perhaps because of our lack of exposure on such motorcycles. 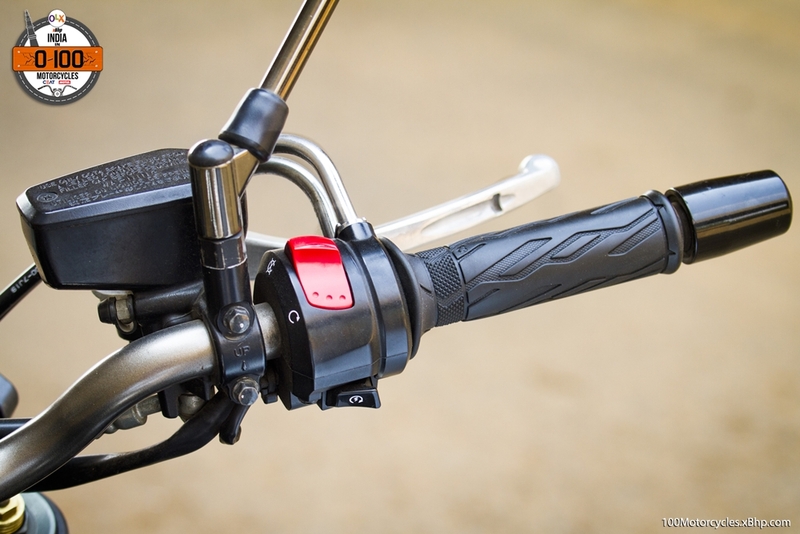 But boy, we were in for a pleasant surprise as soon as put it in first gear and rode out. 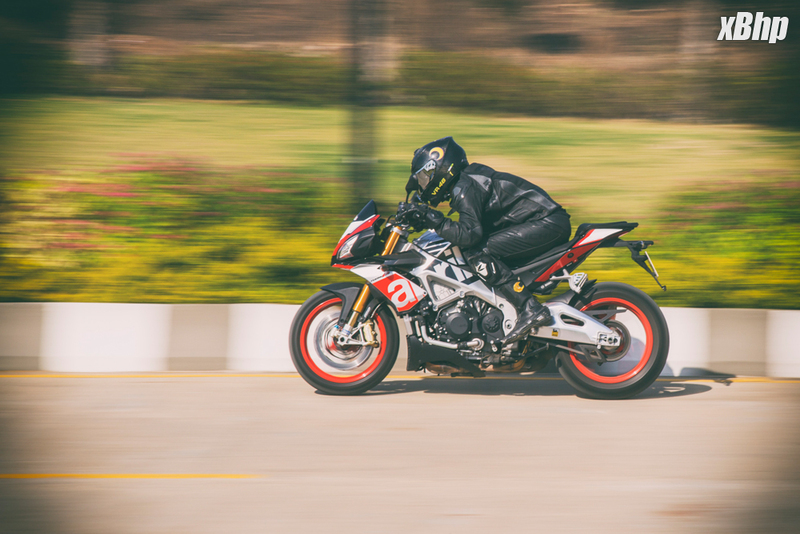 The first reaction – this thing is fast! 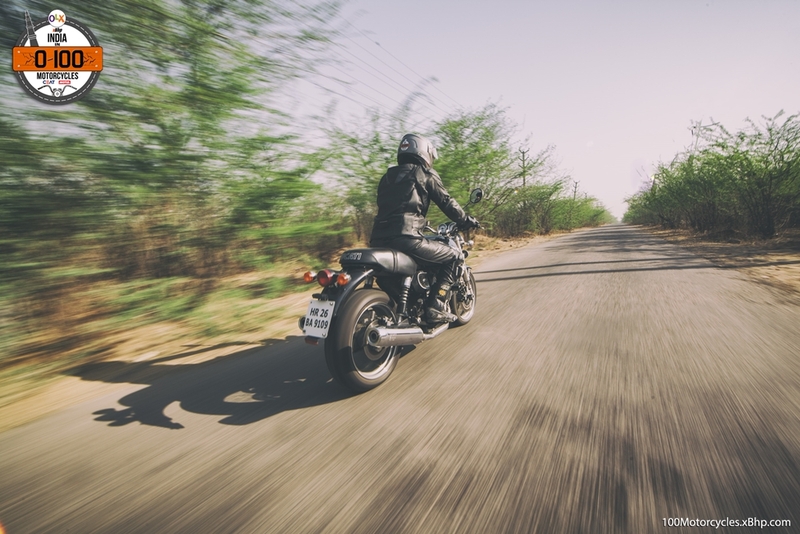 It revved freely like no other RTR we have ridden before. 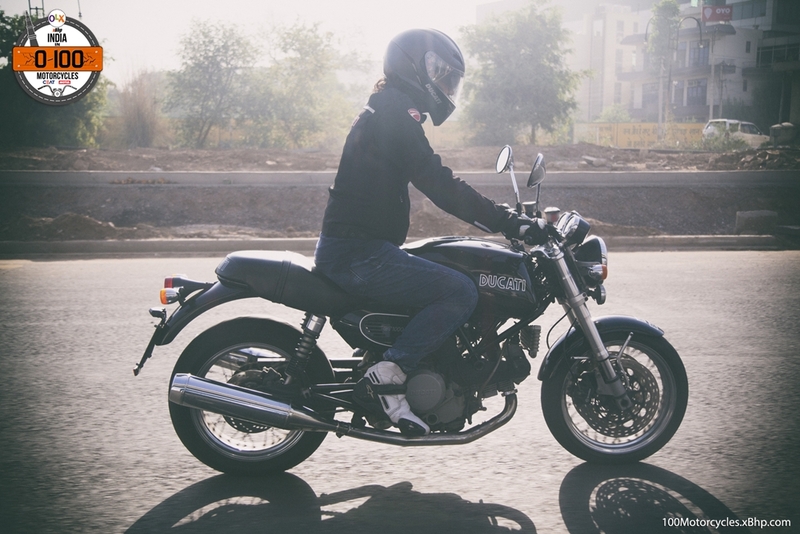 In fact, it didn’t nearly feel like any familiar motorcycle we have ridden. 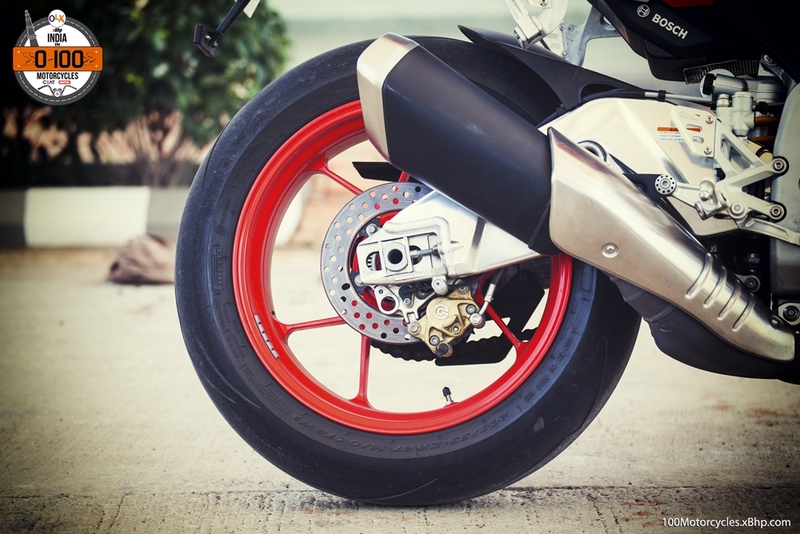 The ultra lightweight motorcycle rides on the sticky Bridgestone tyres and with the chassis and suspension tuned specifically for track riding, this little racing motorcycle is quite exceptionally in corners. 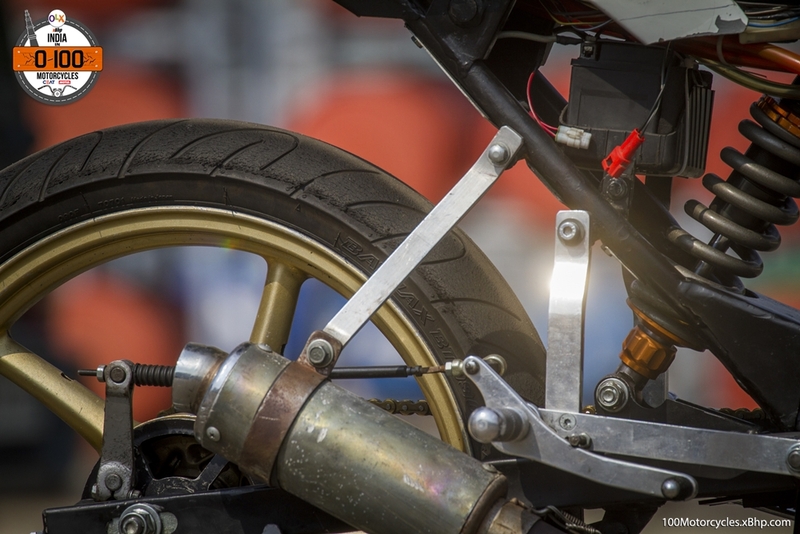 Of course, the straight line stability is impressive but it is the corners where a track bike has to shine and this one does. 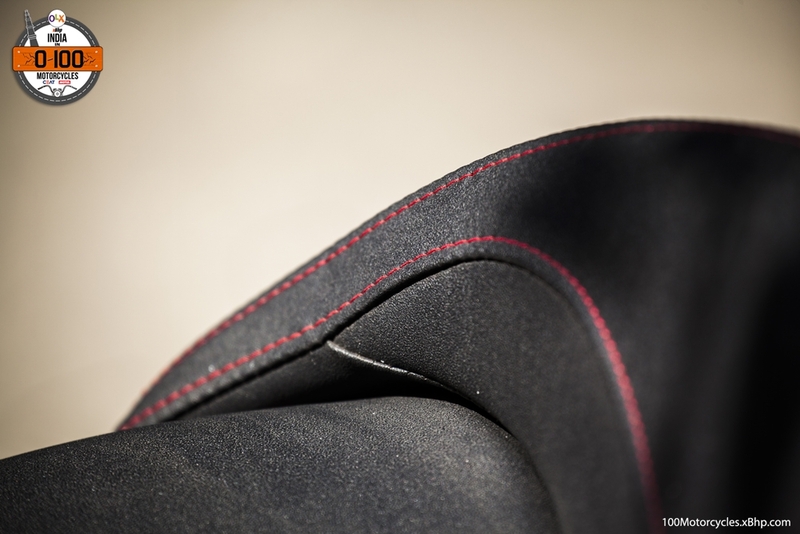 At the beginning, it does feel a bit unsettling because of its low weight, but as soon as you get familiar with it, everything starts to come together nicely. 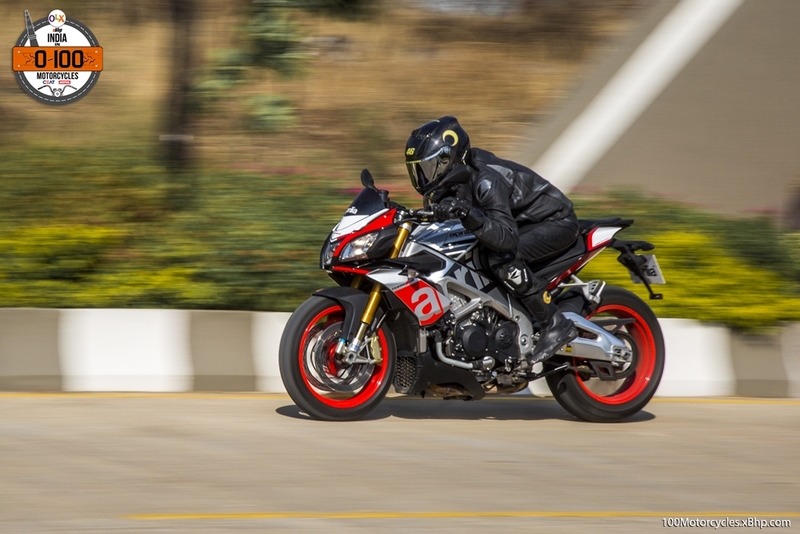 TVS says that the main competition in domestic racing comes from Honda CBR15R and Yamaha YZF-R15, but it is so heartening to learn that TVS has been winning them all for the last 4 years. 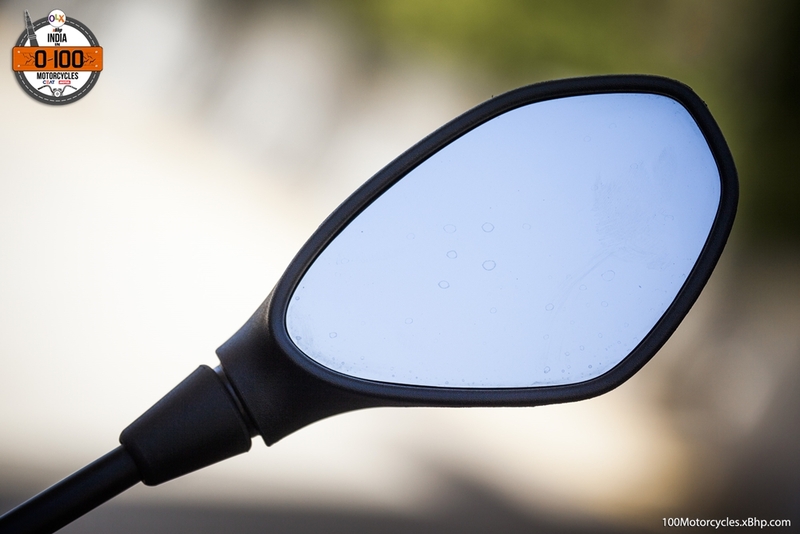 And even if it’s so obvious we would still like to mention that you won’t this or anything like it on OLX. 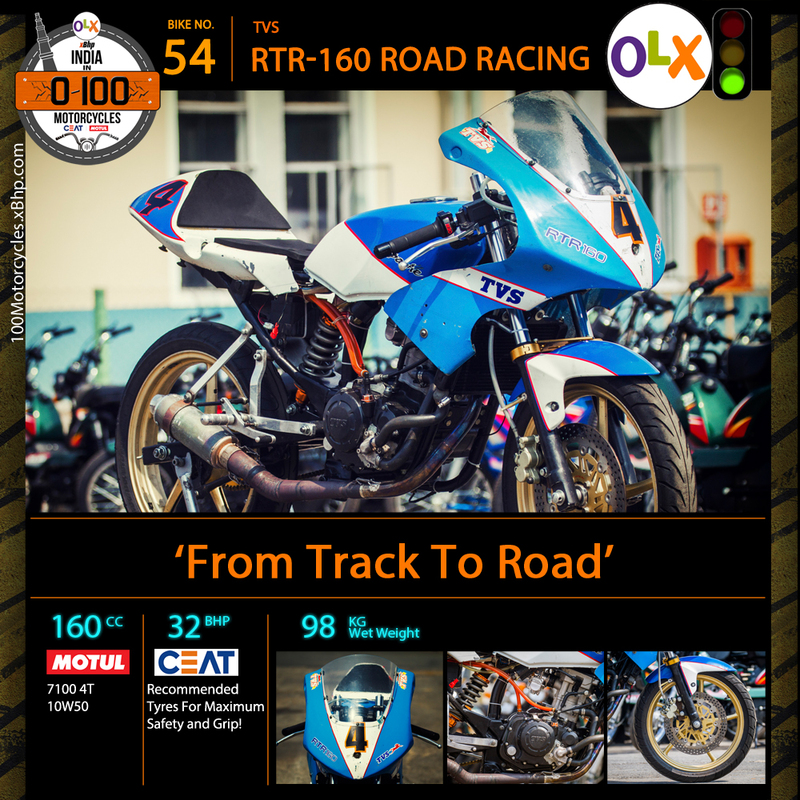 However, the closest you can get to it is by getting a production RTR 160, and that you can definitely find on OLX. 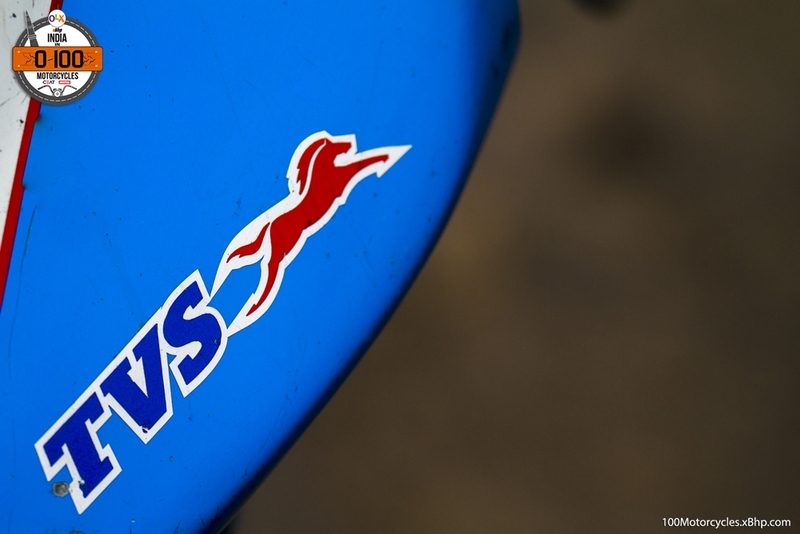 We wish TVS all the success in their racing department, they need it and deserve it. 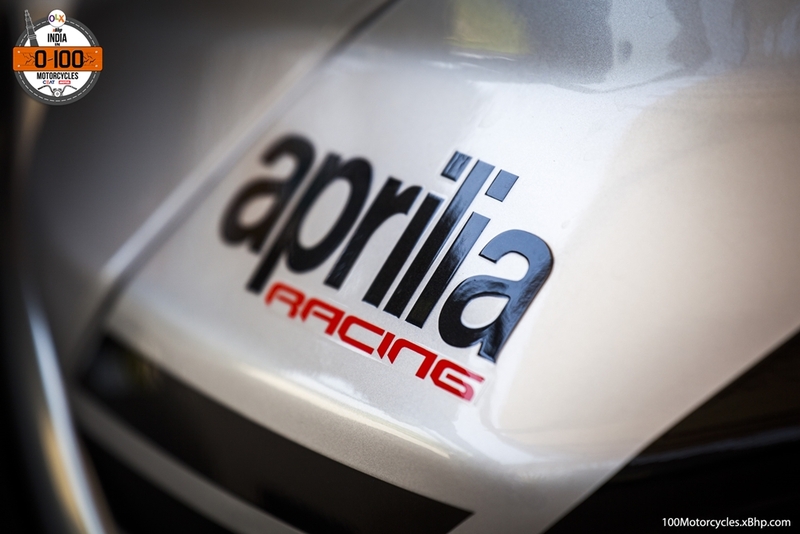 It is one of the only two companies which is into professional racing, the other is Mahindra. 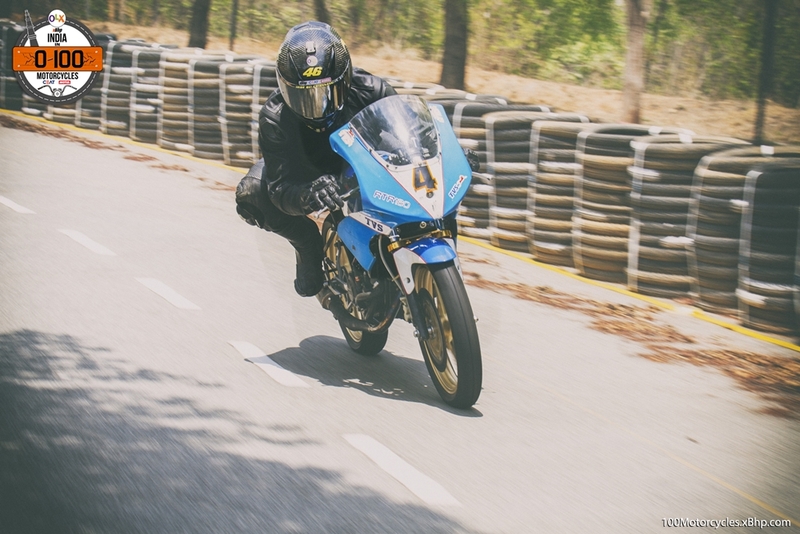 While TVS has released their most powerful RTR till date with a 200cc engine, we hope that they’ll also come out with a madder motorcycle something closer to their racing machine.